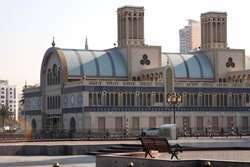 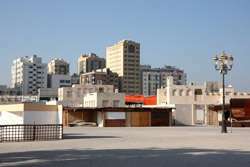 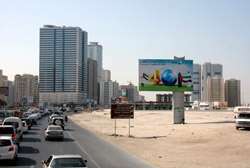 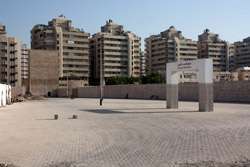 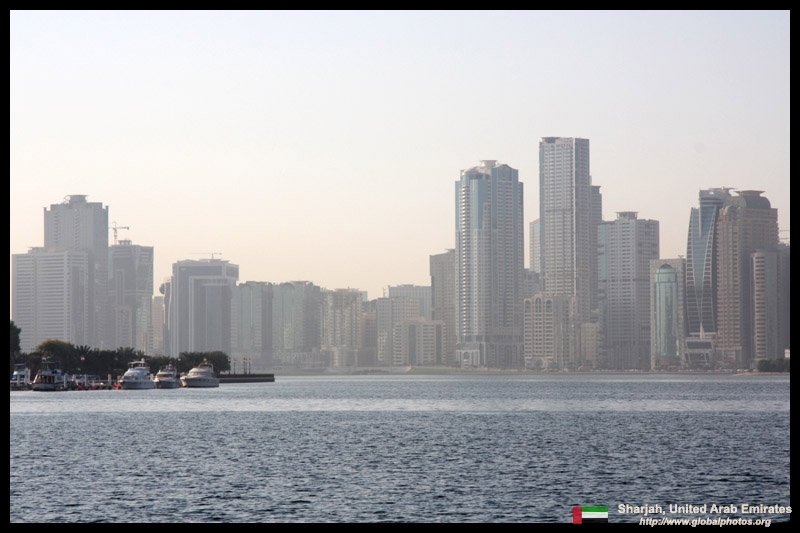 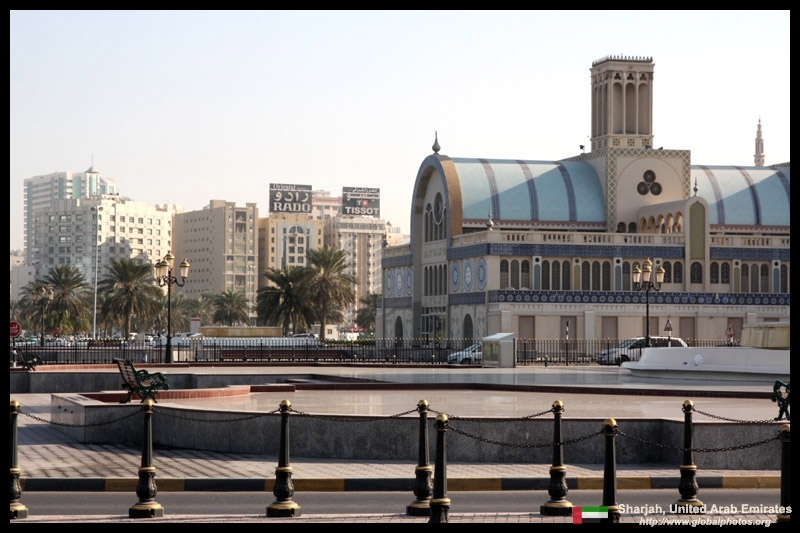 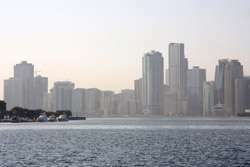 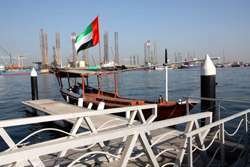 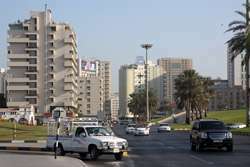 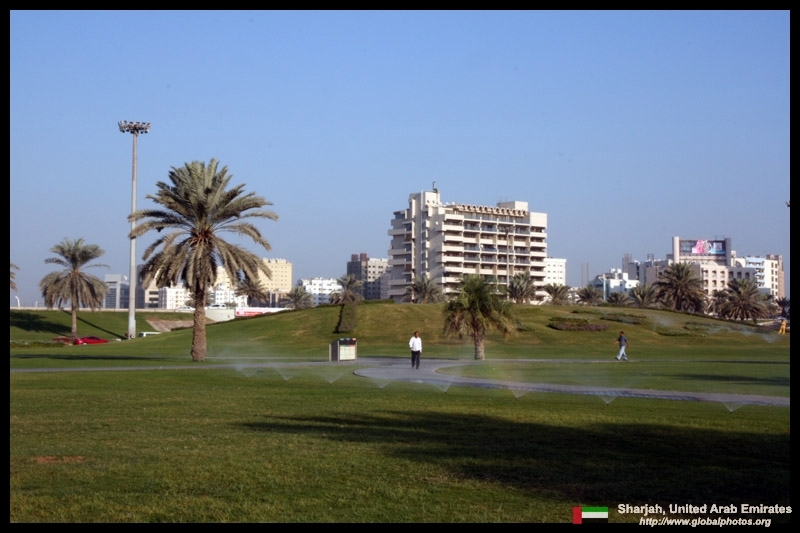 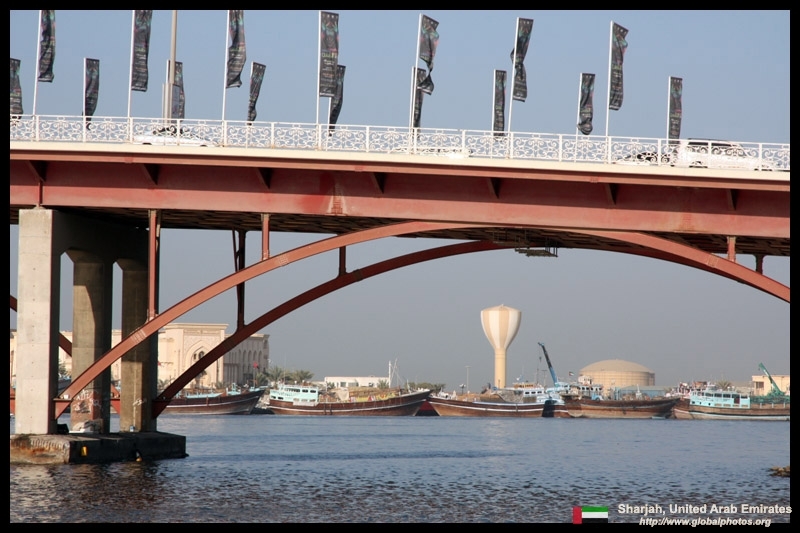 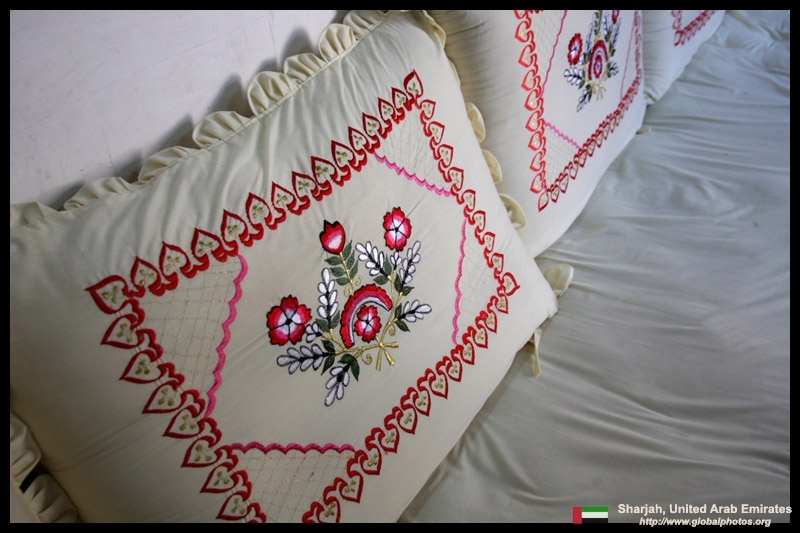 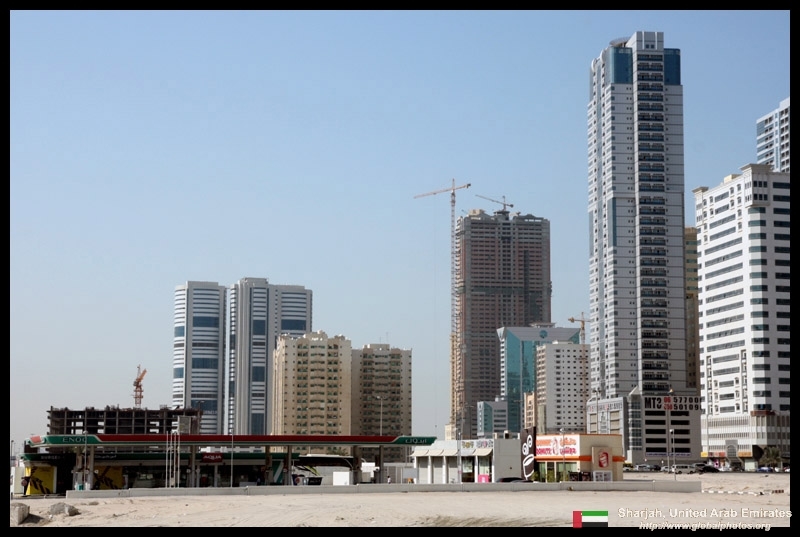 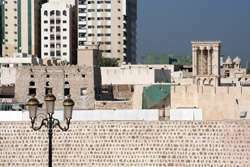 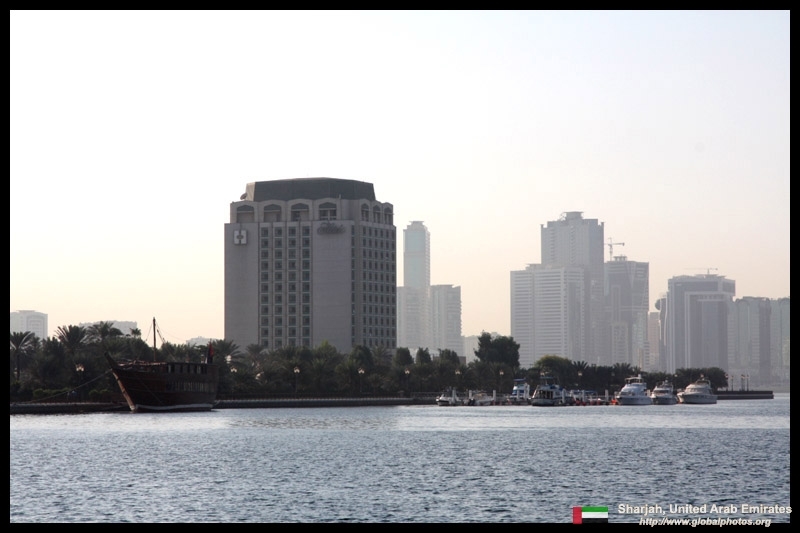 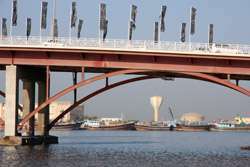 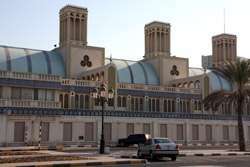 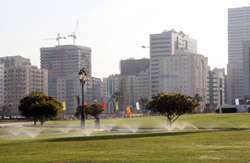 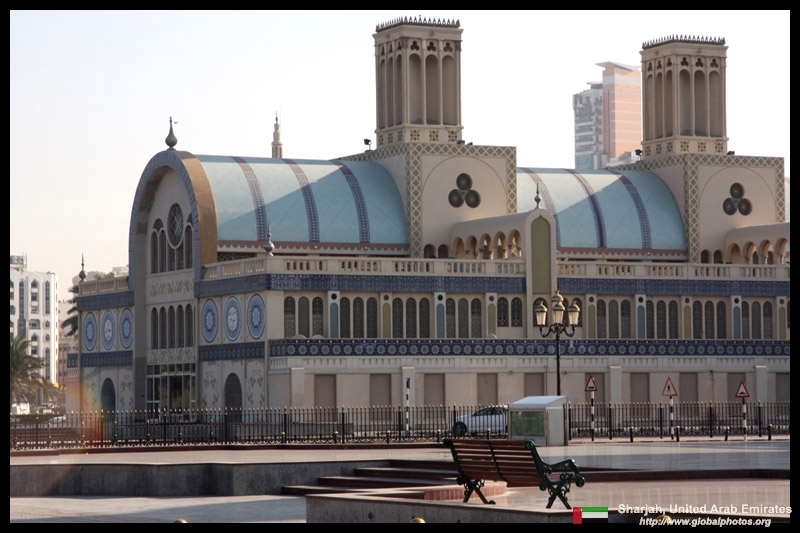 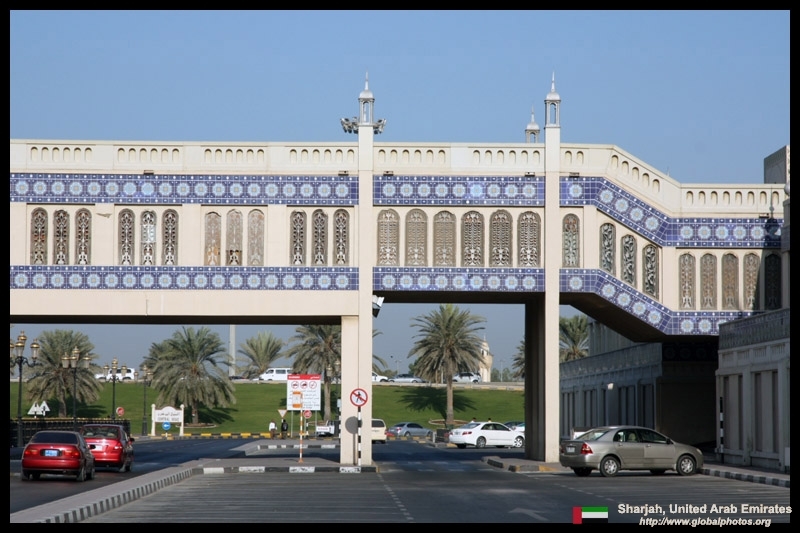 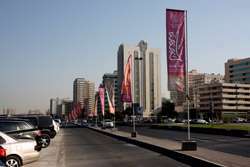 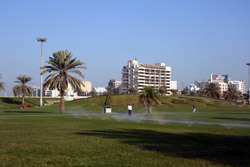 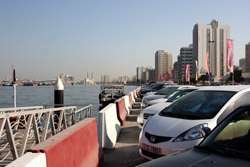 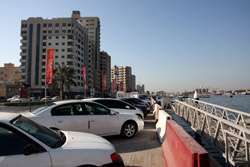 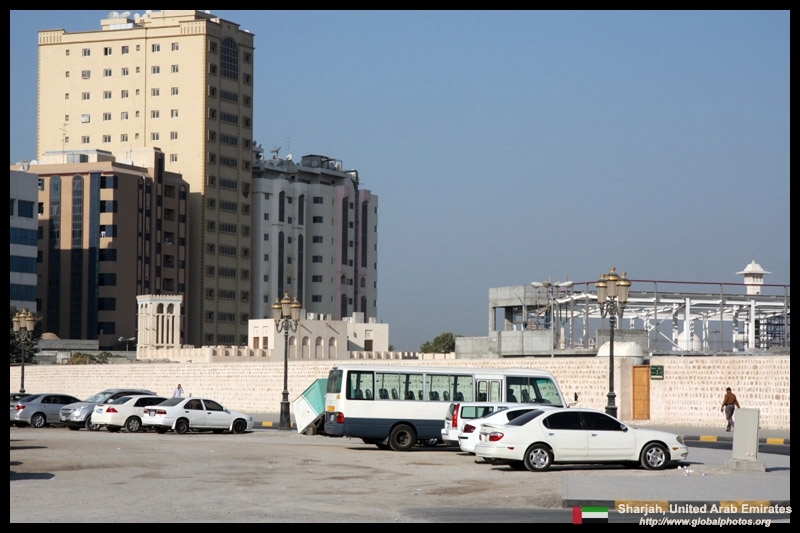 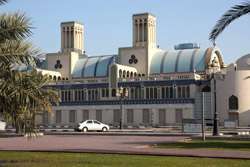 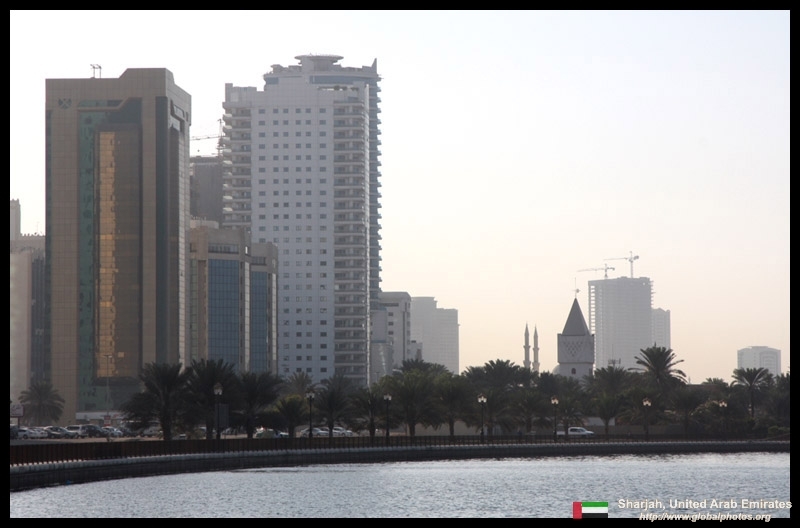 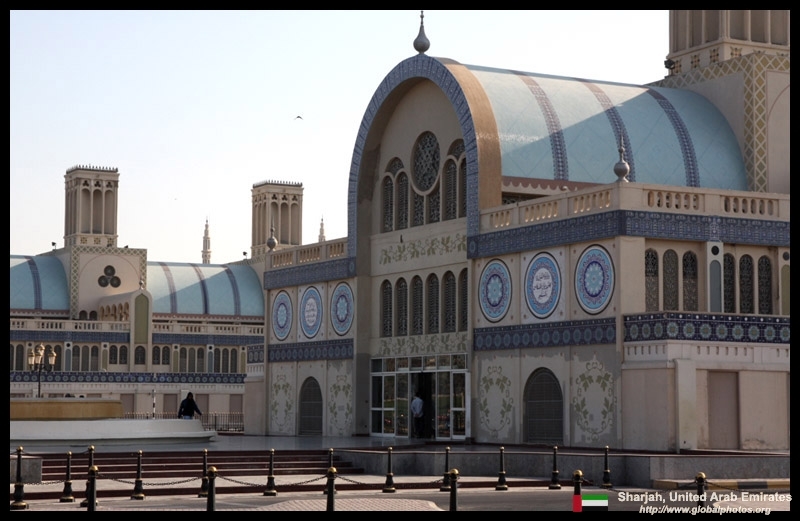 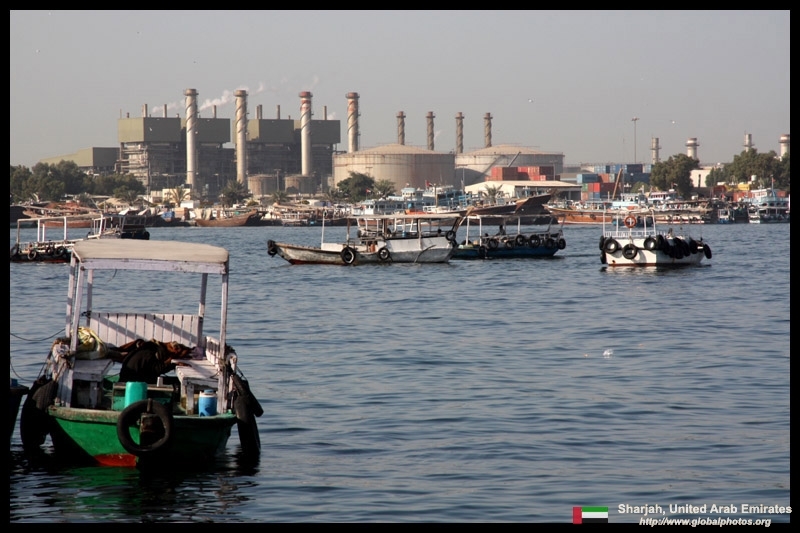 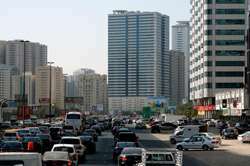 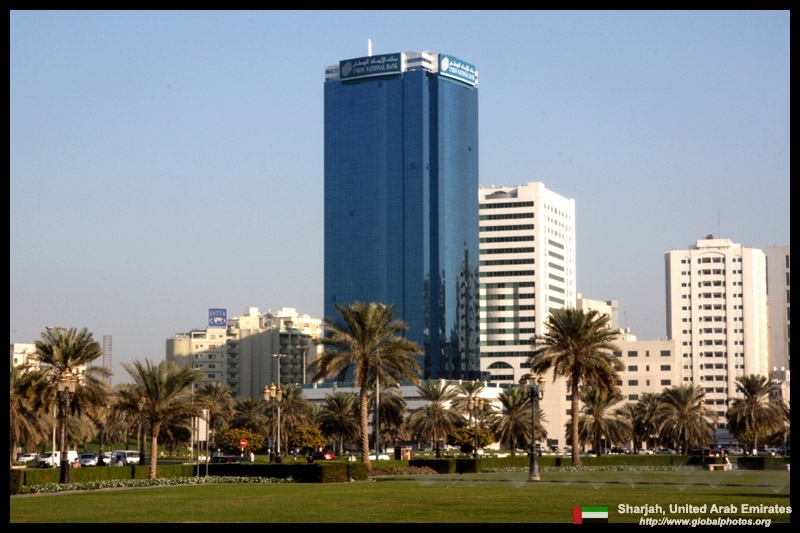 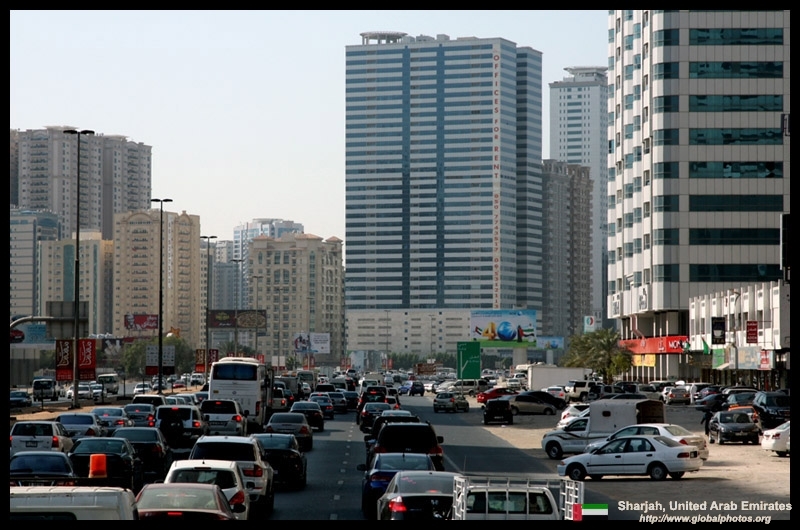 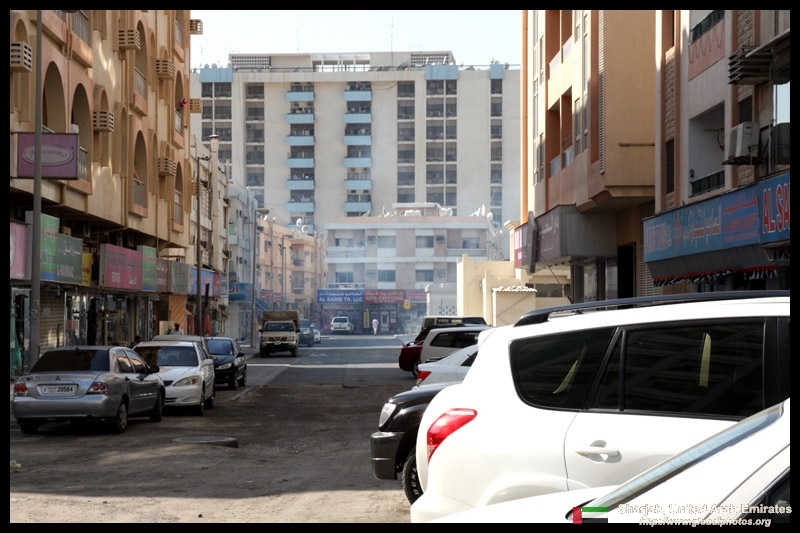 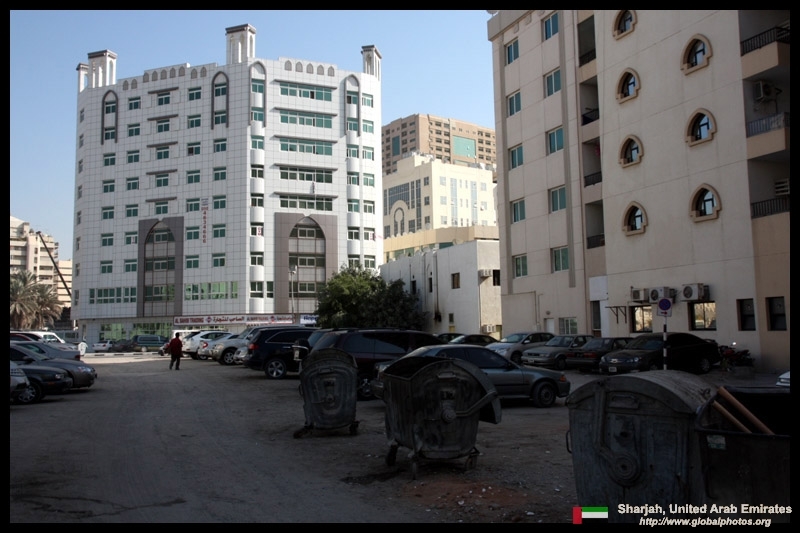 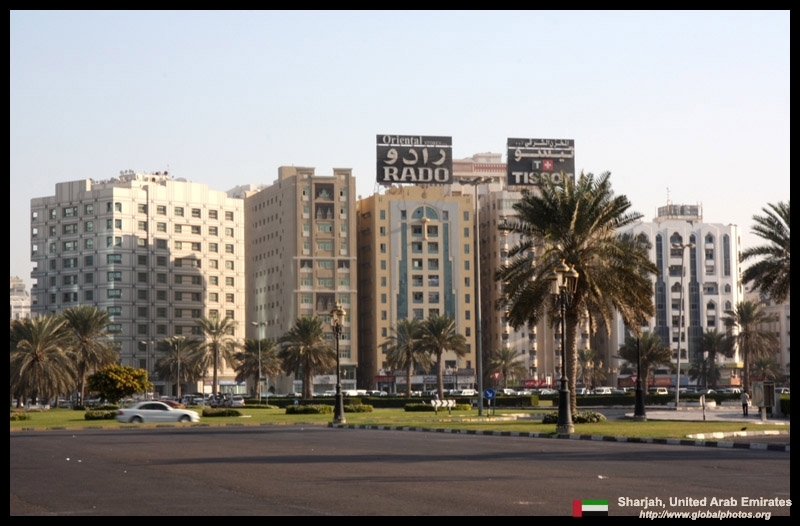 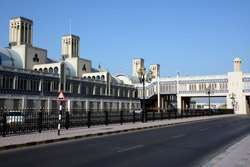 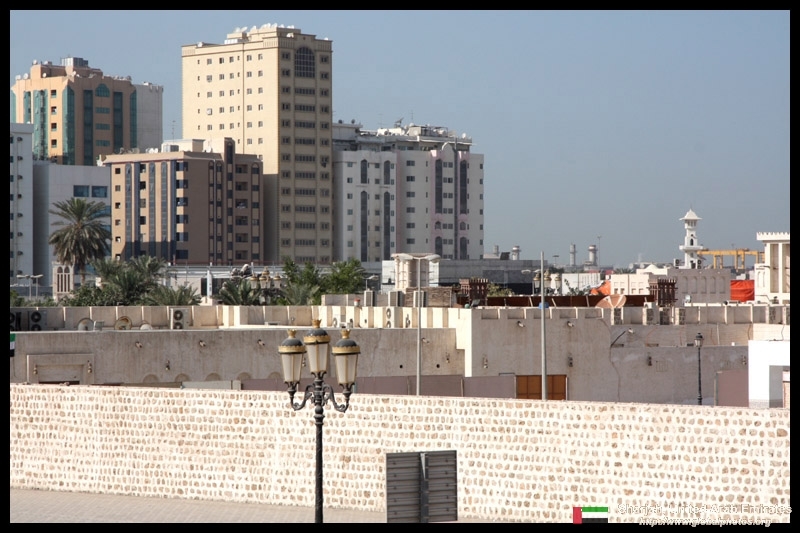 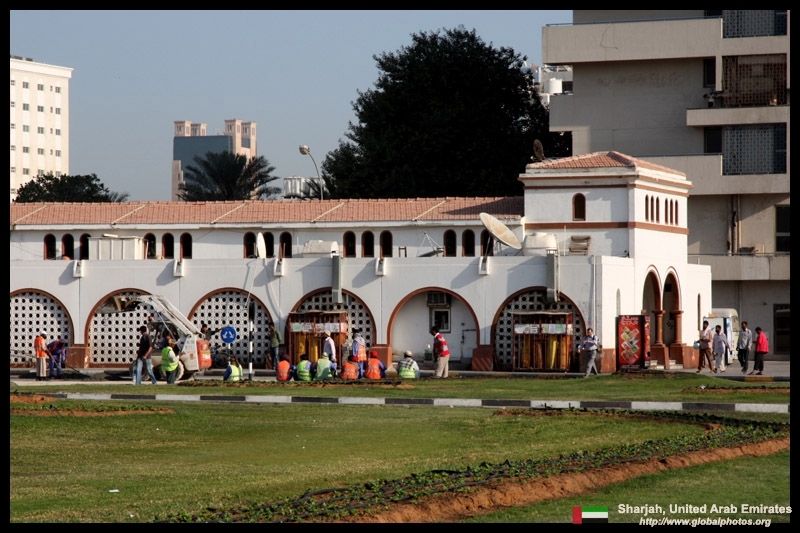 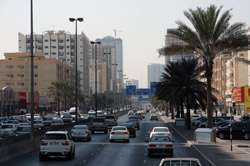 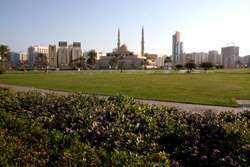 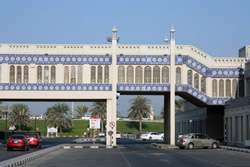 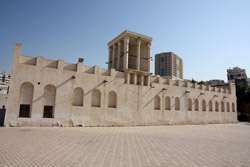 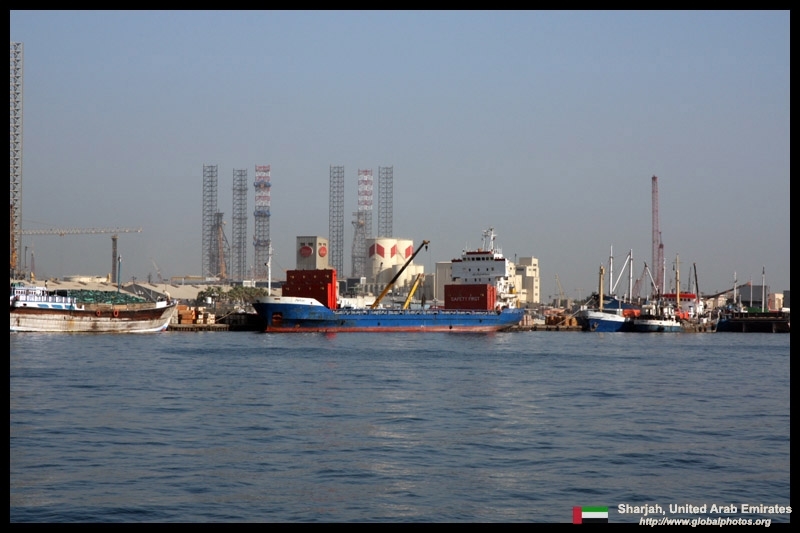 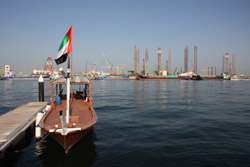 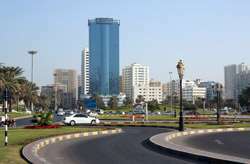 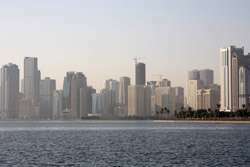 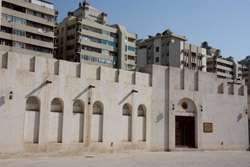 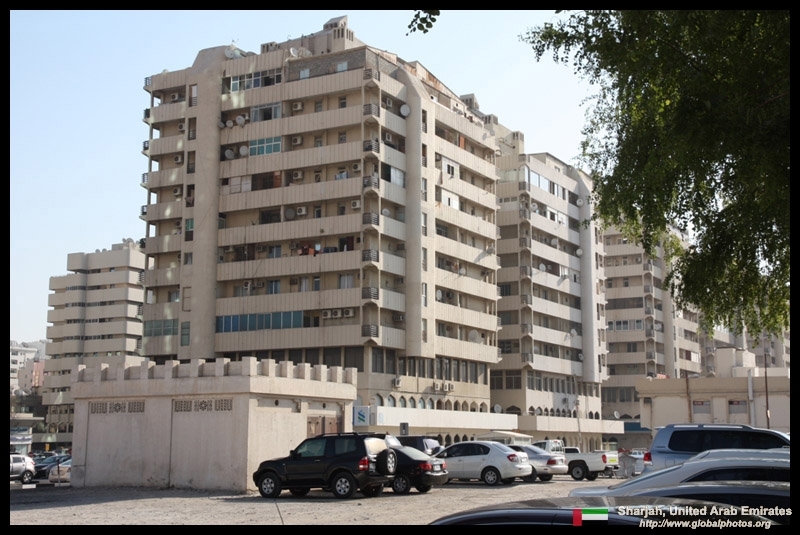 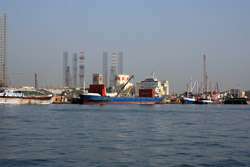 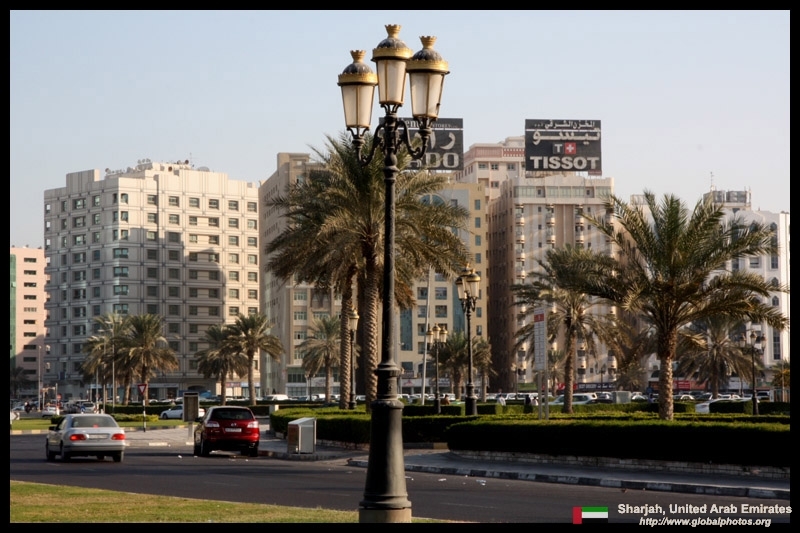 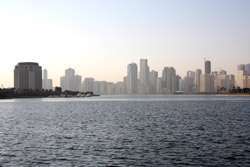 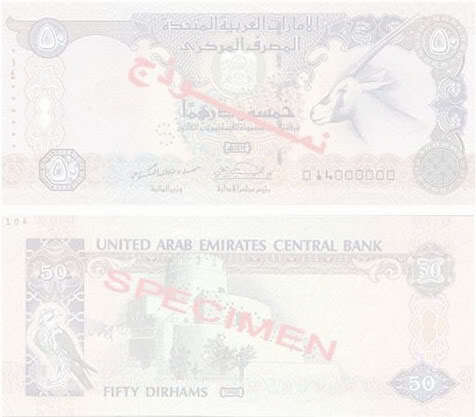 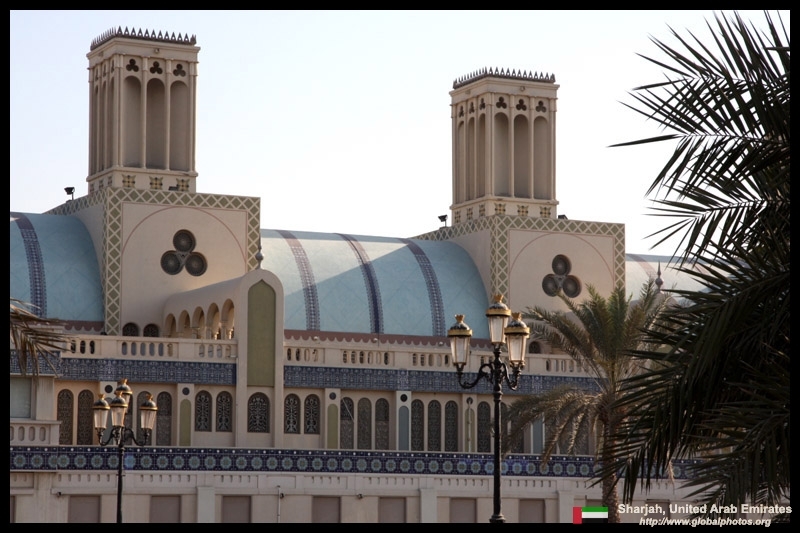 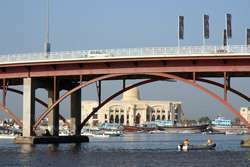 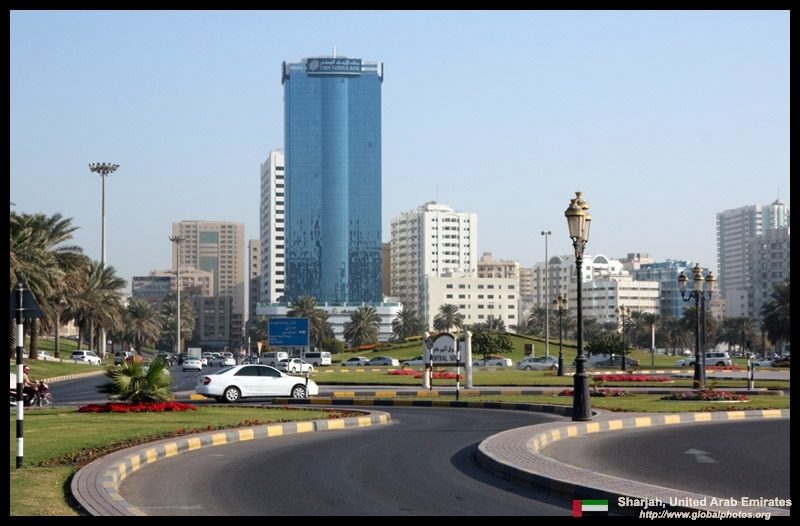 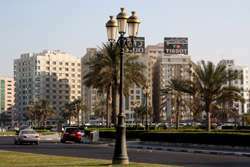 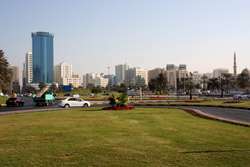 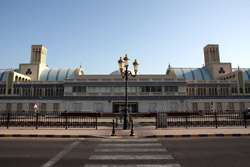 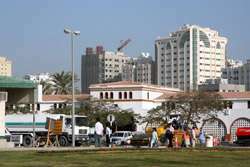 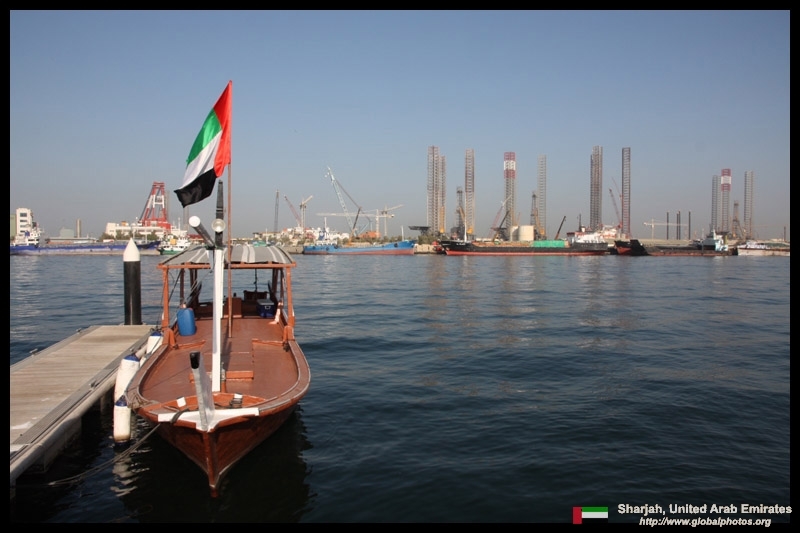 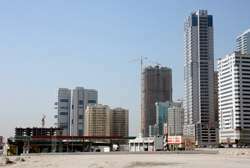 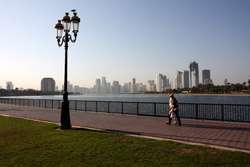 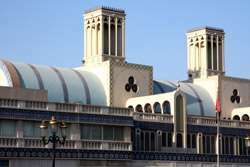 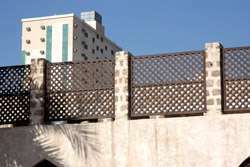 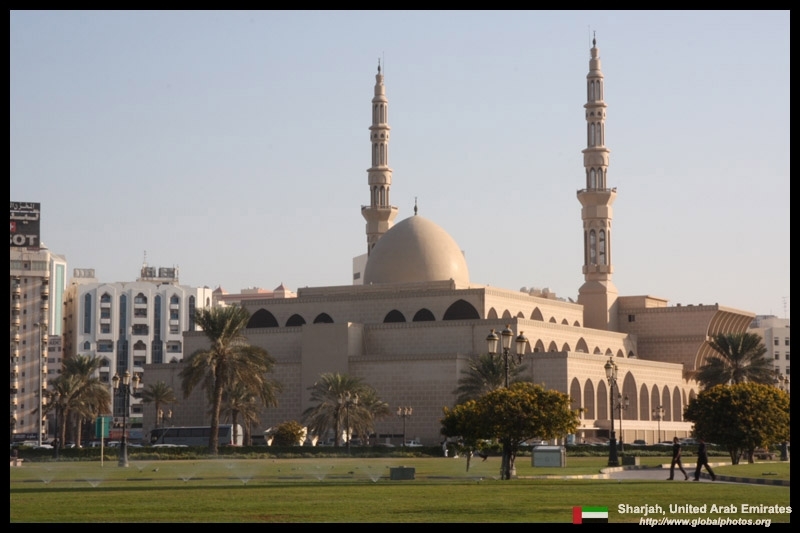 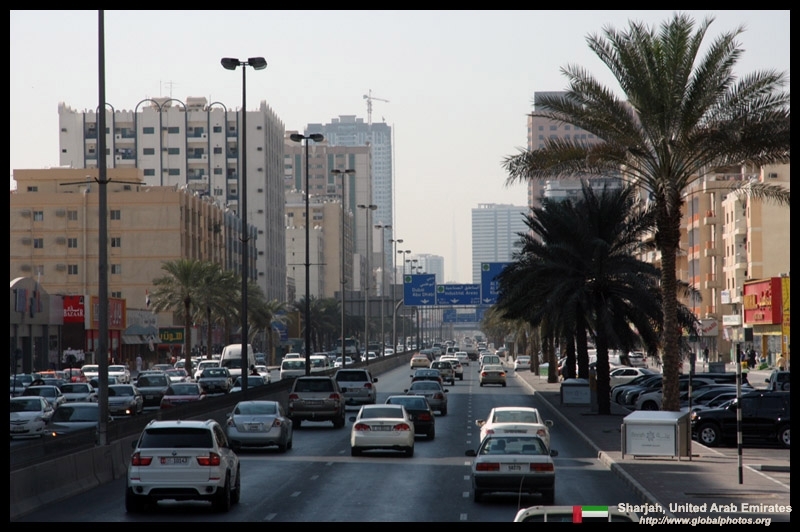 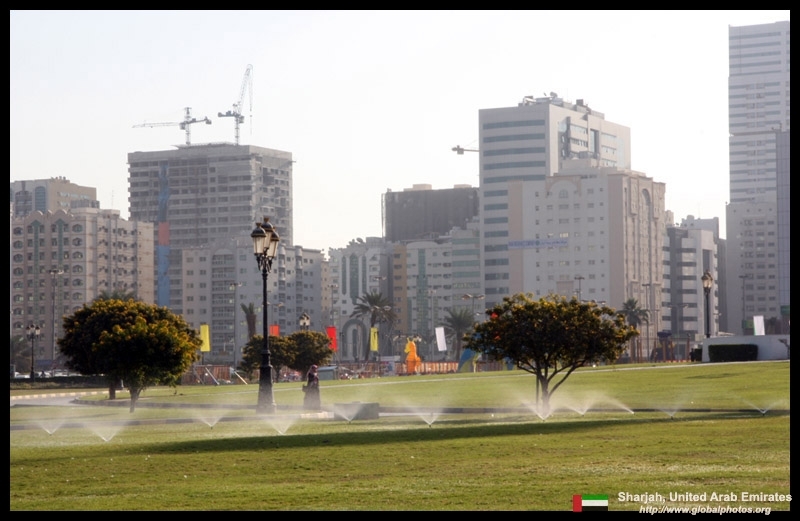 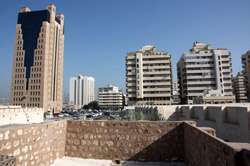 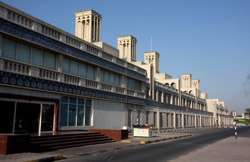 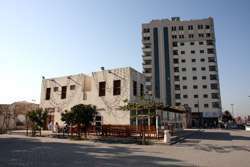 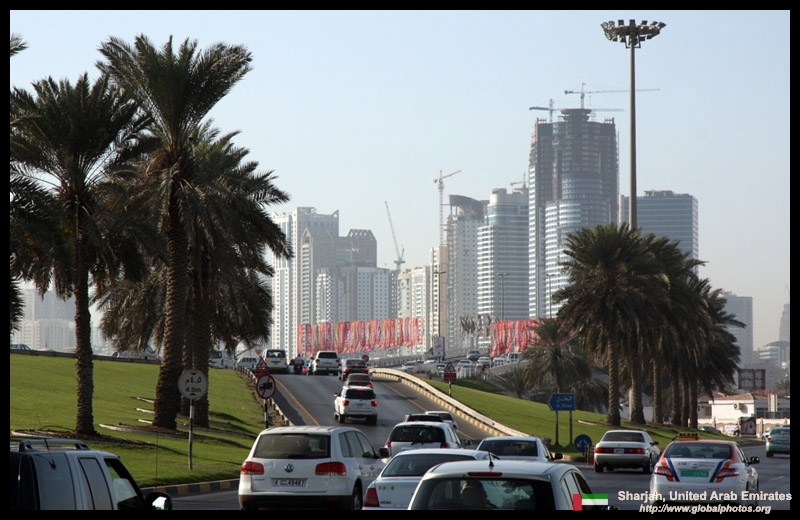 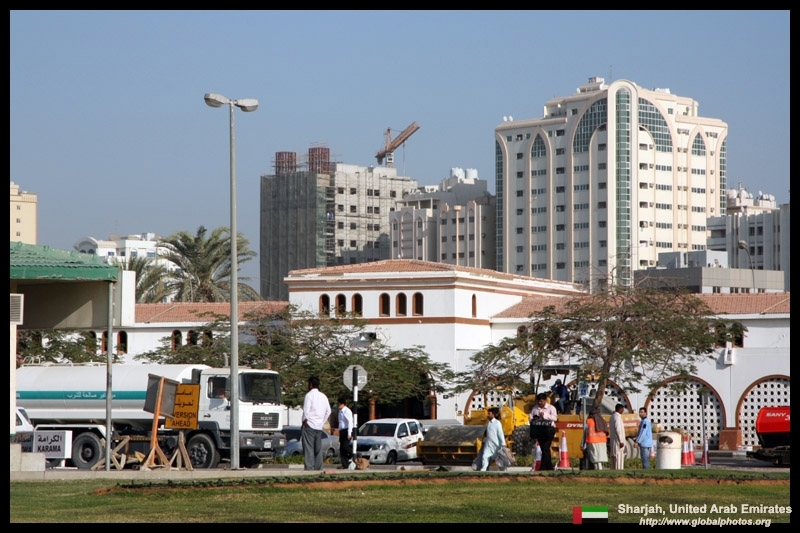 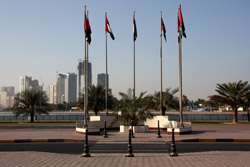 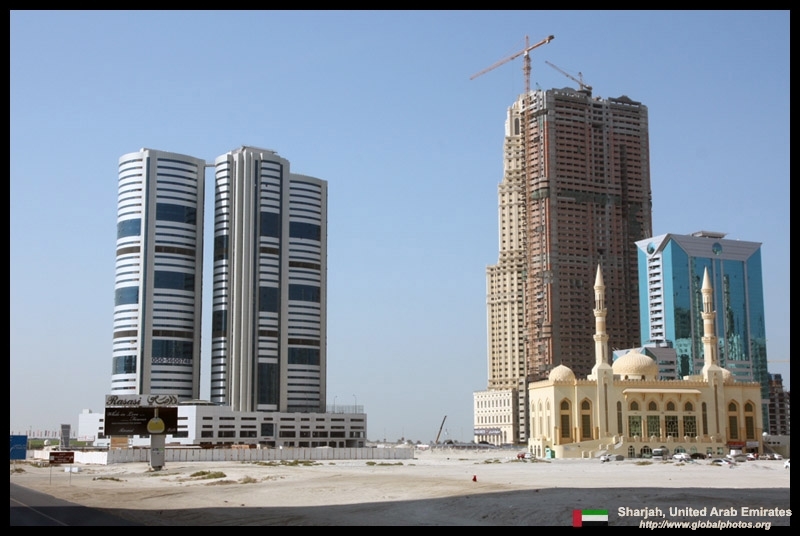 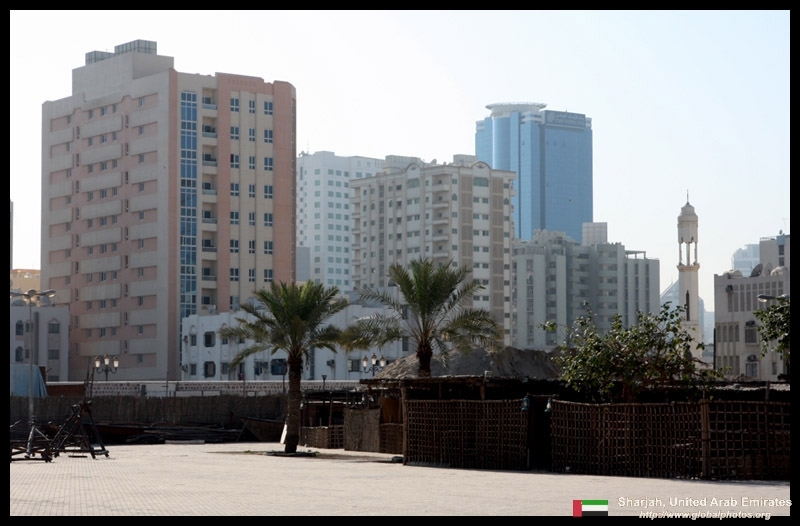 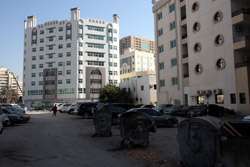 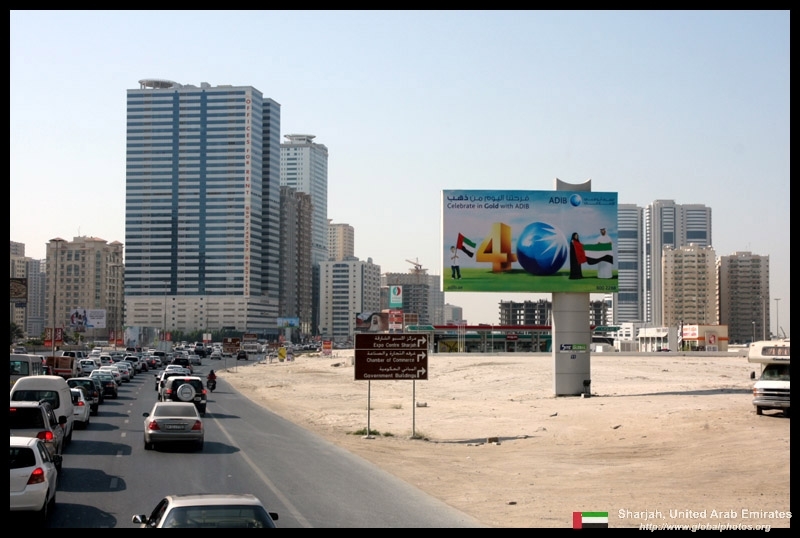 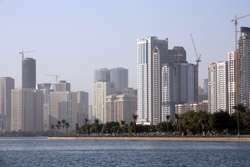 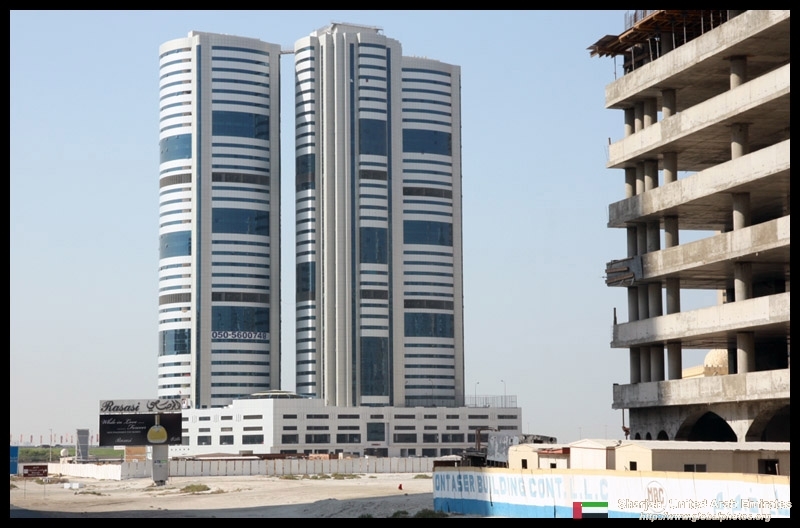 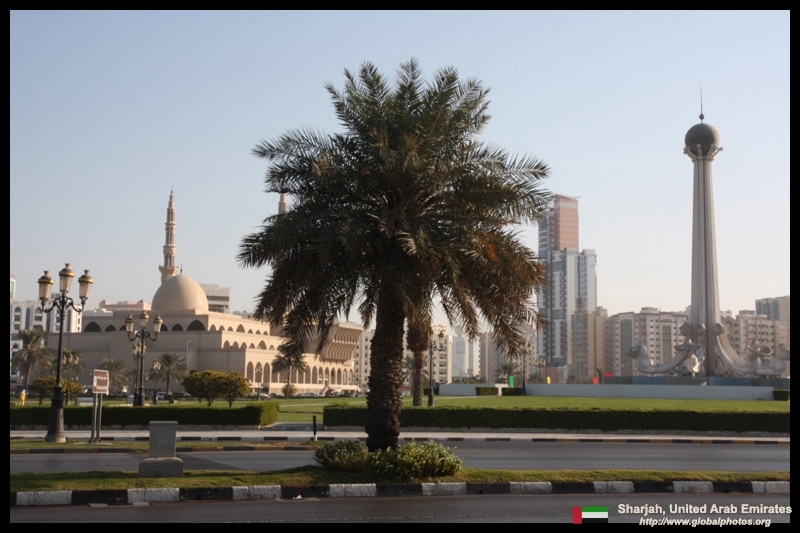 While Dubai is often referred to as a cultural desert and an artificial playground for the rich, Sharjah was supposed to compensate for what Dubai lacks. 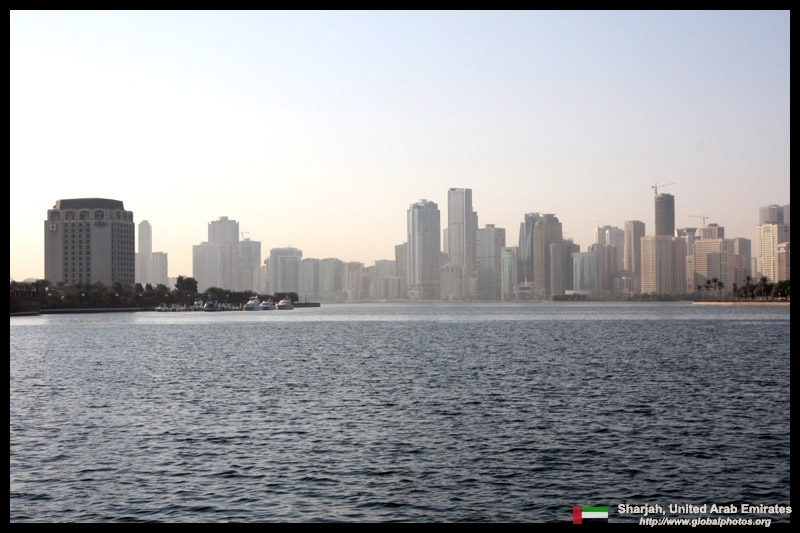 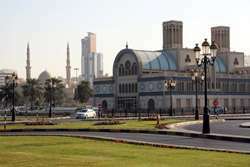 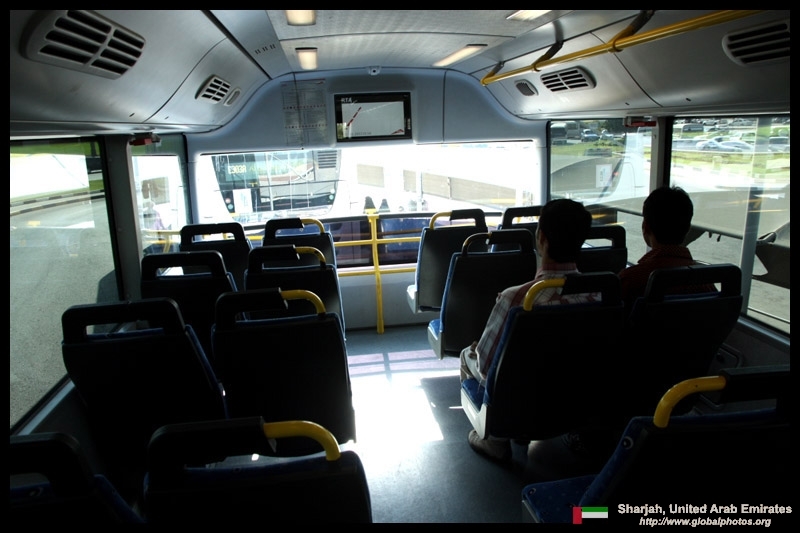 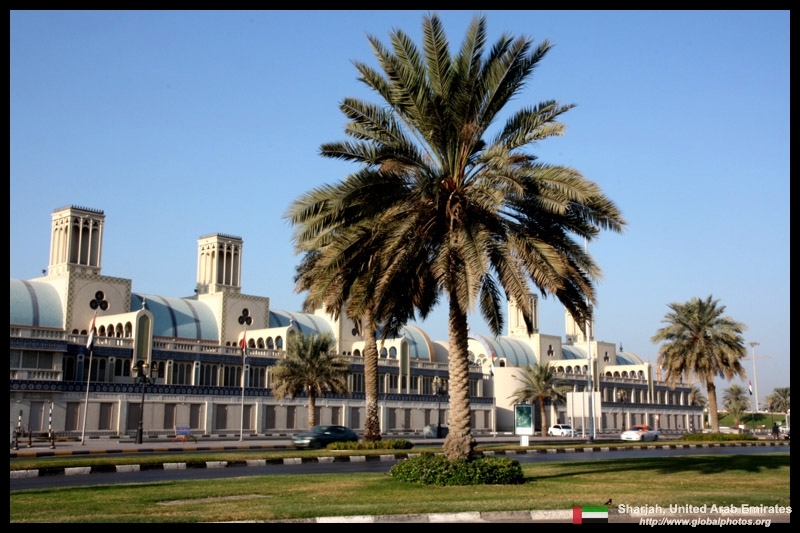 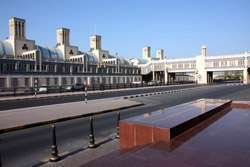 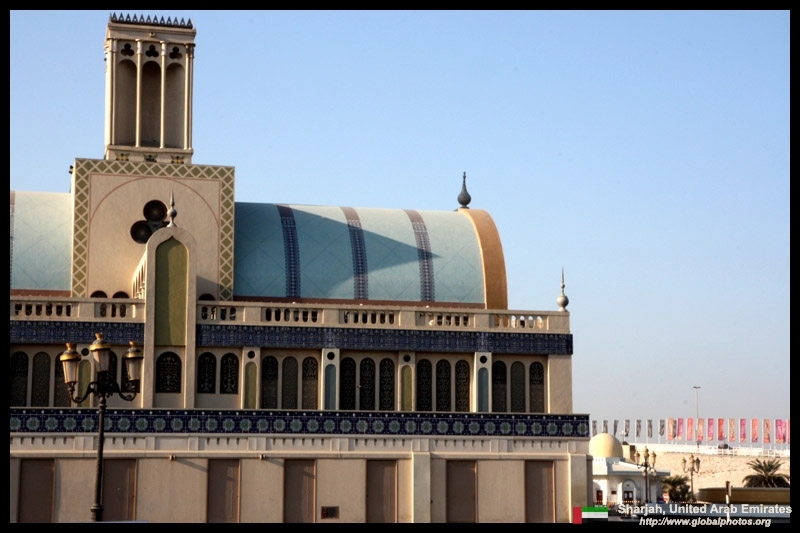 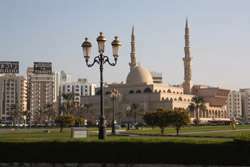 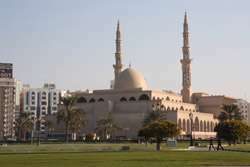 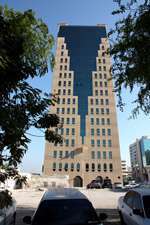 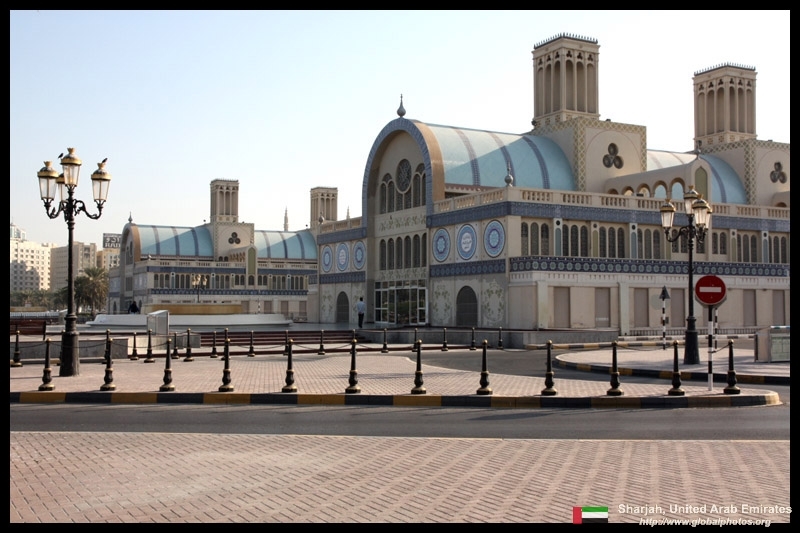 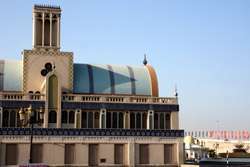 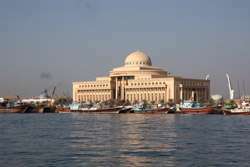 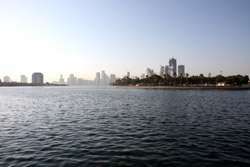 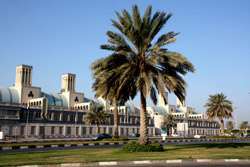 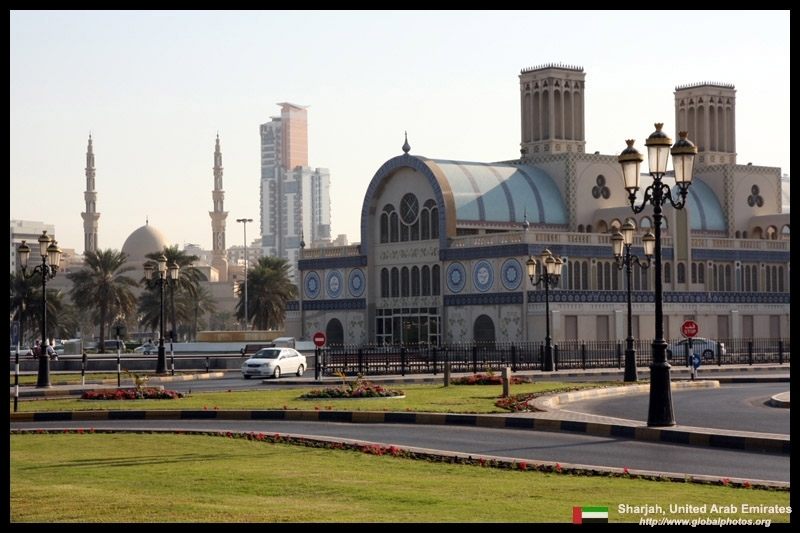 Being a short bus ride from Dubai, Sharjah is a good choice for a half day trip. 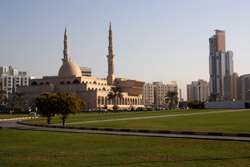 I got off the bus at Al Itihad Park, with the King Faisal Mosque gleaming under the morning sun. 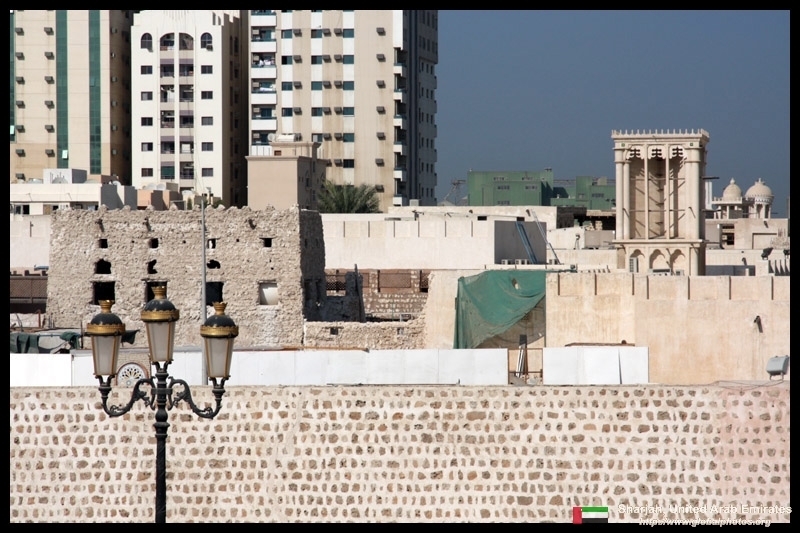 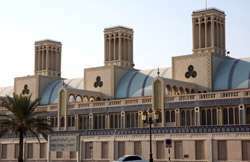 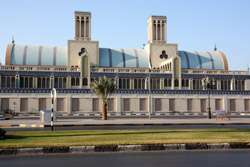 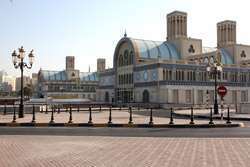 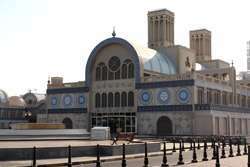 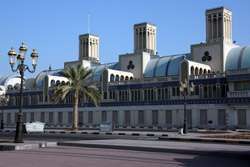 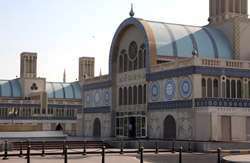 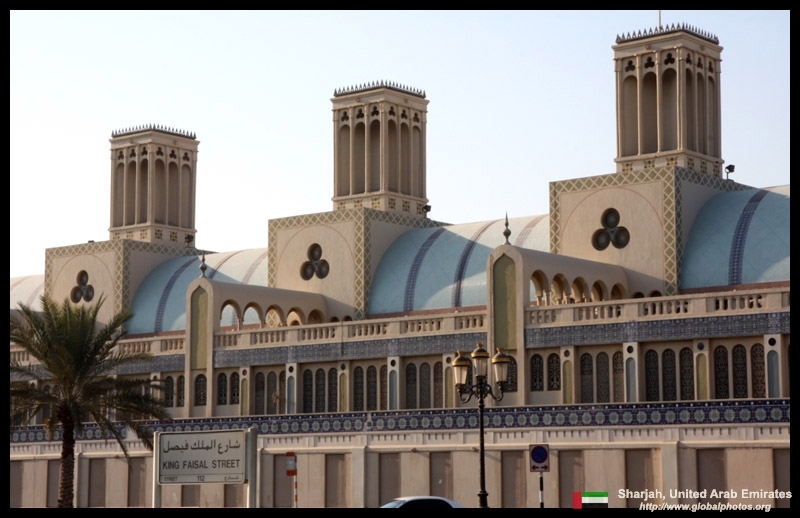 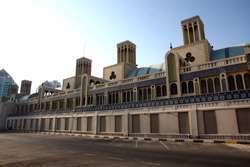 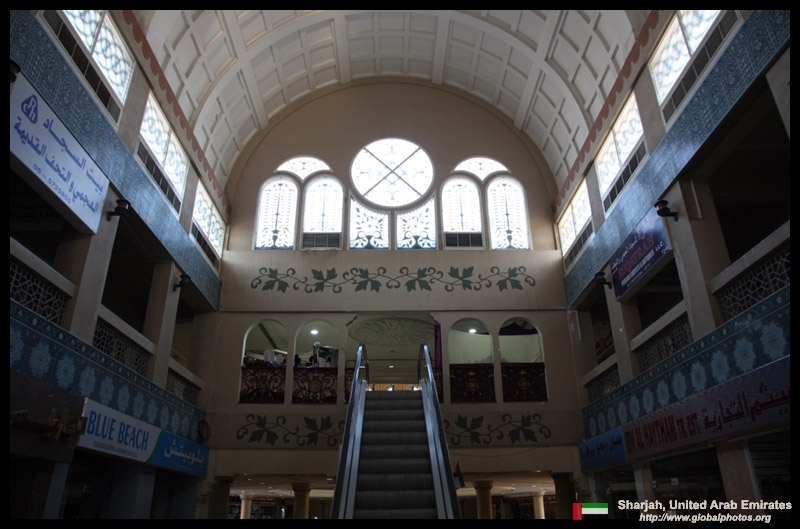 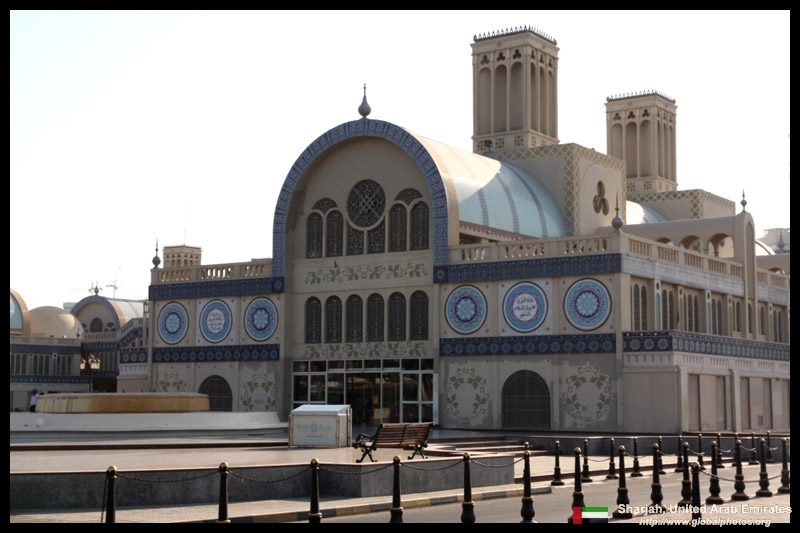 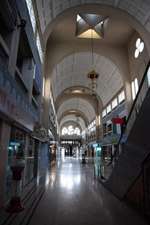 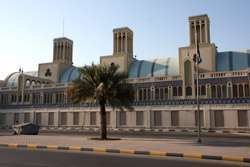 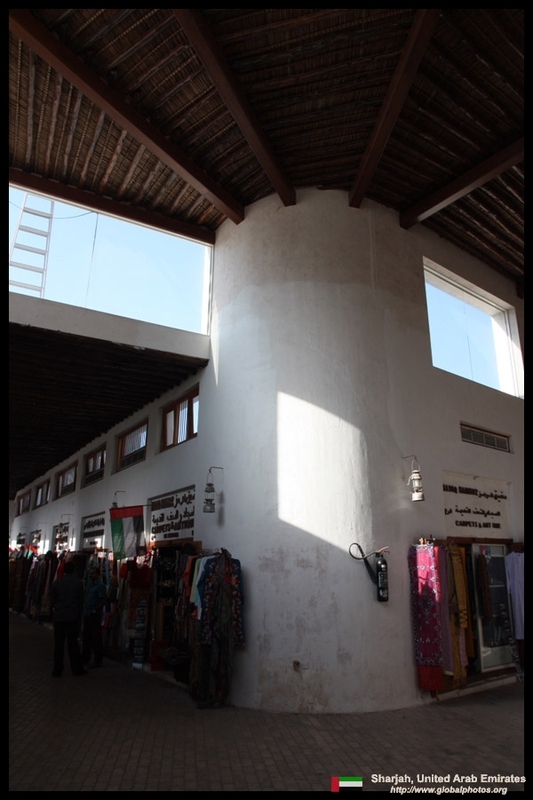 The Central Souq looked architecturally-interesting on the outside, but the heritage disappeared from view once inside. 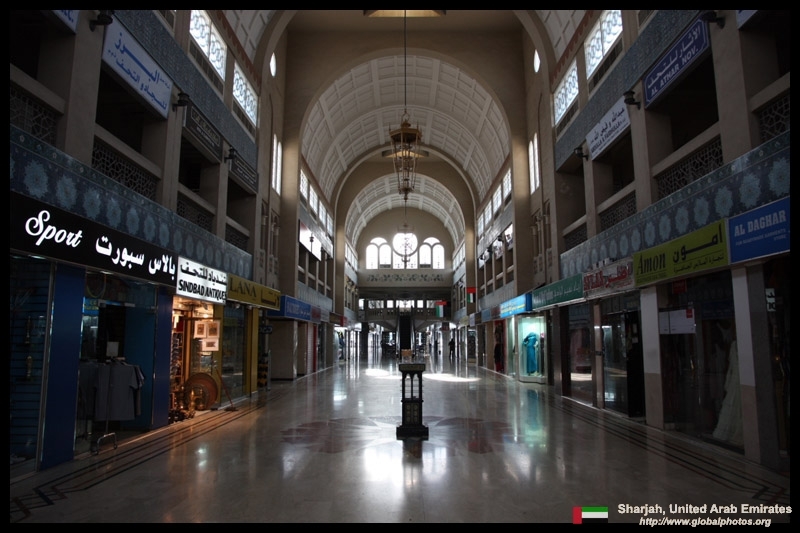 They modernized the store fronts excessively. 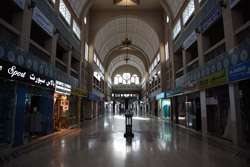 It was not a traditional market anymore. 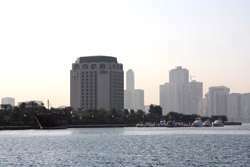 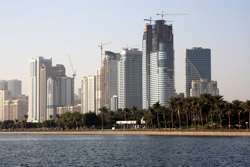 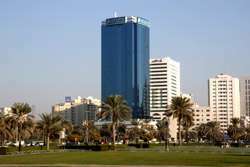 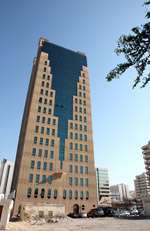 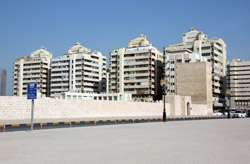 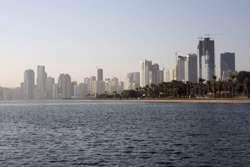 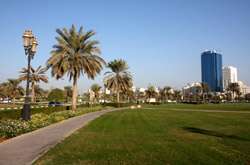 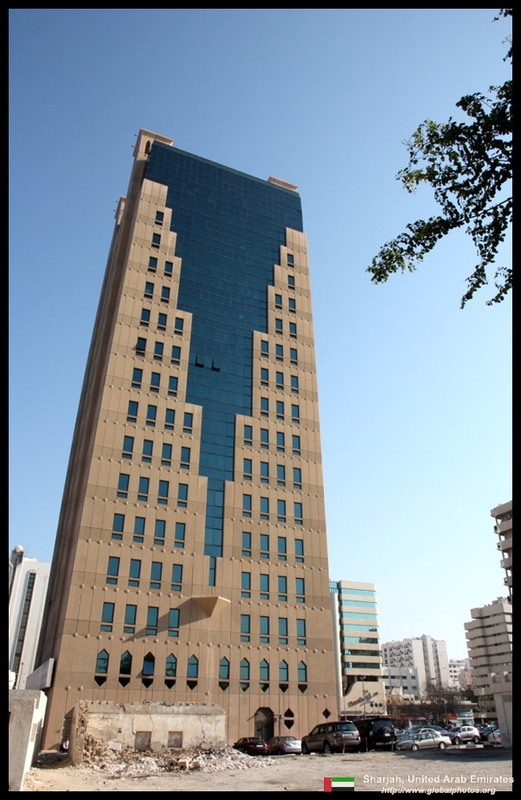 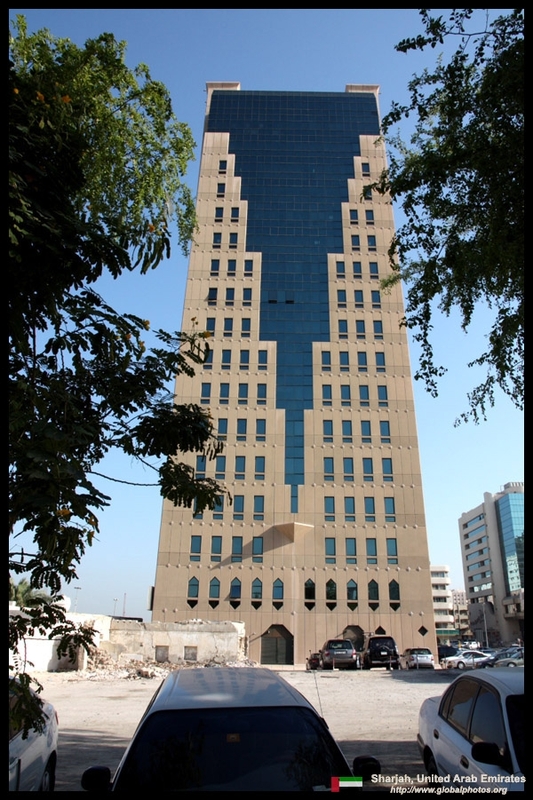 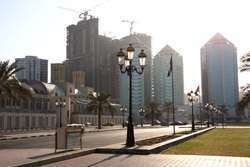 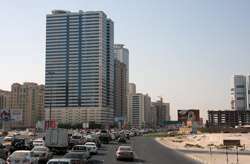 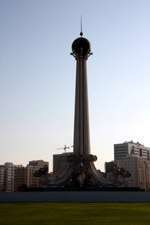 The Corniche was lined with skyscrapers. 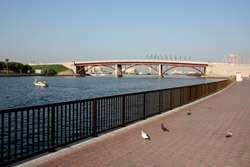 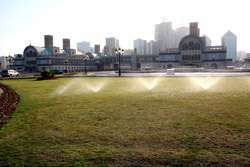 The waterfront had walkways and parklands. 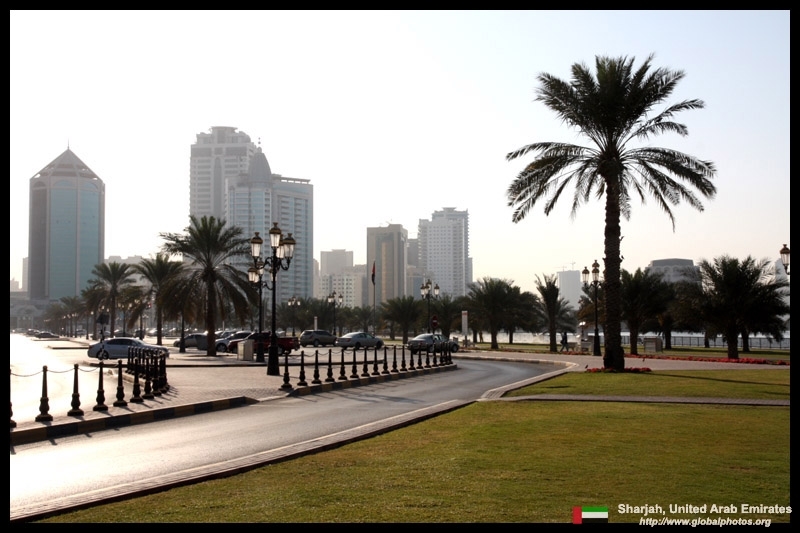 It was clean and pleasant to stroll, but it was a winter day. 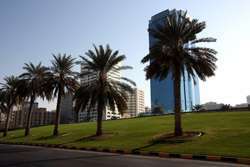 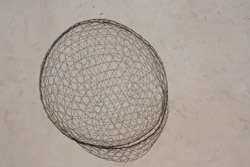 I can't imagine what summer here would be like with no tree shading. 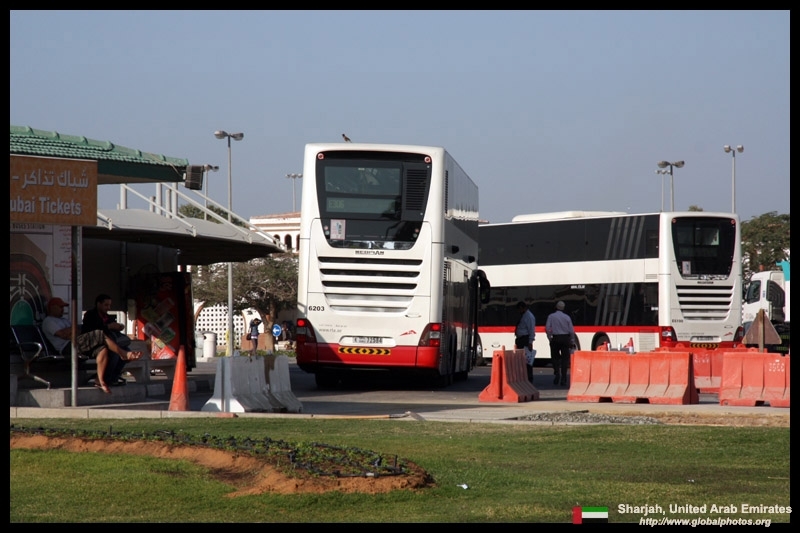 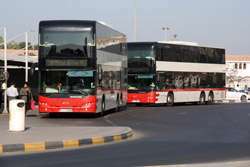 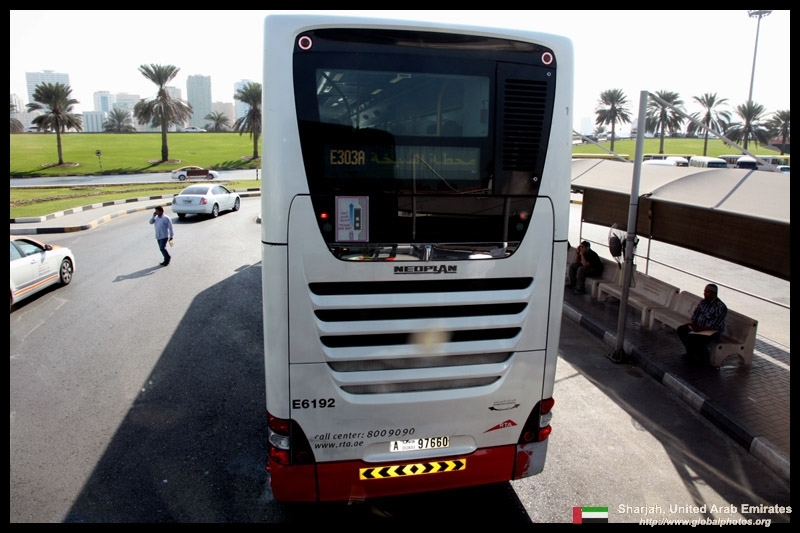 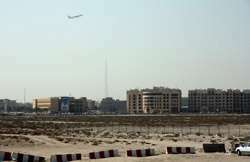 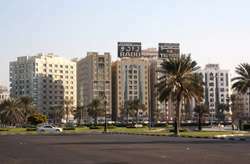 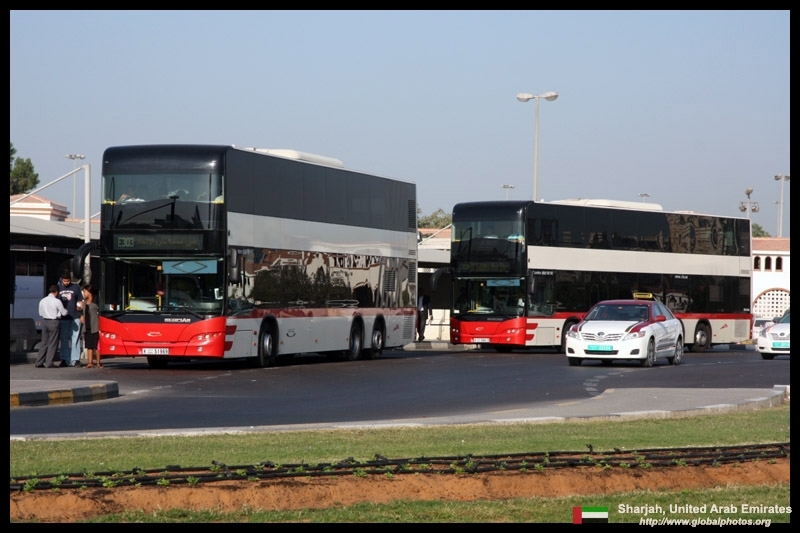 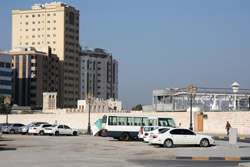 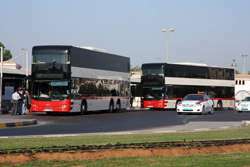 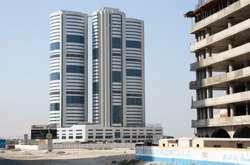 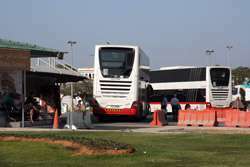 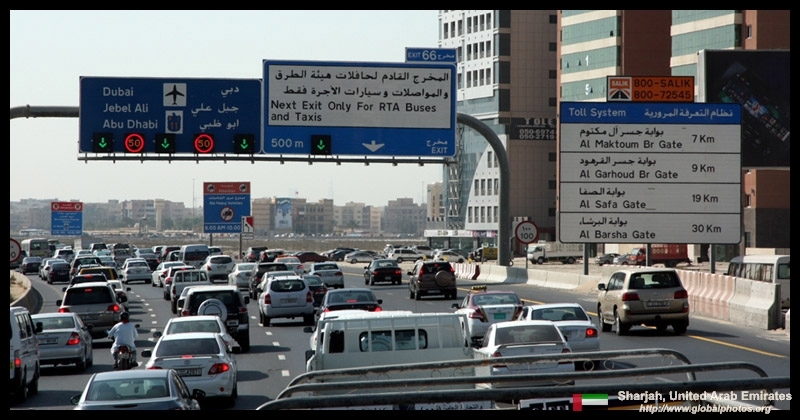 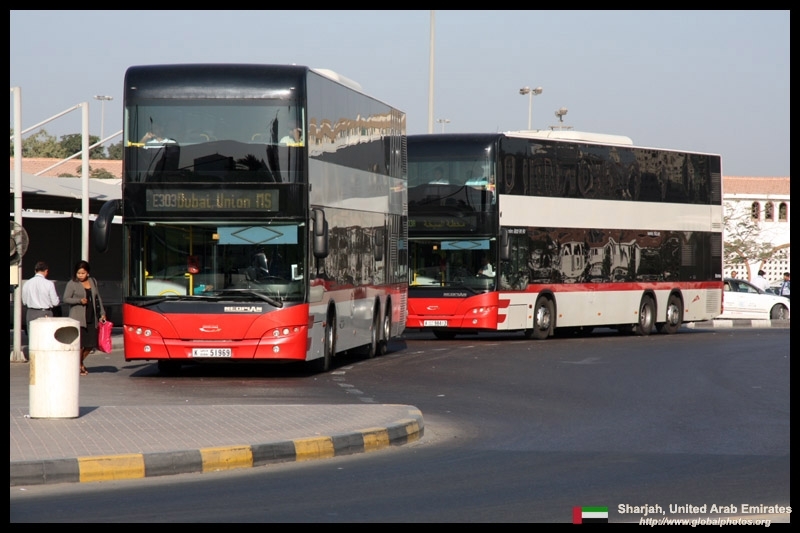 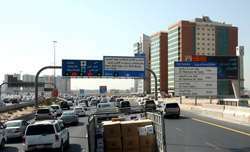 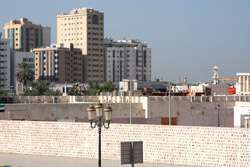 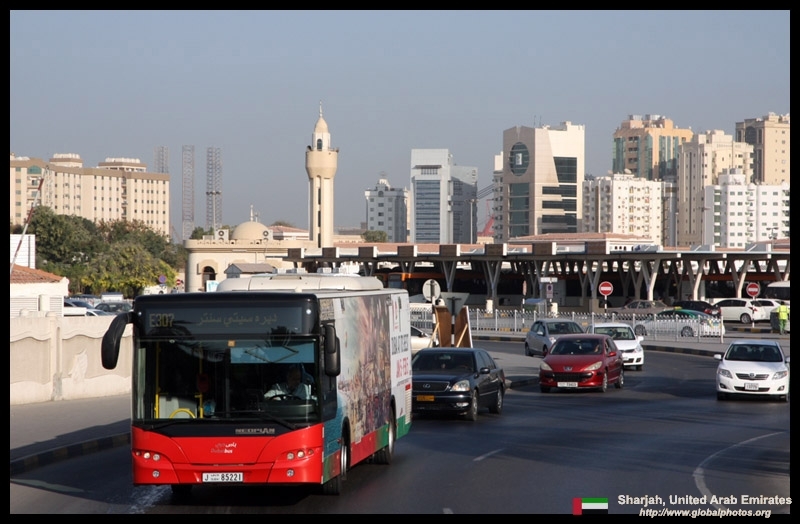 Intercity buses terminate at Al Jubail, which is across the freeway from the market. 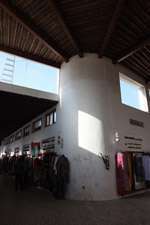 The Fruit and Vegetable Market is a narrow building that curves around the bus station. 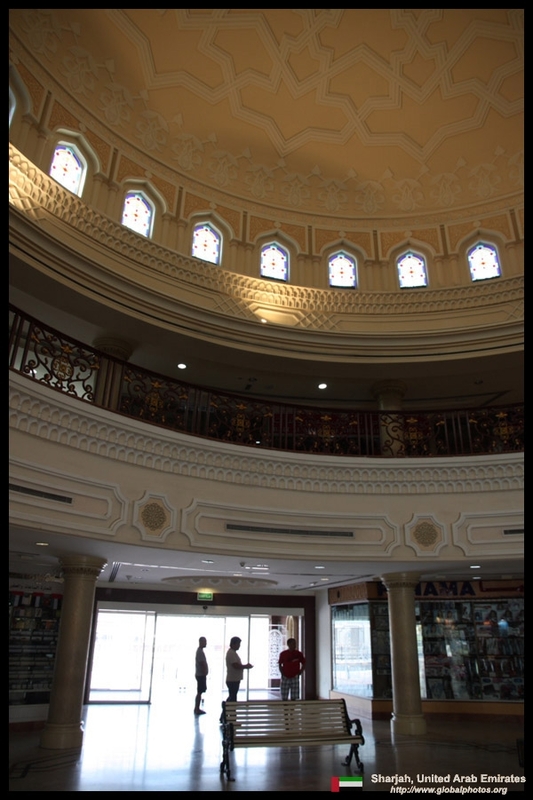 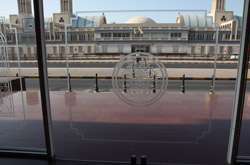 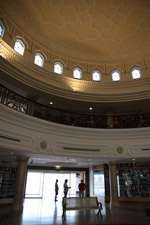 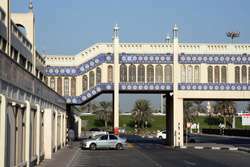 Having been to its counterpart in Dubai, I wasn't so interested in checking out whatever chaotic scenes were inside. 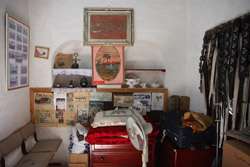 I only had half a day and wanted to maximize my time in the heritage area. 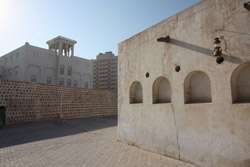 The Heritage Area was not sign-posted from the bus station. 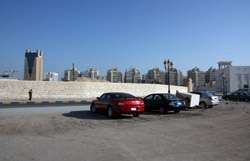 It took a bit of exploring around the side streets to find the edge of it. 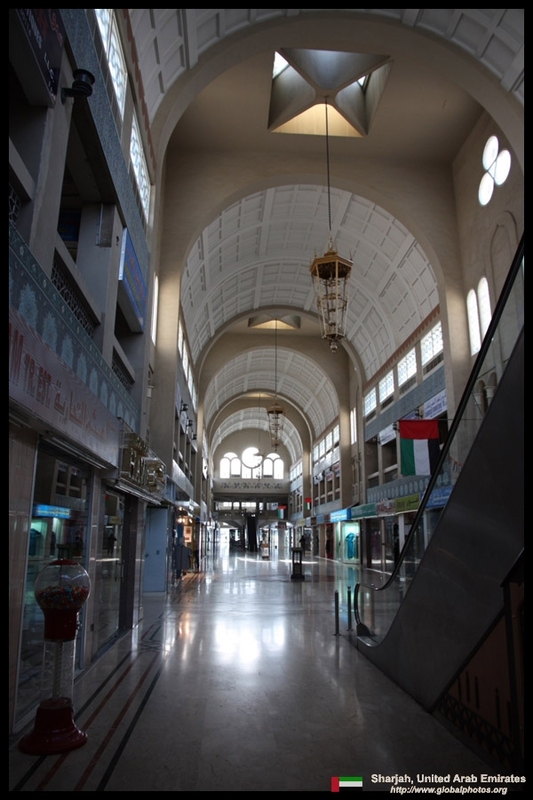 The souq was quiet this morning, with barely any tourists around. 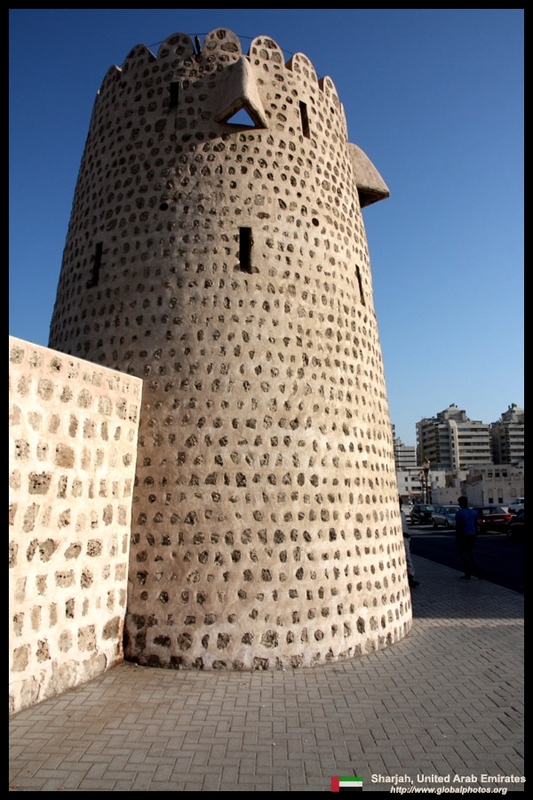 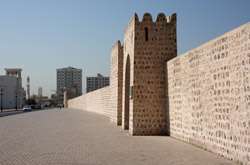 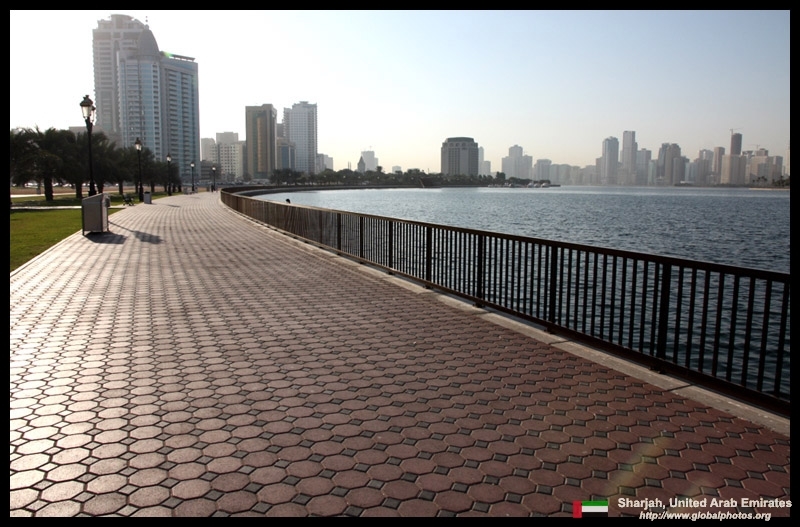 This part of the Corniche faces the port and the Persian Gulf lies beyond. 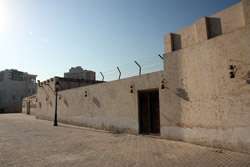 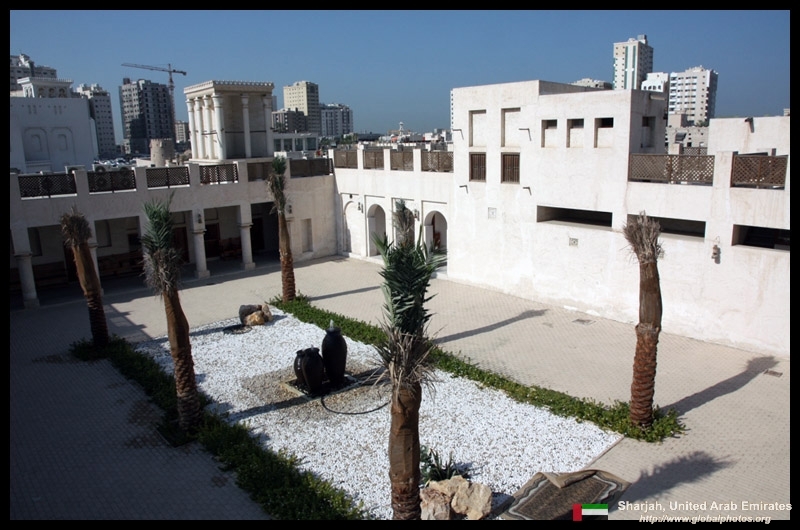 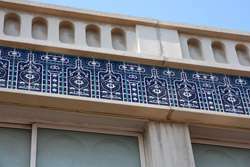 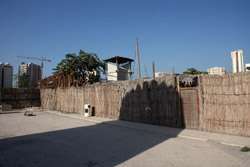 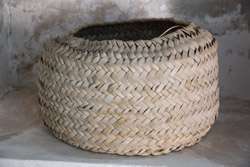 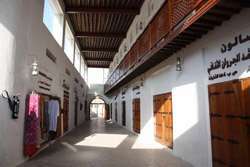 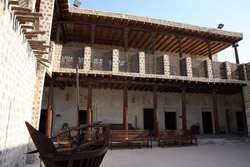 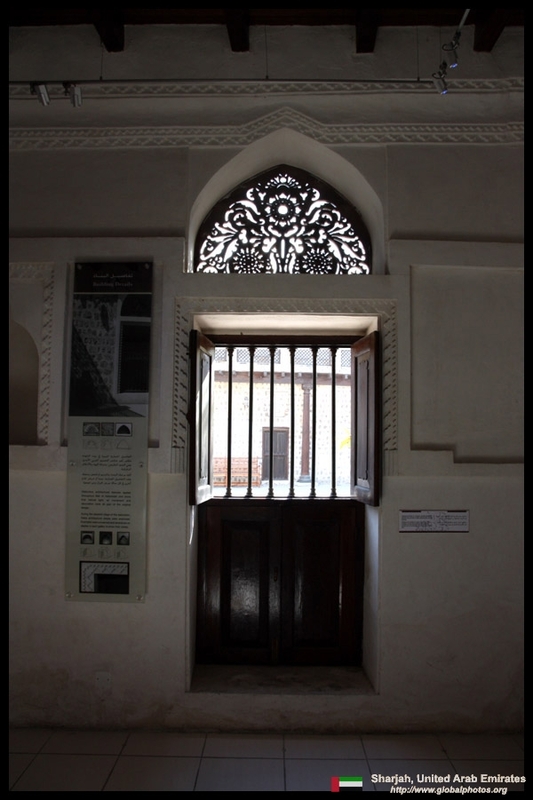 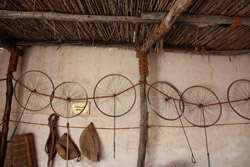 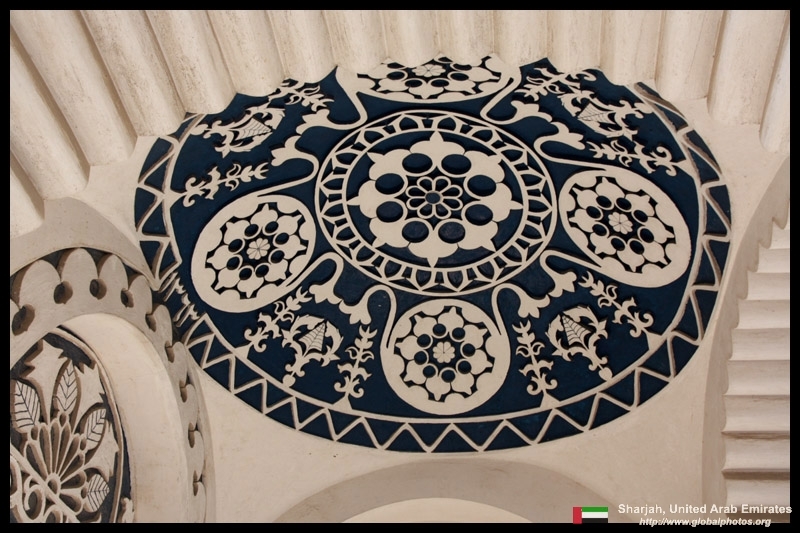 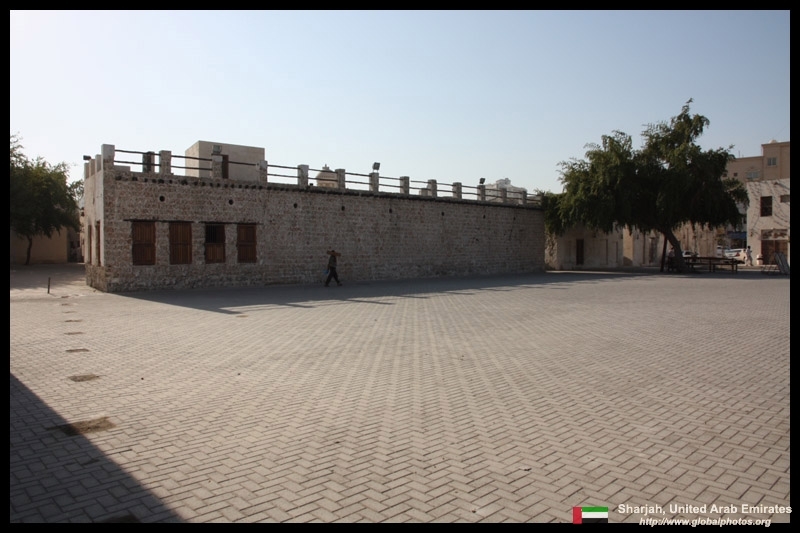 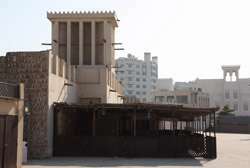 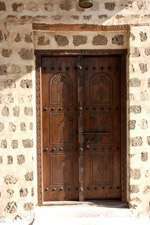 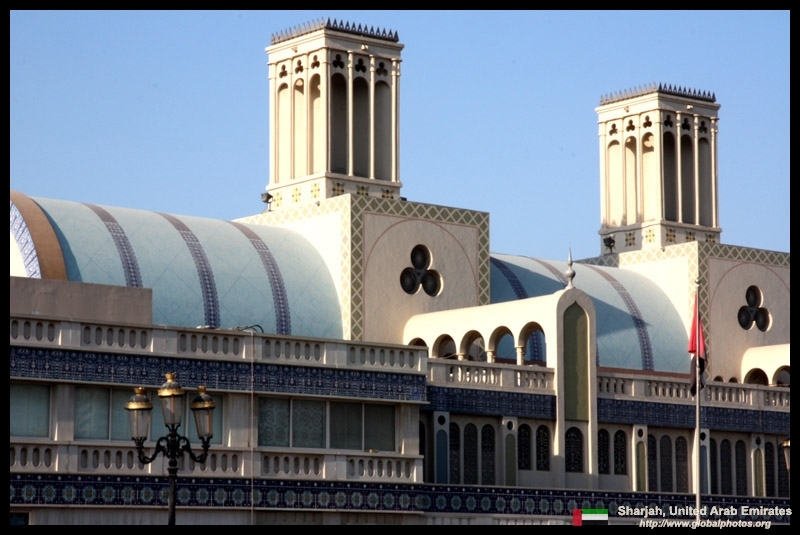 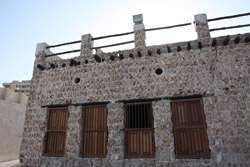 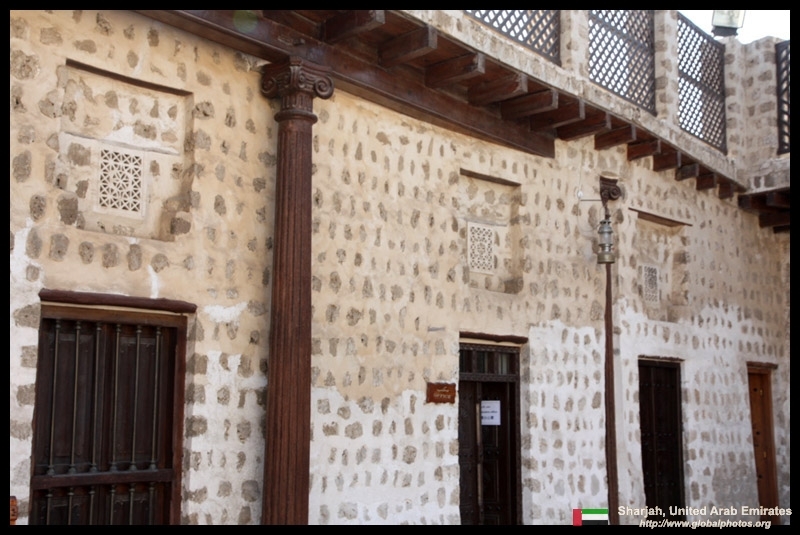 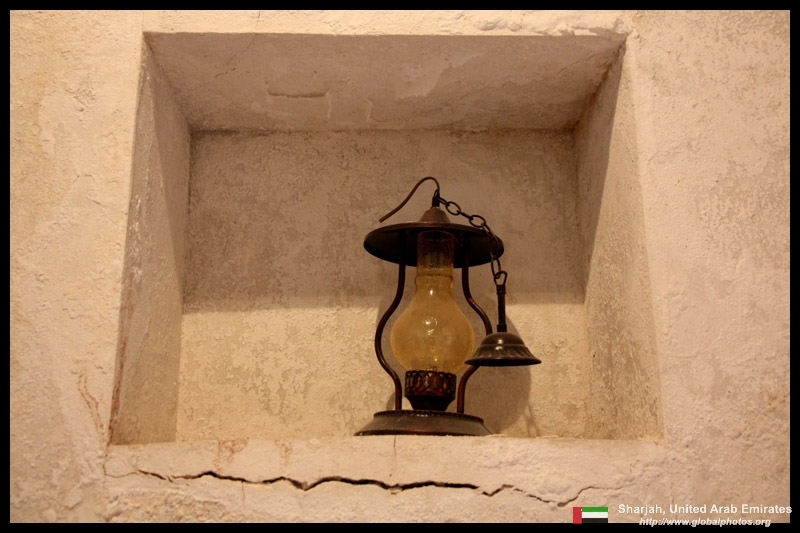 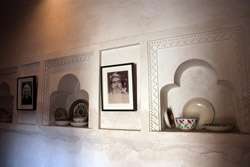 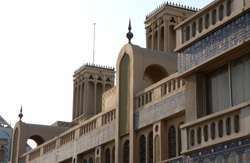 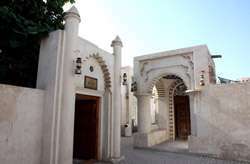 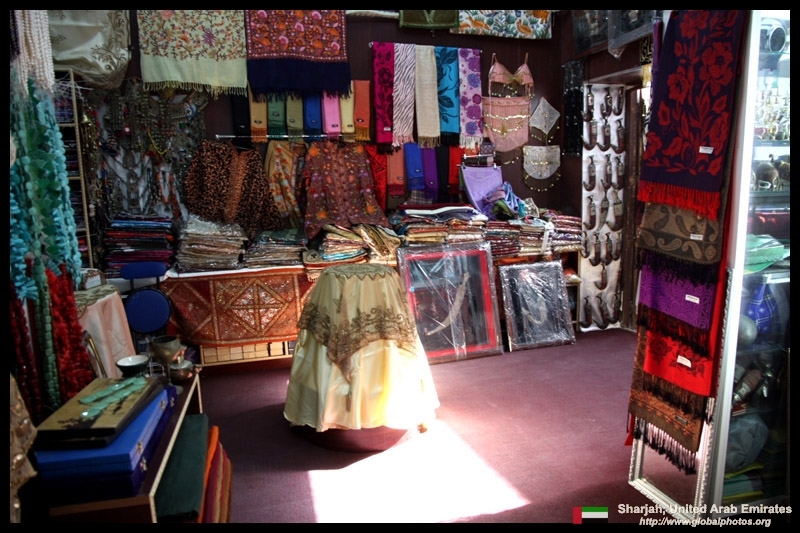 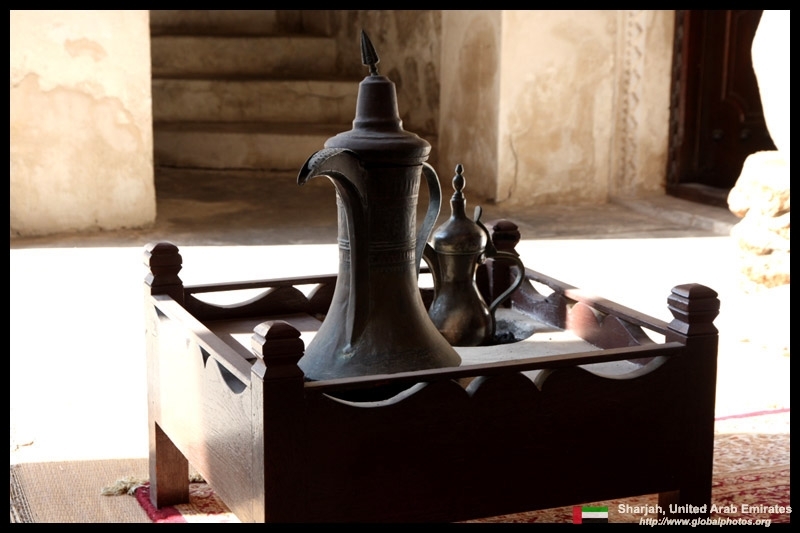 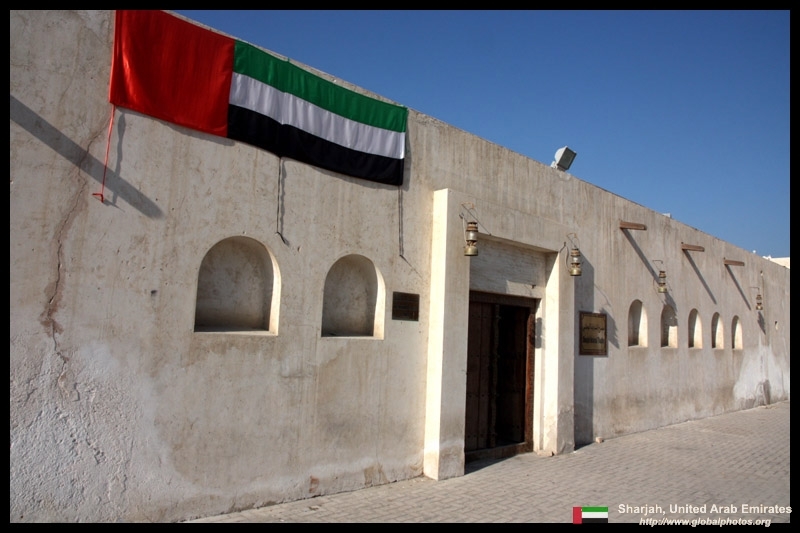 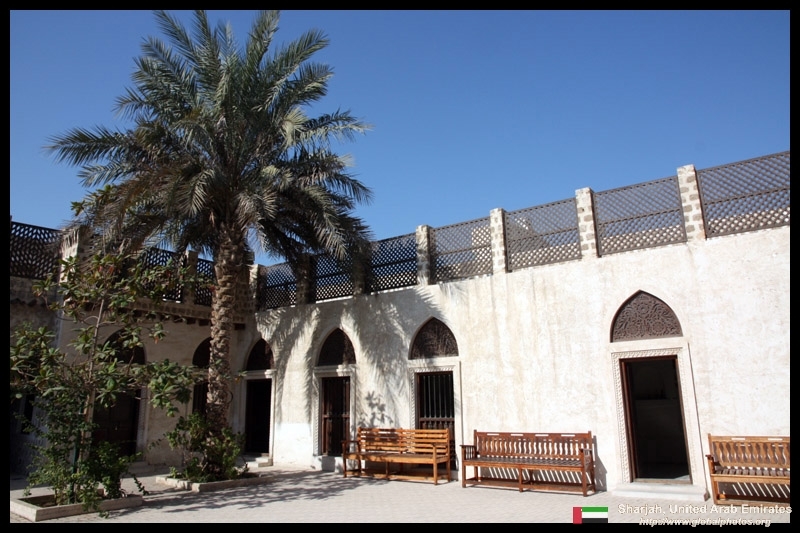 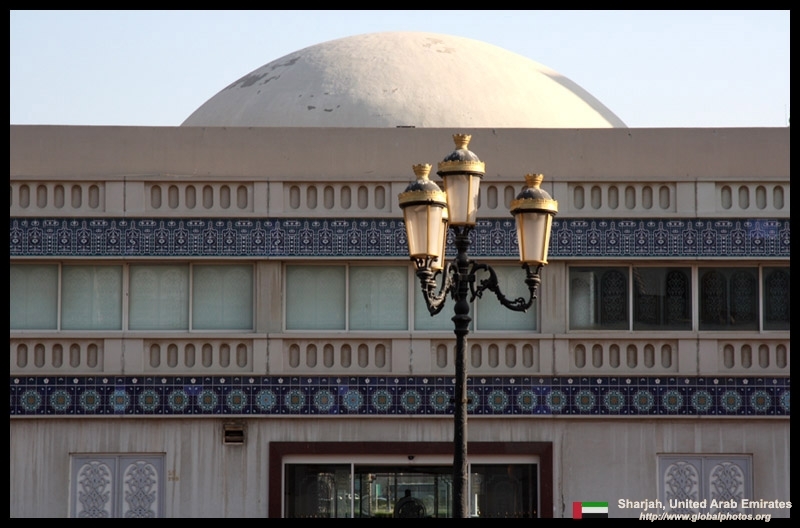 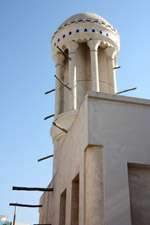 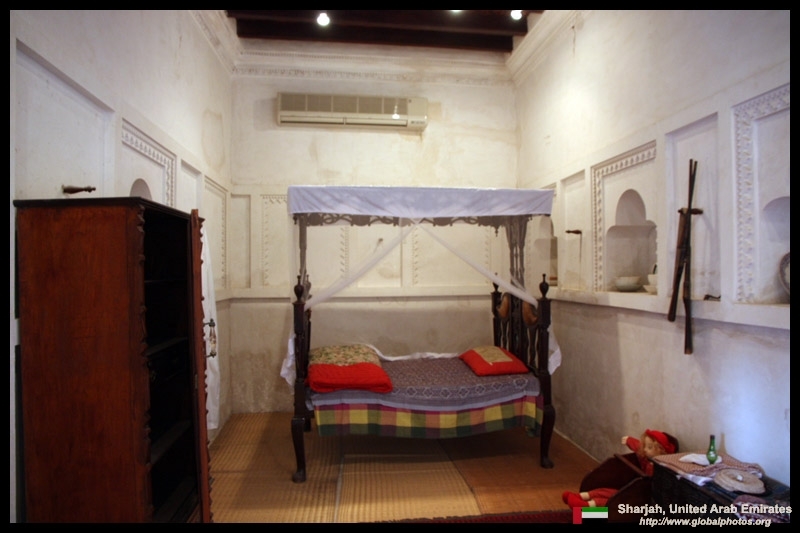 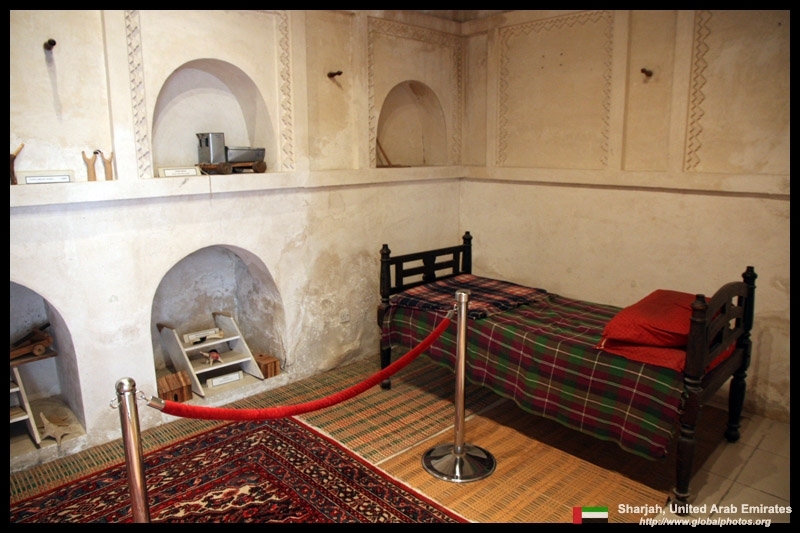 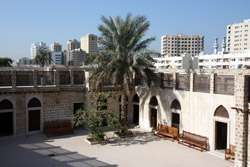 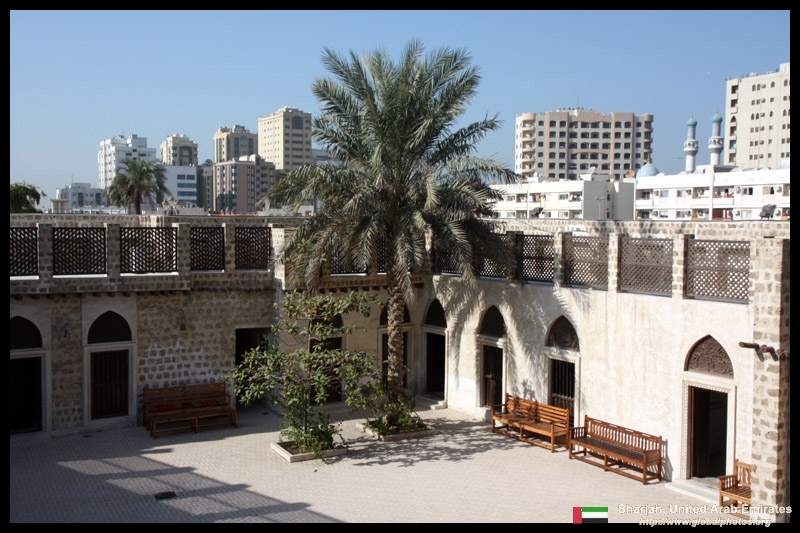 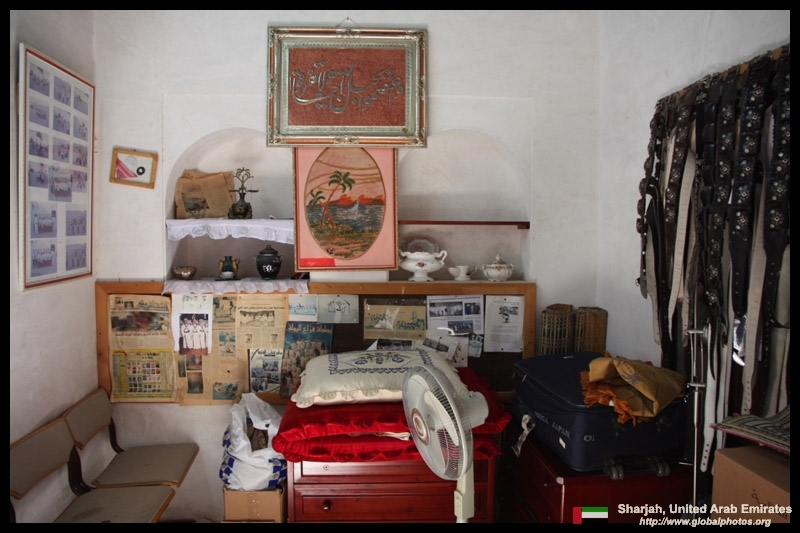 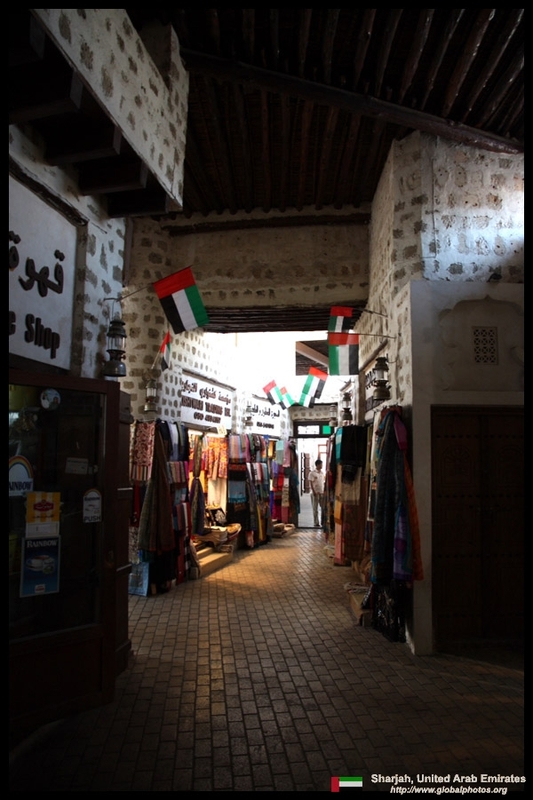 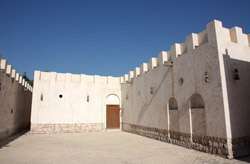 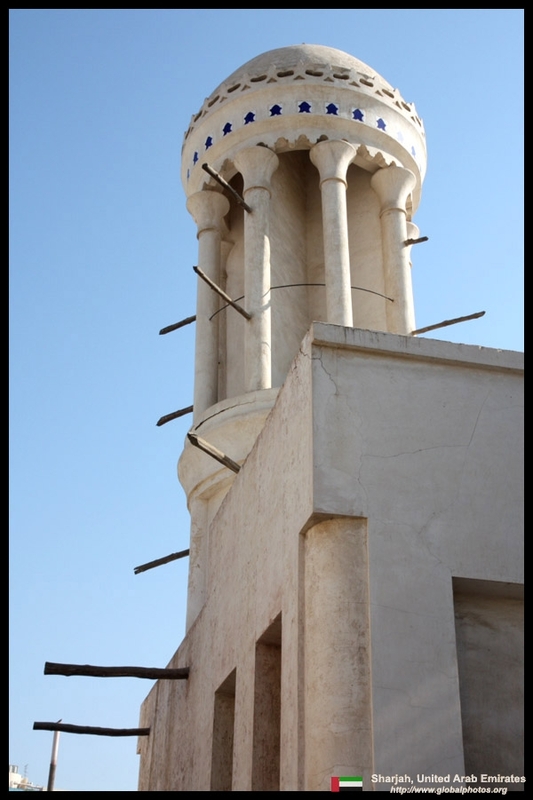 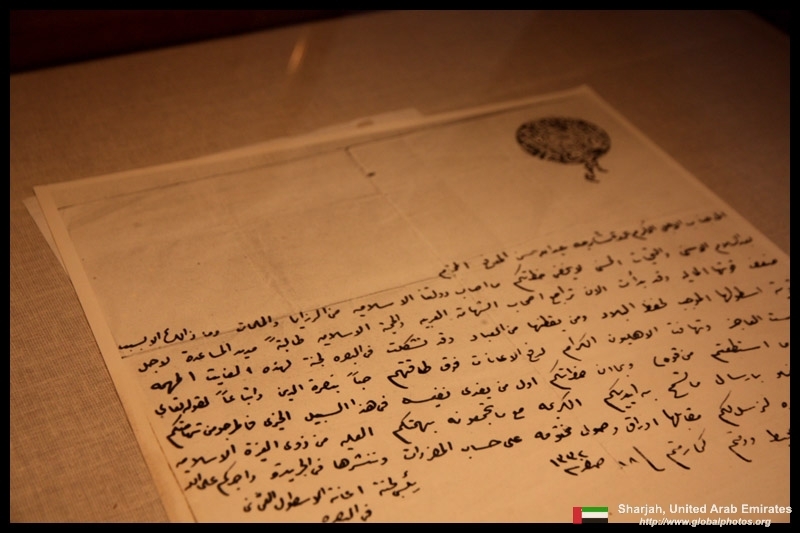 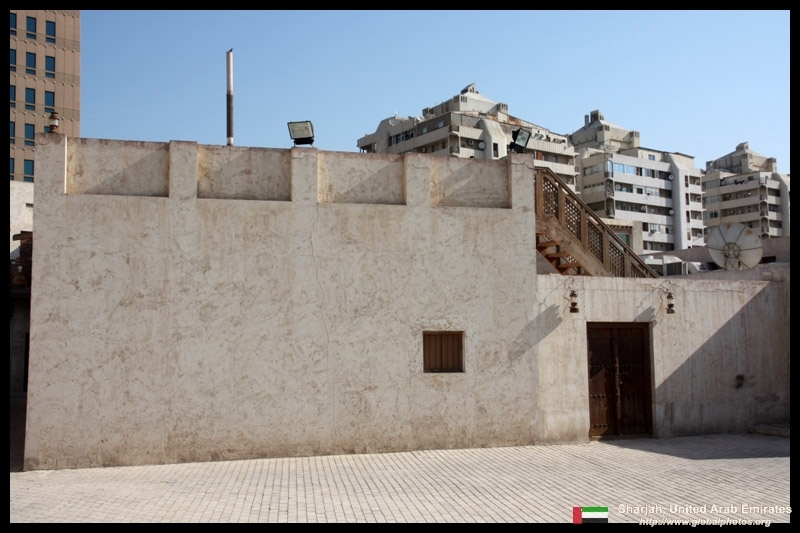 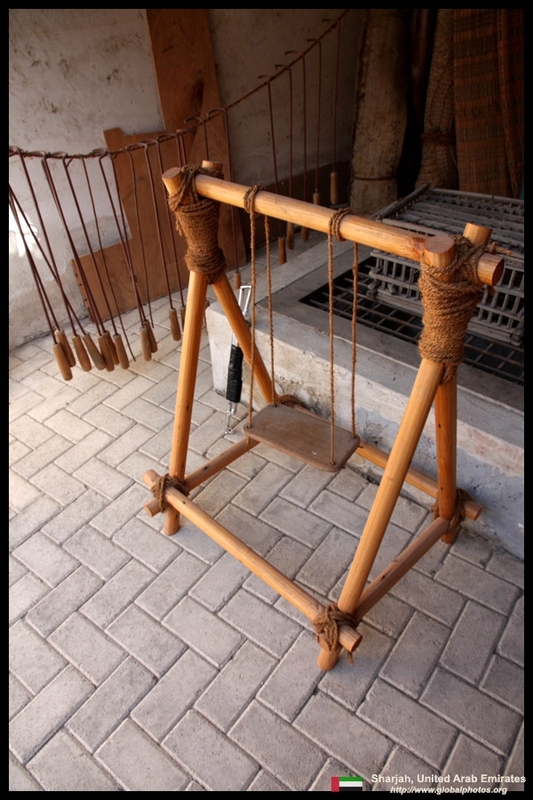 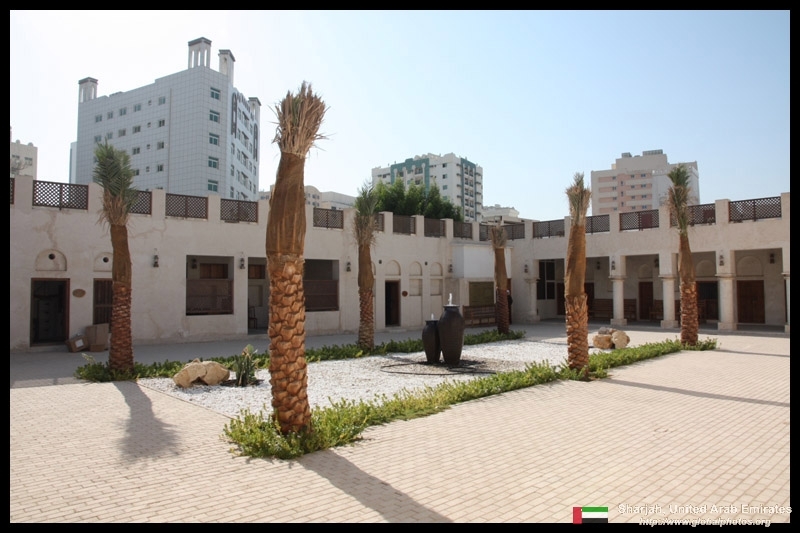 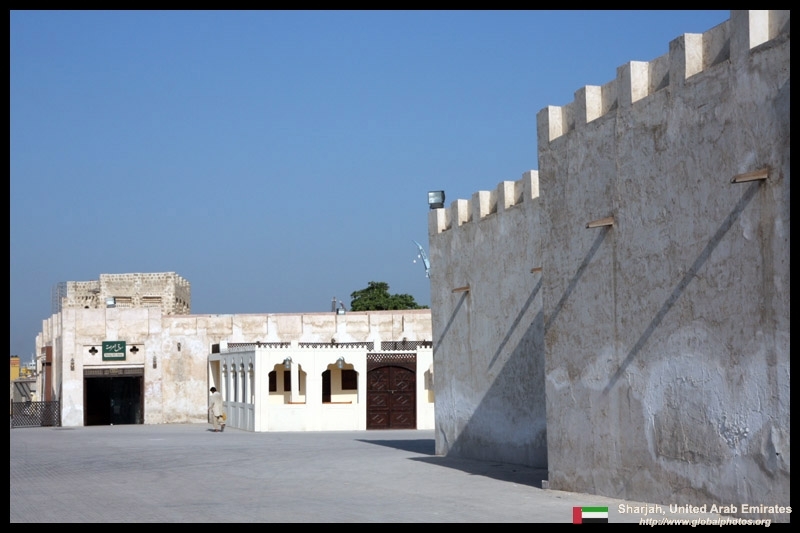 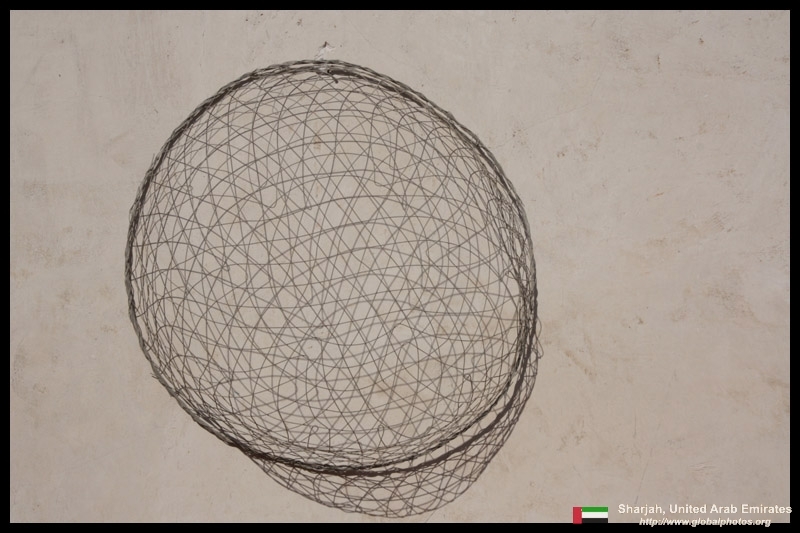 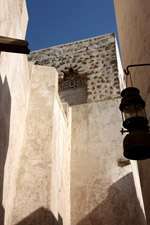 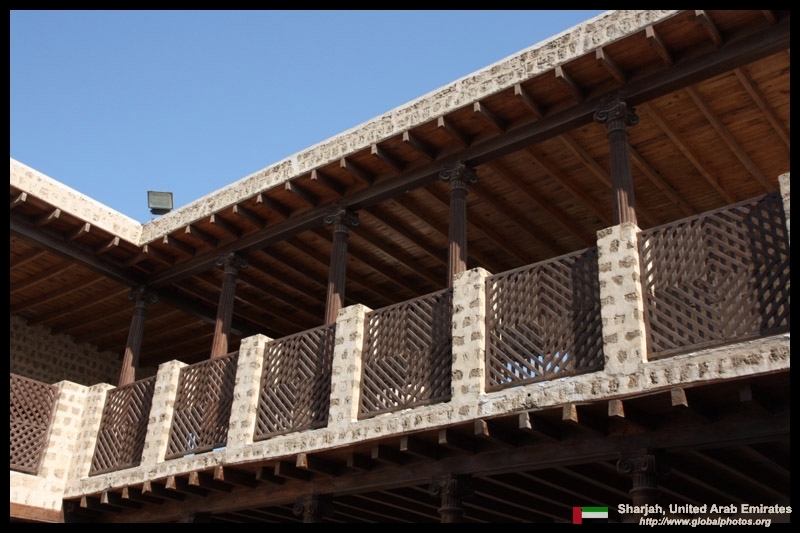 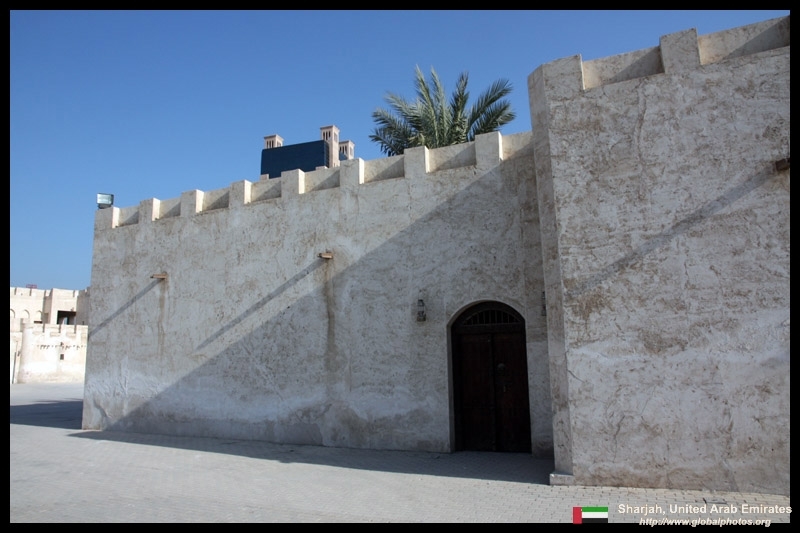 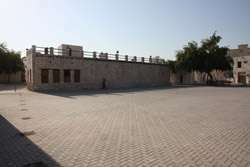 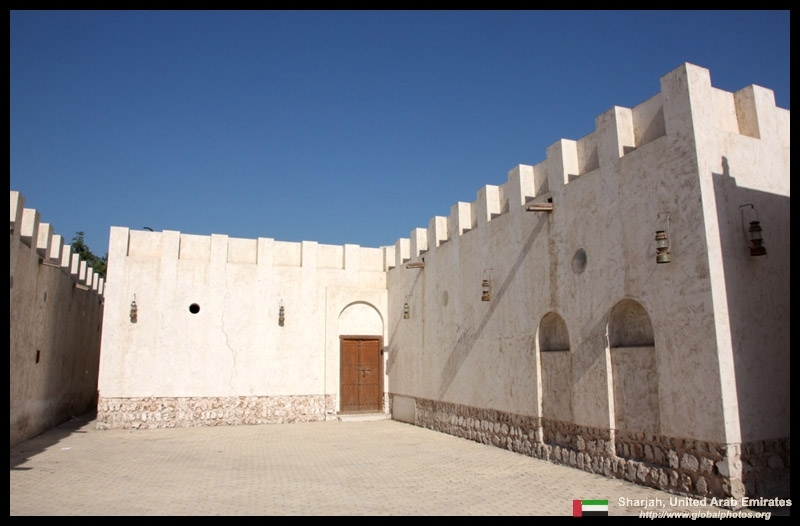 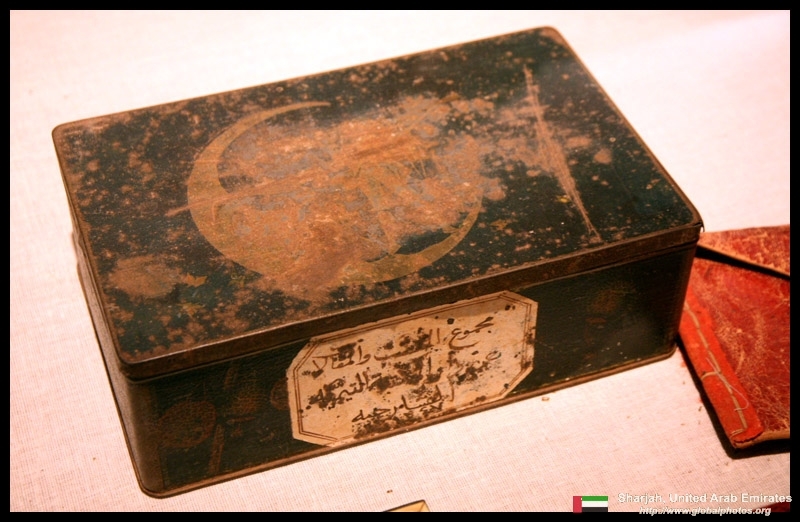 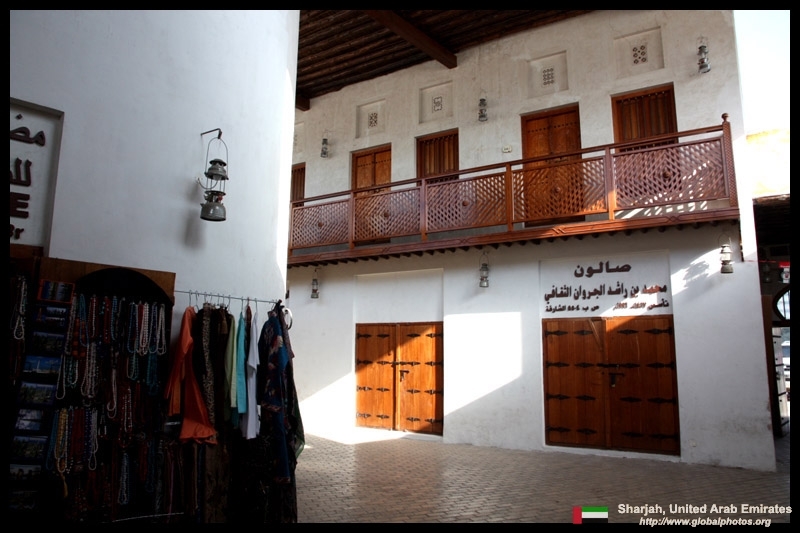 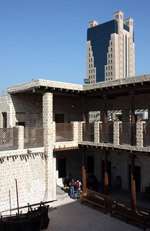 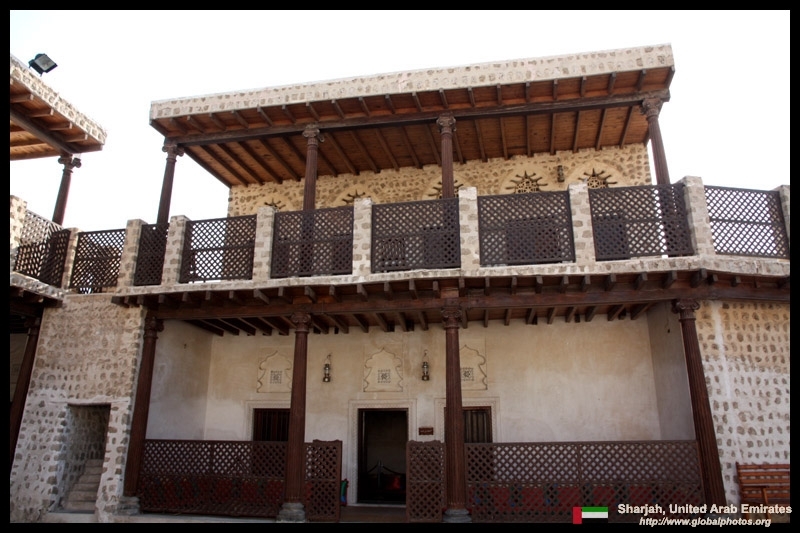 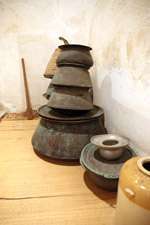 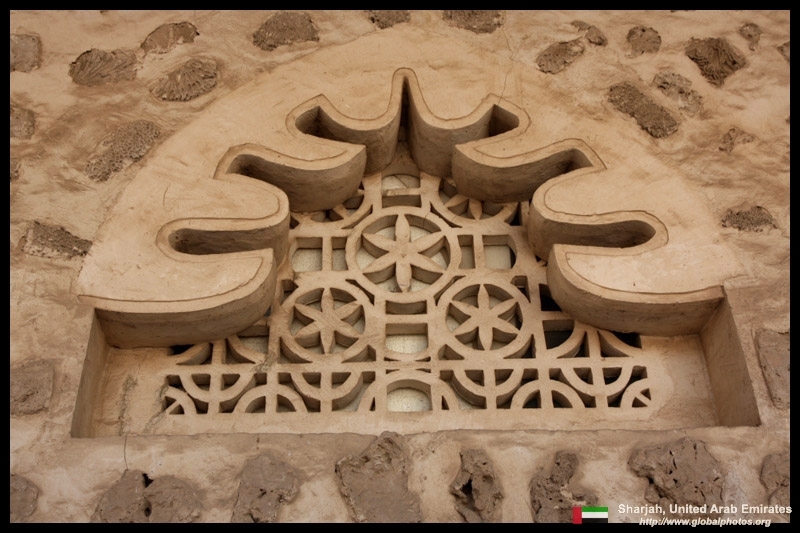 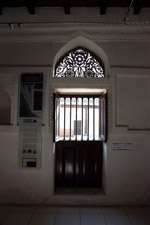 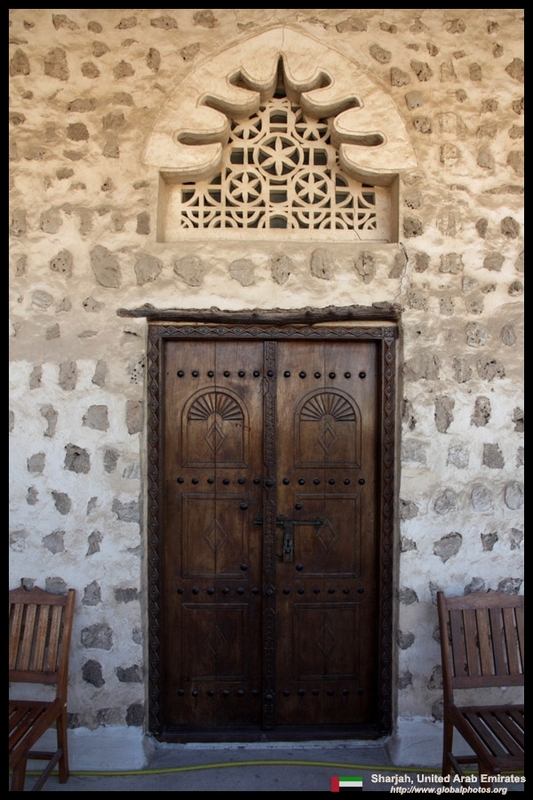 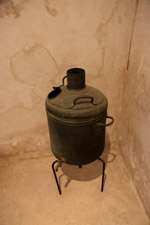 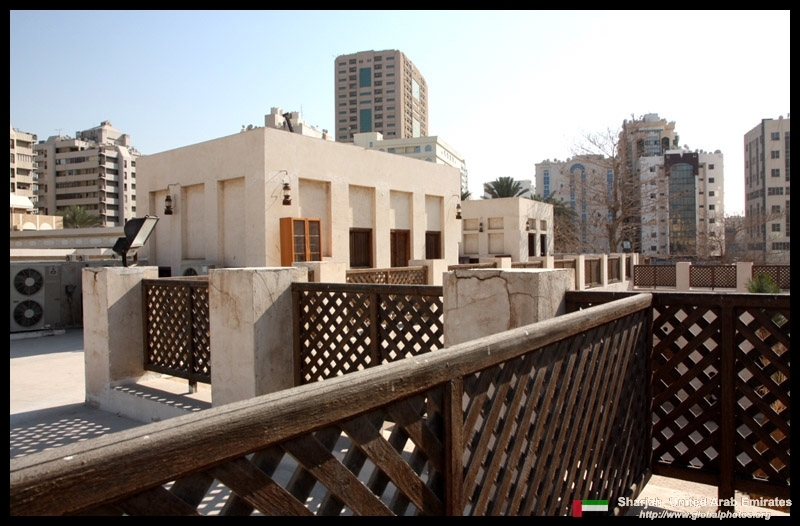 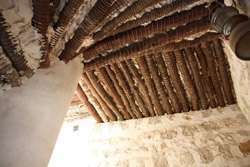 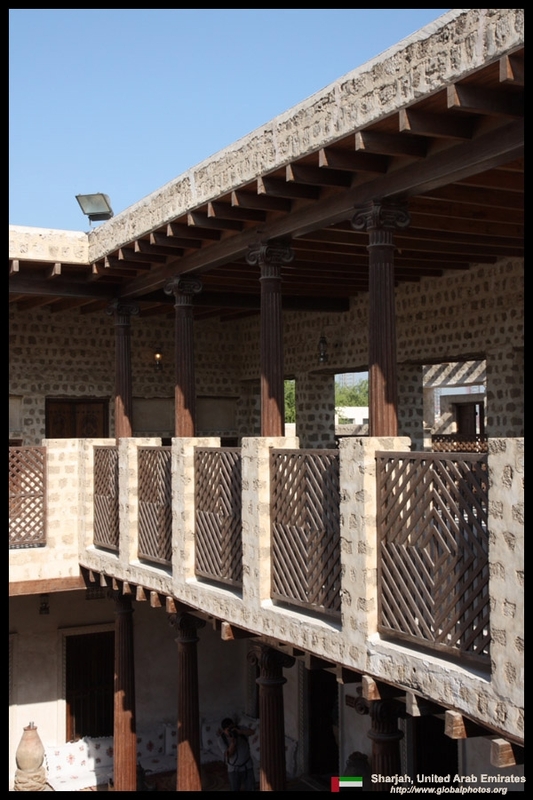 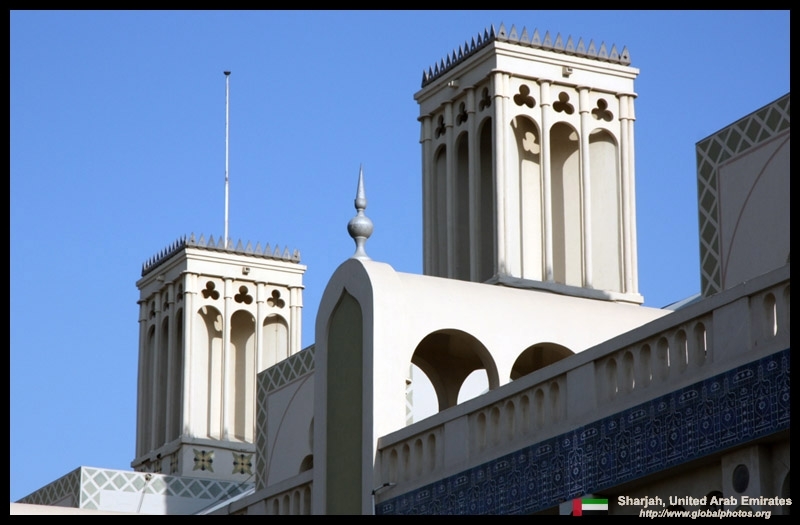 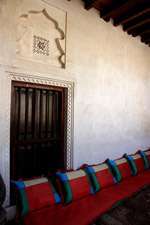 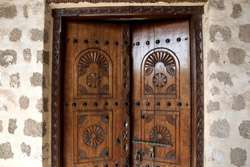 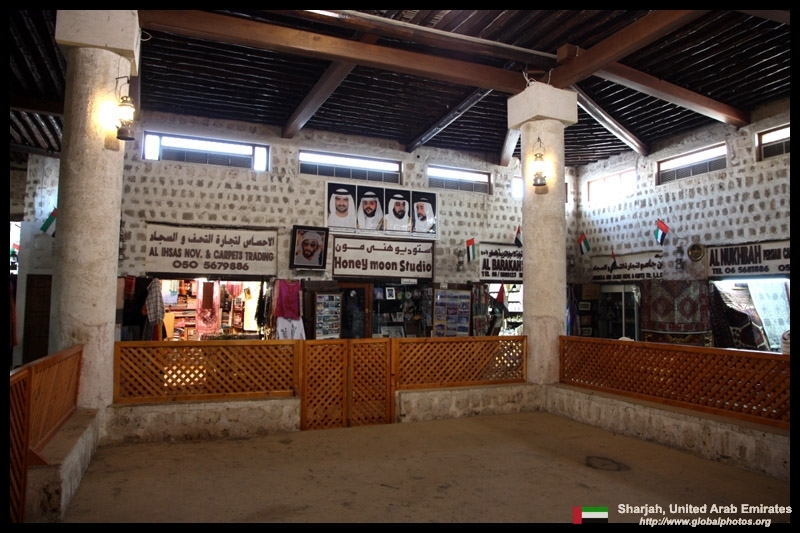 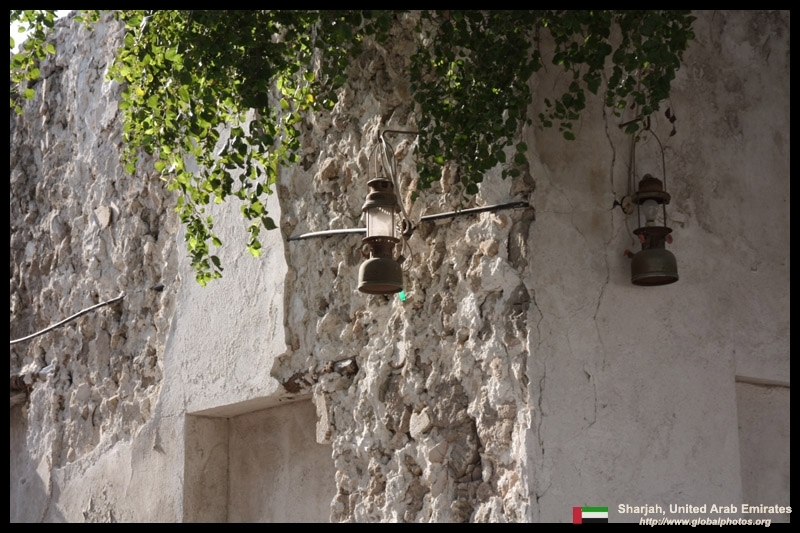 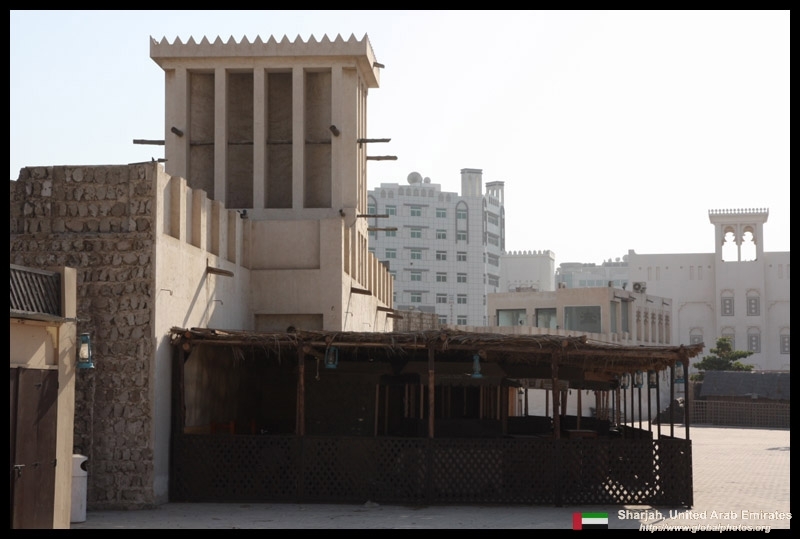 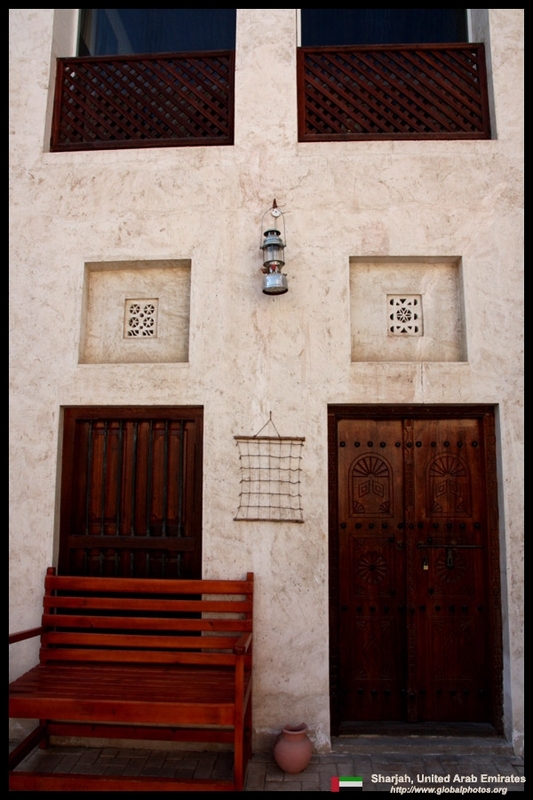 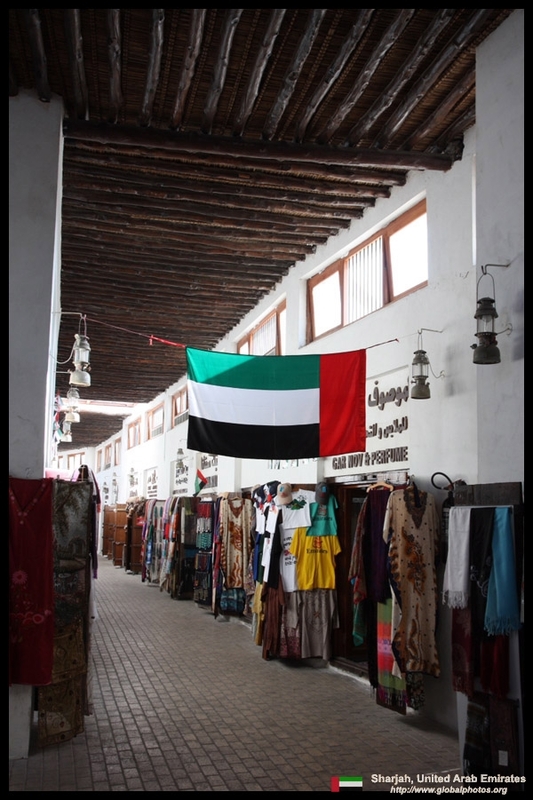 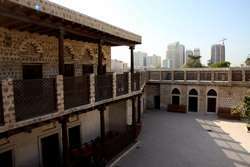 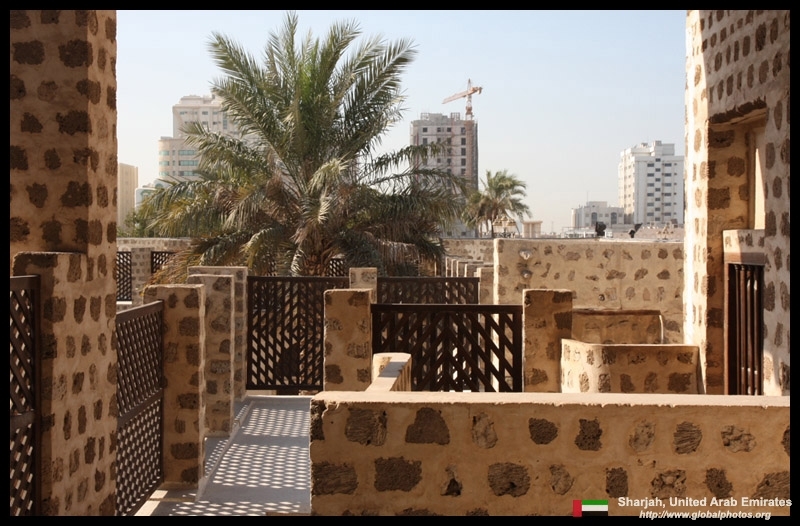 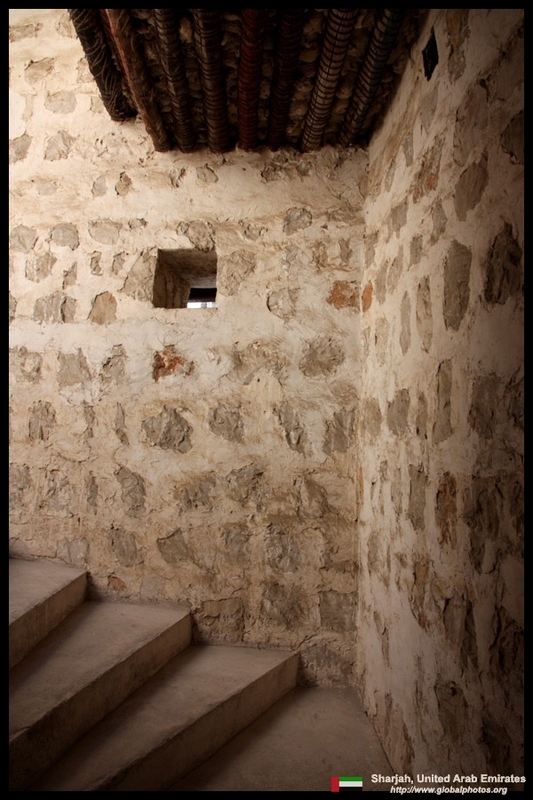 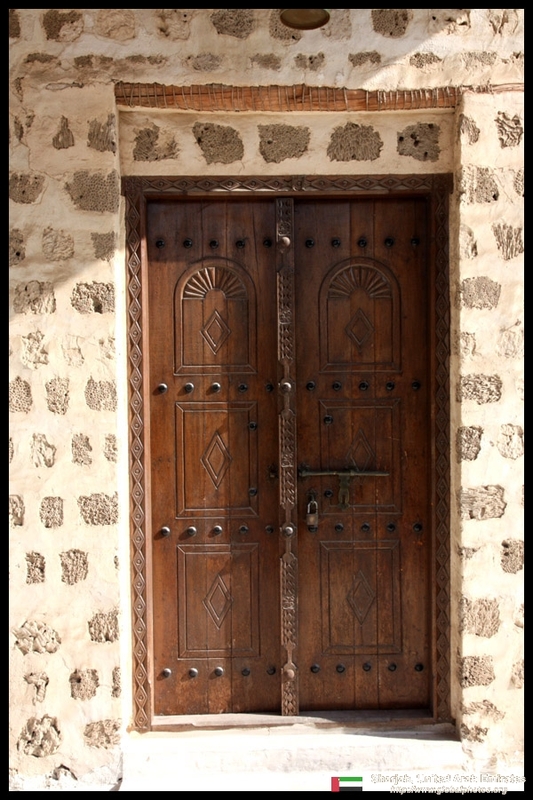 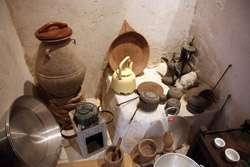 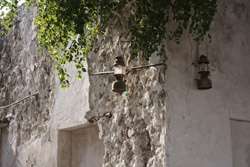 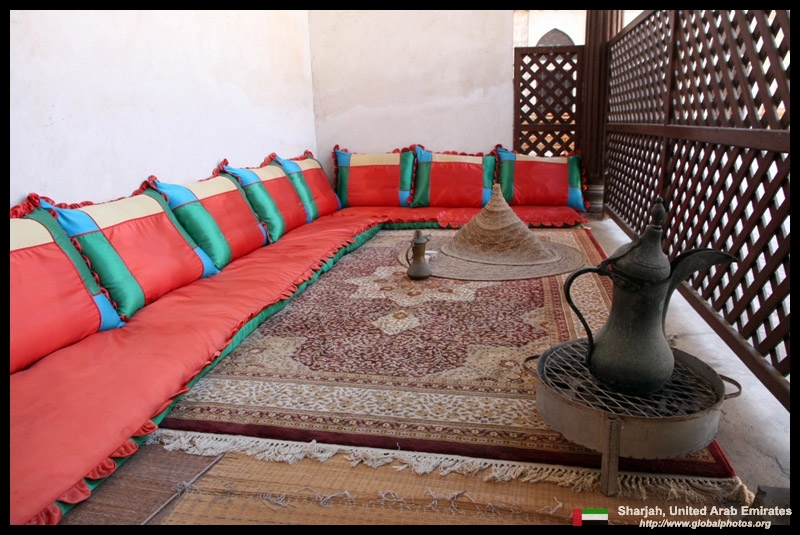 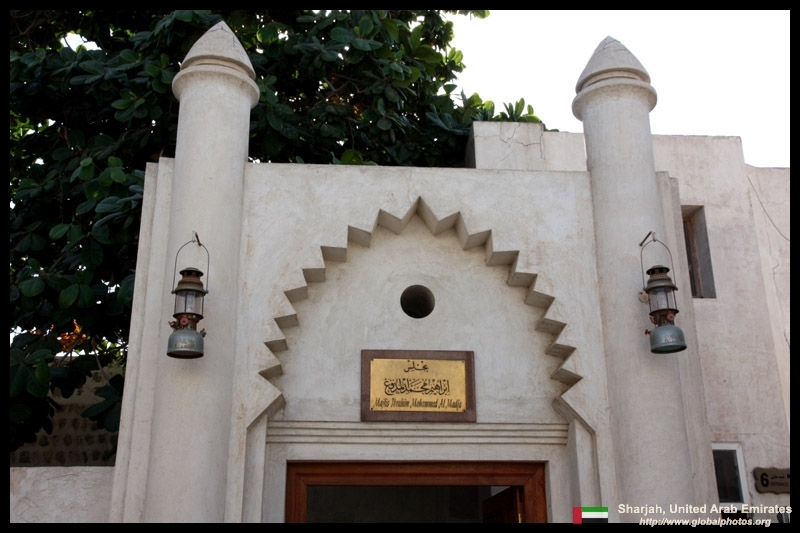 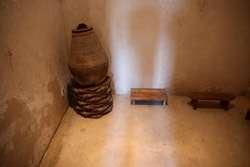 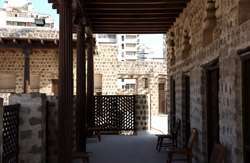 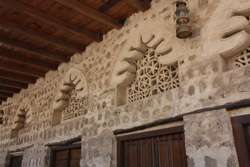 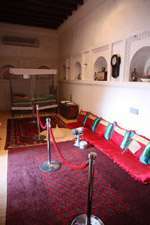 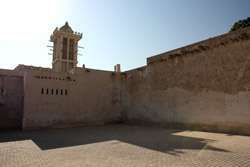 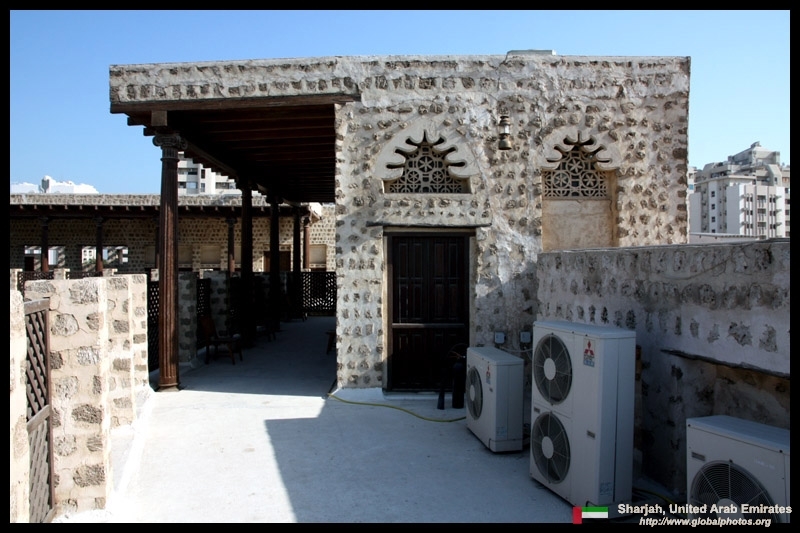 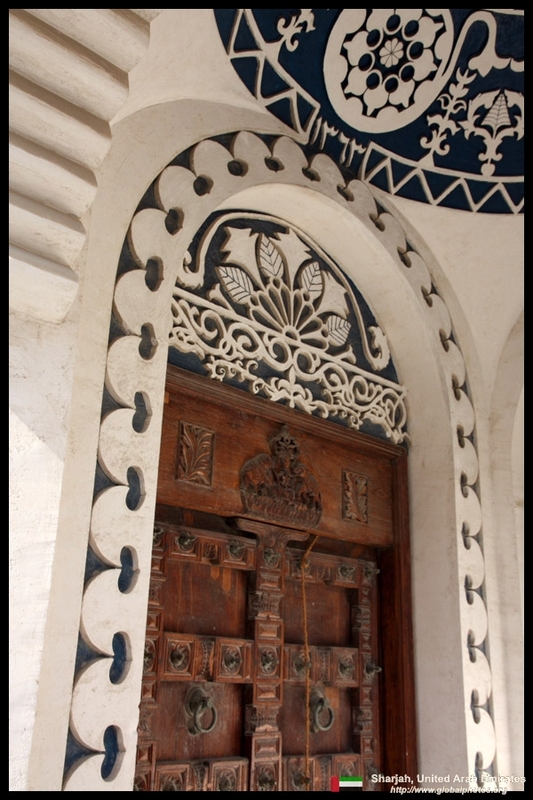 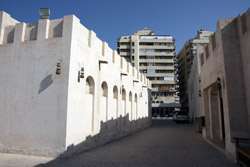 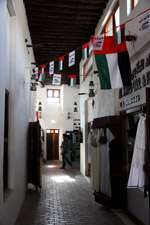 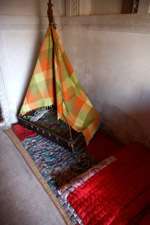 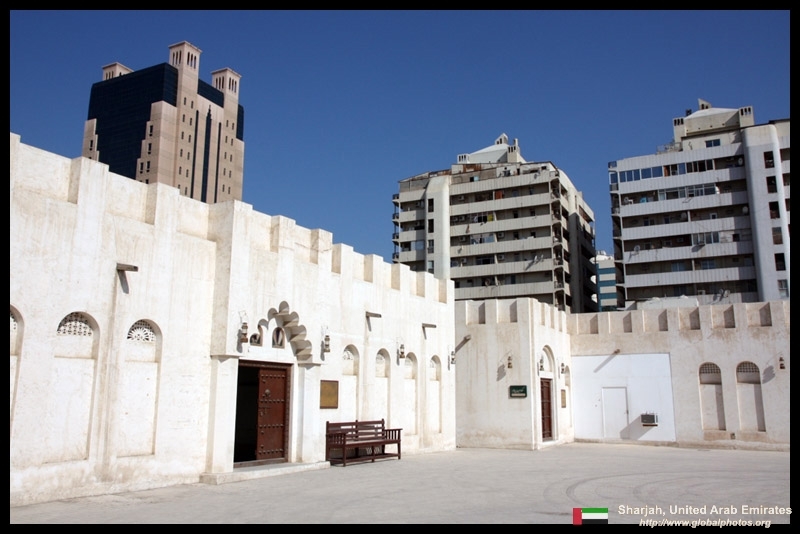 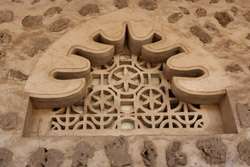 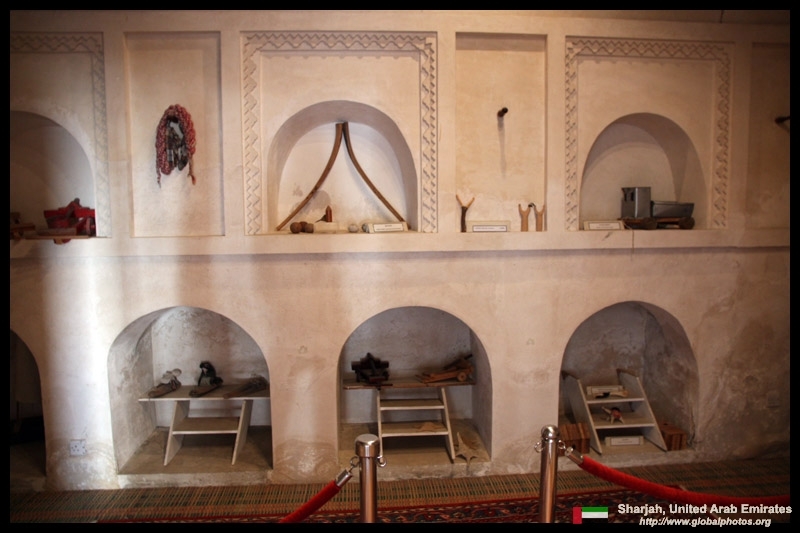 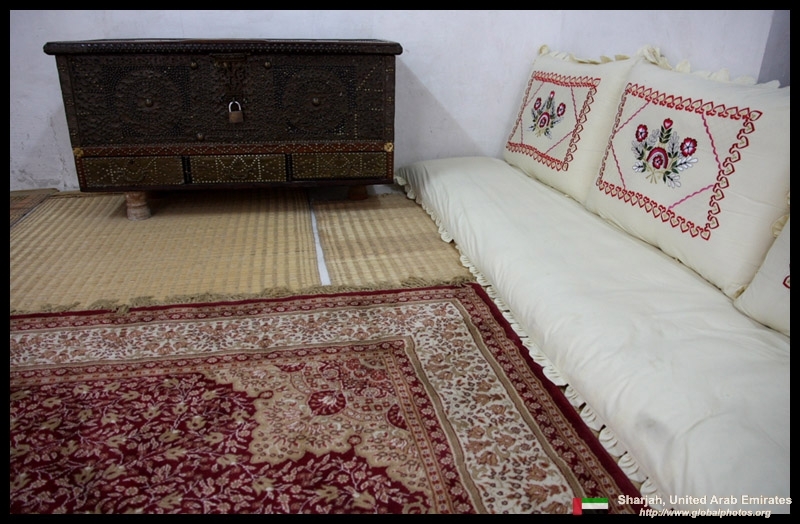 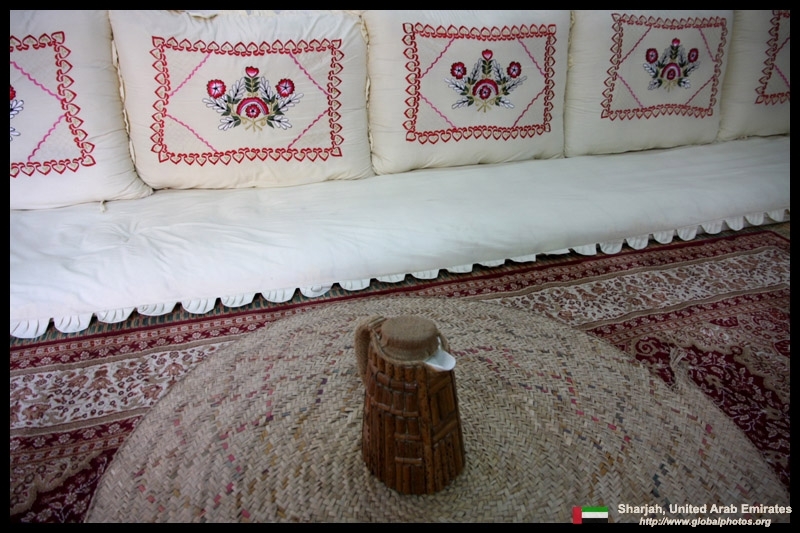 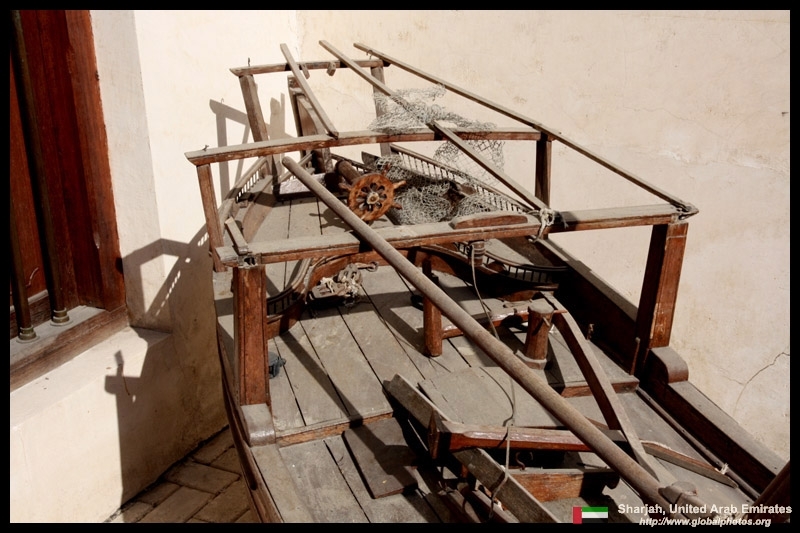 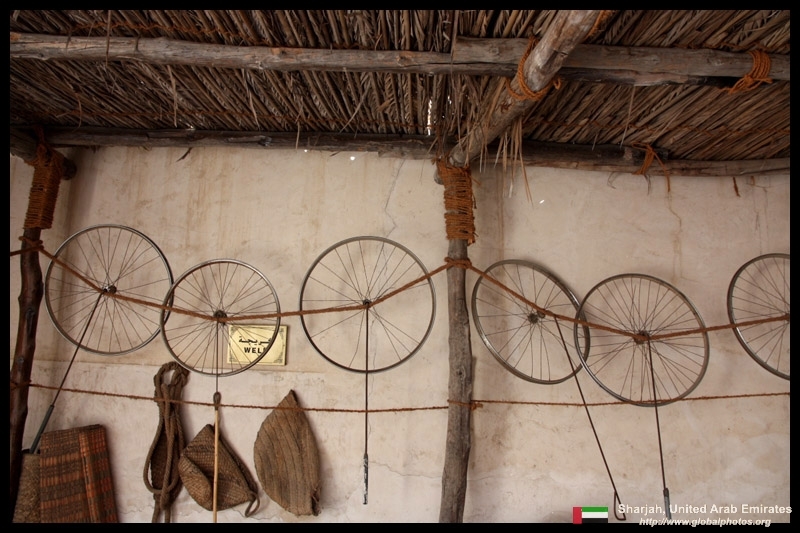 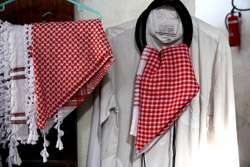 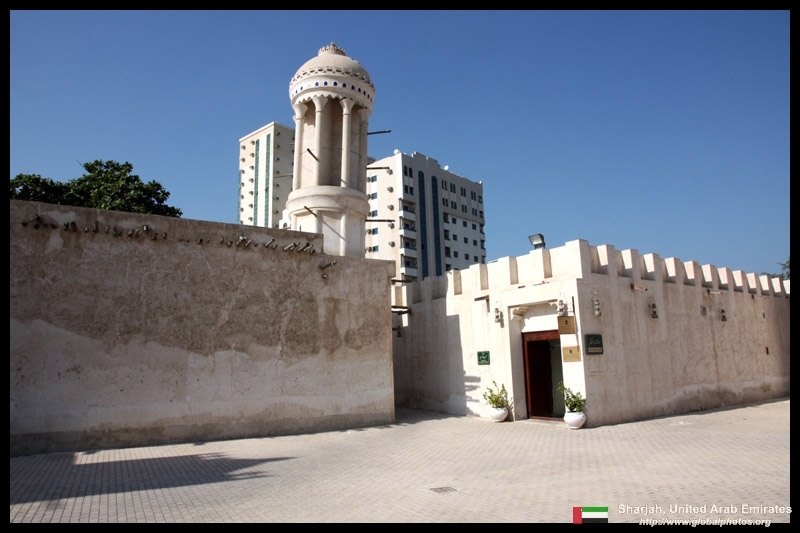 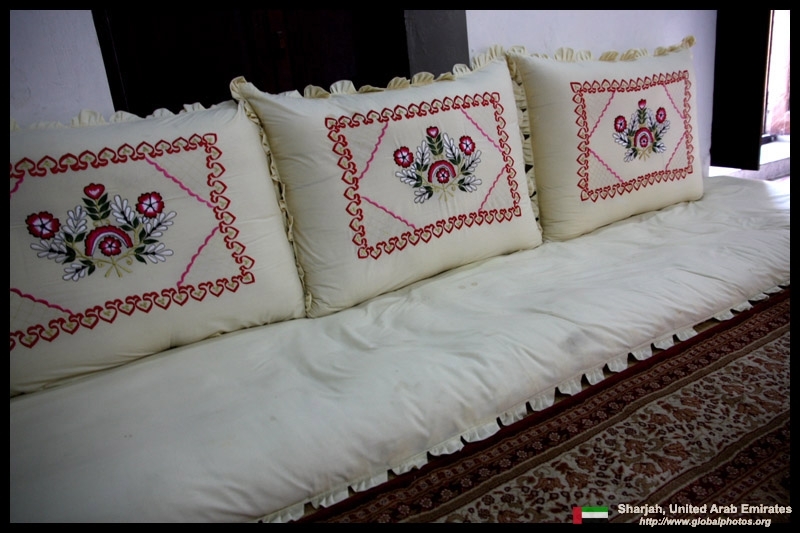 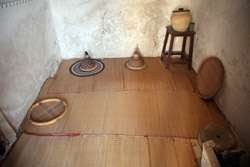 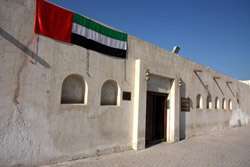 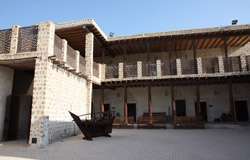 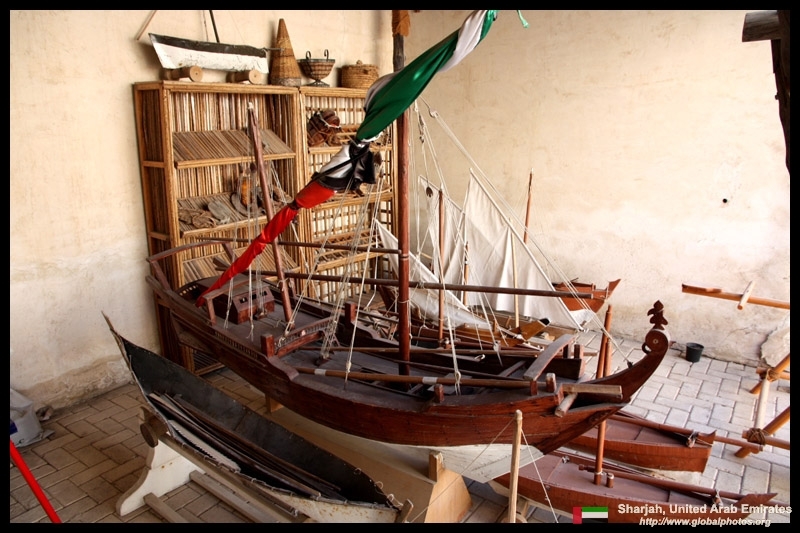 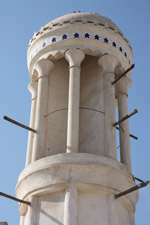 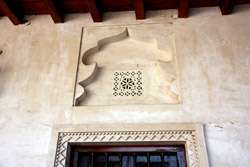 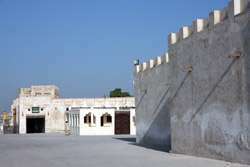 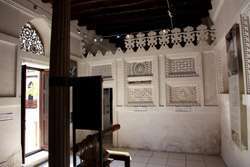 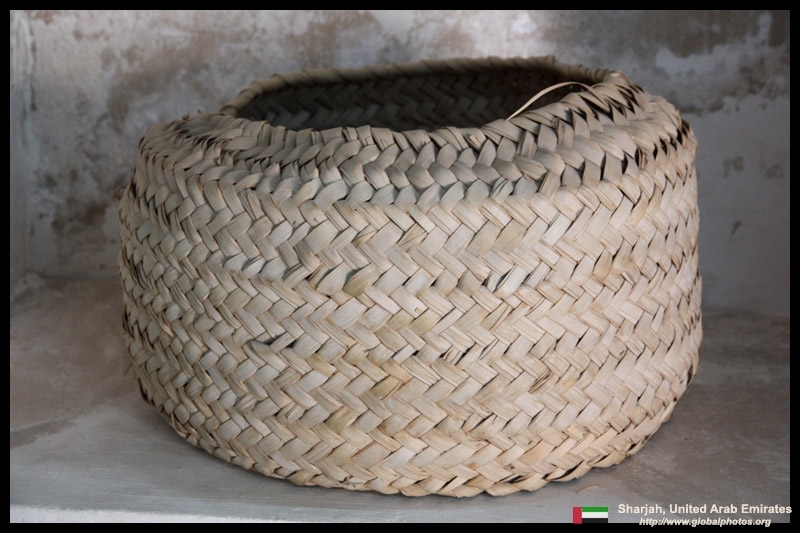 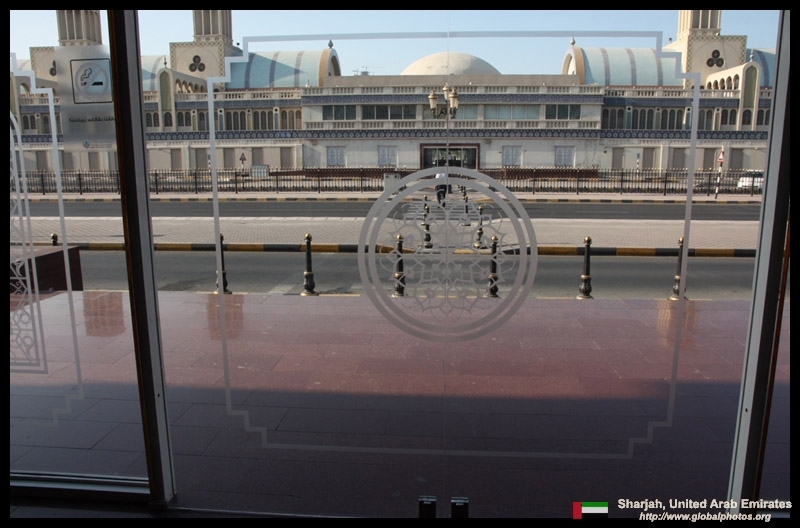 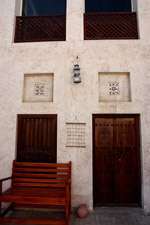 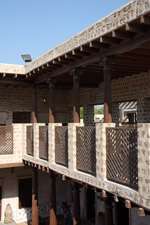 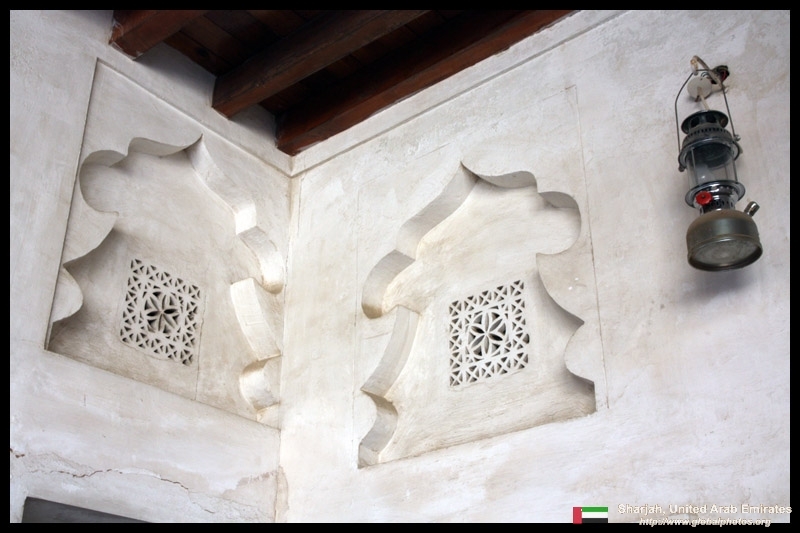 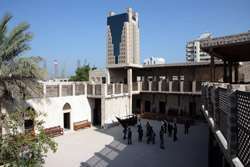 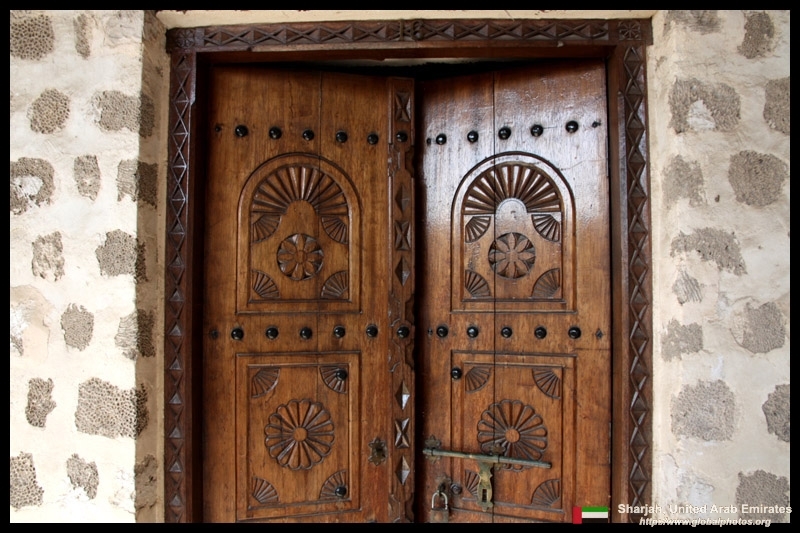 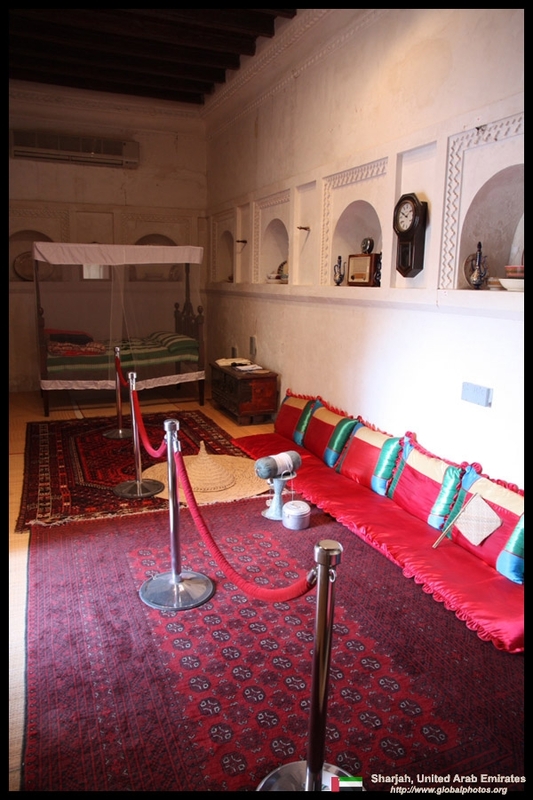 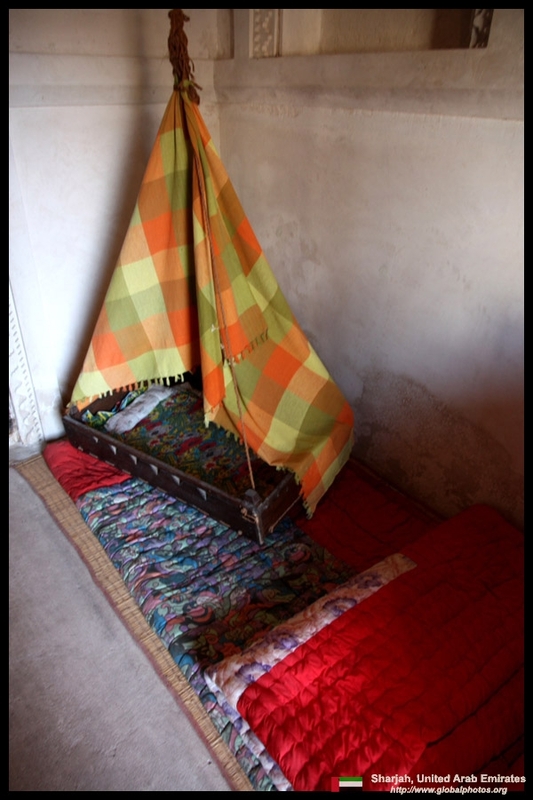 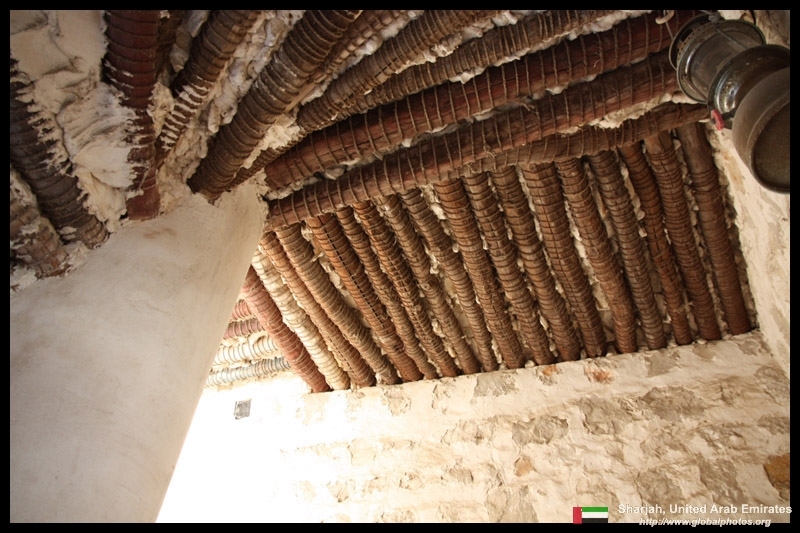 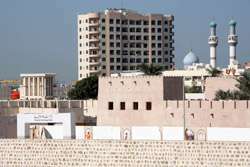 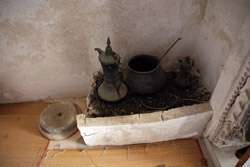 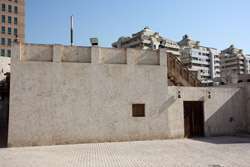 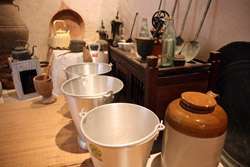 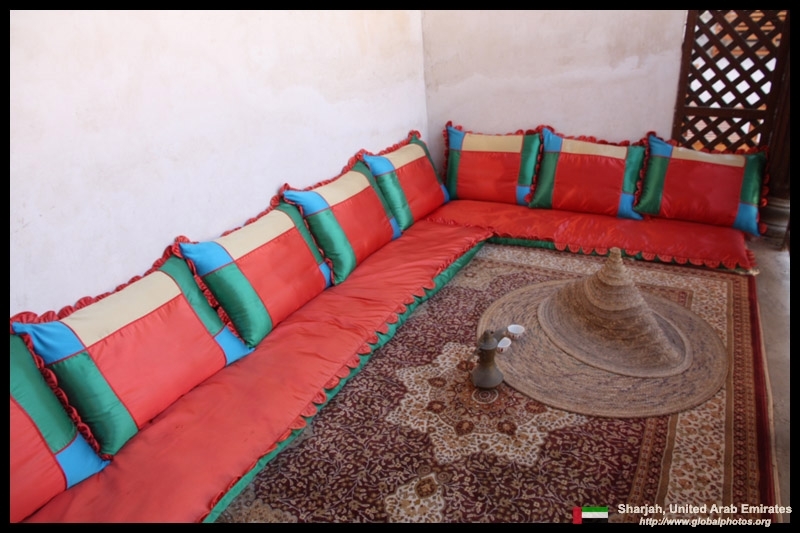 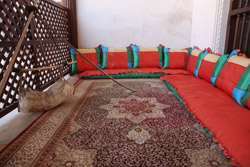 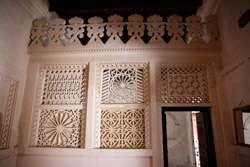 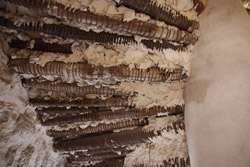 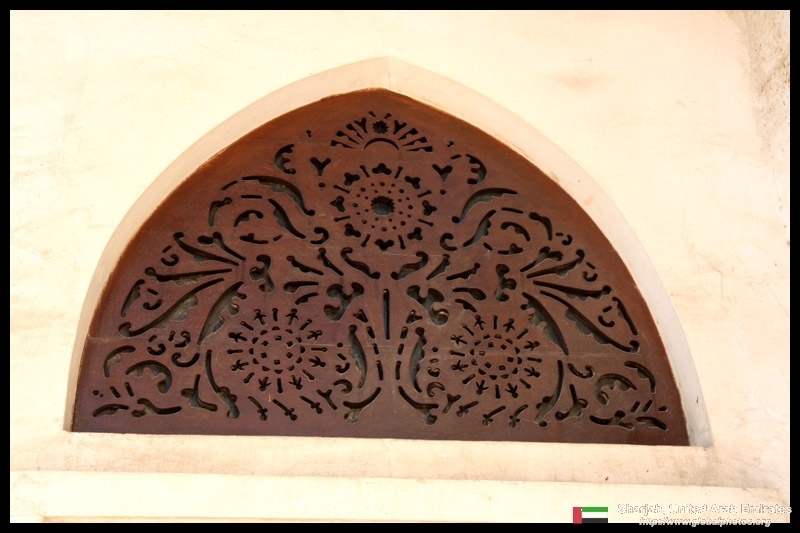 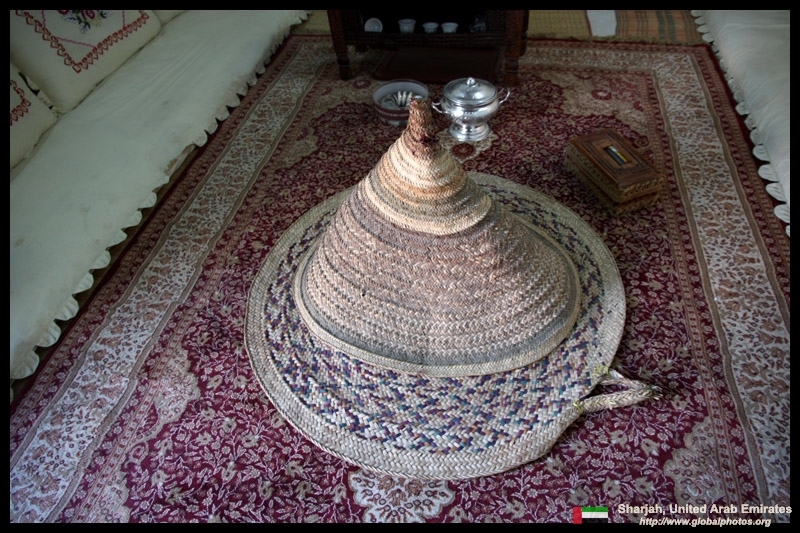 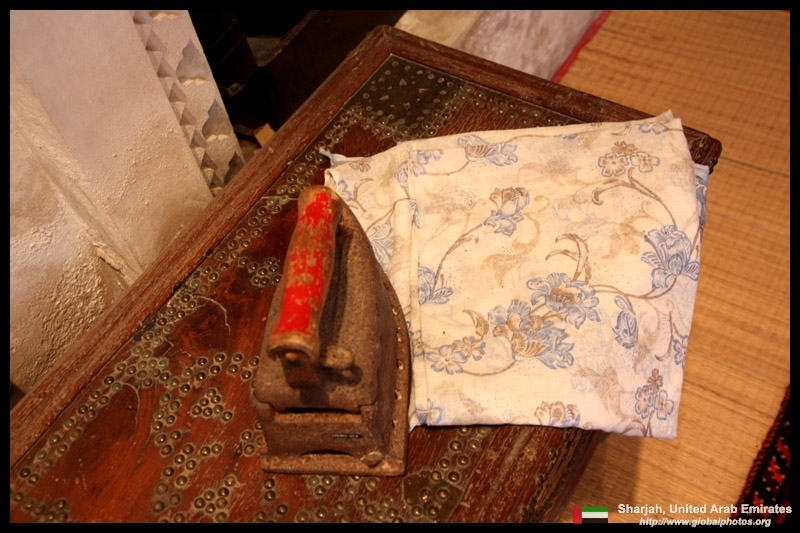 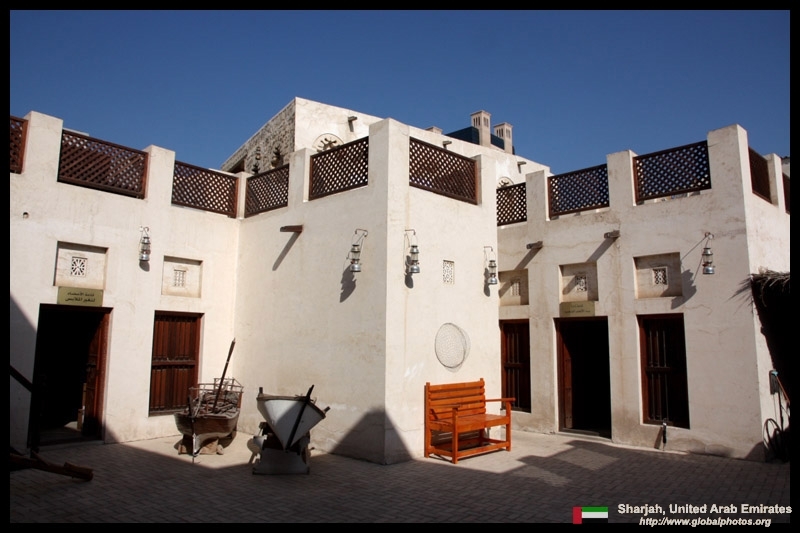 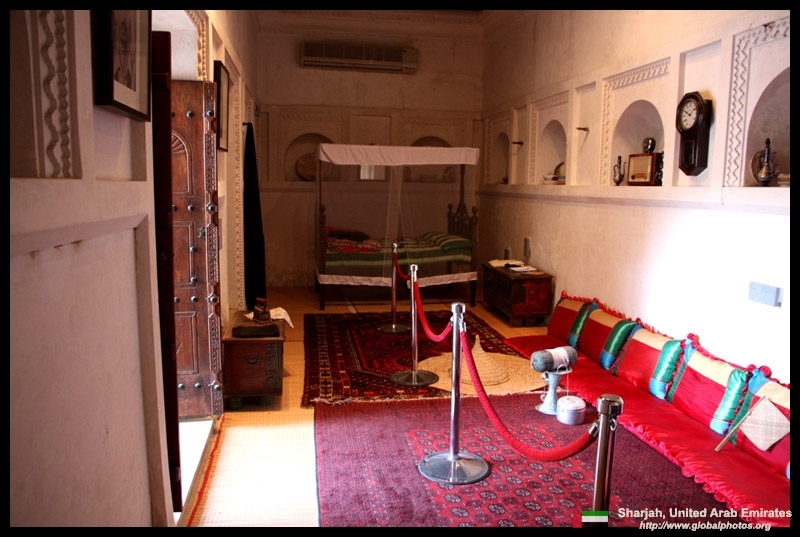 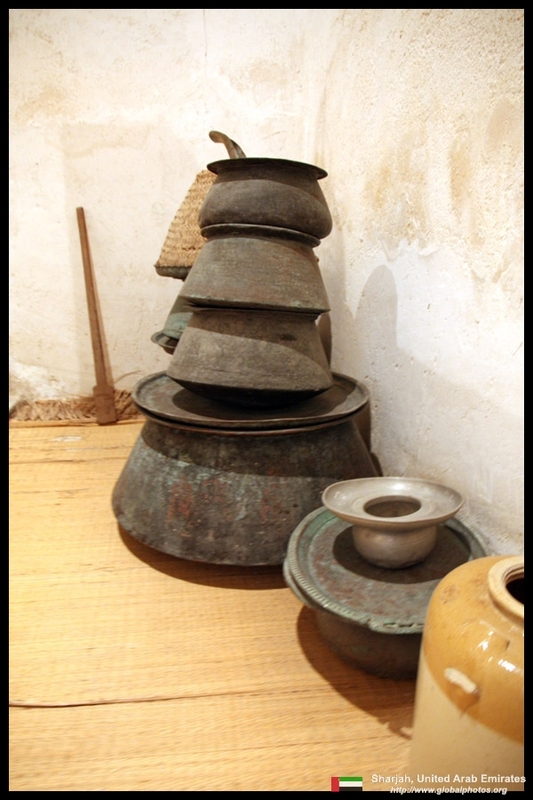 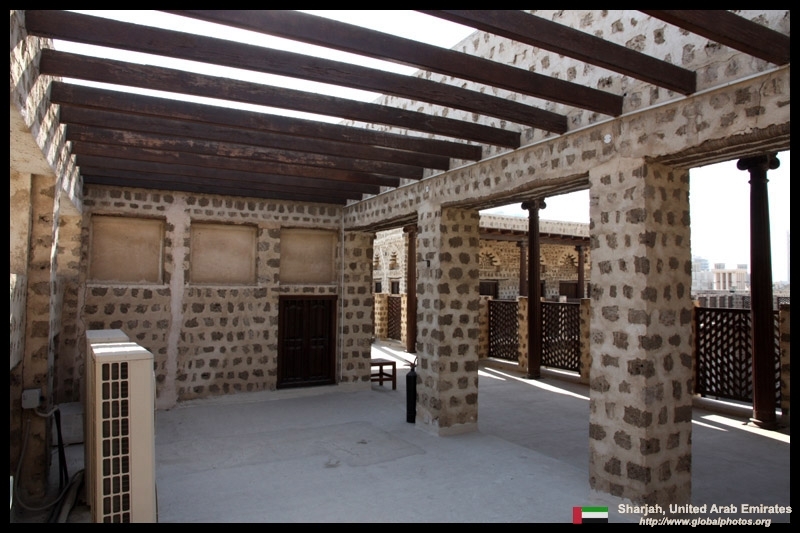 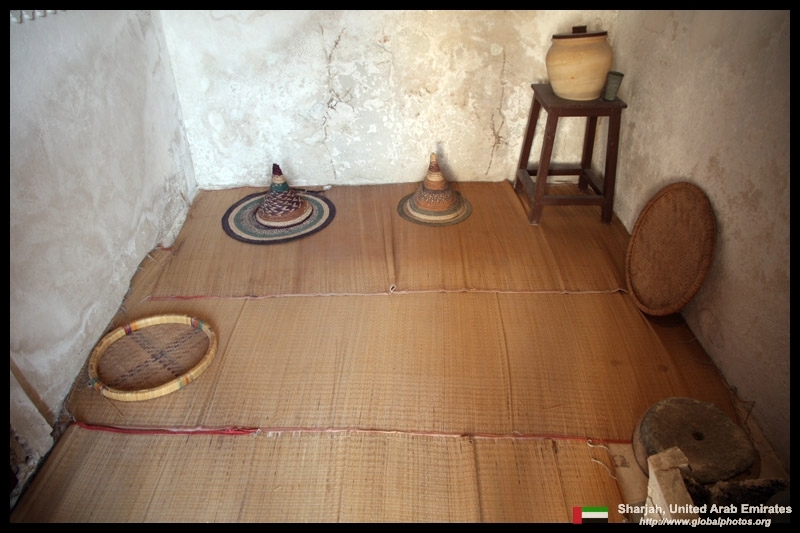 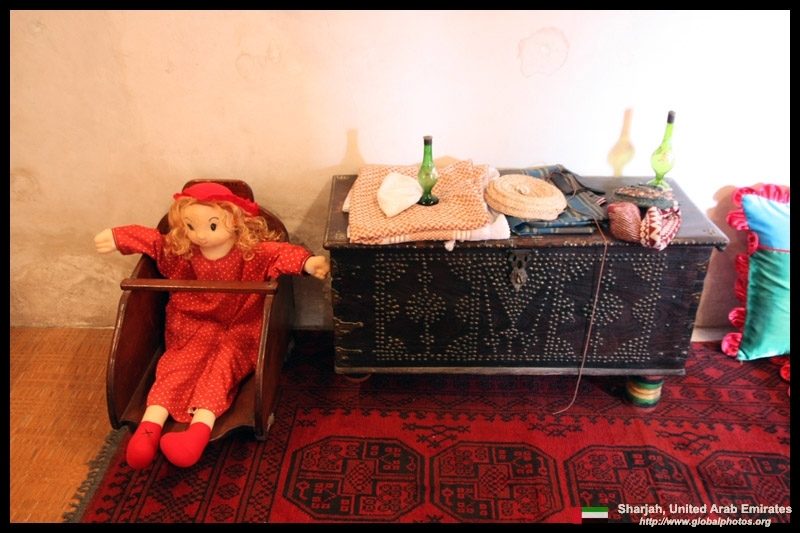 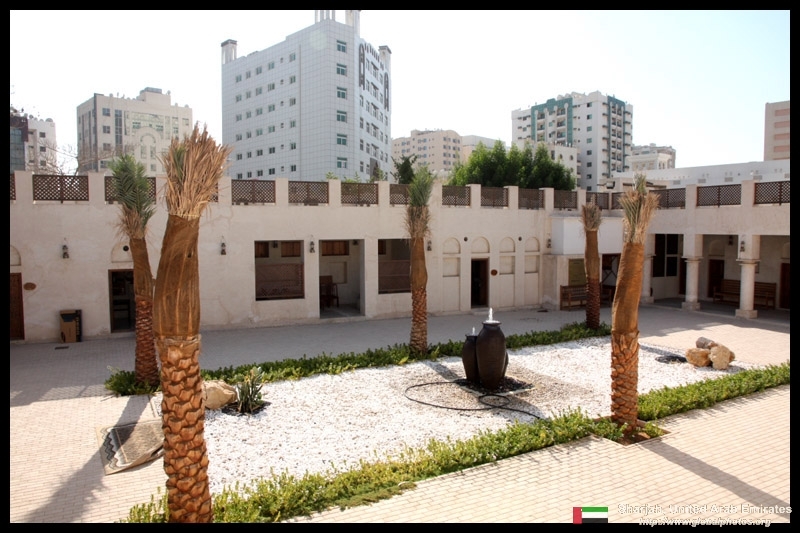 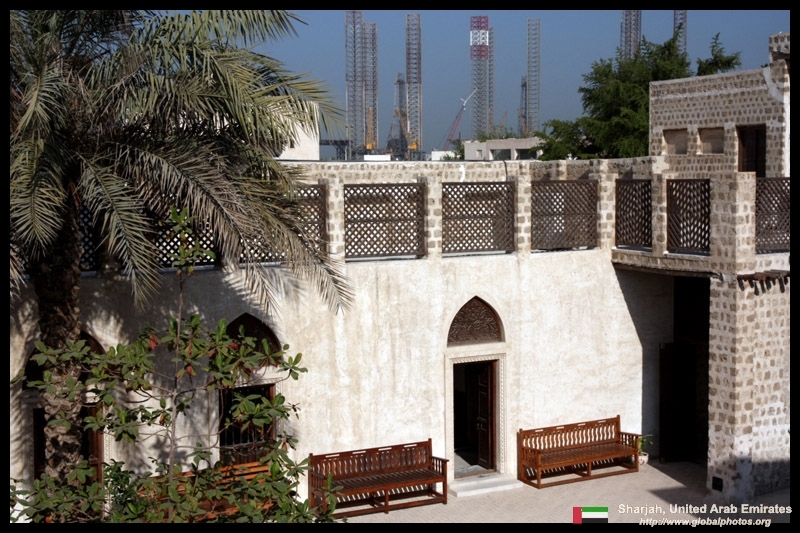 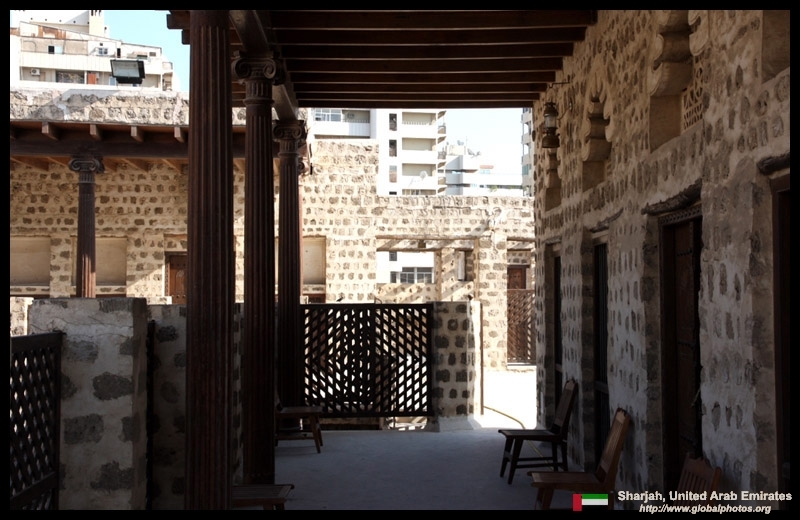 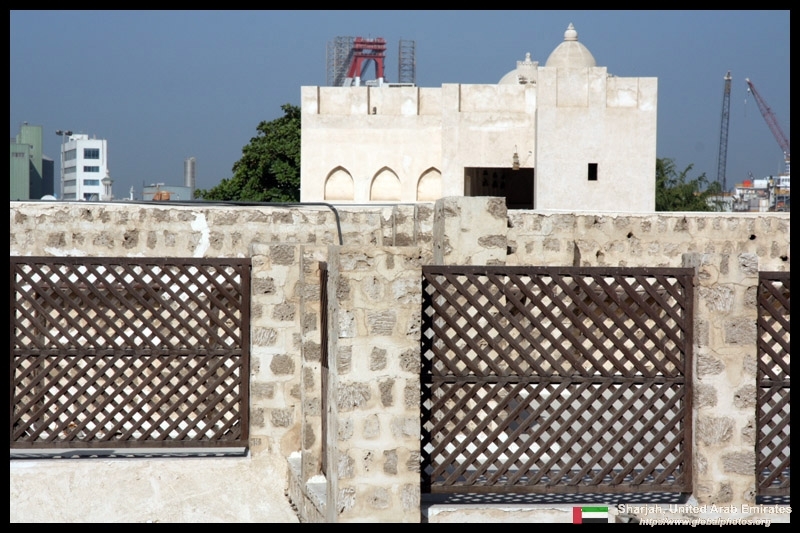 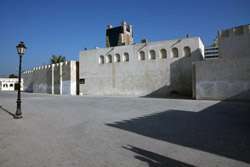 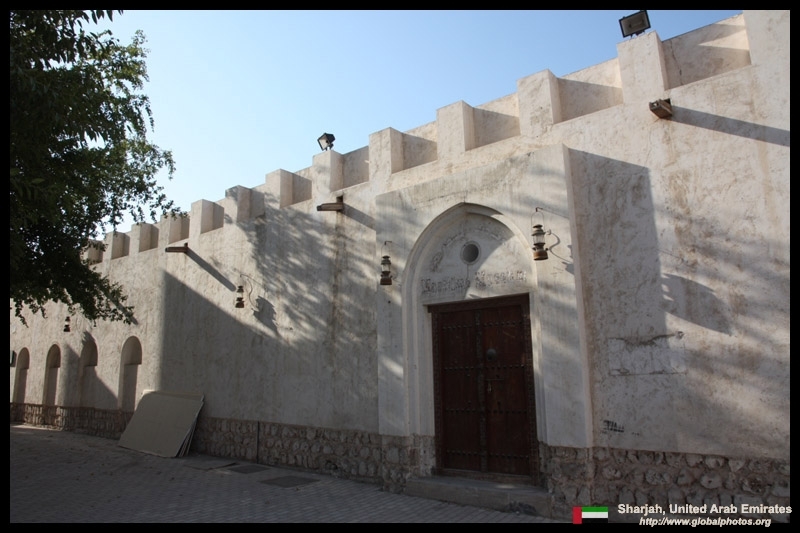 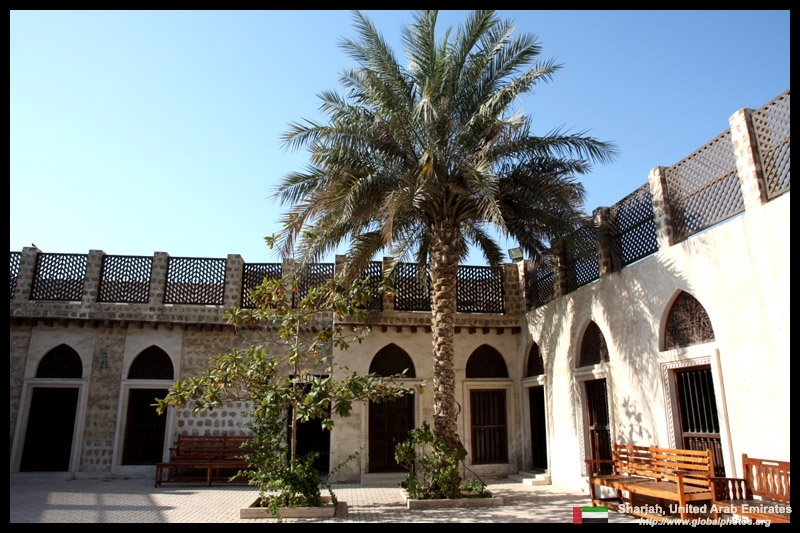 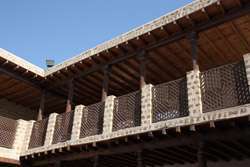 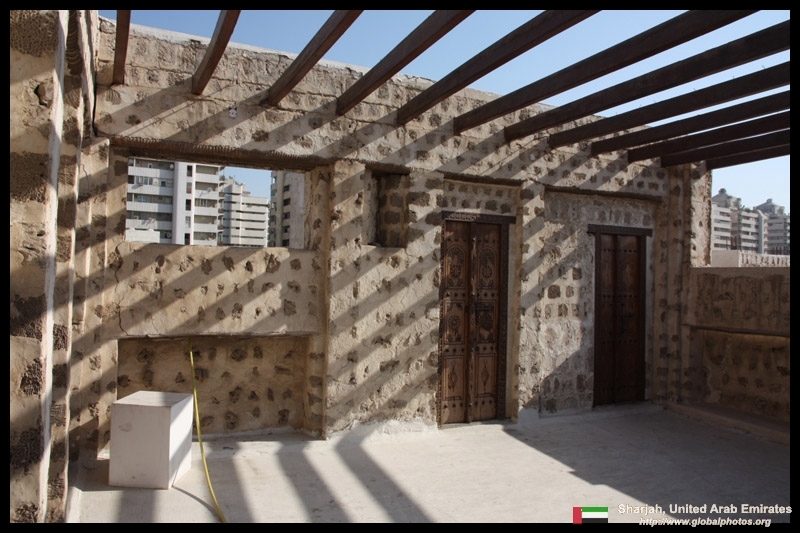 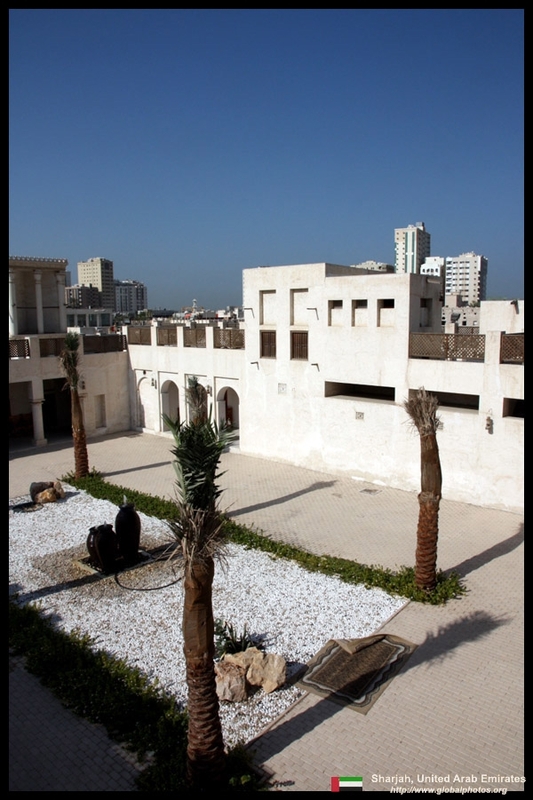 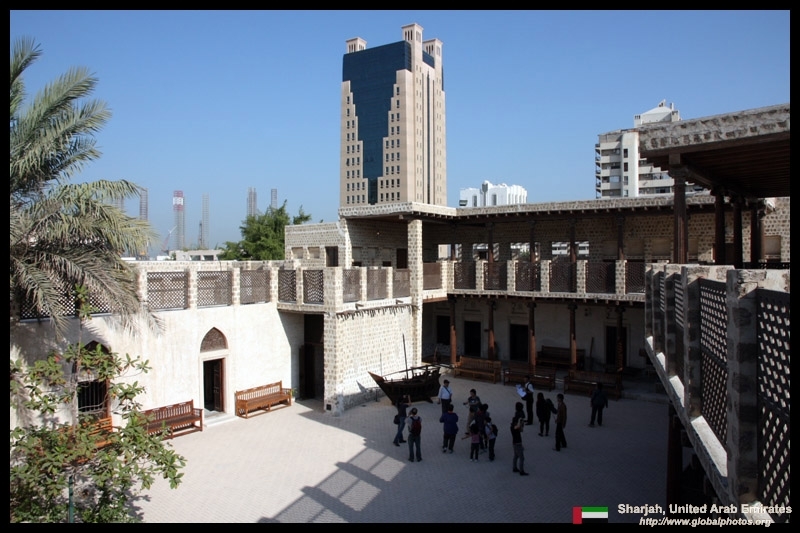 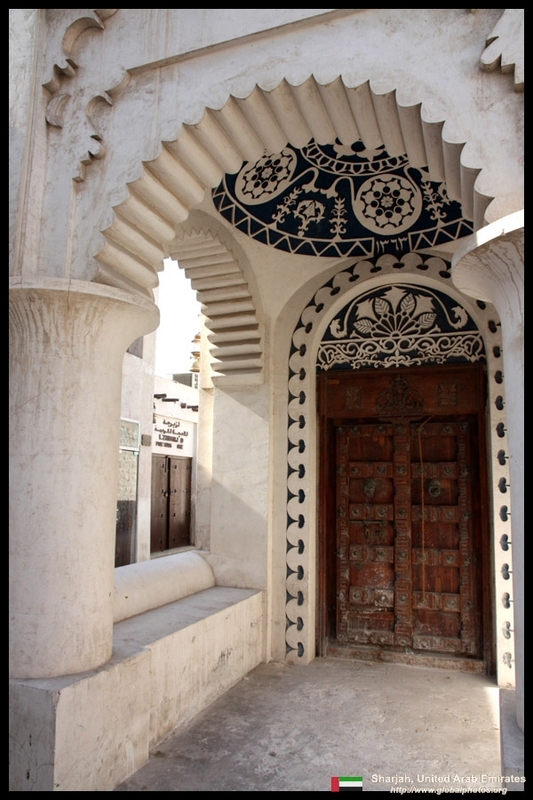 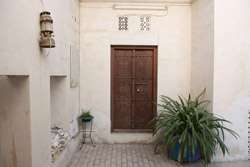 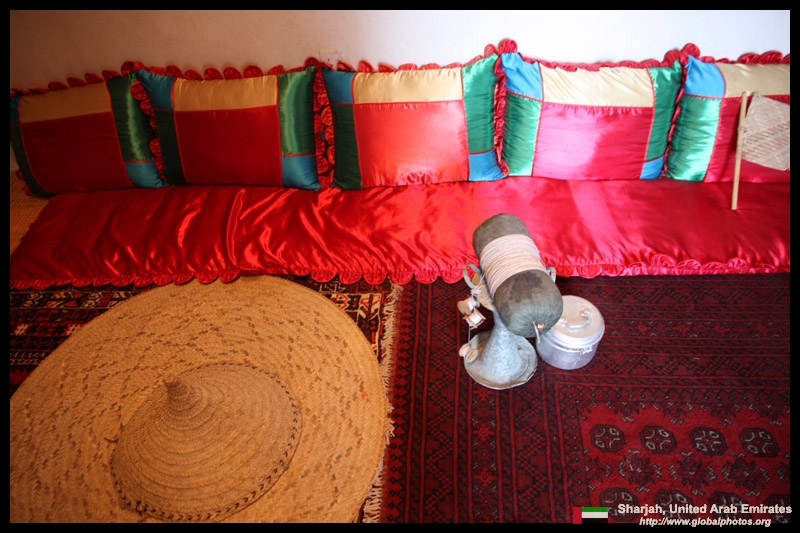 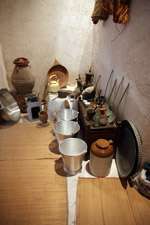 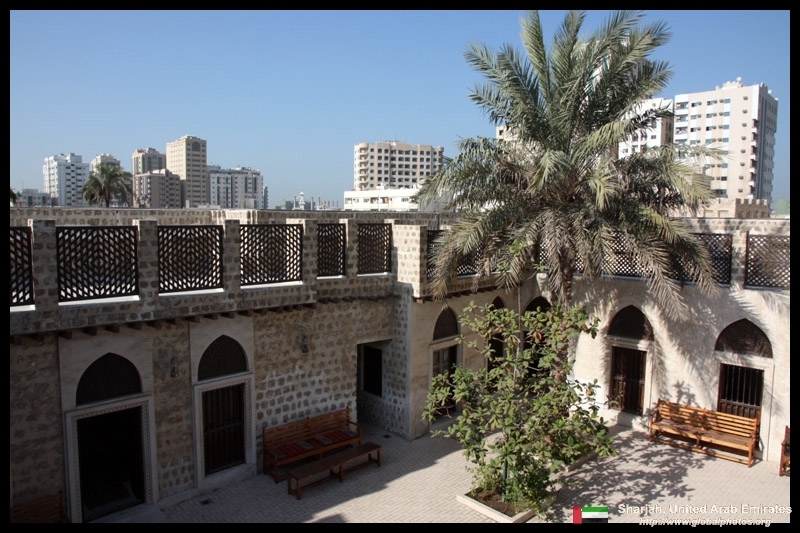 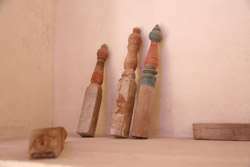 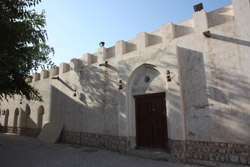 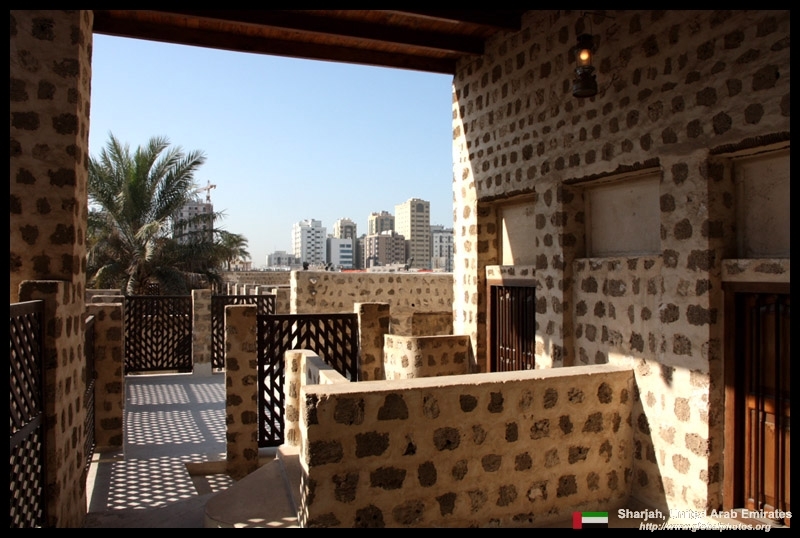 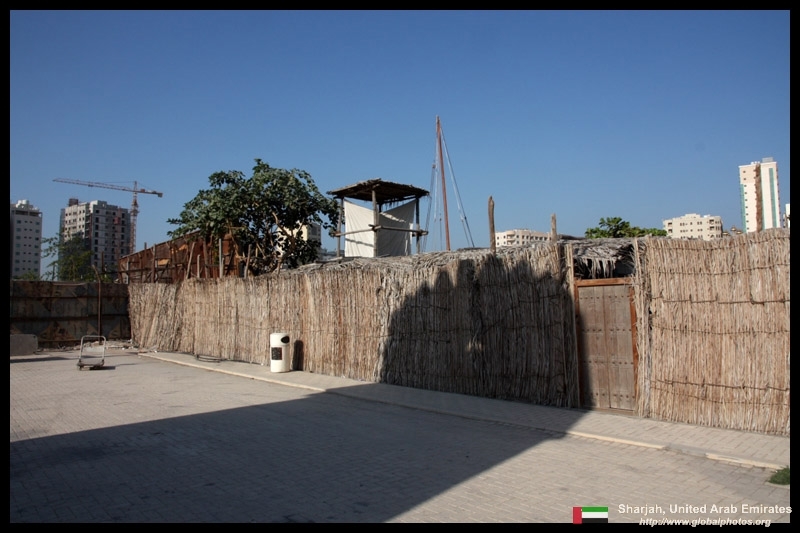 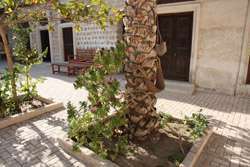 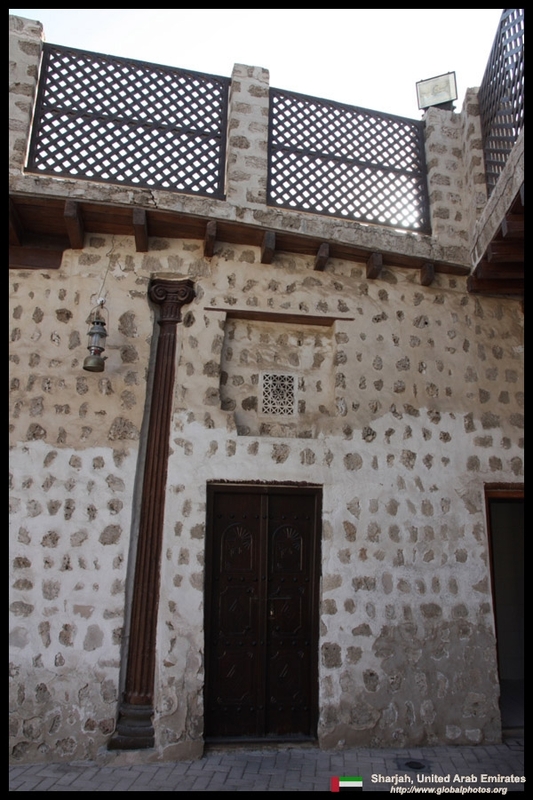 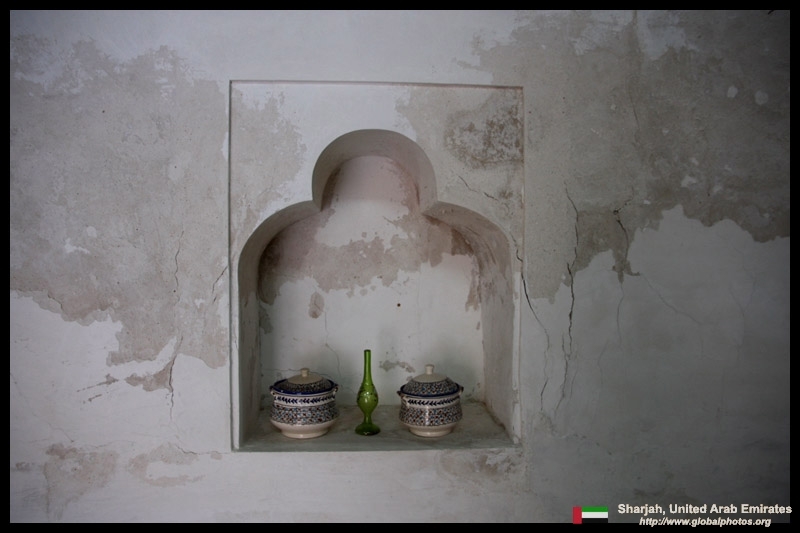 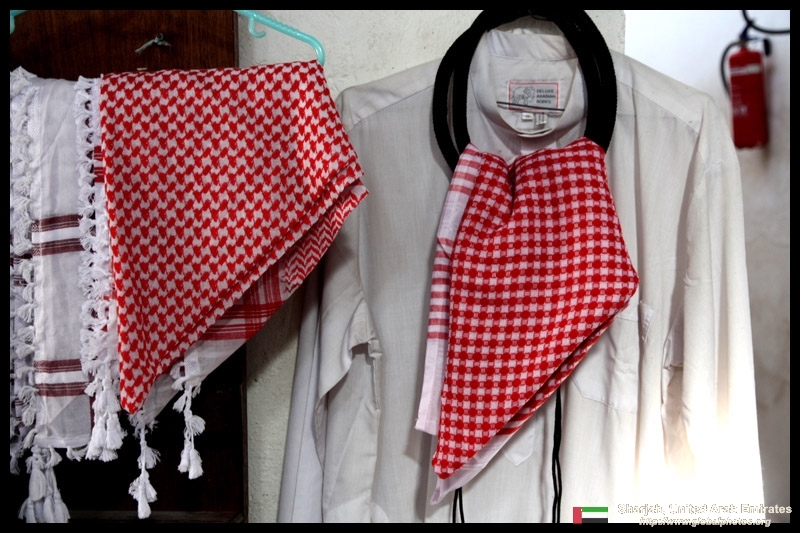 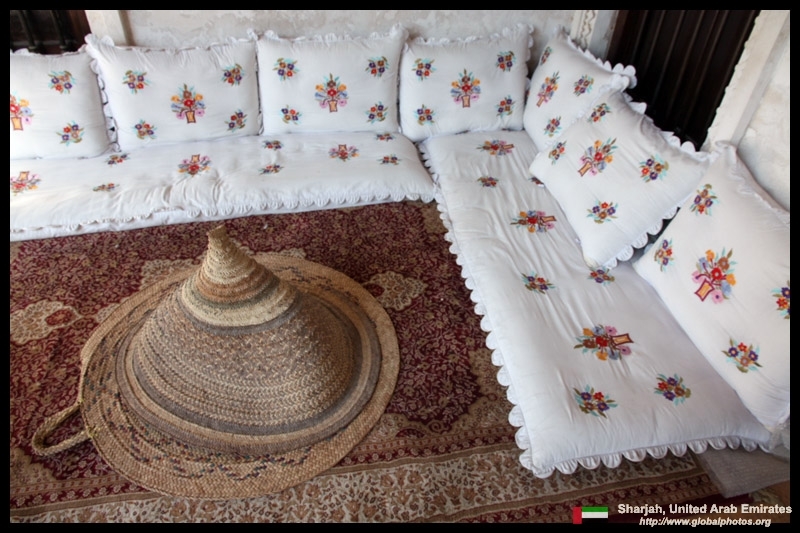 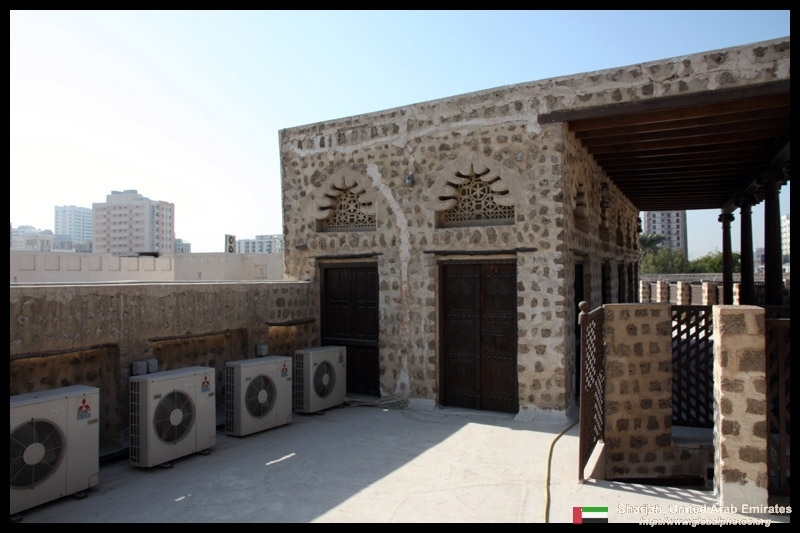 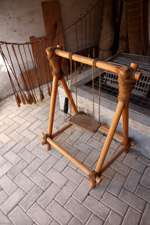 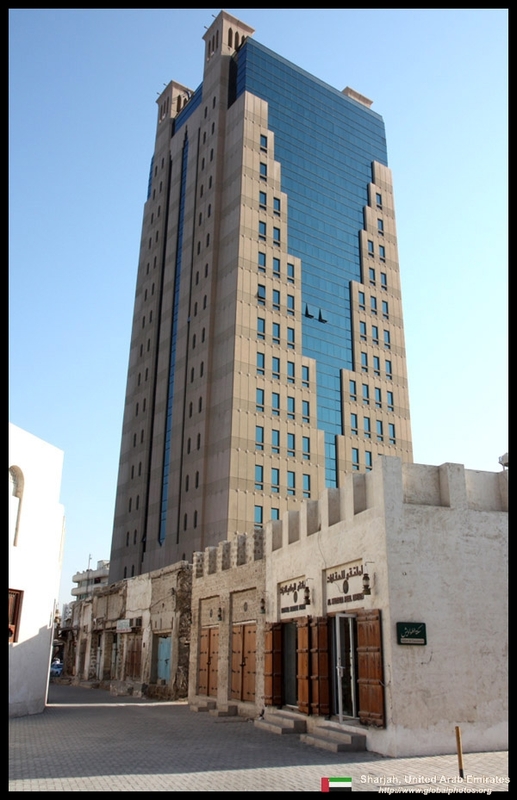 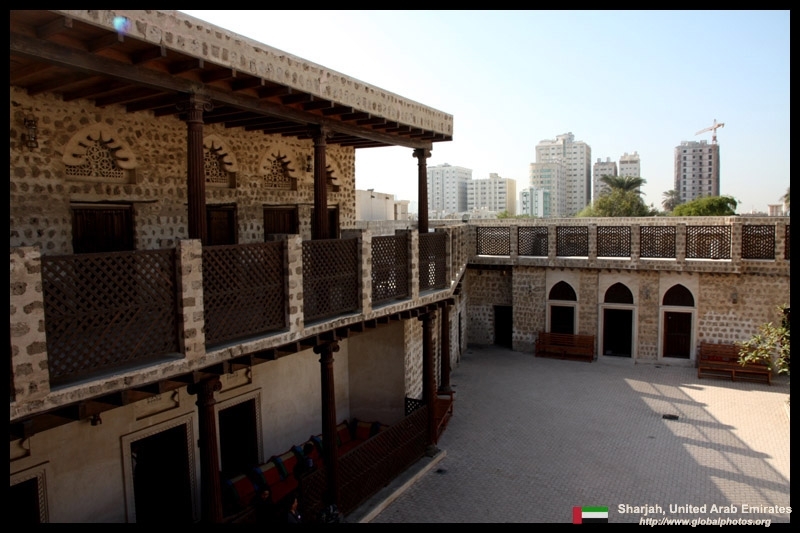 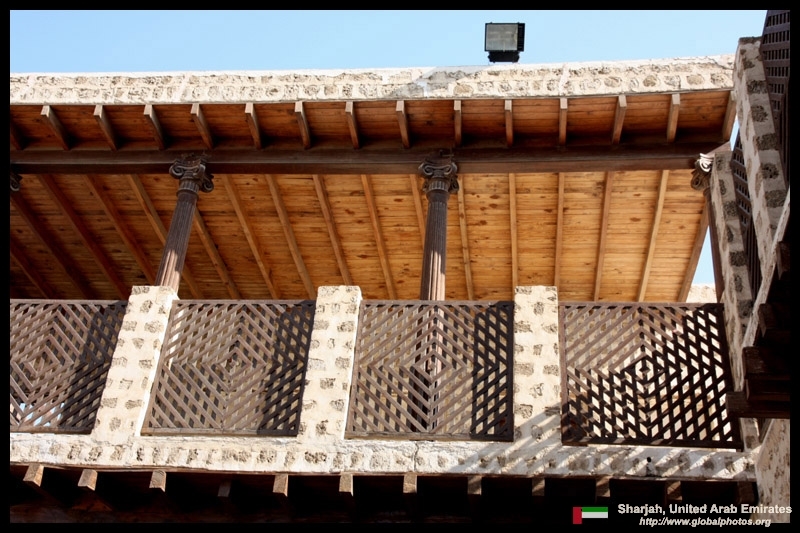 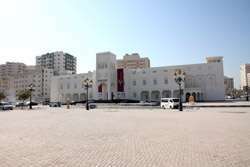 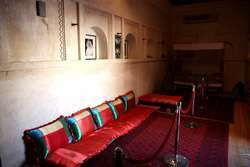 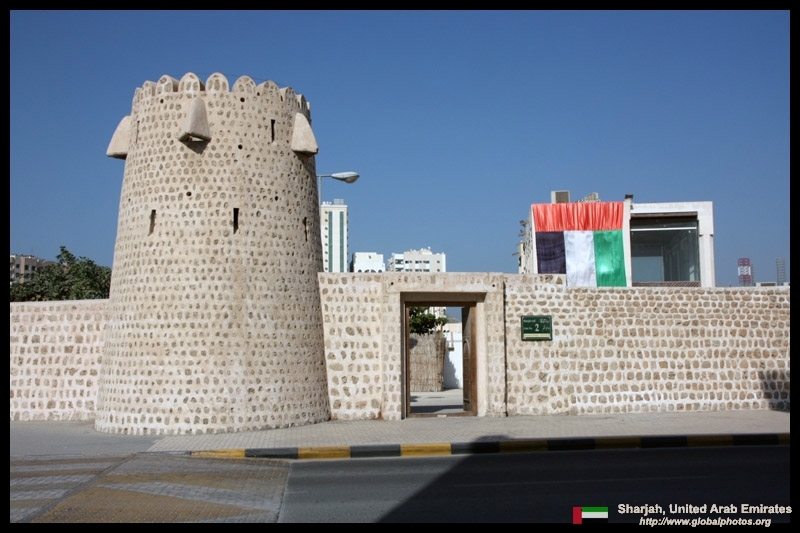 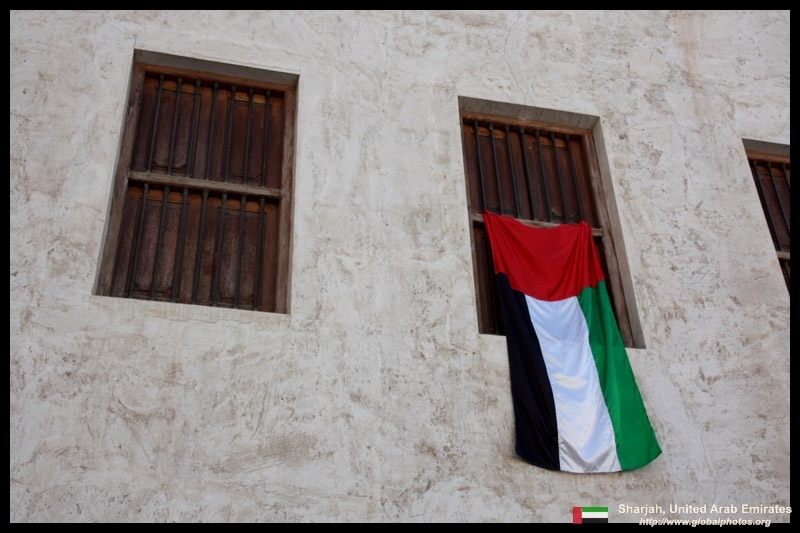 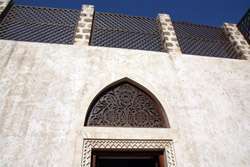 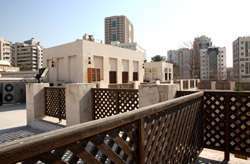 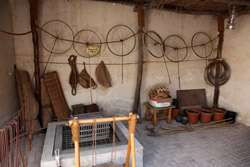 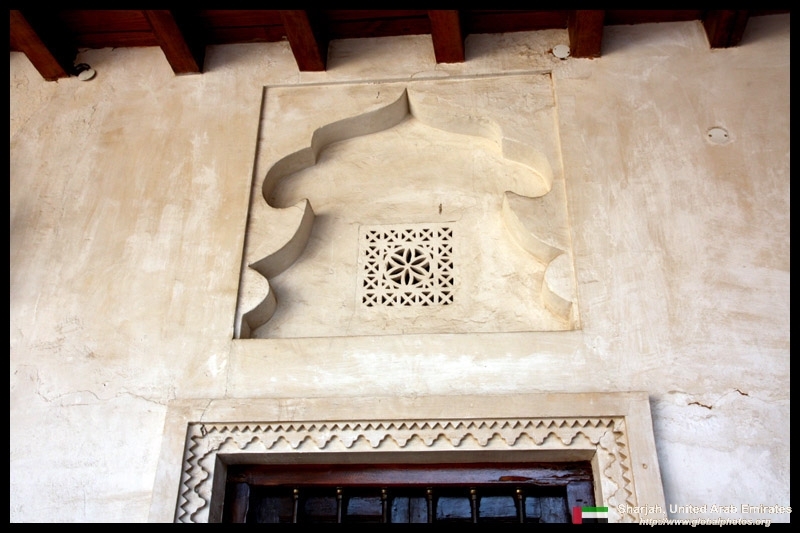 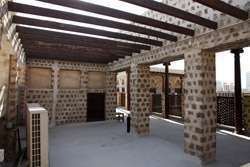 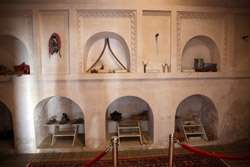 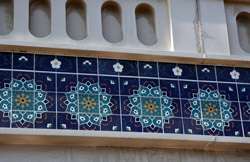 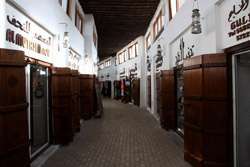 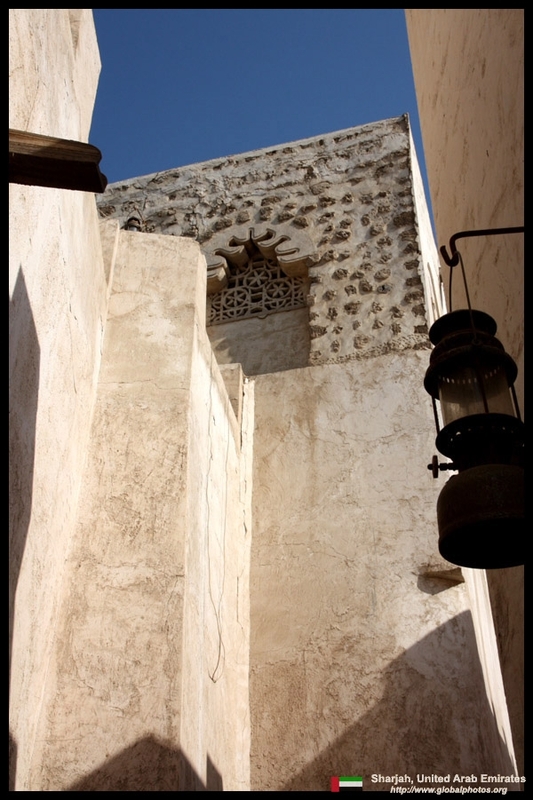 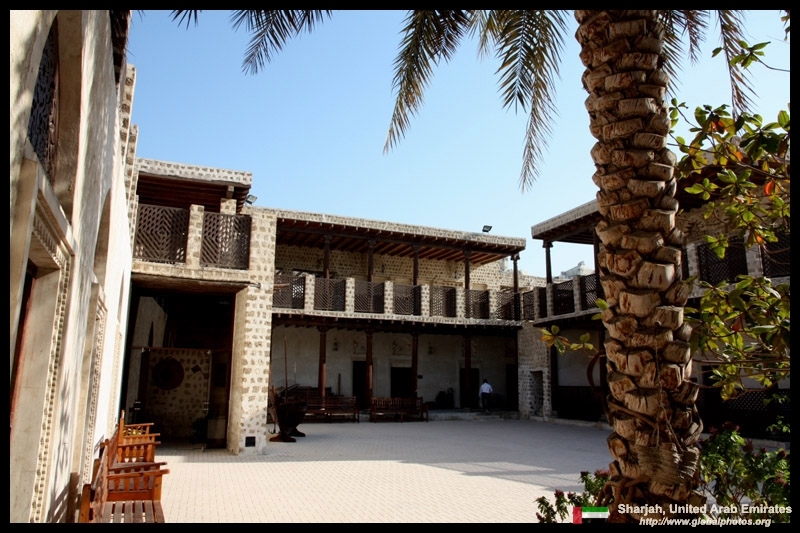 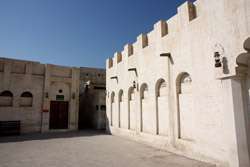 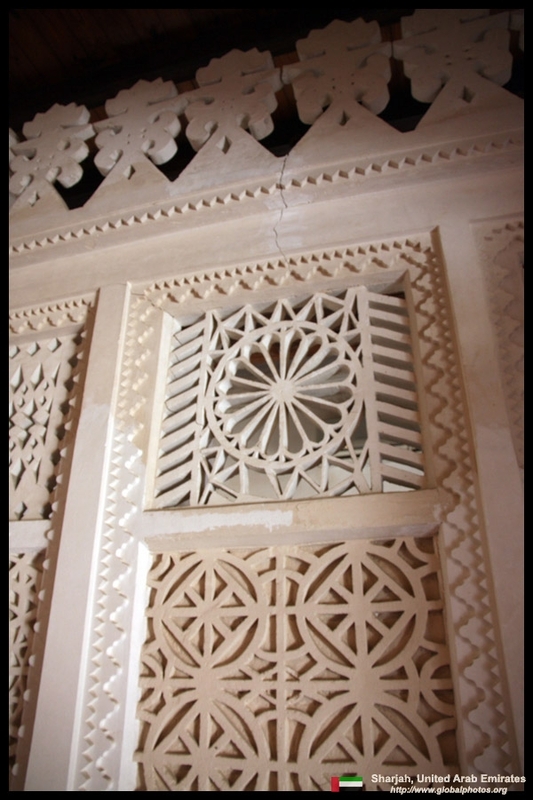 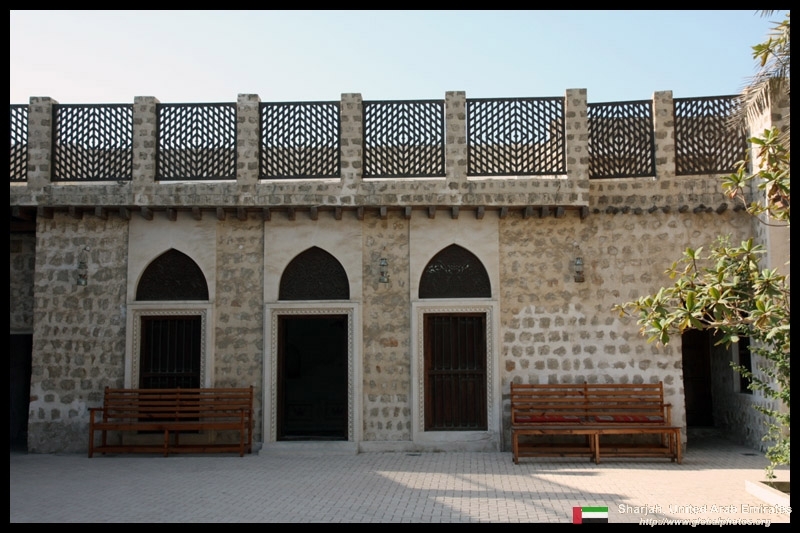 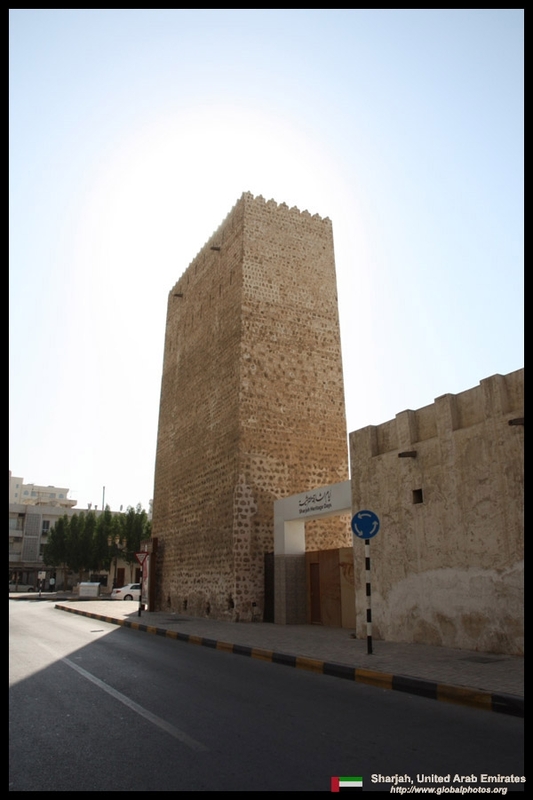 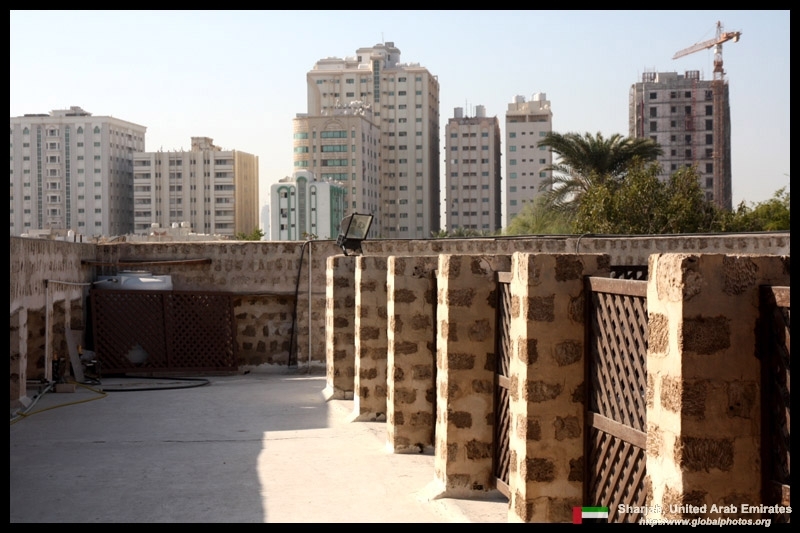 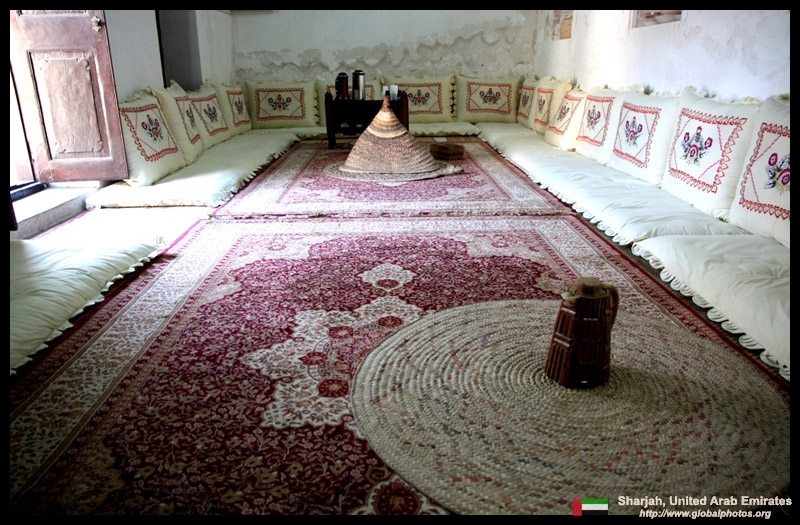 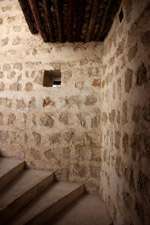 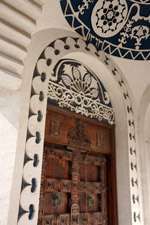 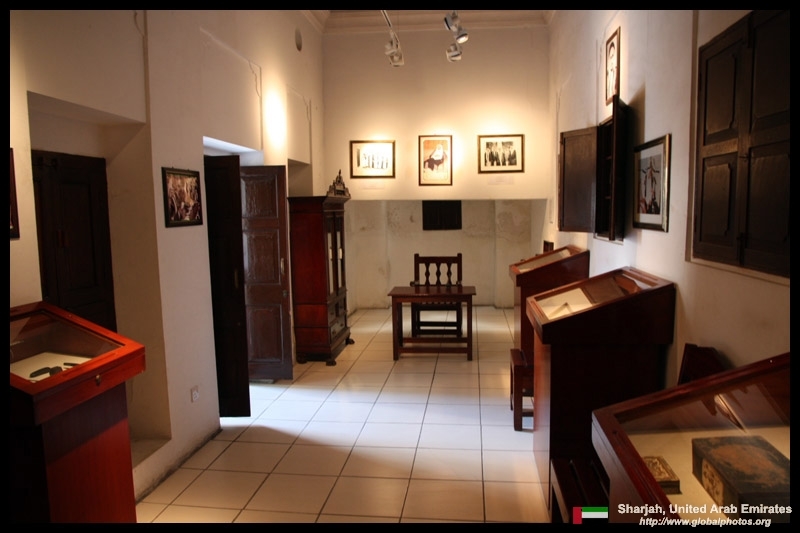 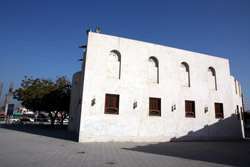 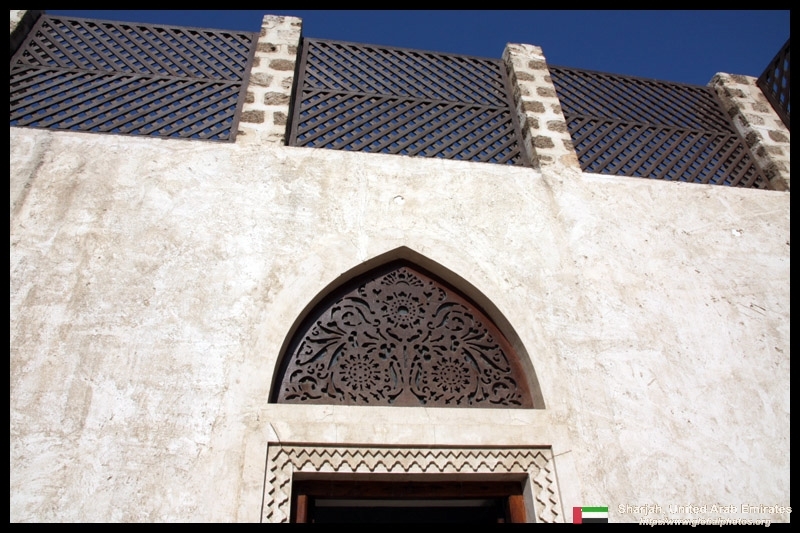 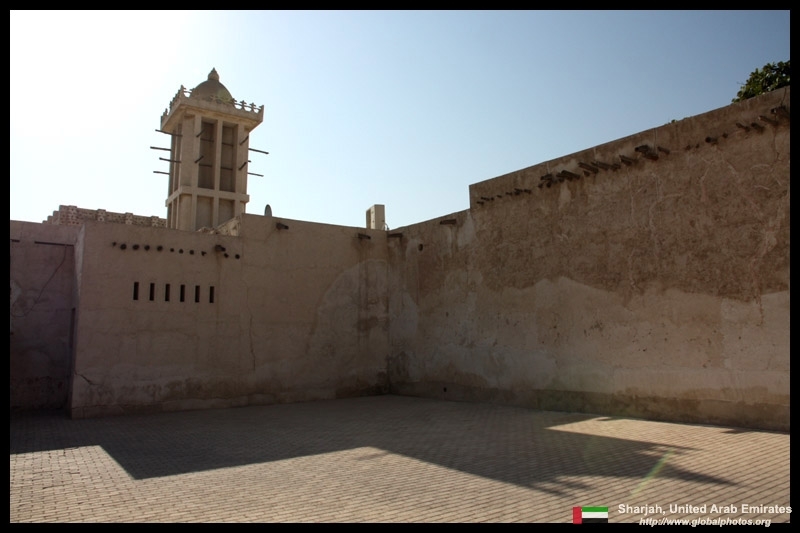 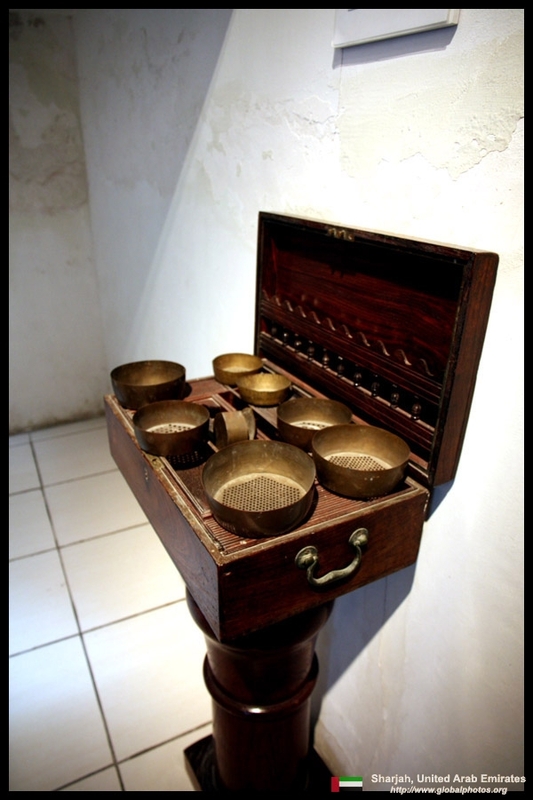 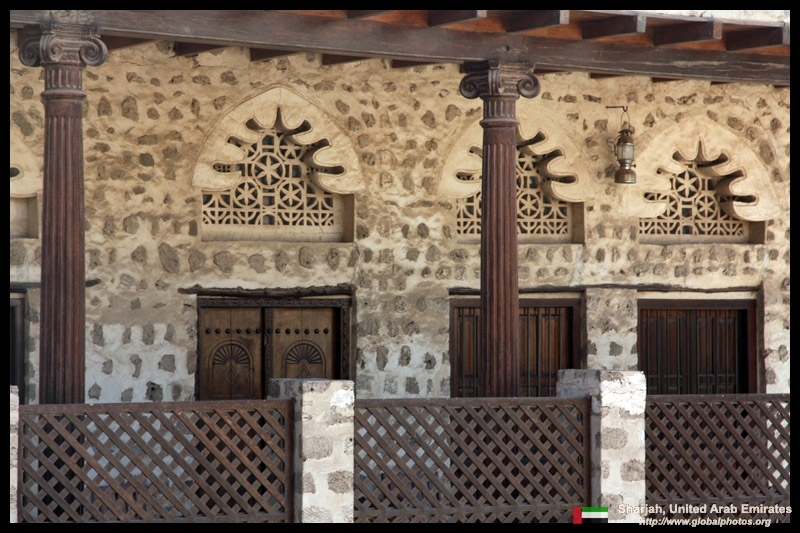 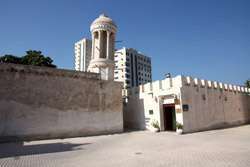 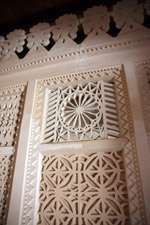 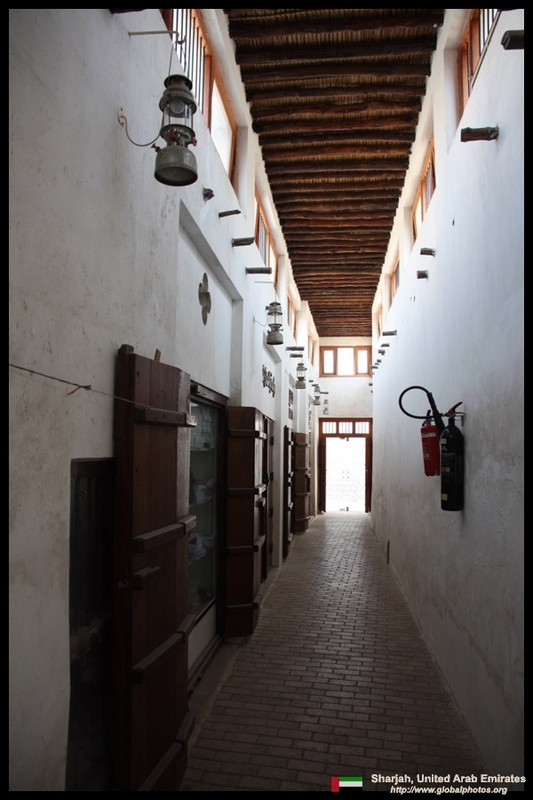 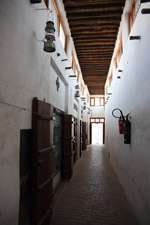 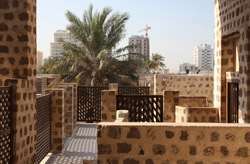 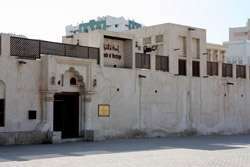 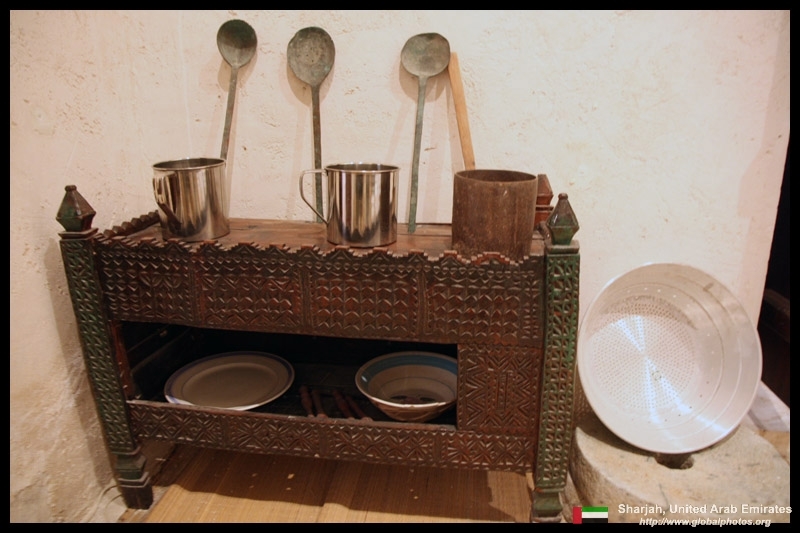 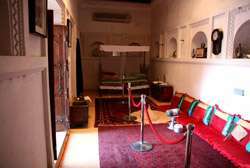 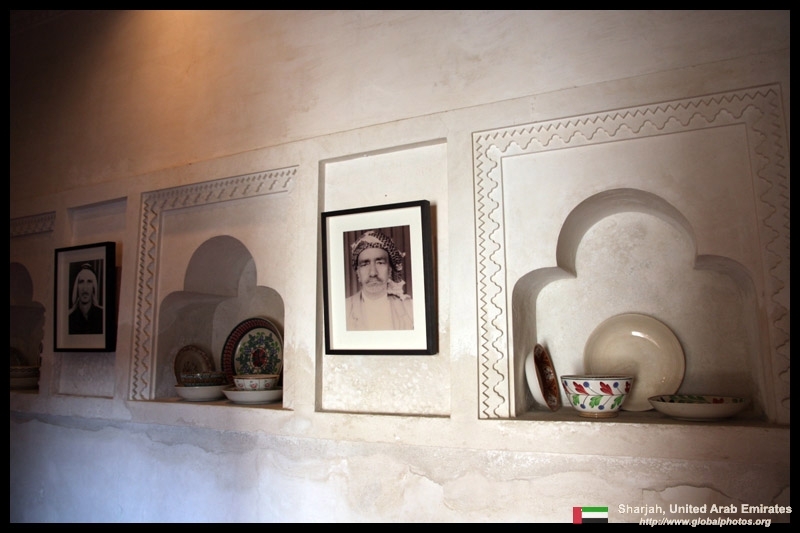 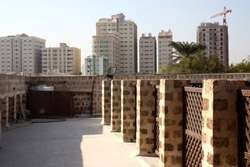 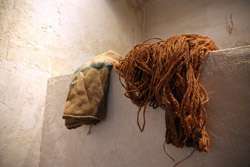 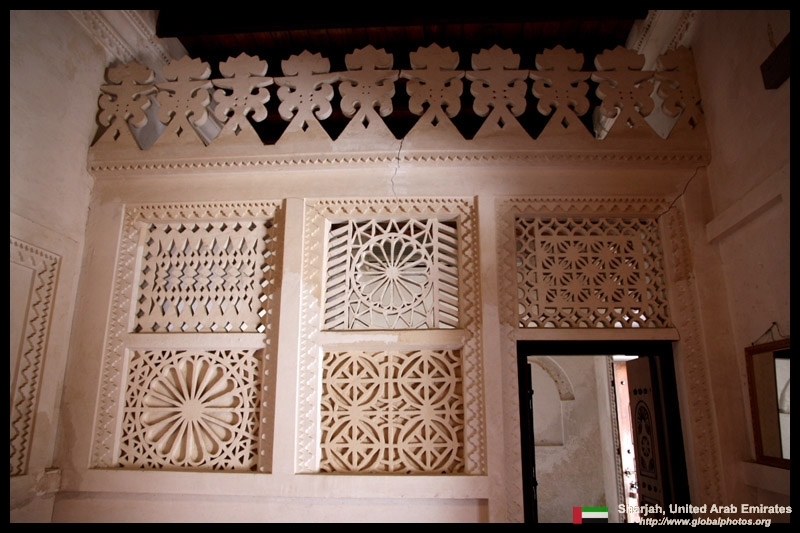 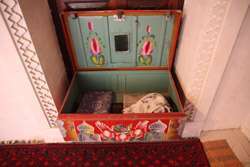 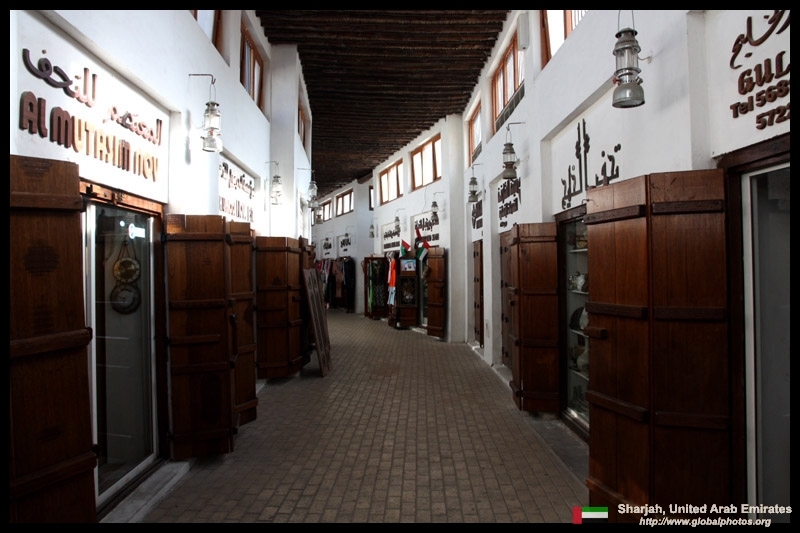 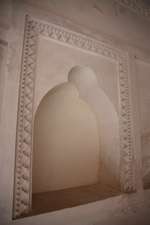 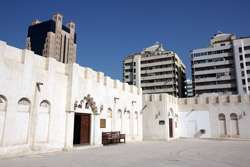 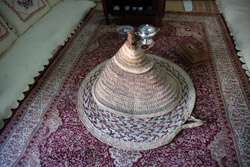 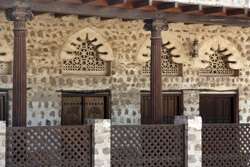 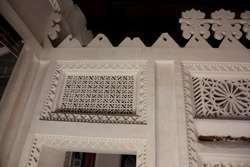 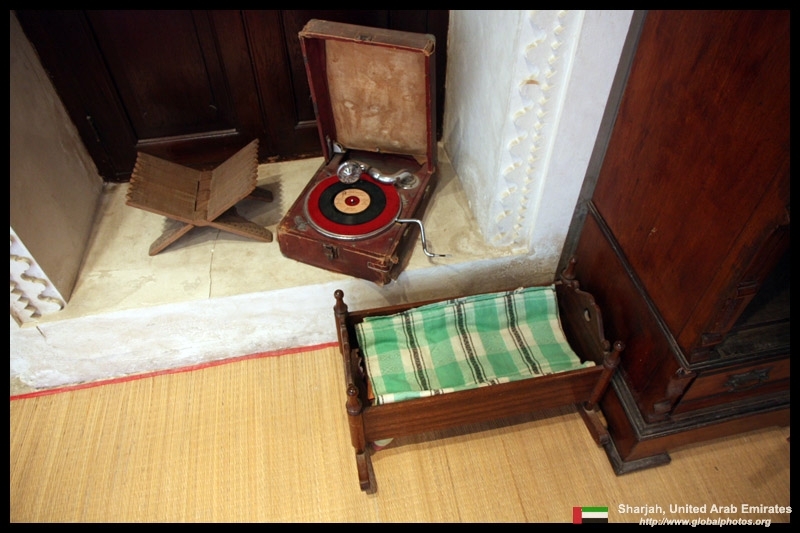 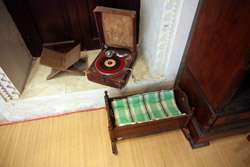 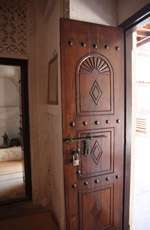 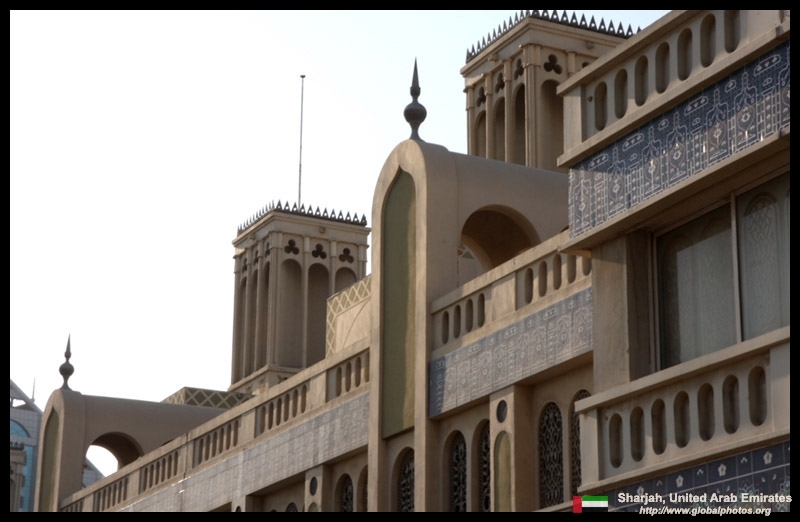 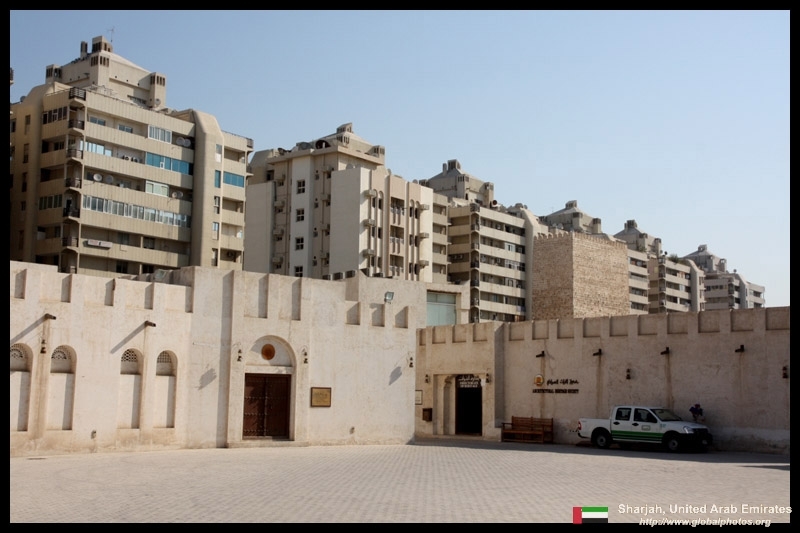 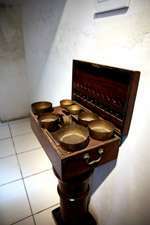 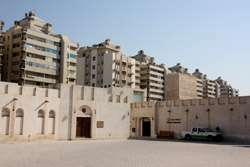 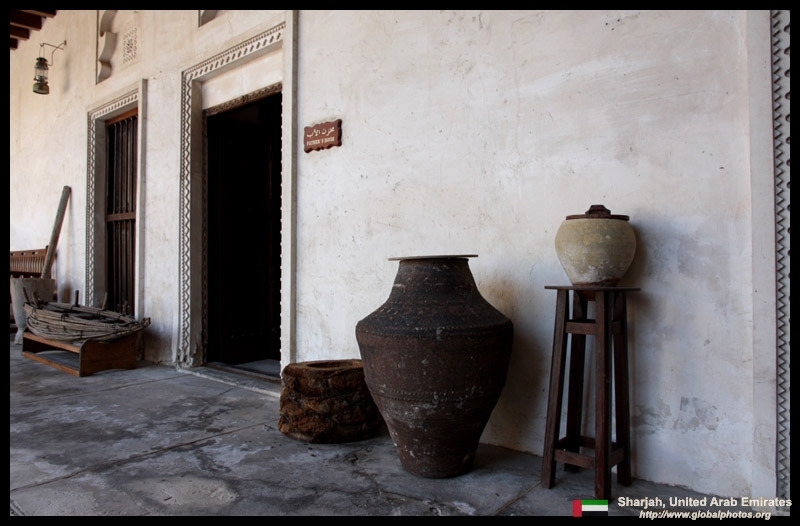 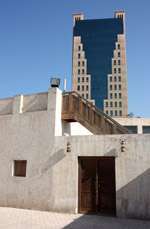 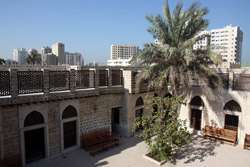 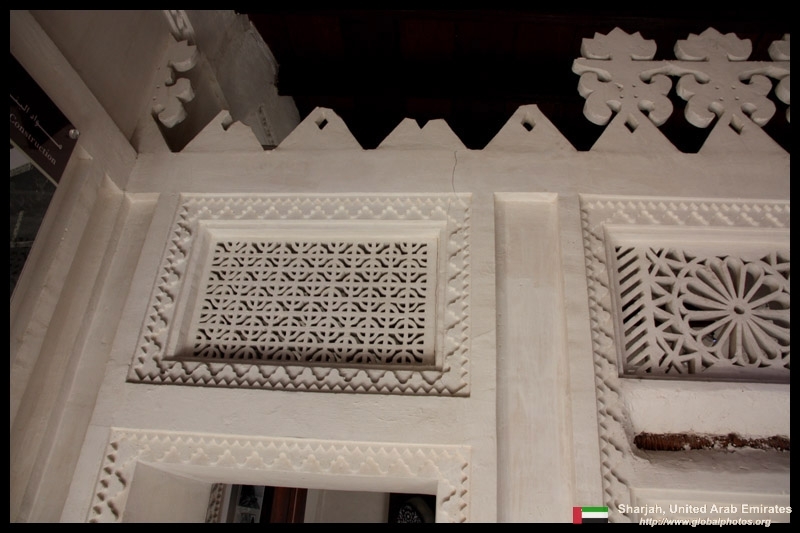 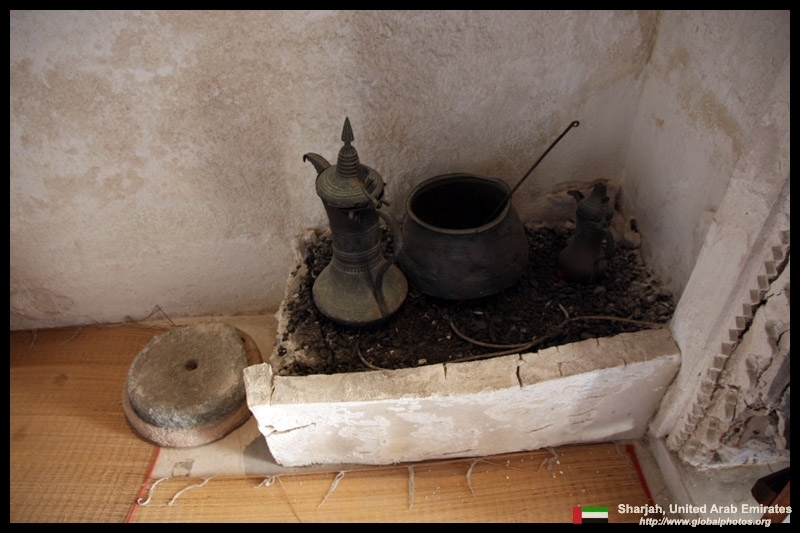 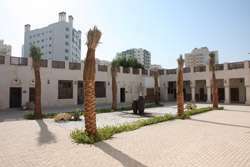 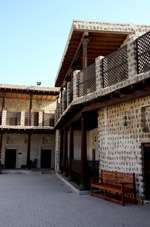 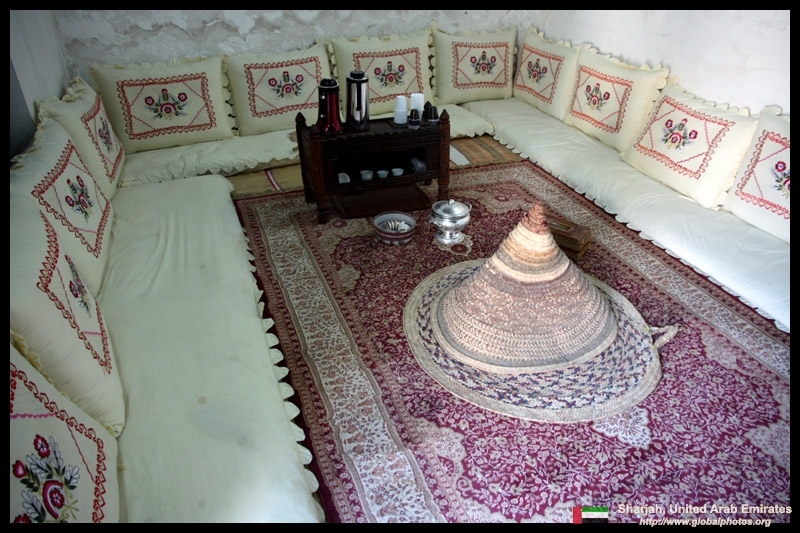 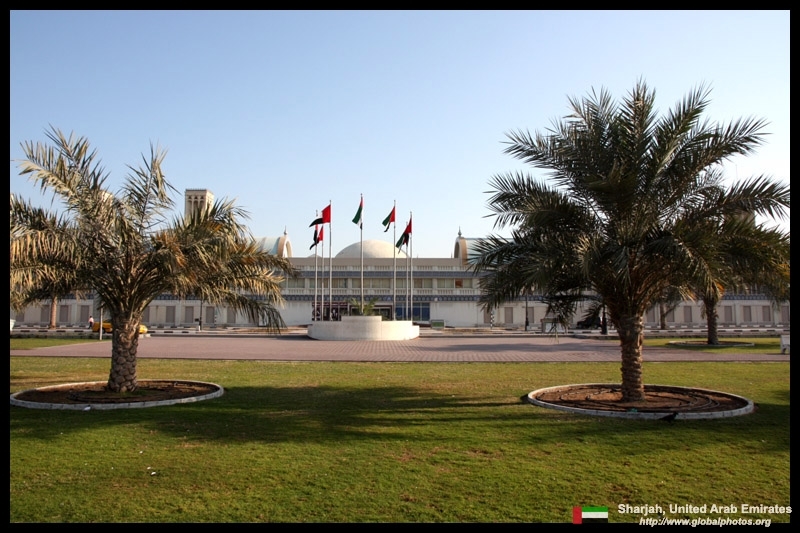 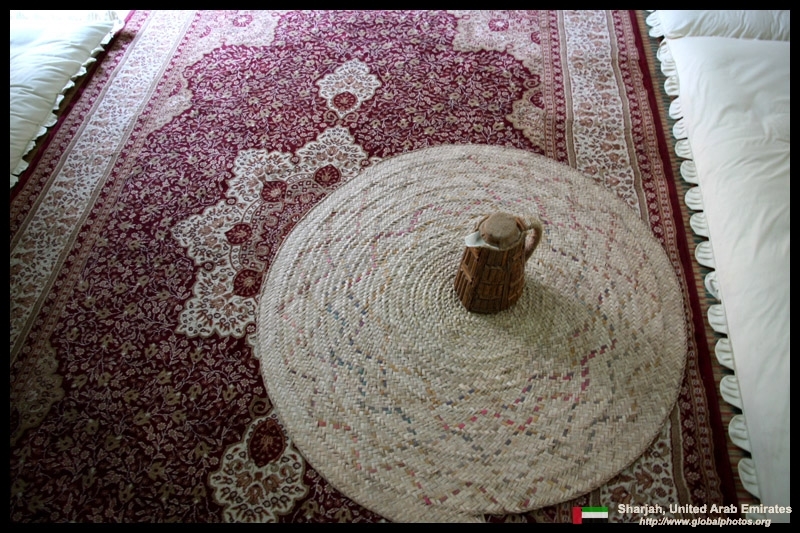 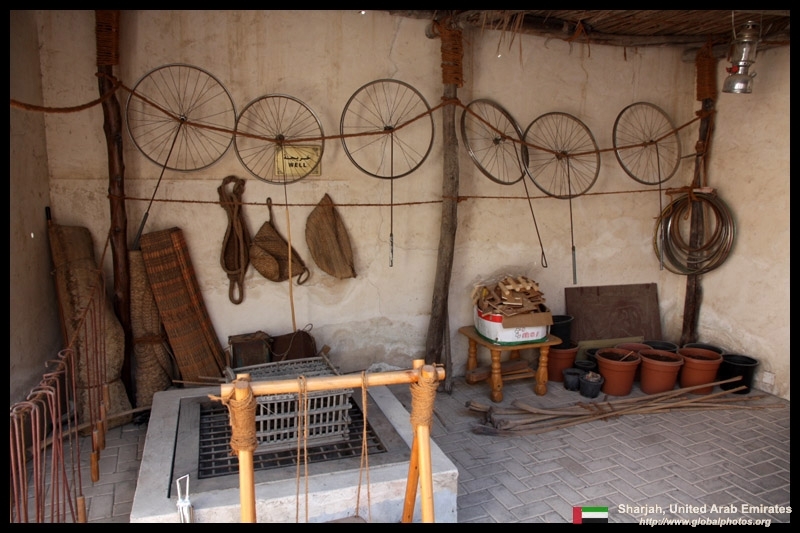 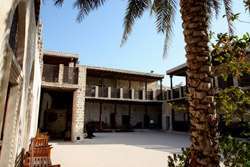 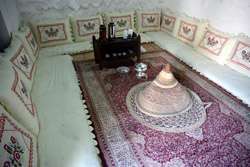 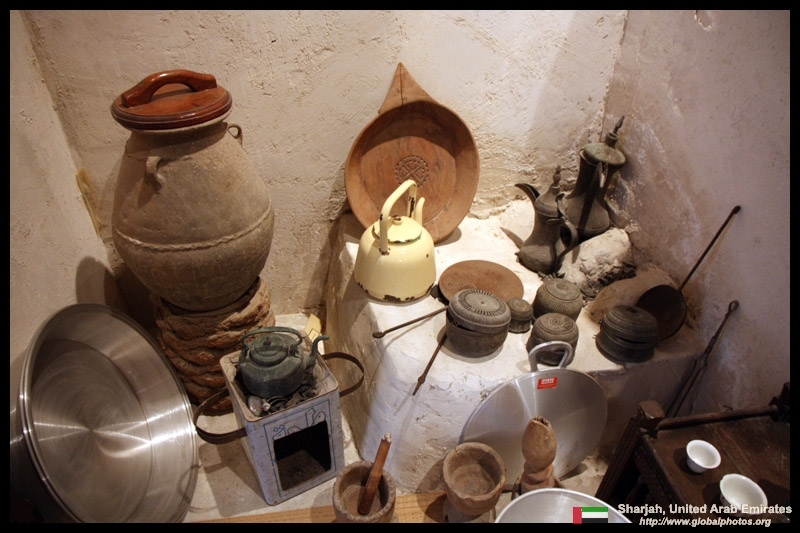 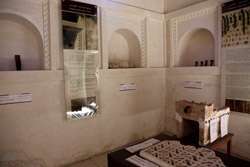 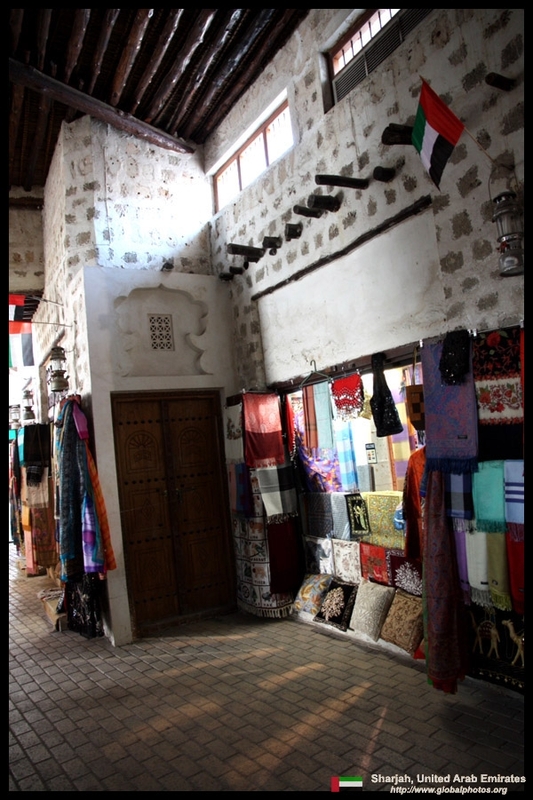 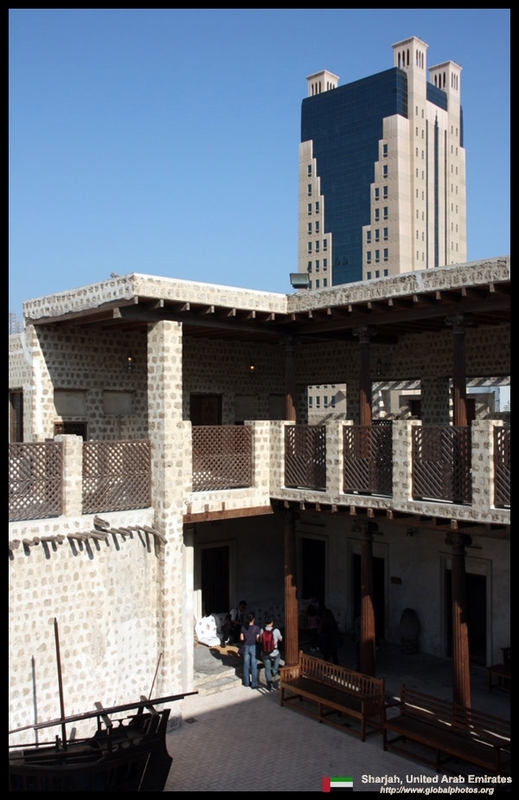 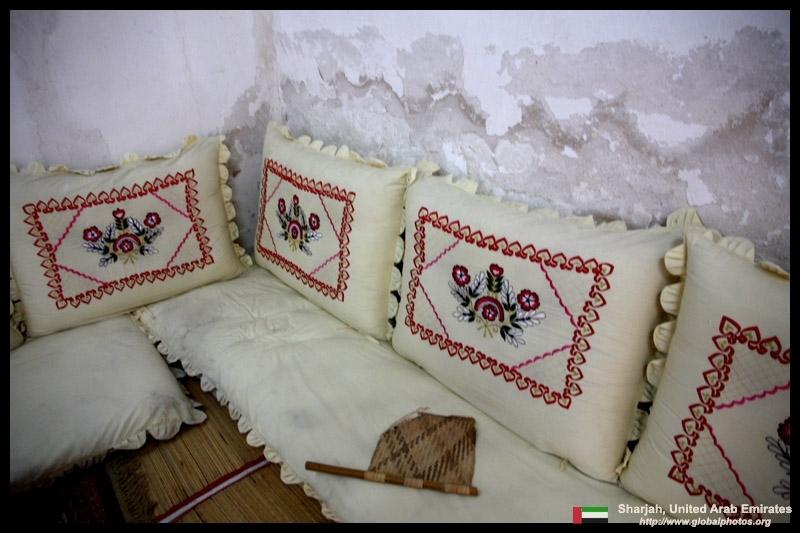 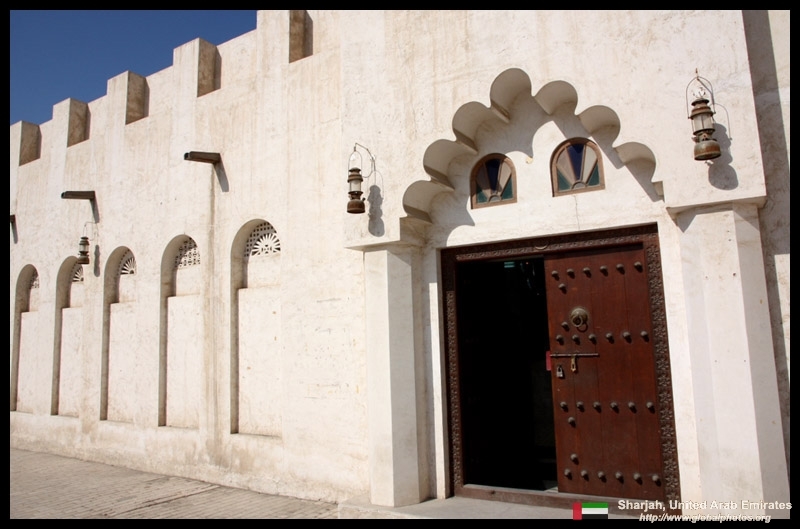 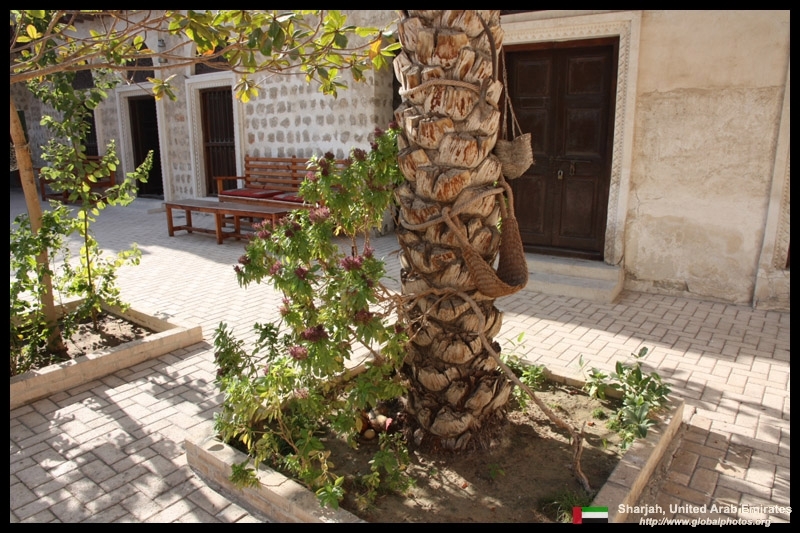 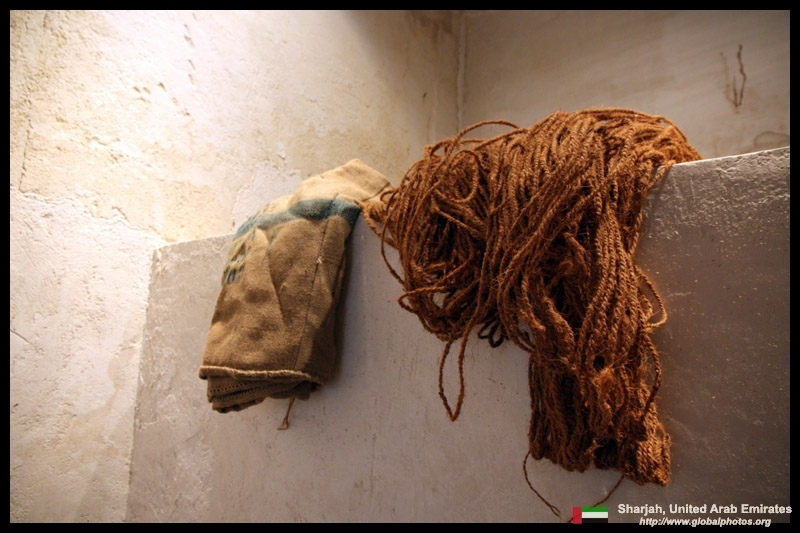 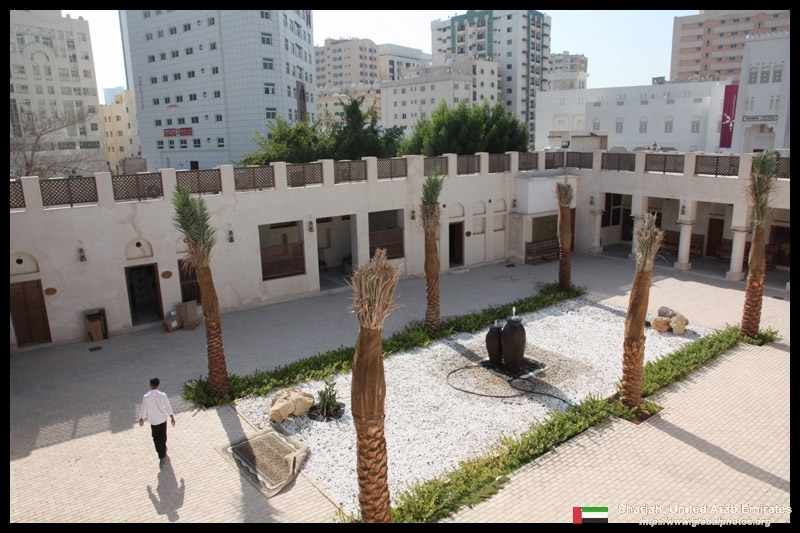 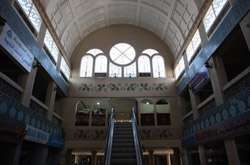 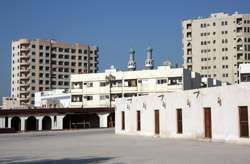 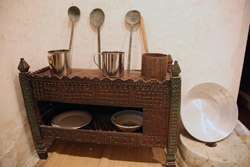 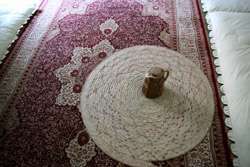 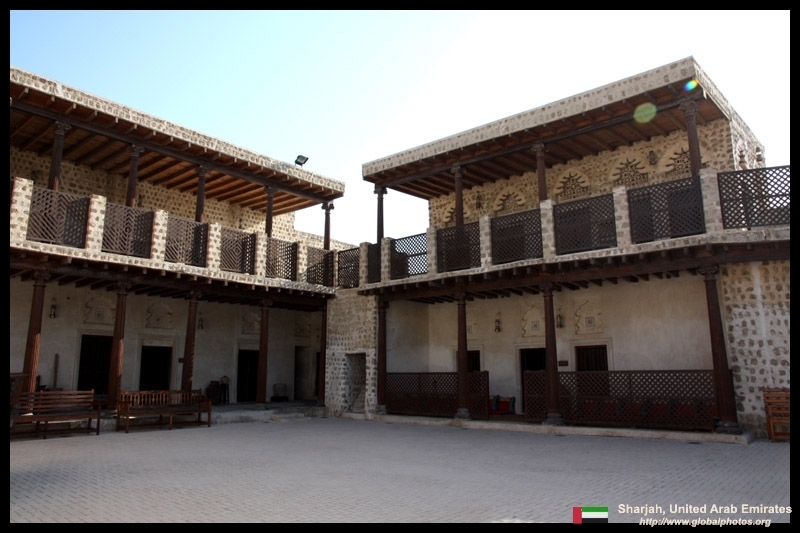 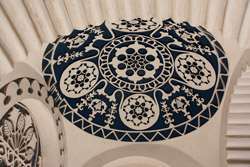 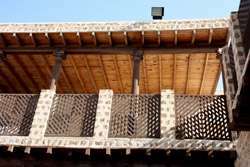 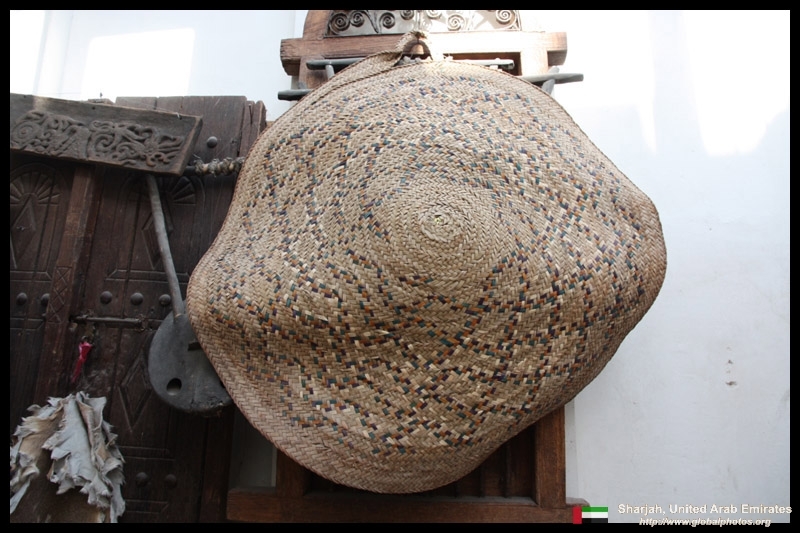 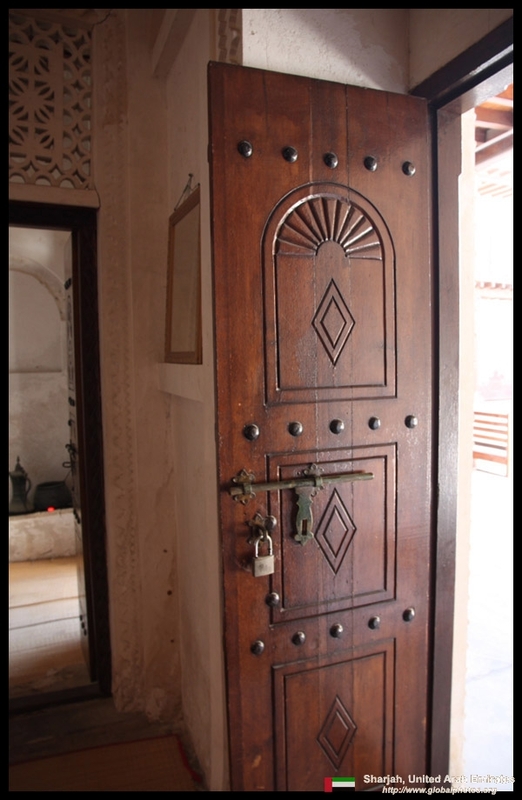 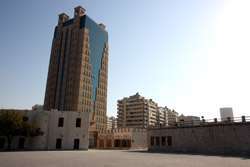 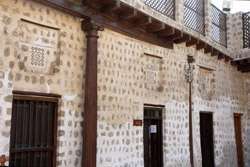 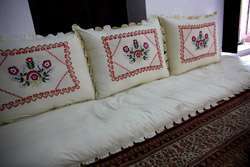 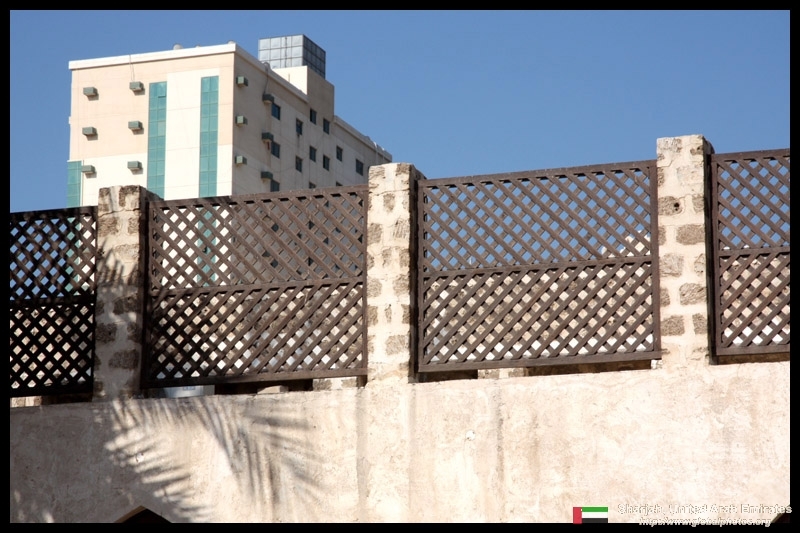 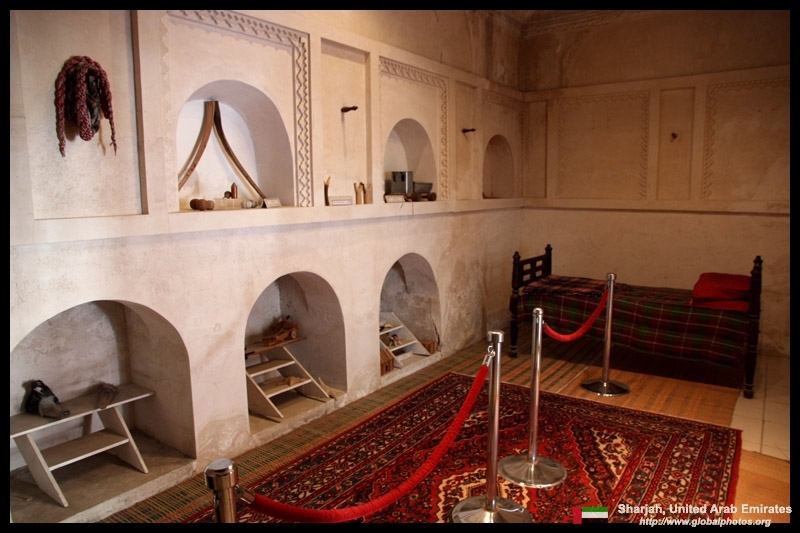 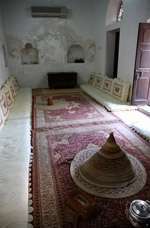 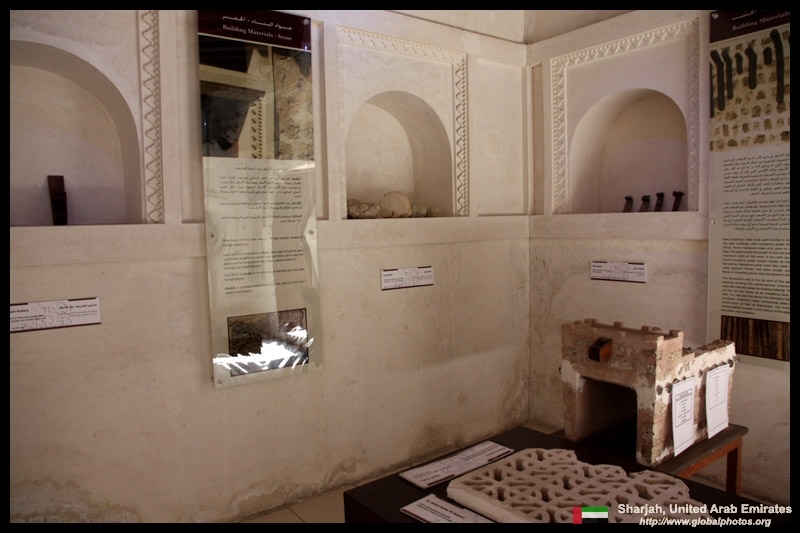 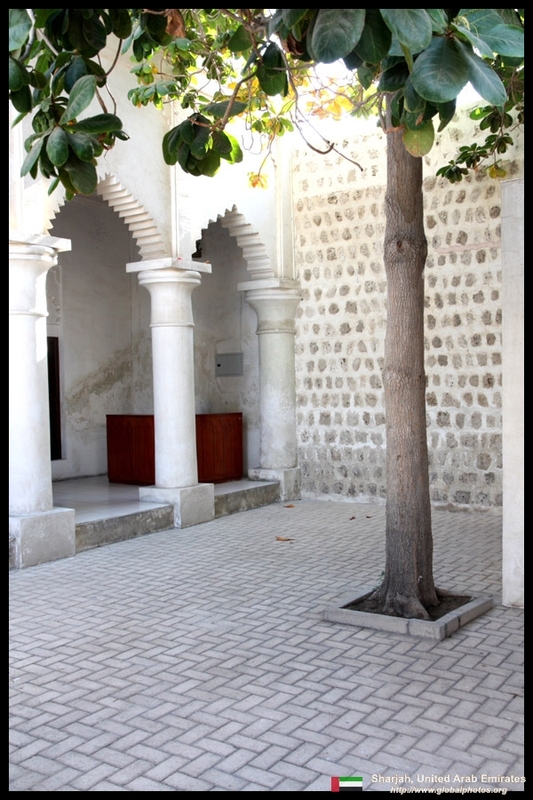 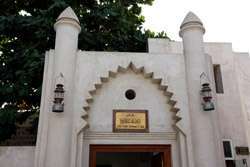 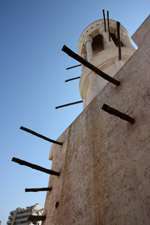 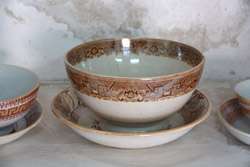 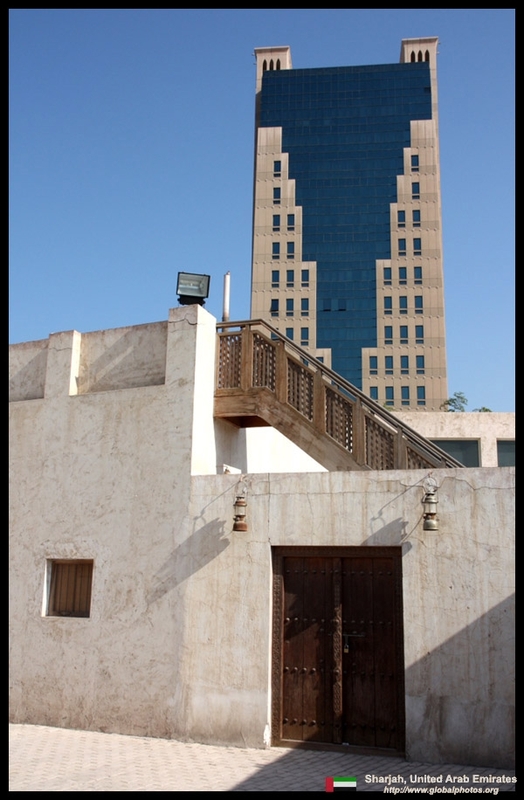 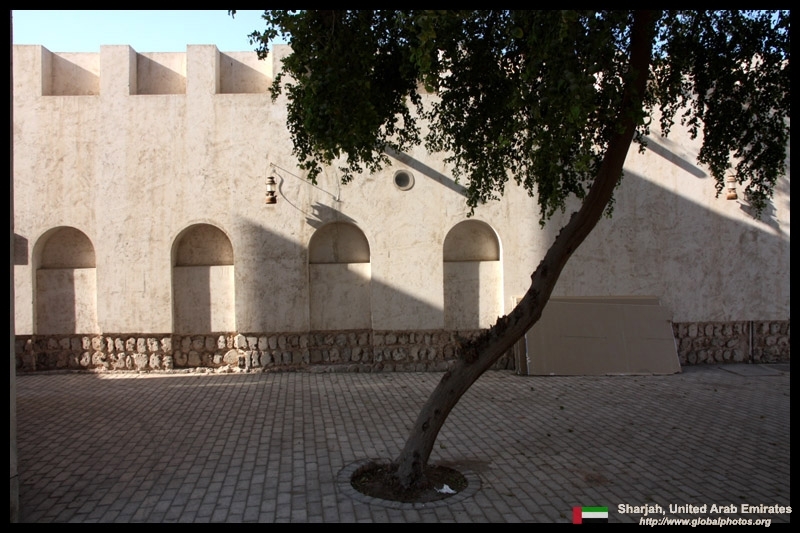 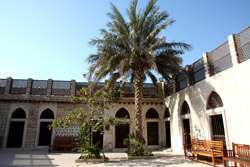 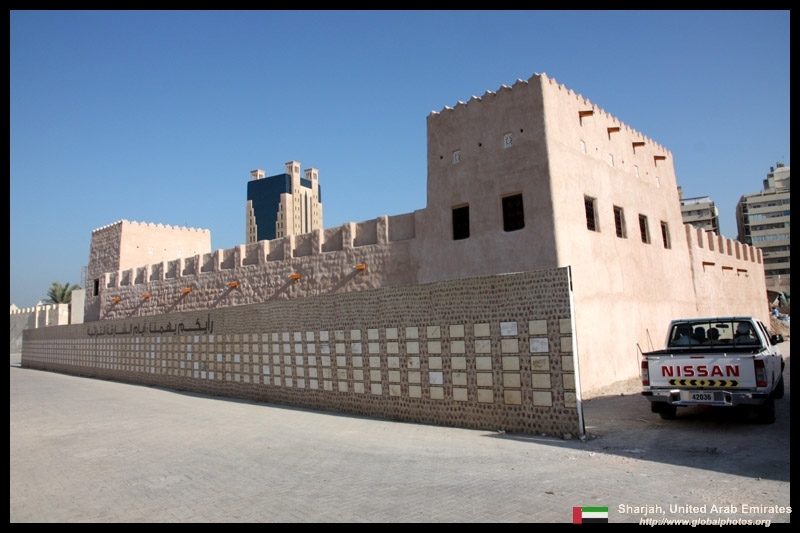 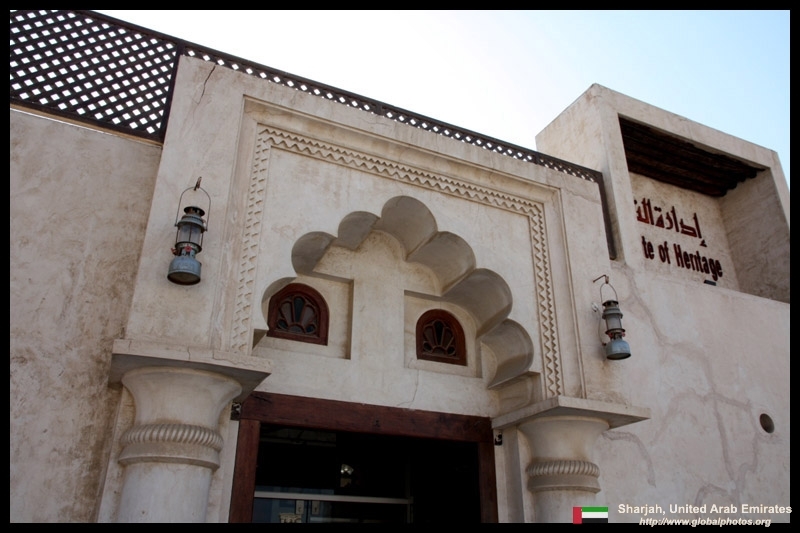 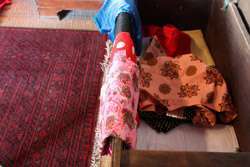 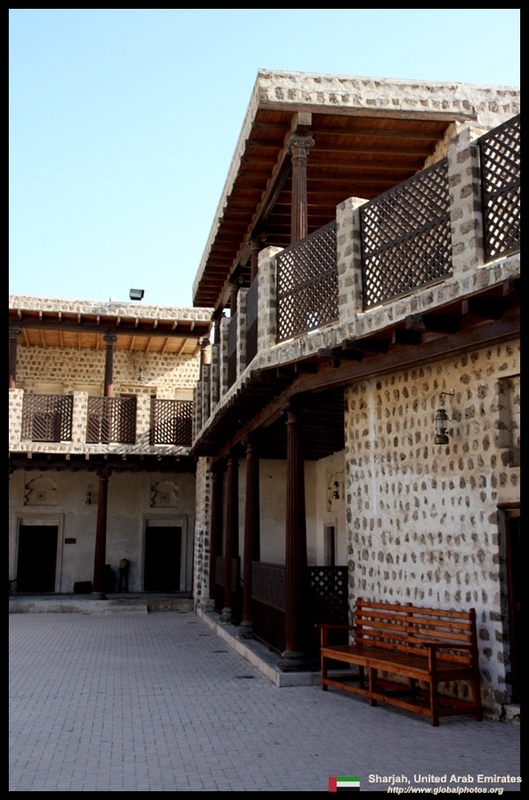 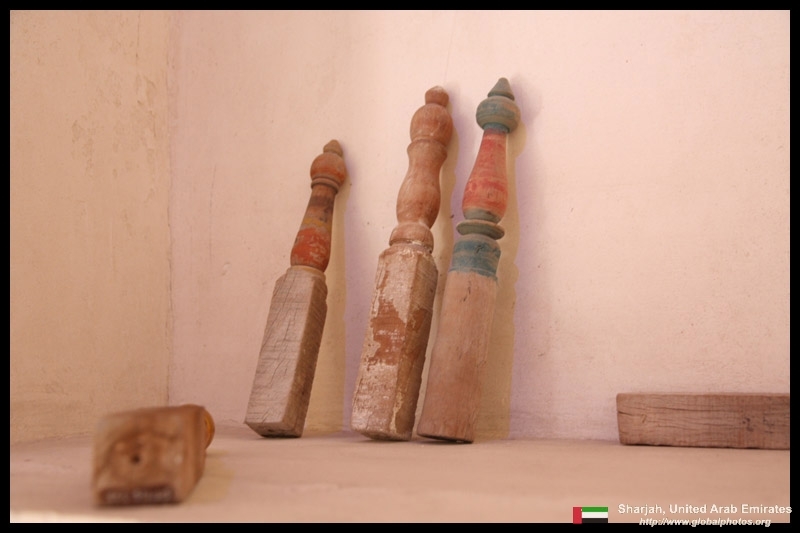 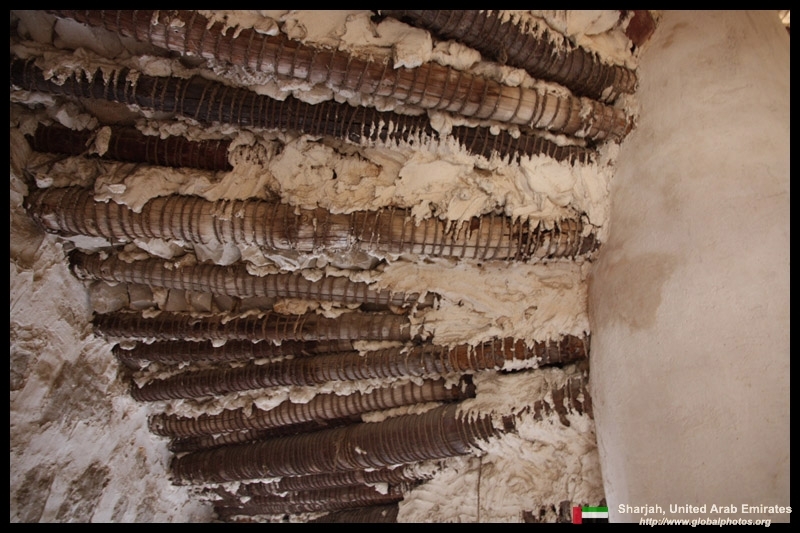 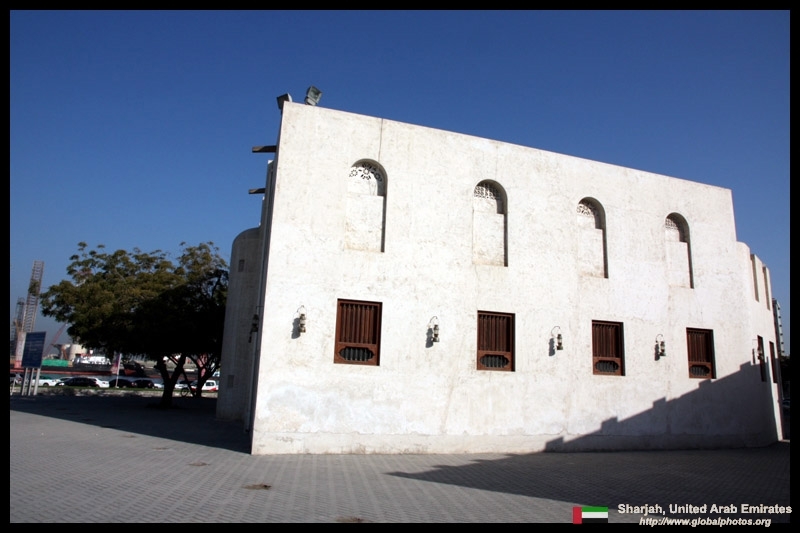 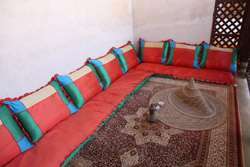 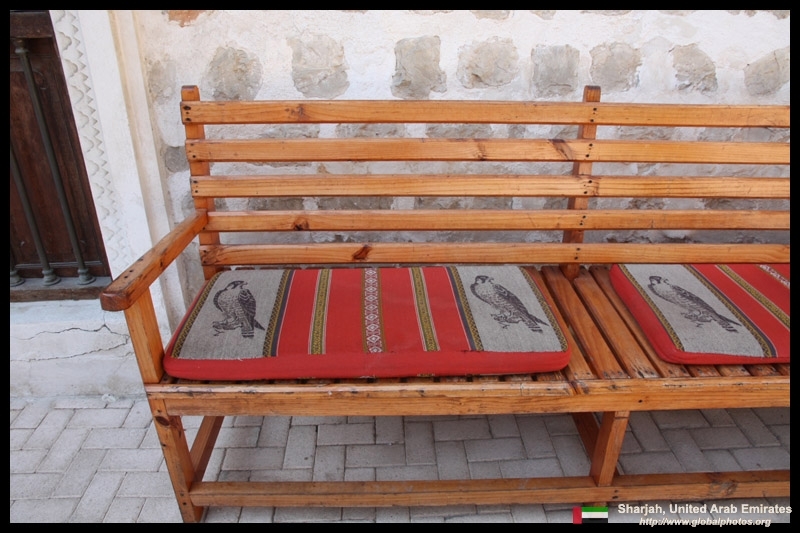 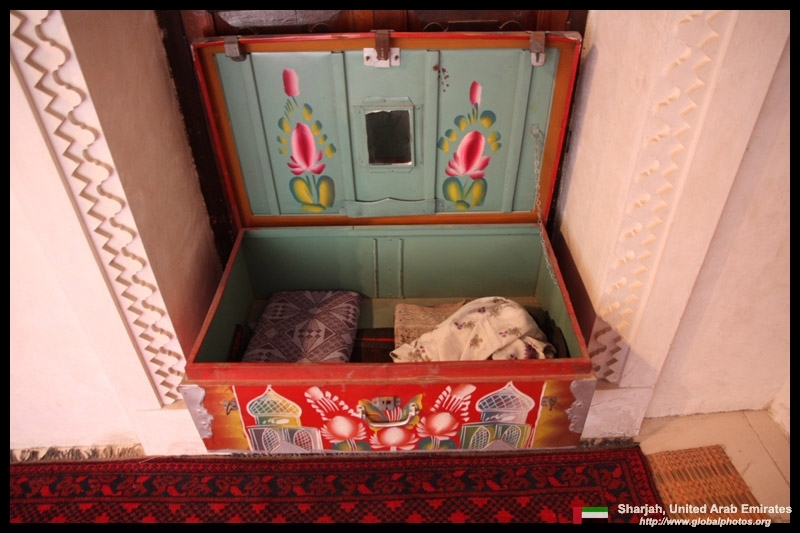 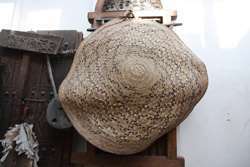 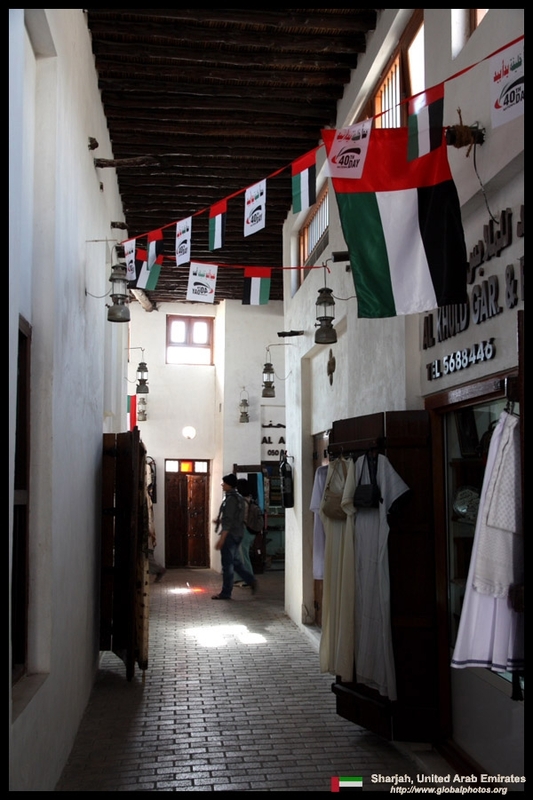 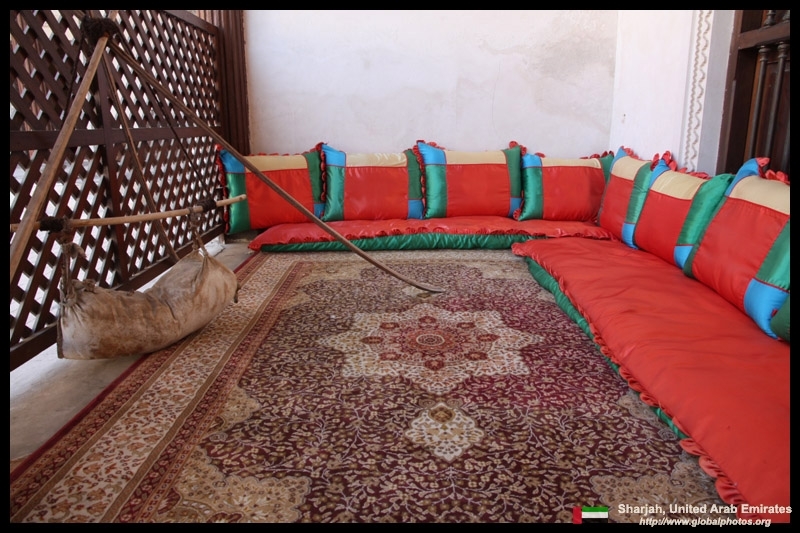 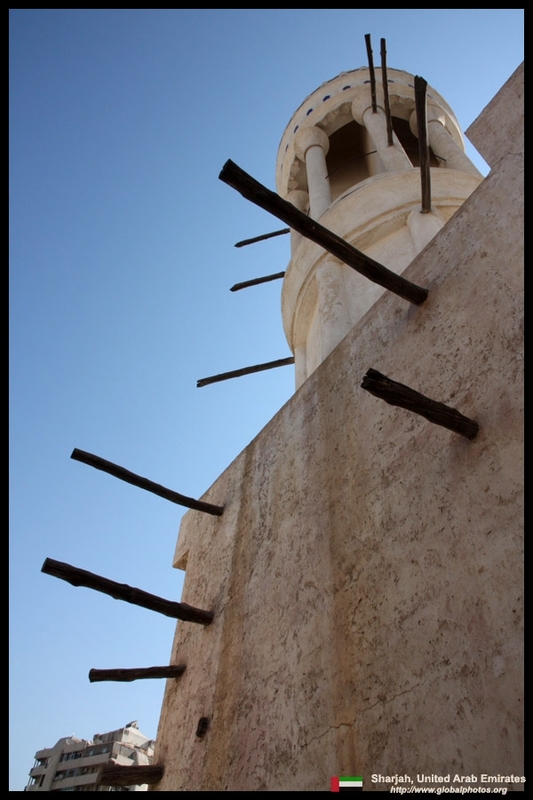 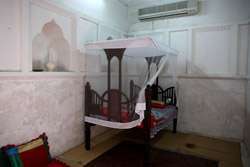 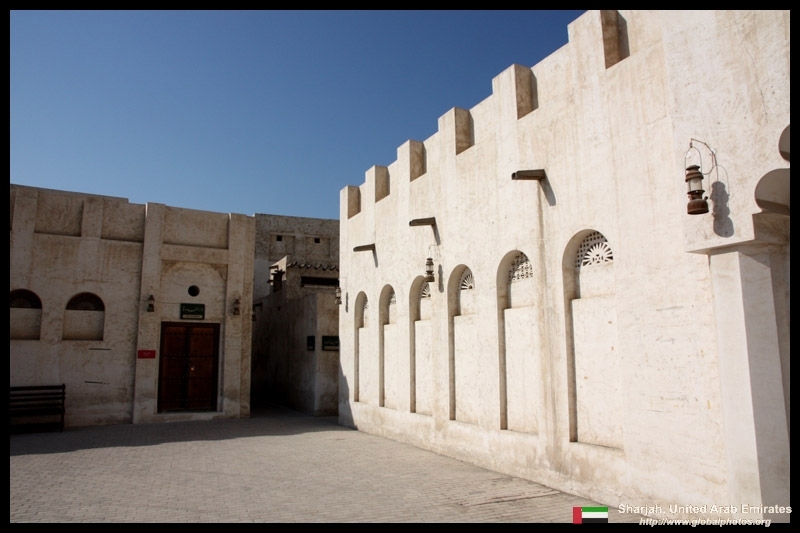 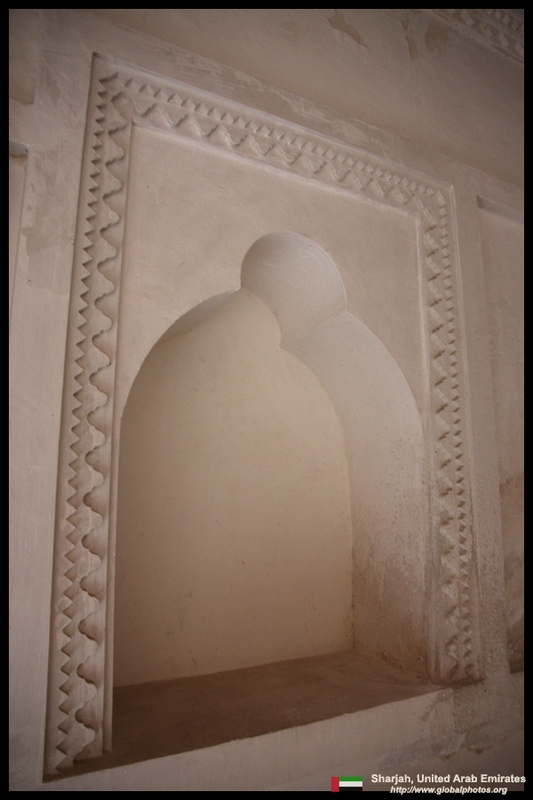 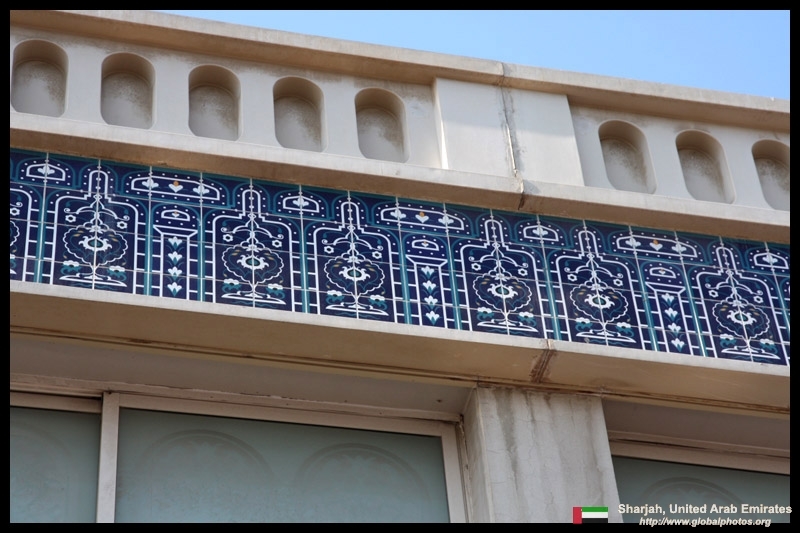 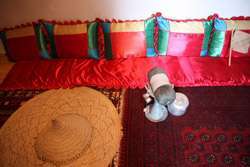 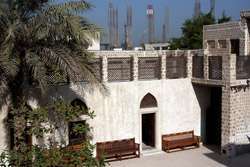 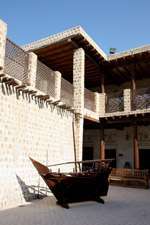 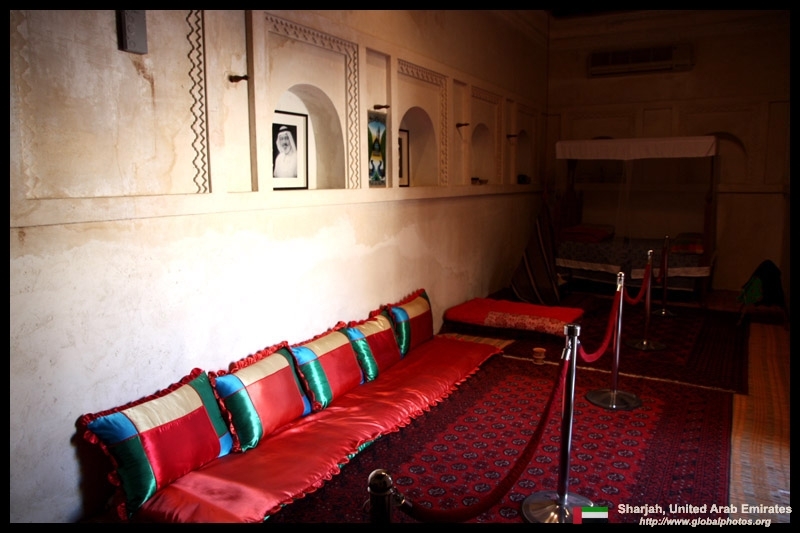 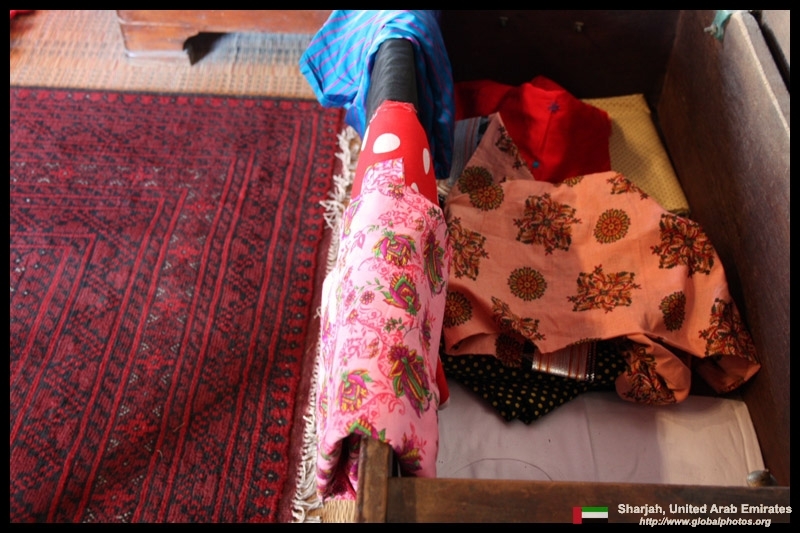 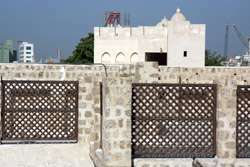 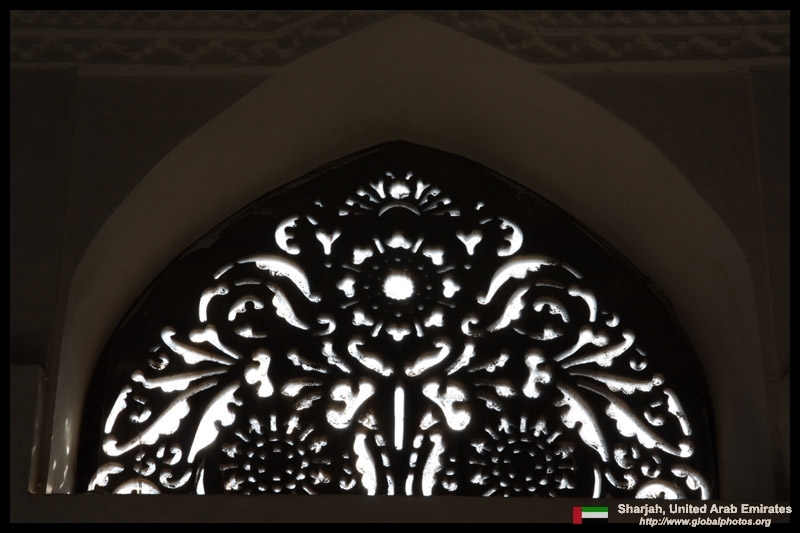 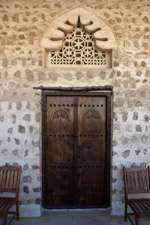 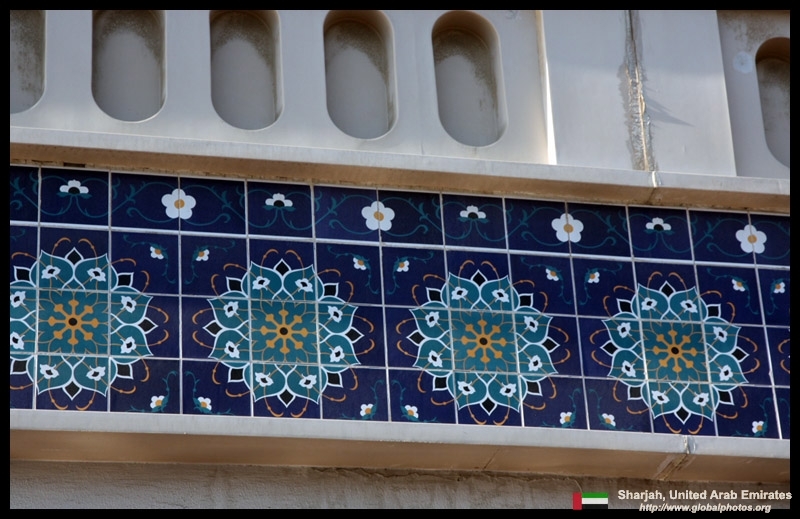 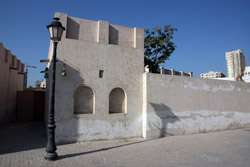 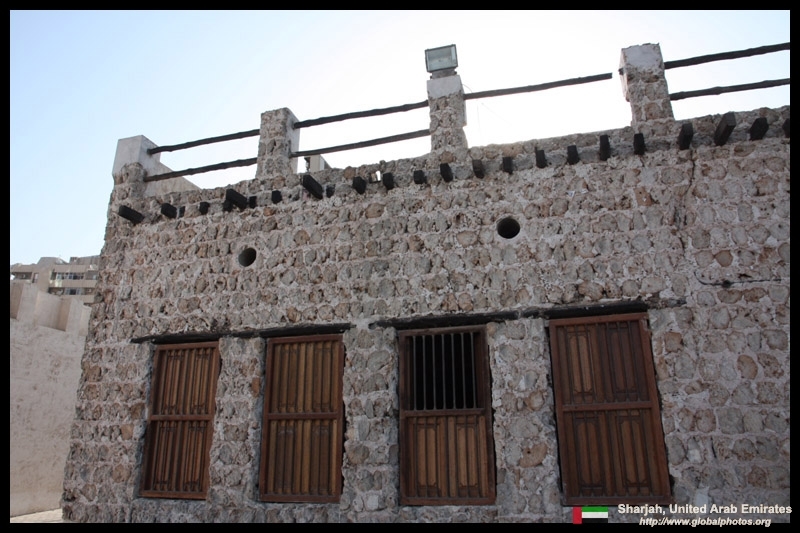 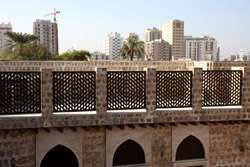 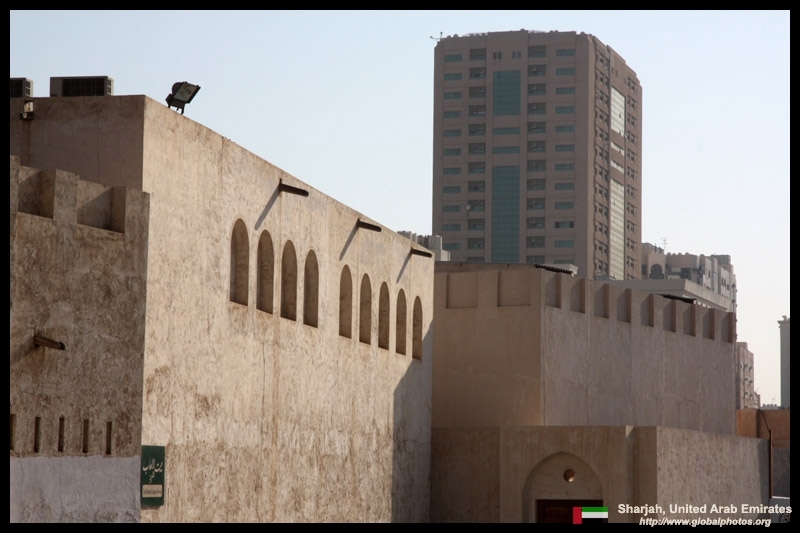 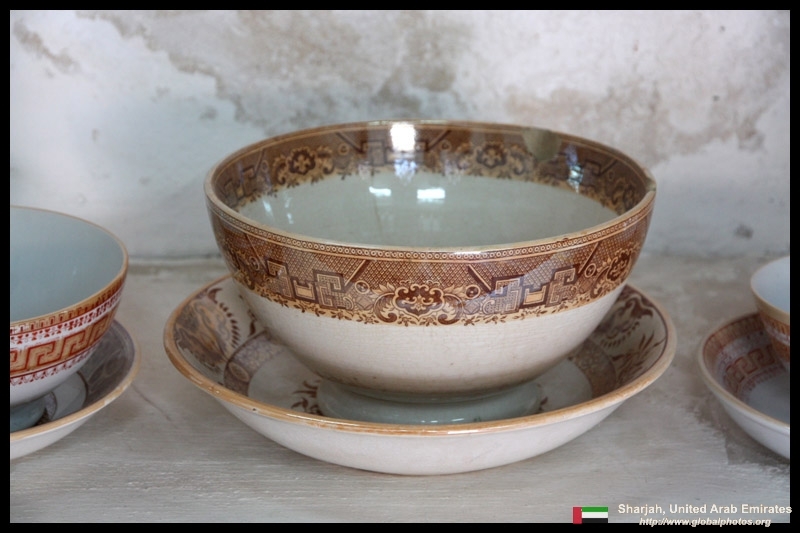 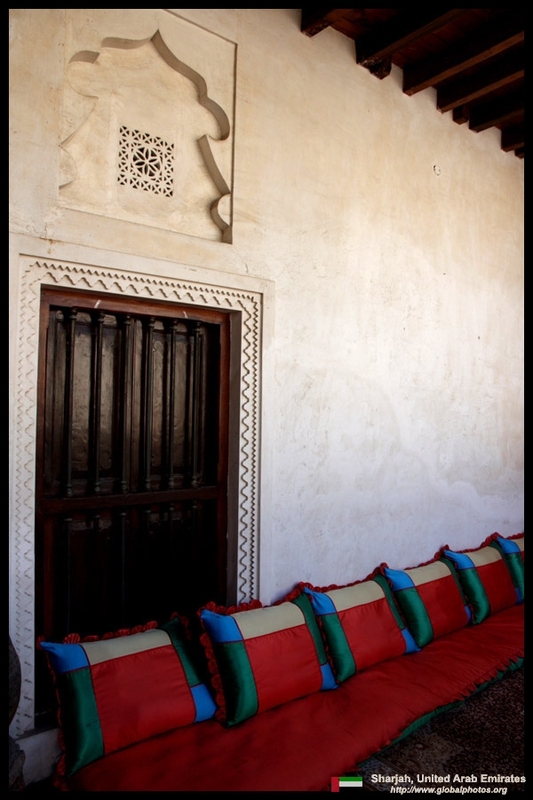 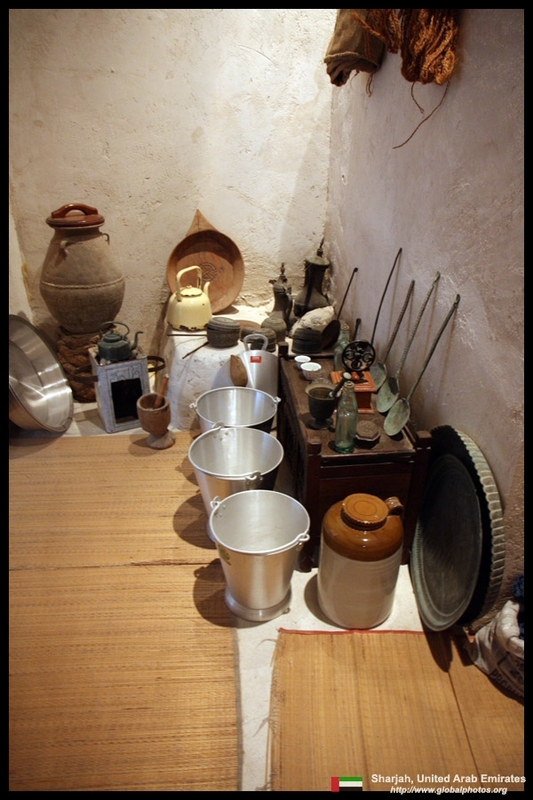 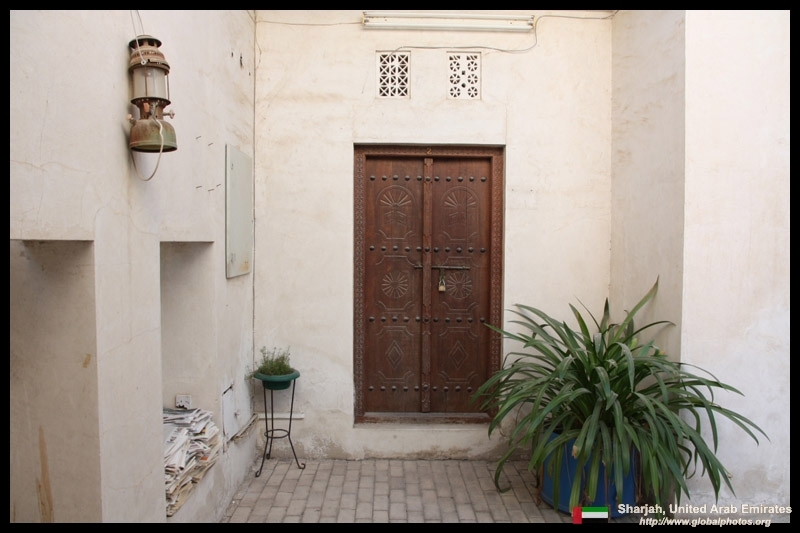 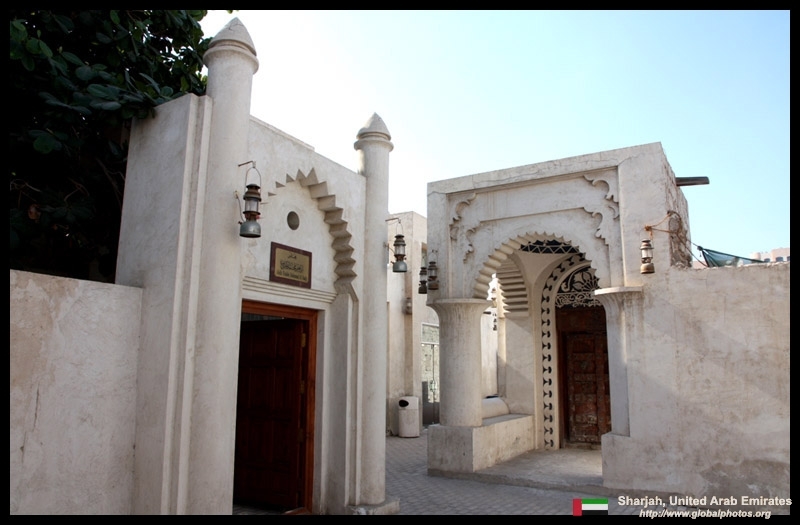 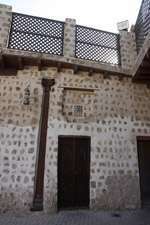 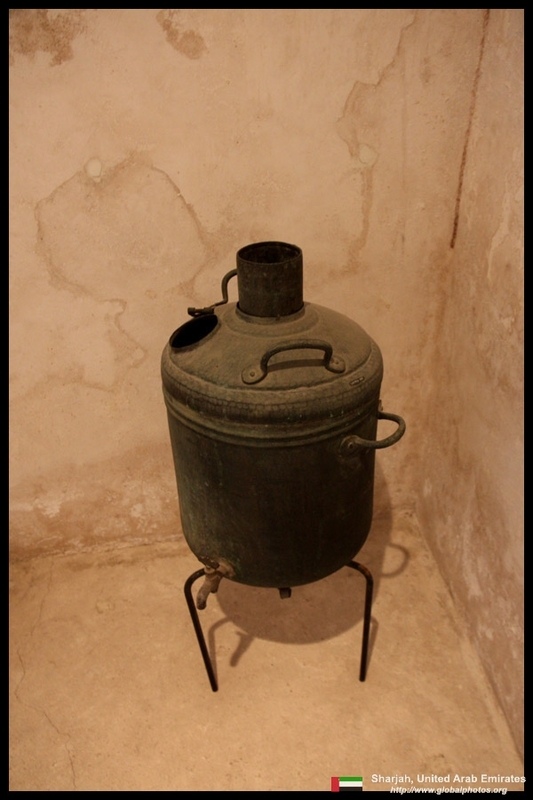 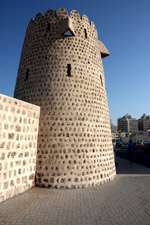 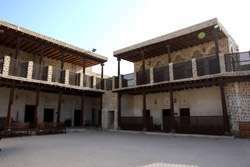 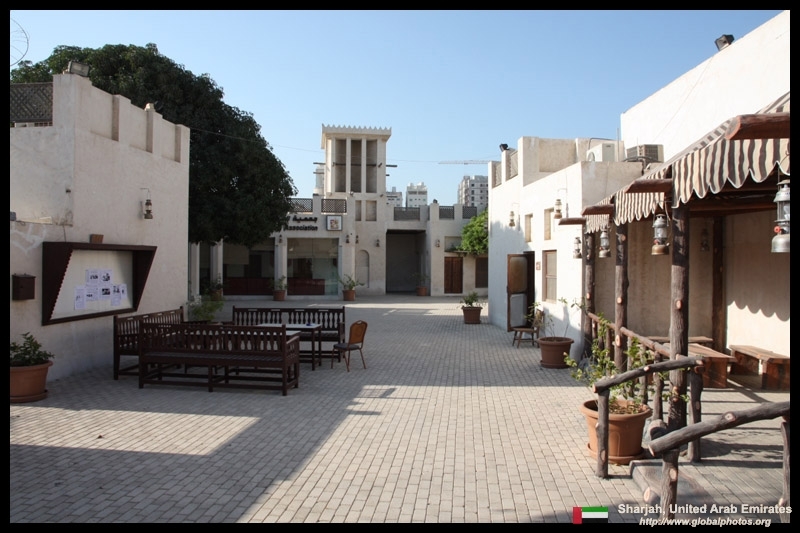 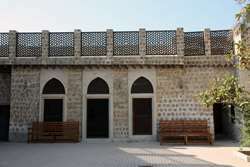 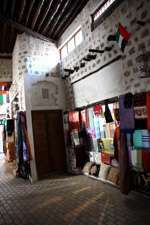 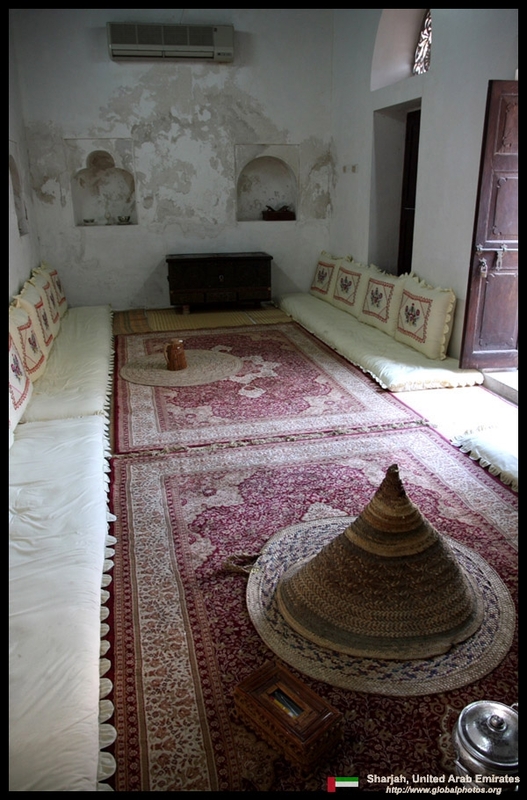 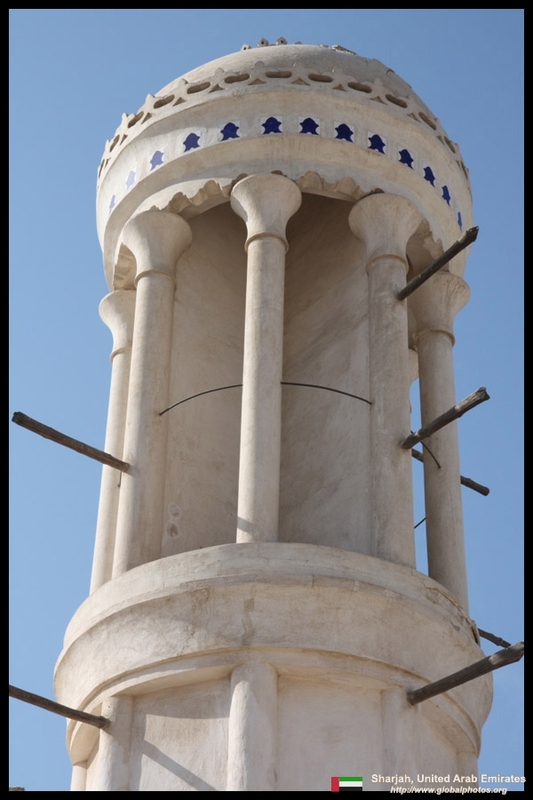 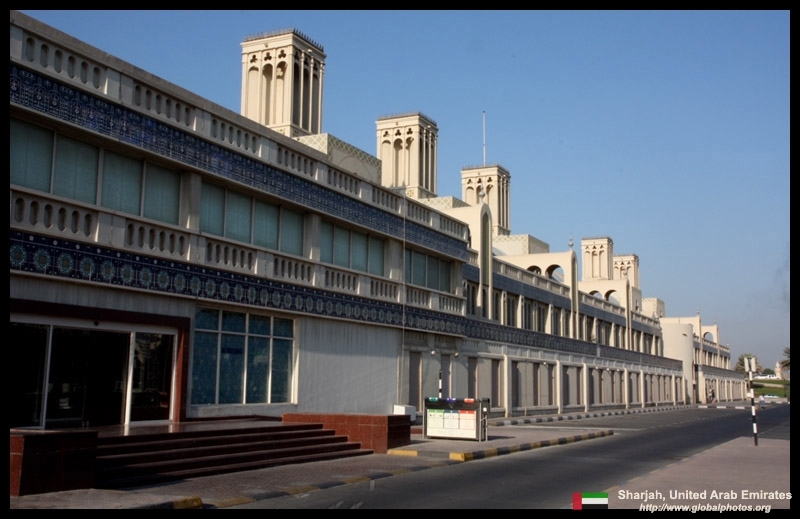 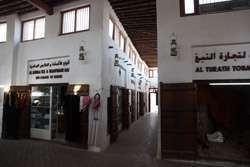 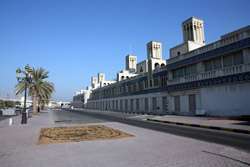 Al-Naboodah House is a traditional house showcasing life in the 19th century. 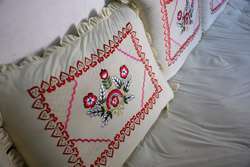 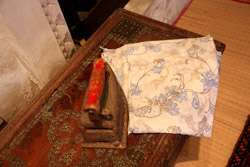 Built in 1845, the house has 16 rooms, which were occupied by a pearl merchant, his wife, and 7 children. 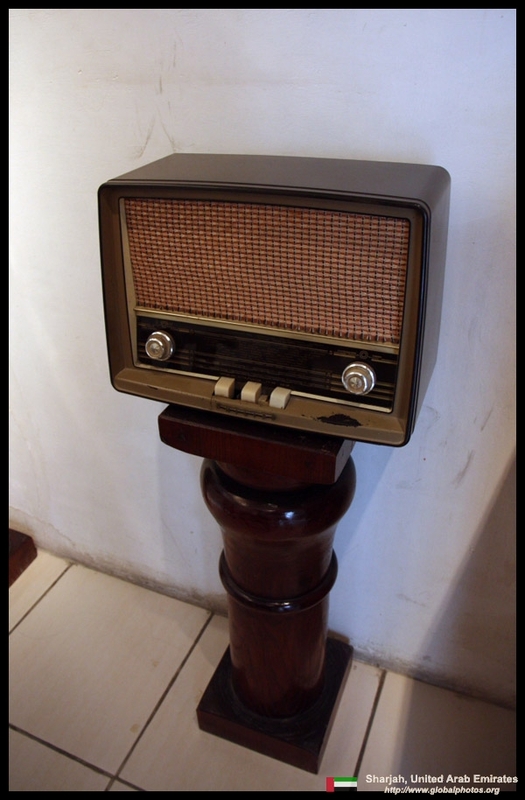 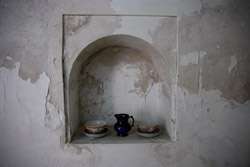 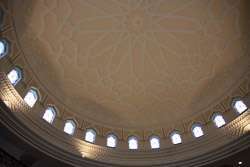 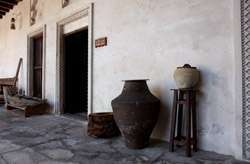 I saw a small group of tourists inside the house, but back outside, it was deserted once again. 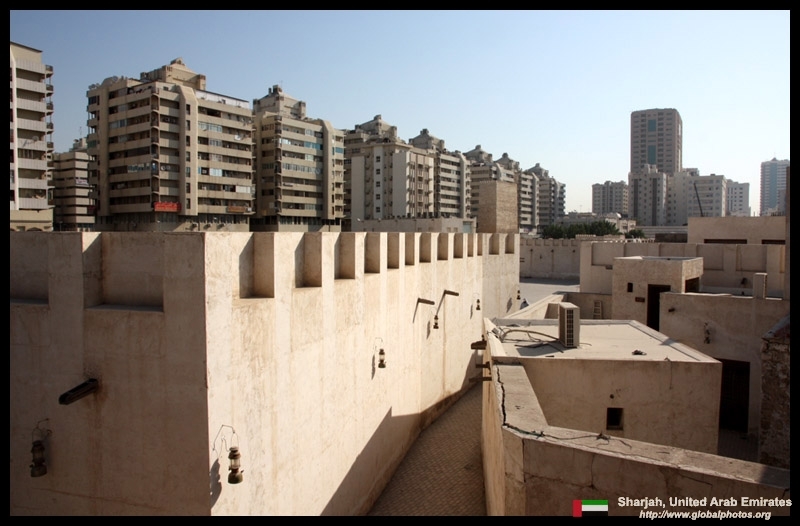 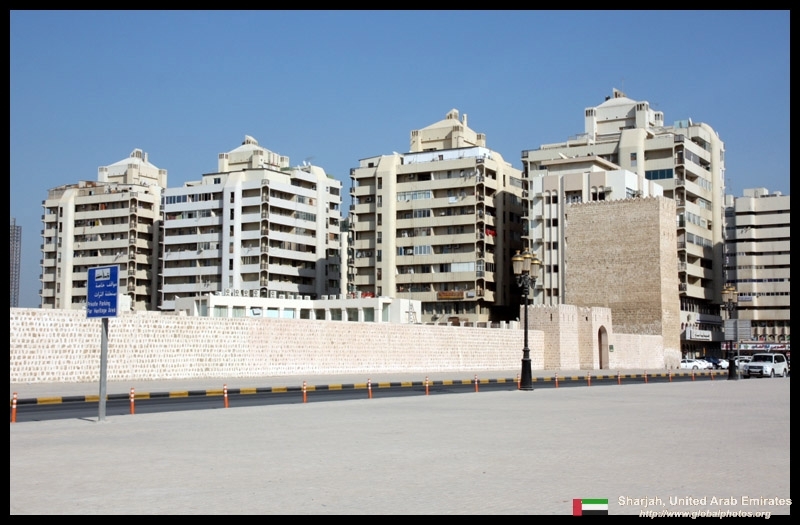 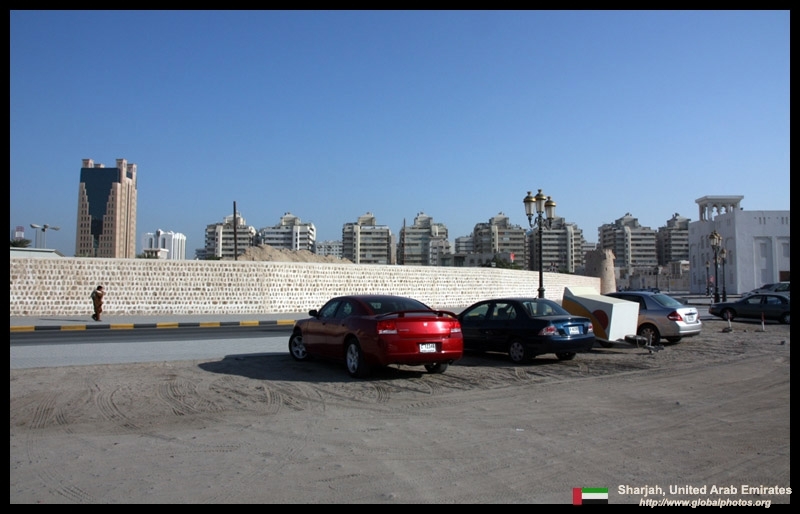 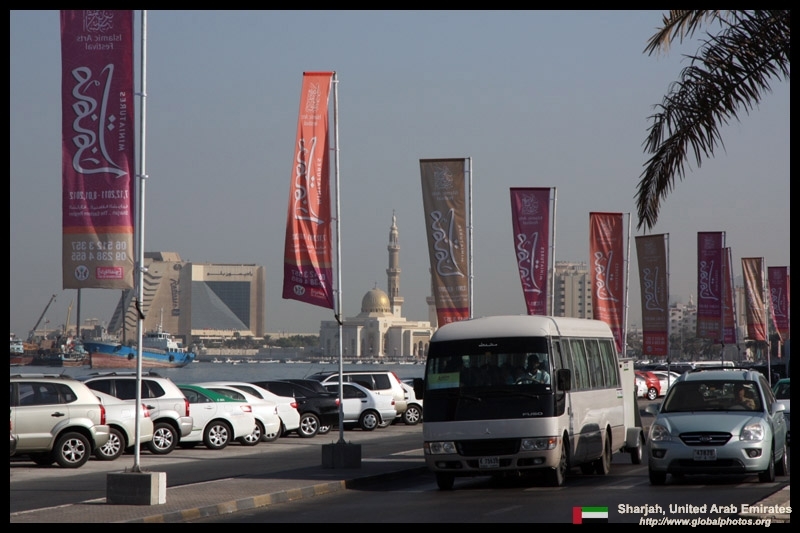 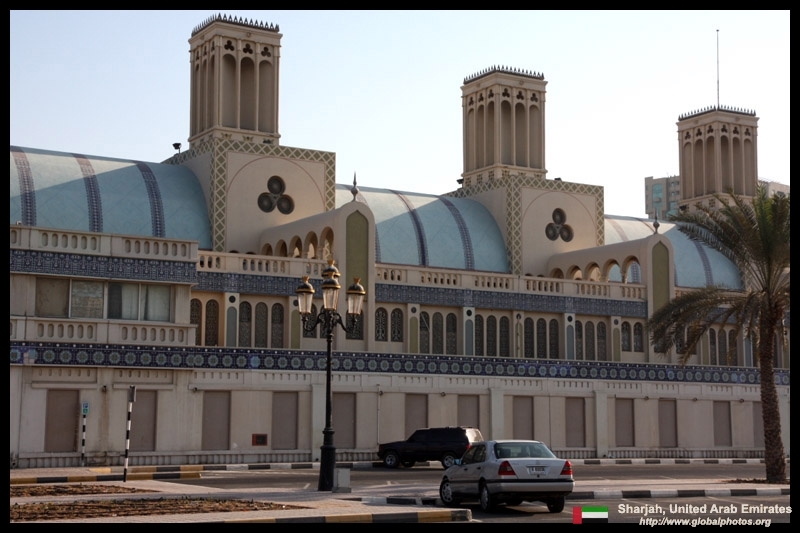 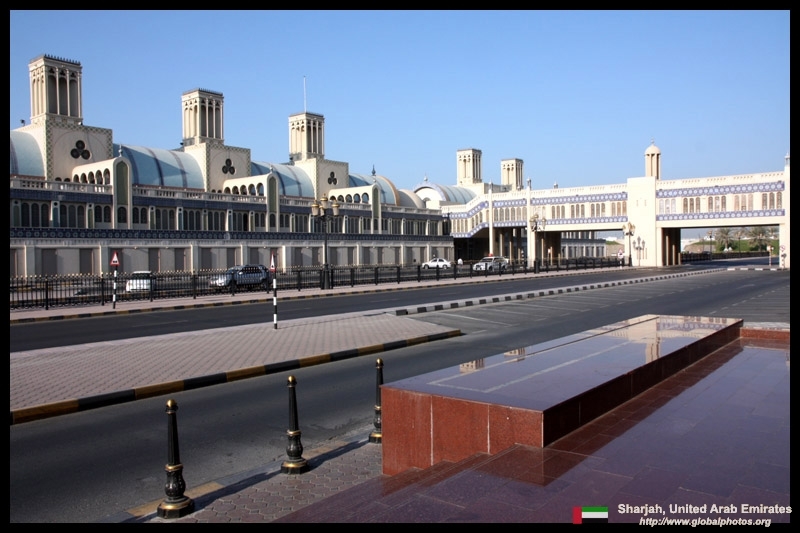 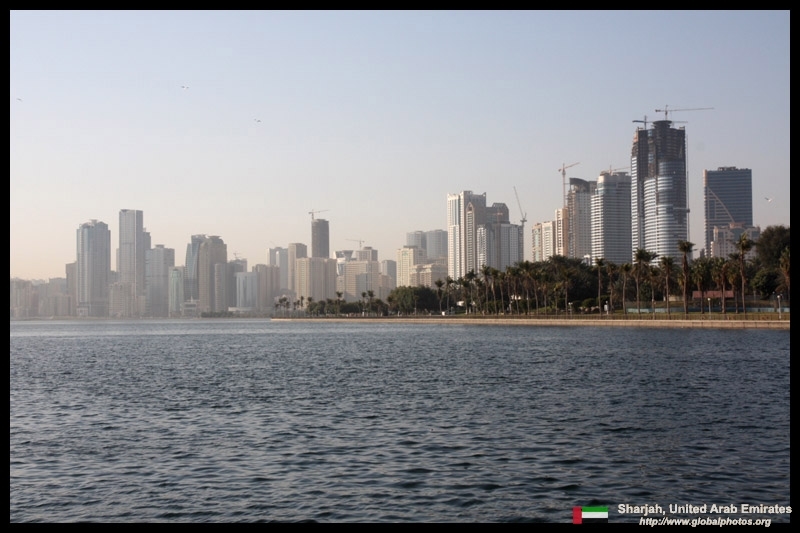 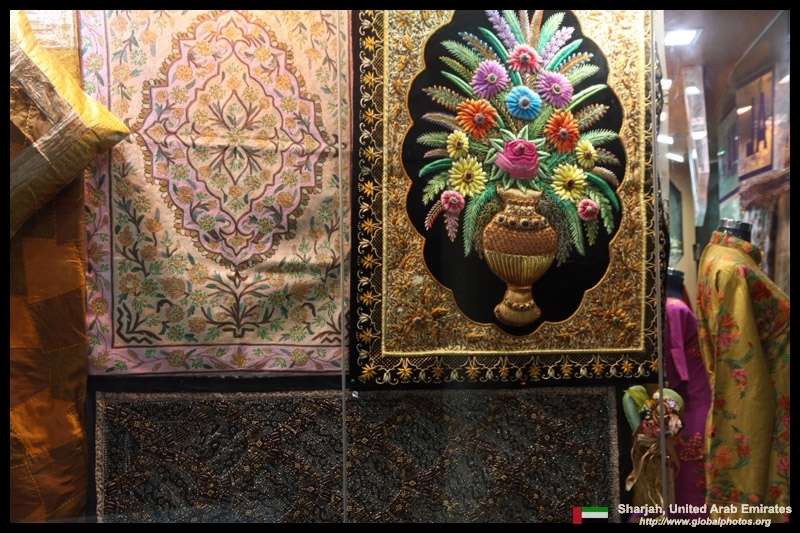 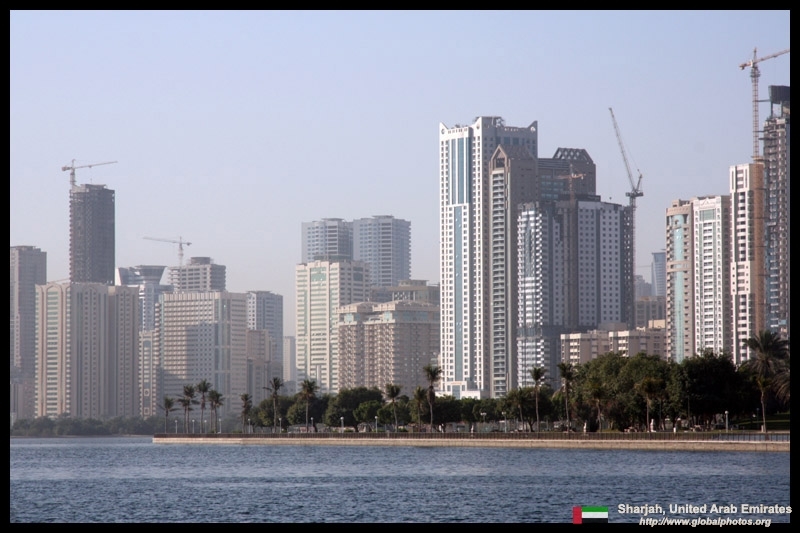 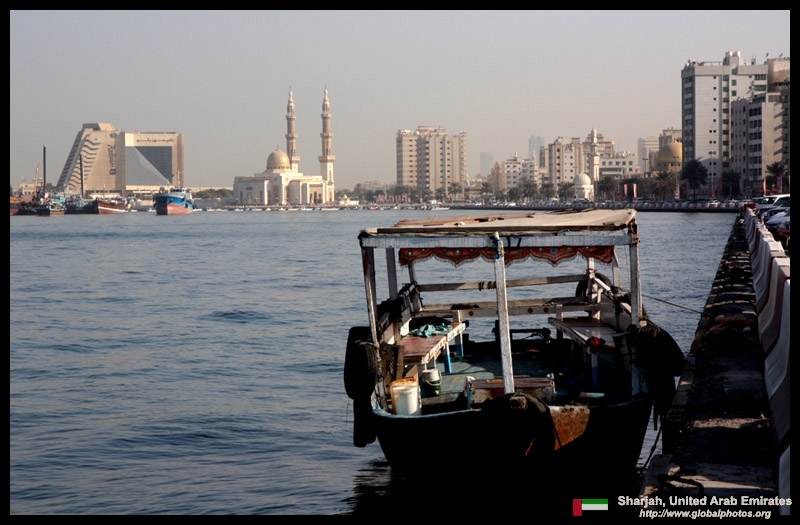 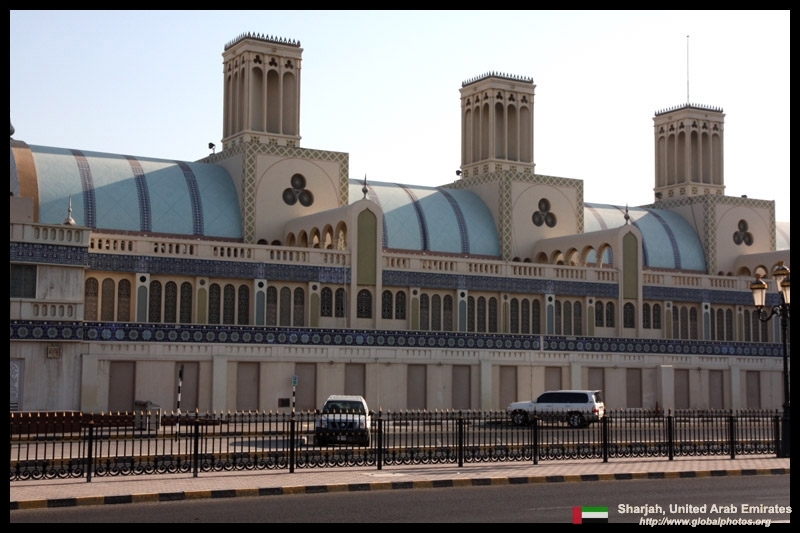 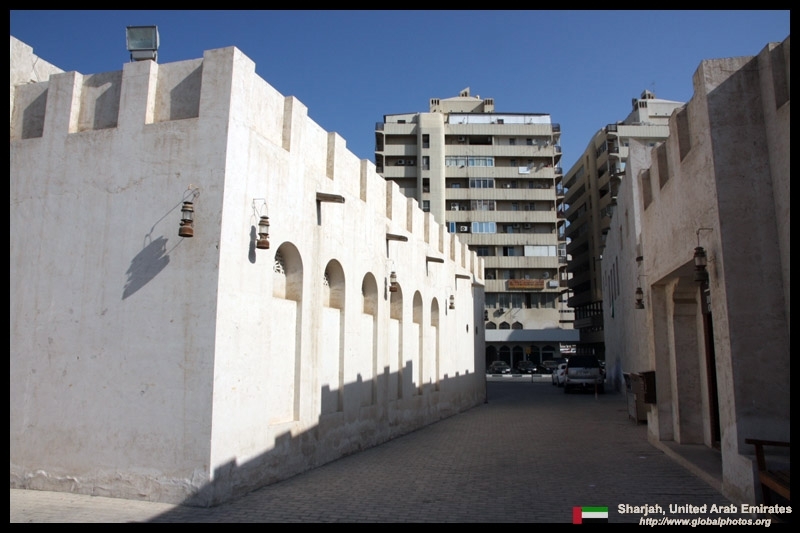 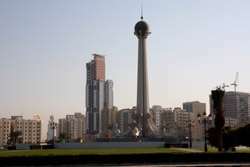 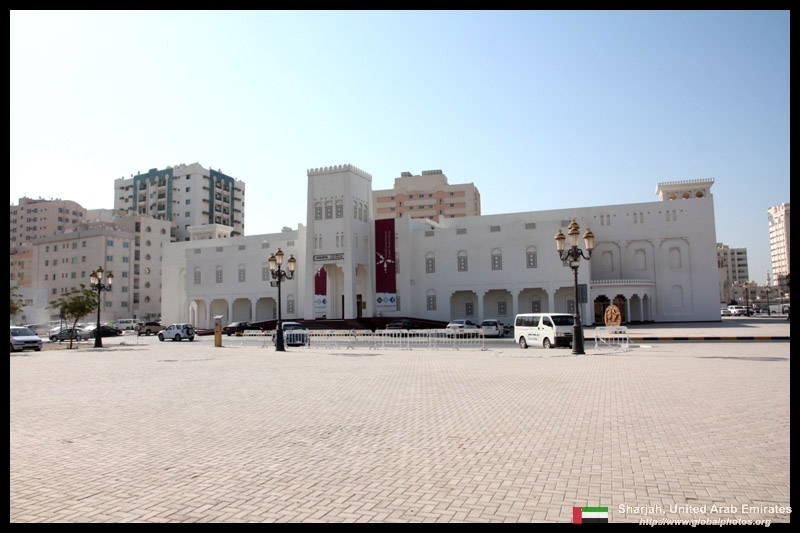 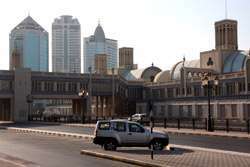 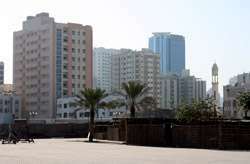 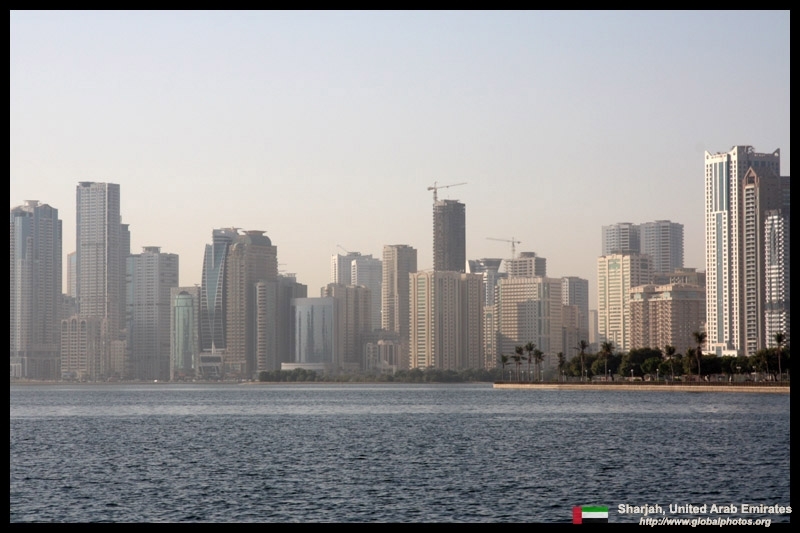 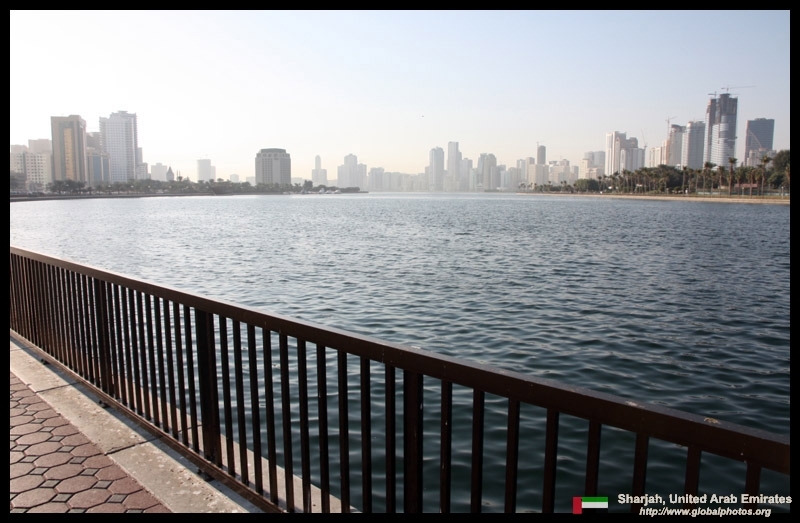 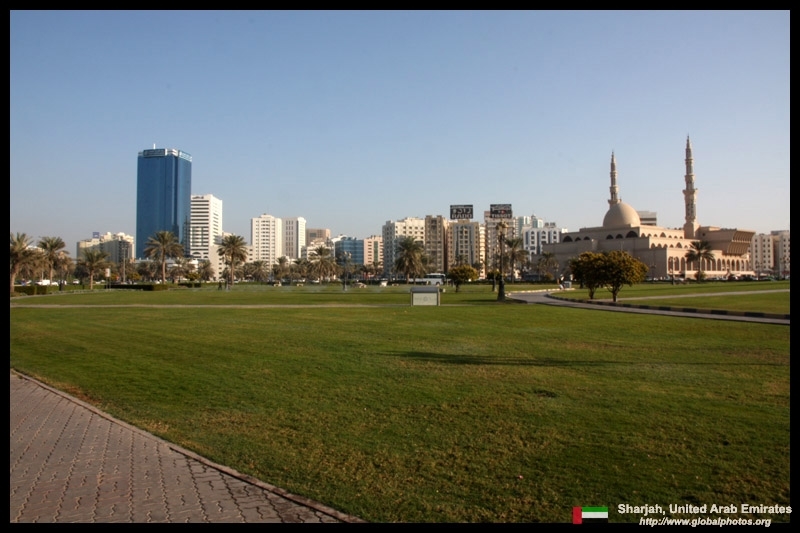 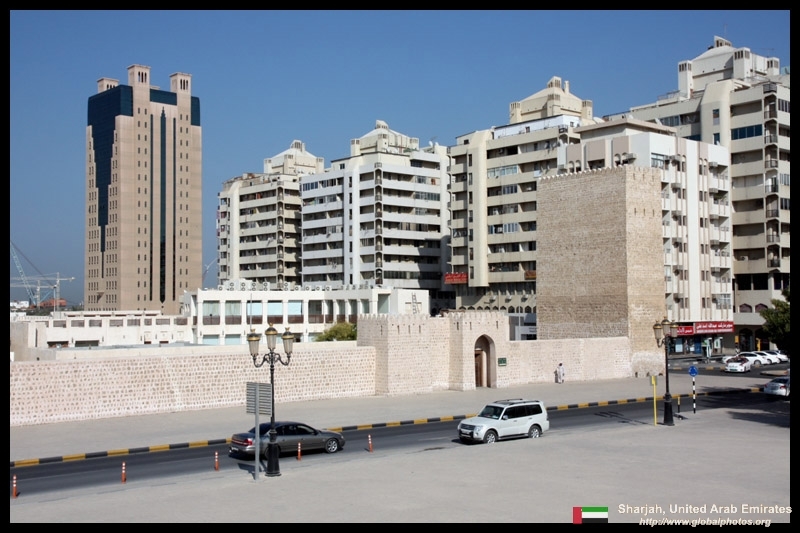 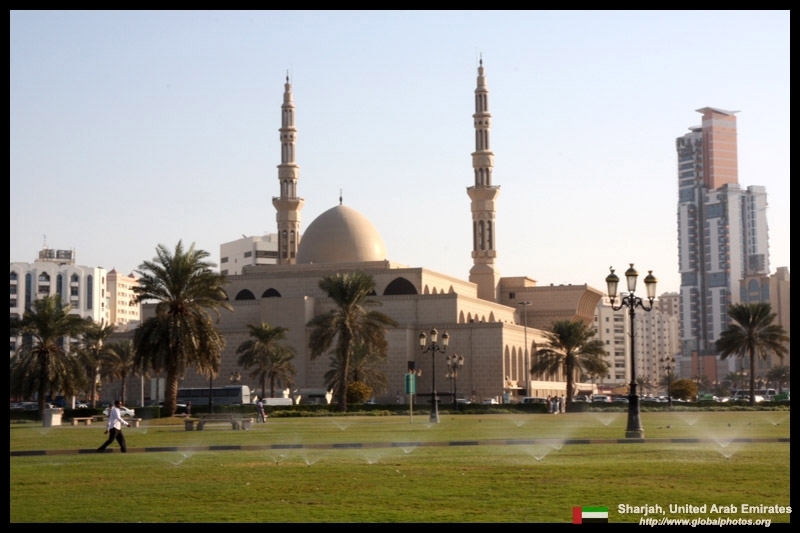 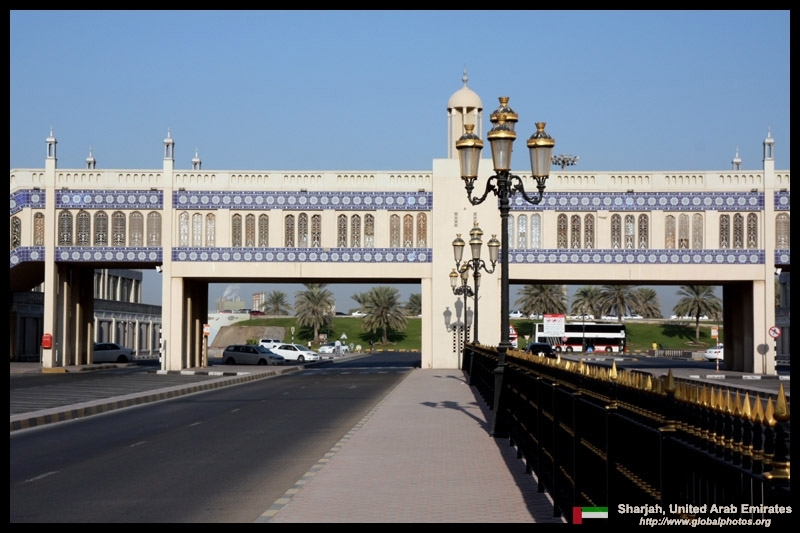 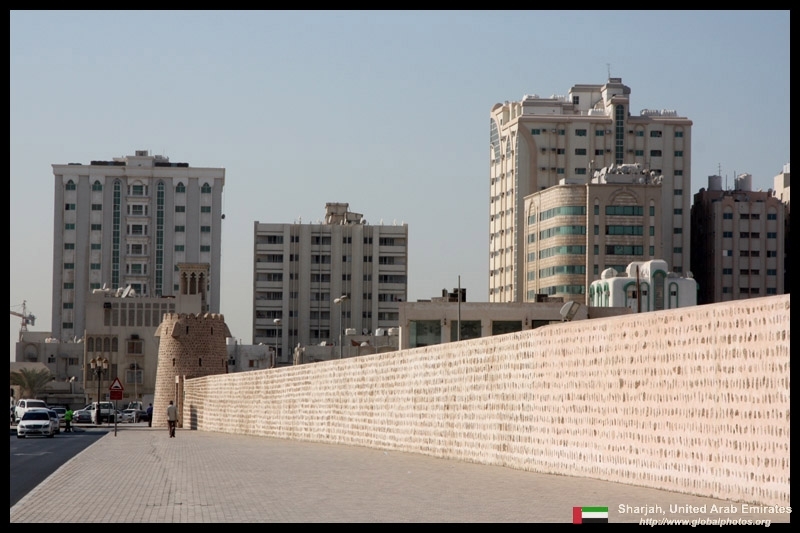 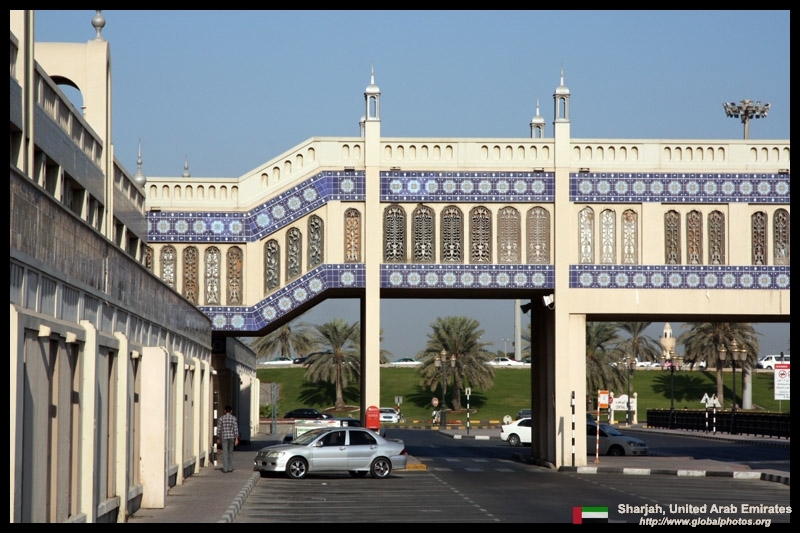 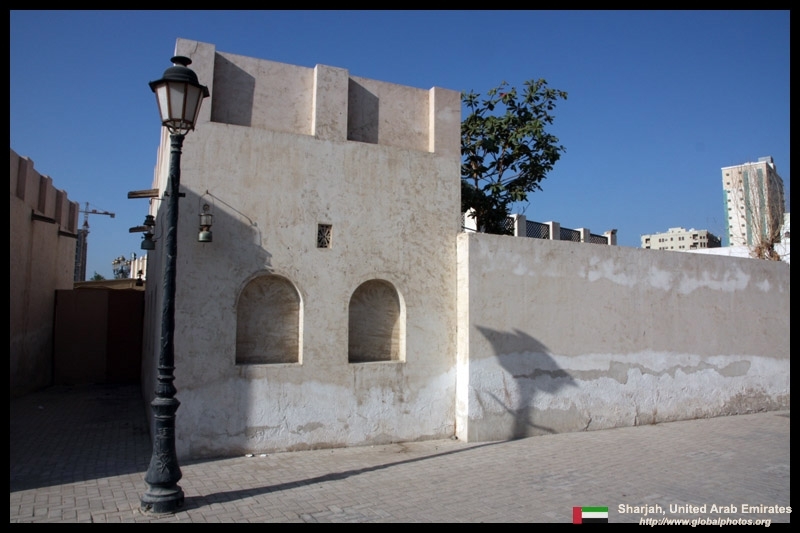 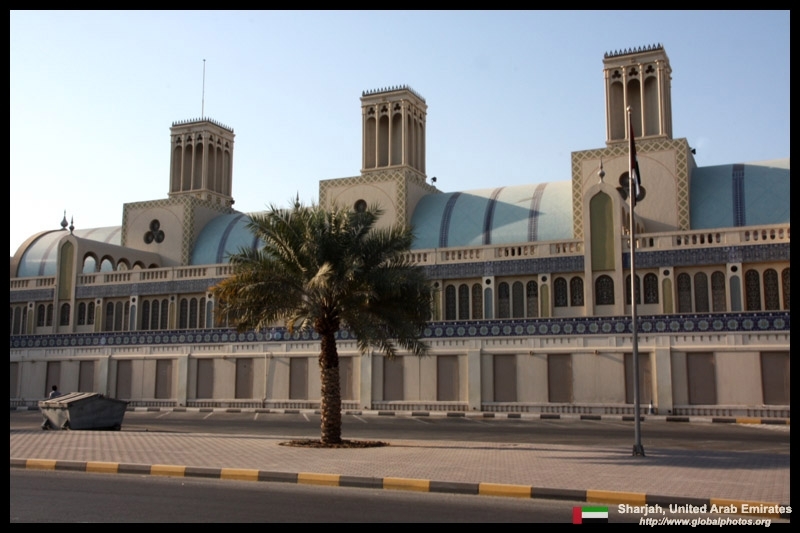 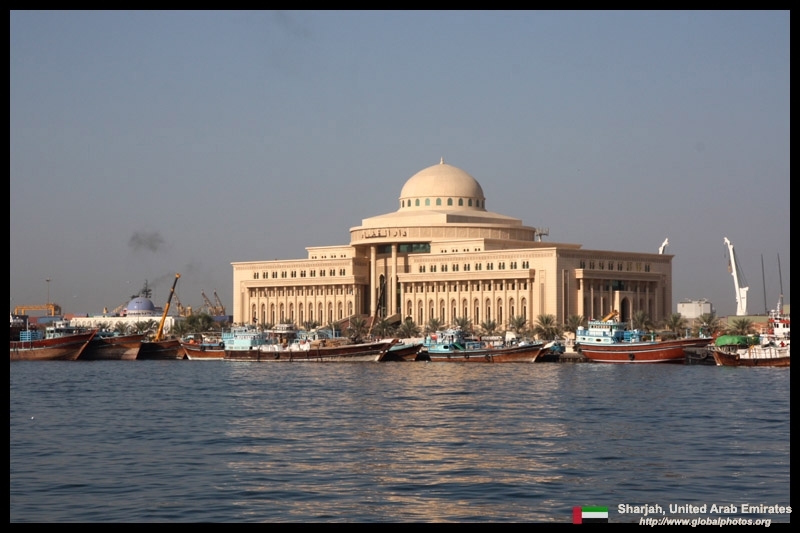 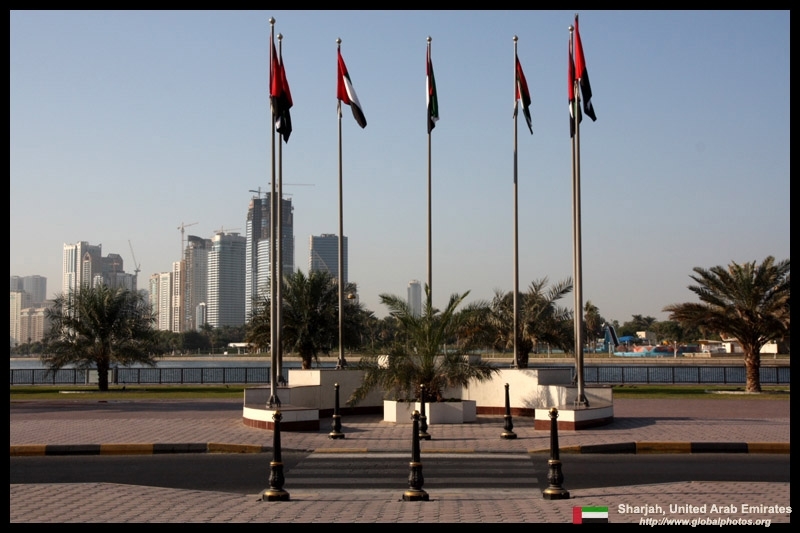 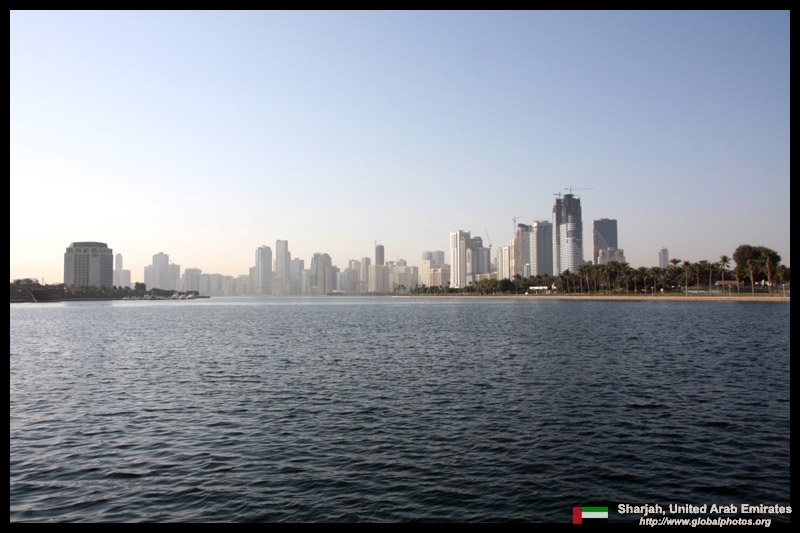 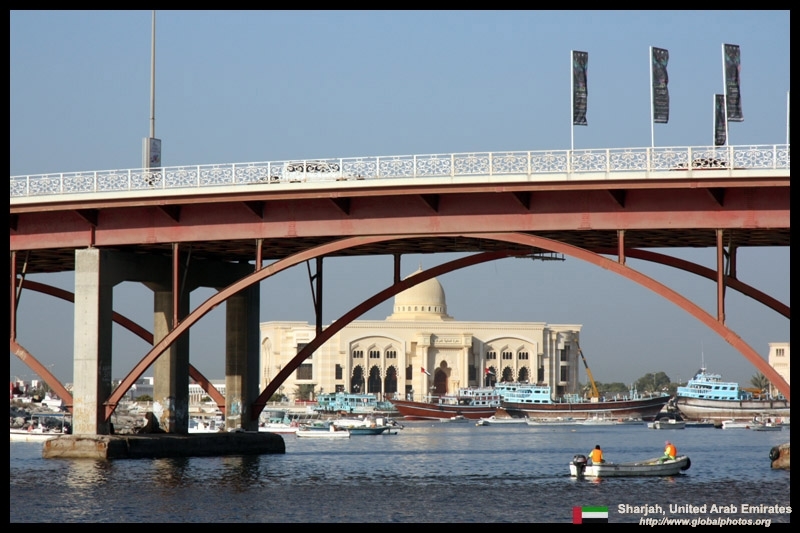 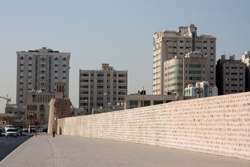 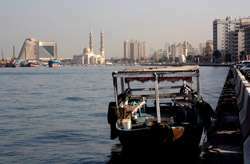 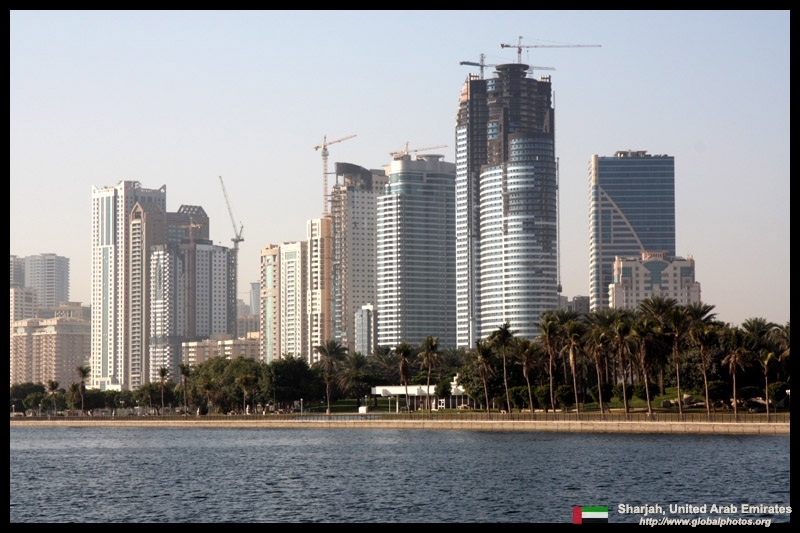 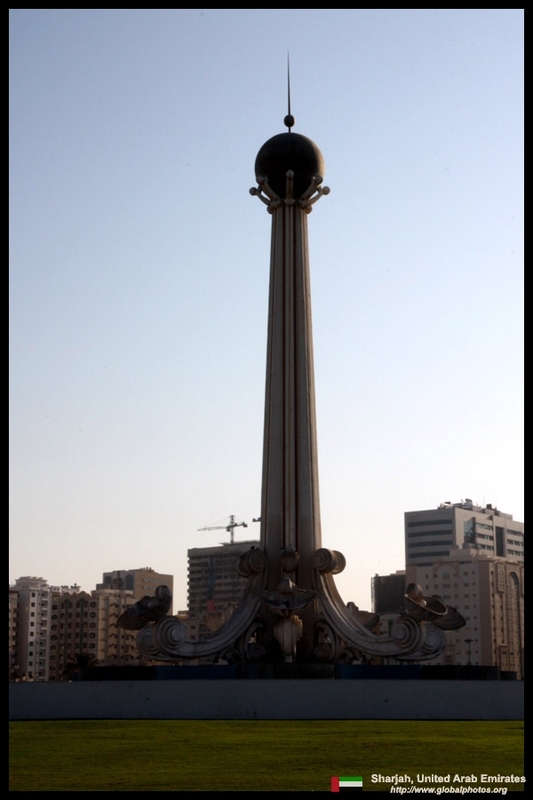 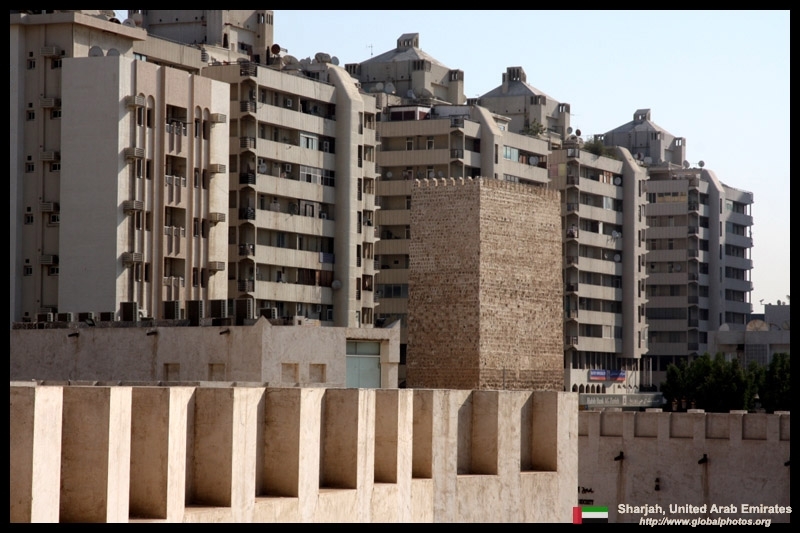 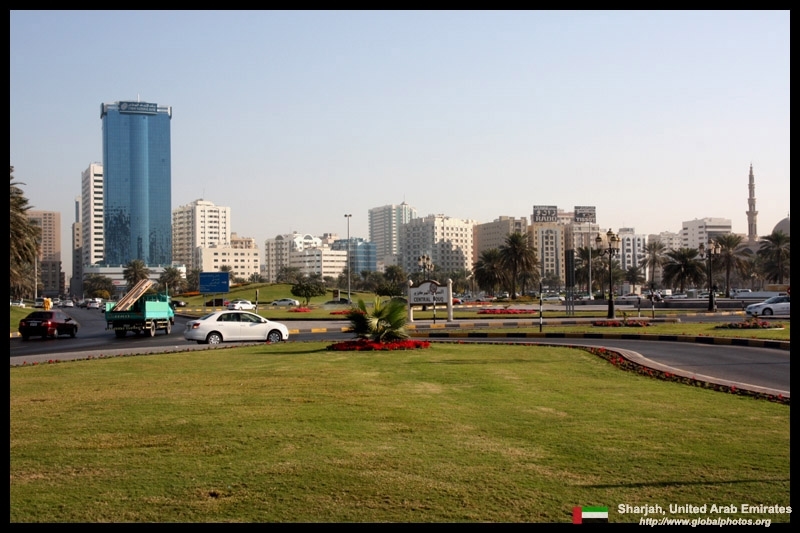 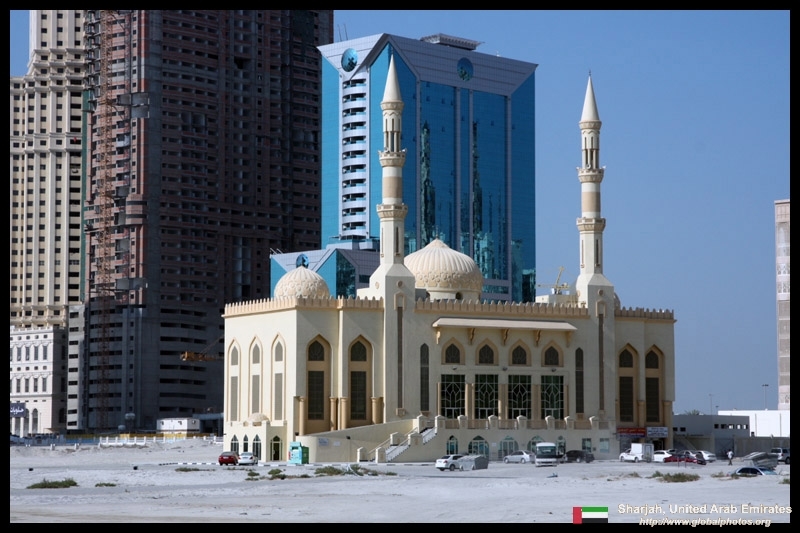 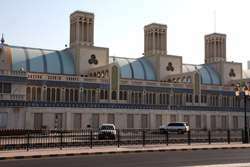 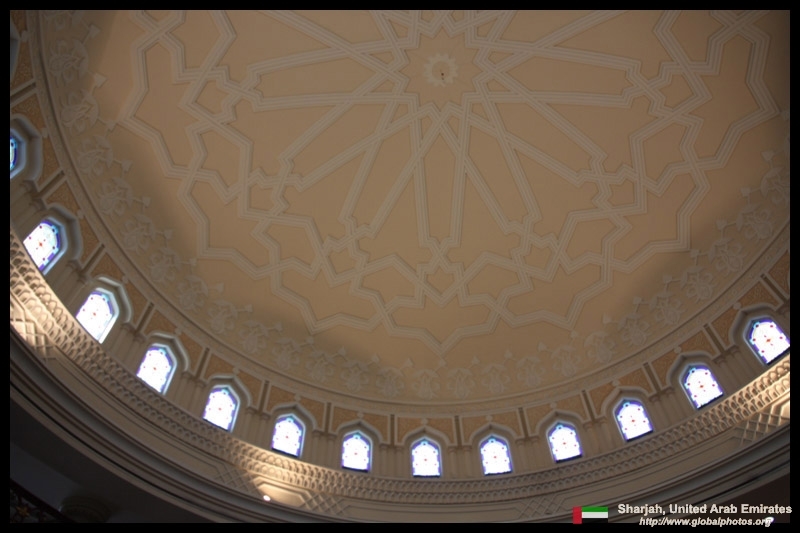 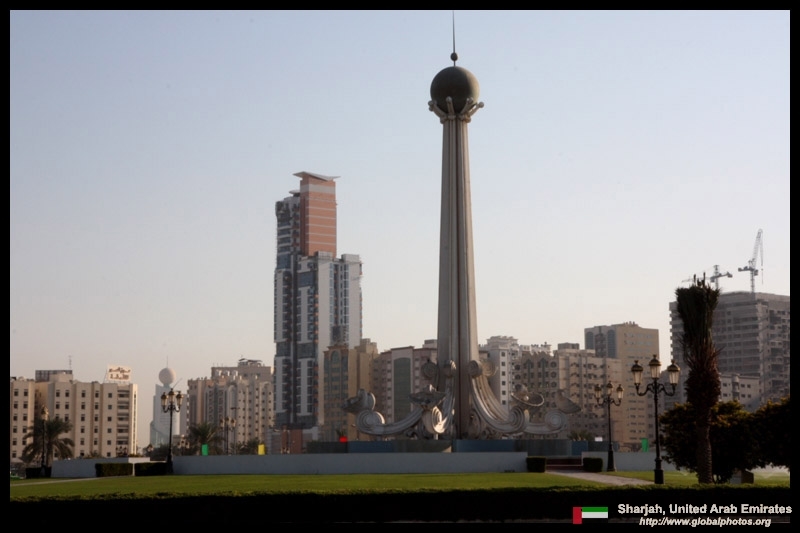 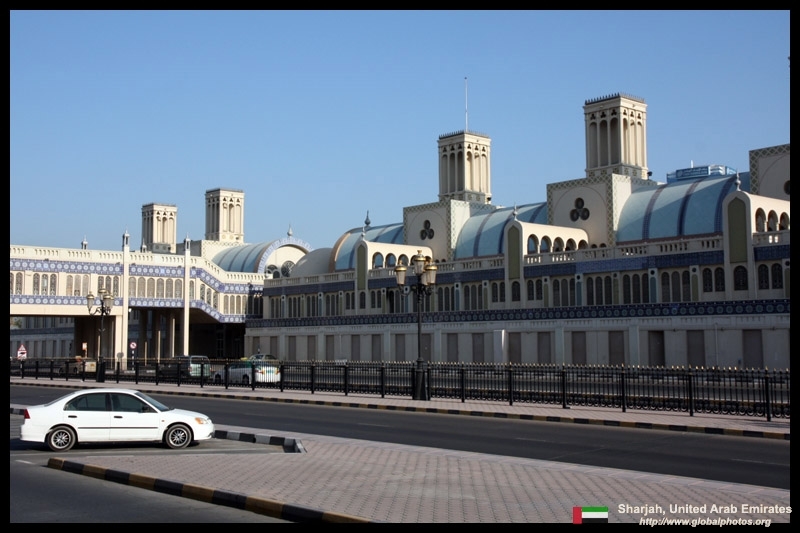 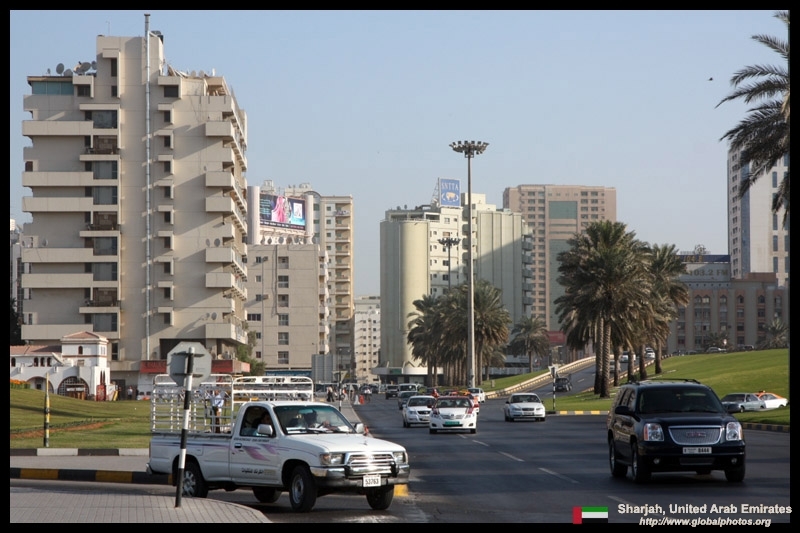 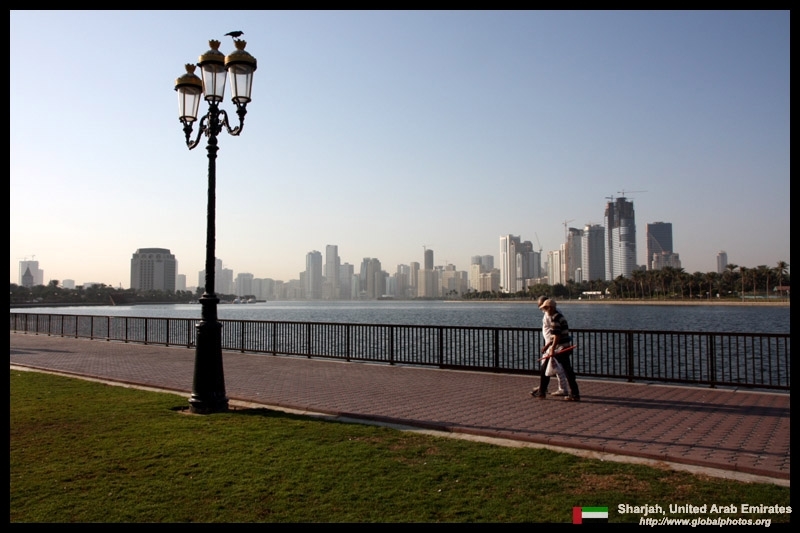 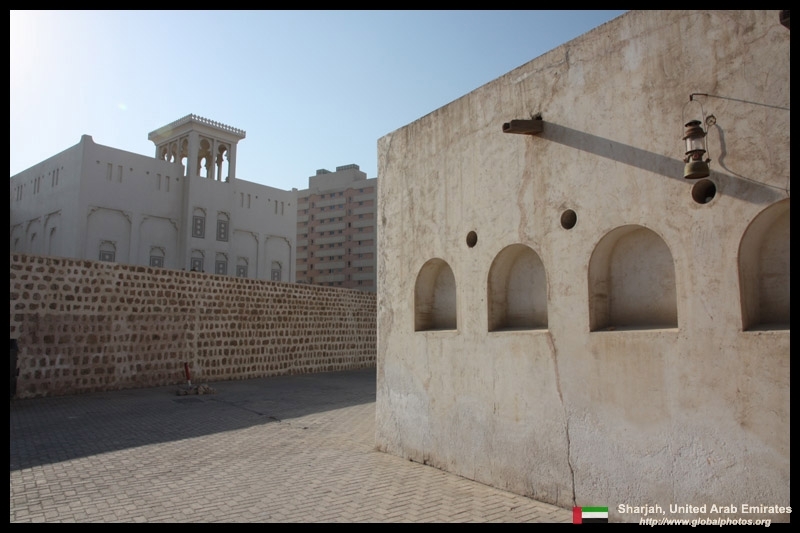 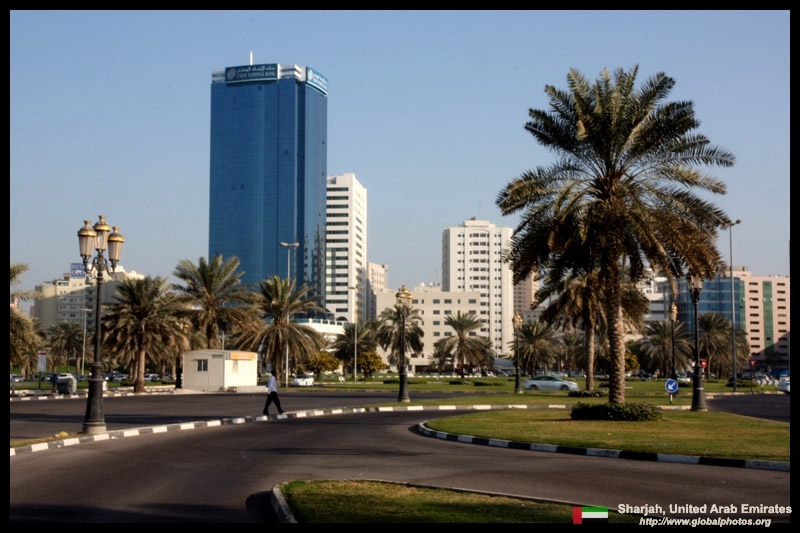 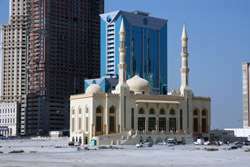 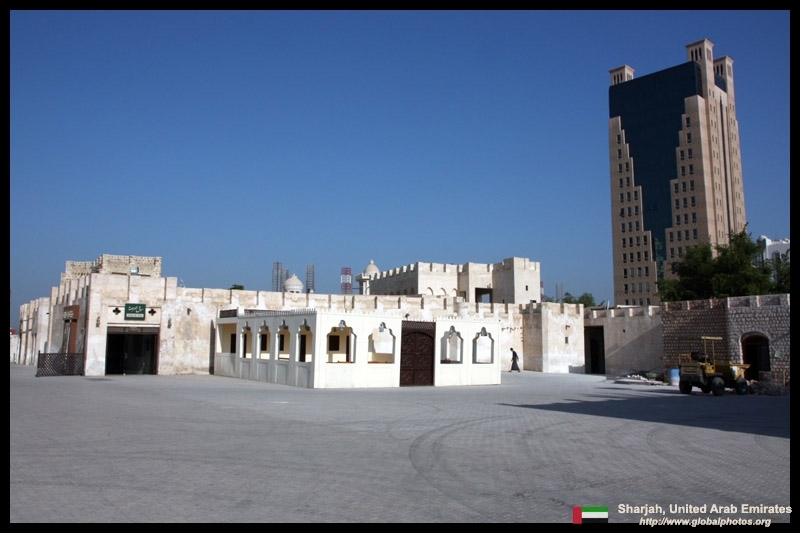 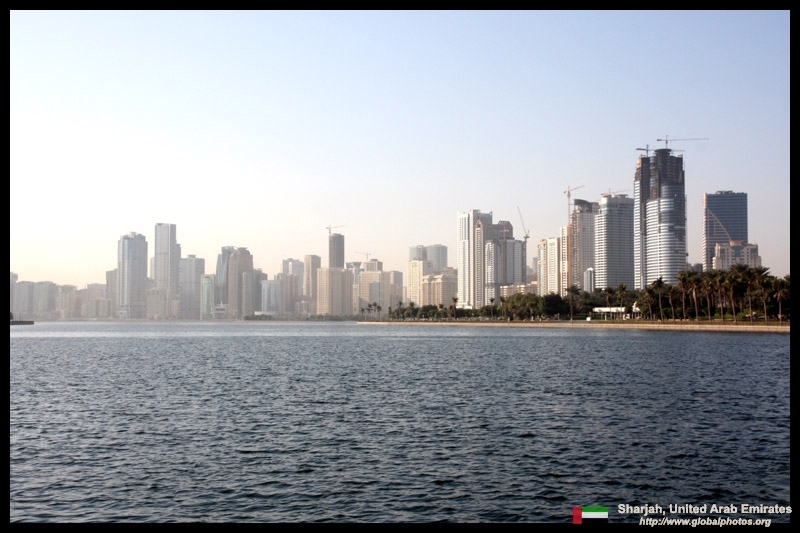 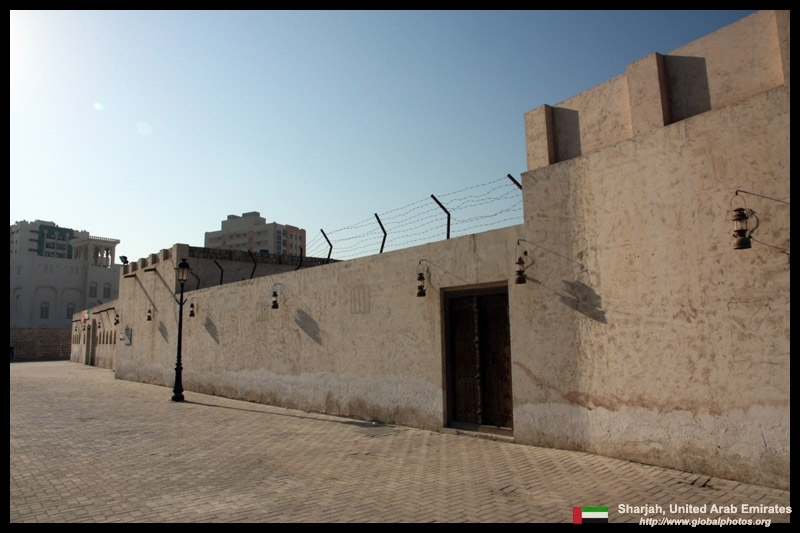 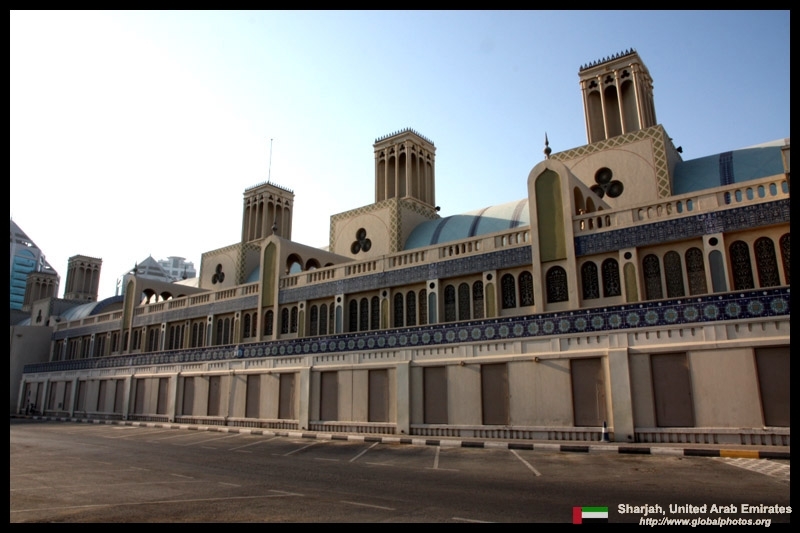 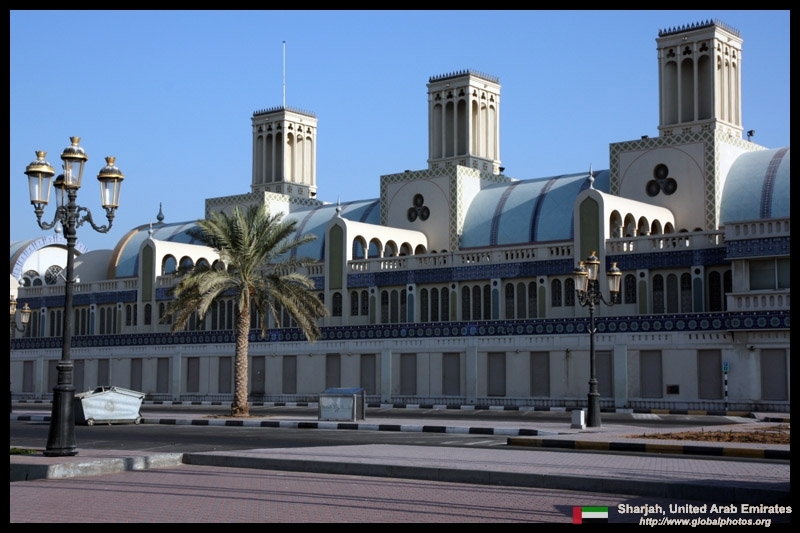 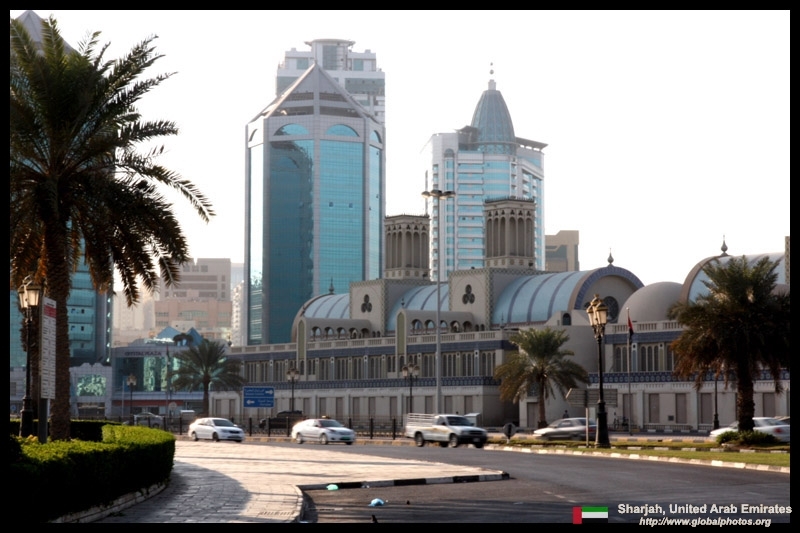 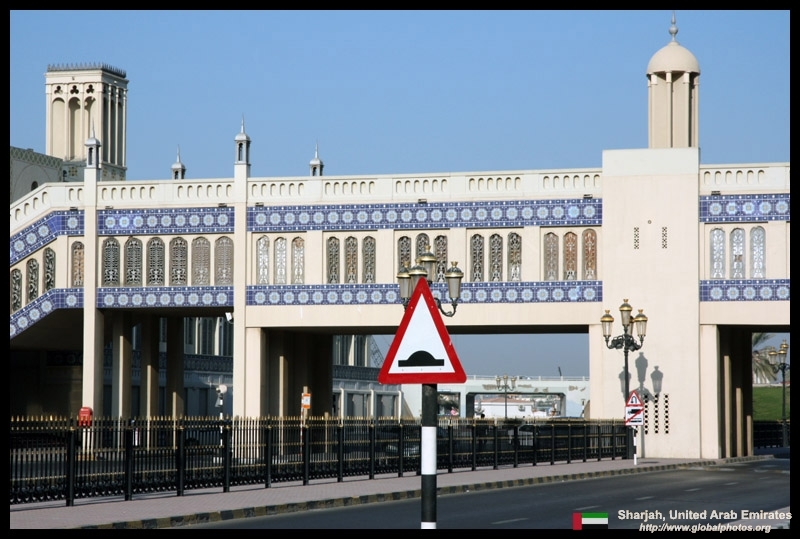 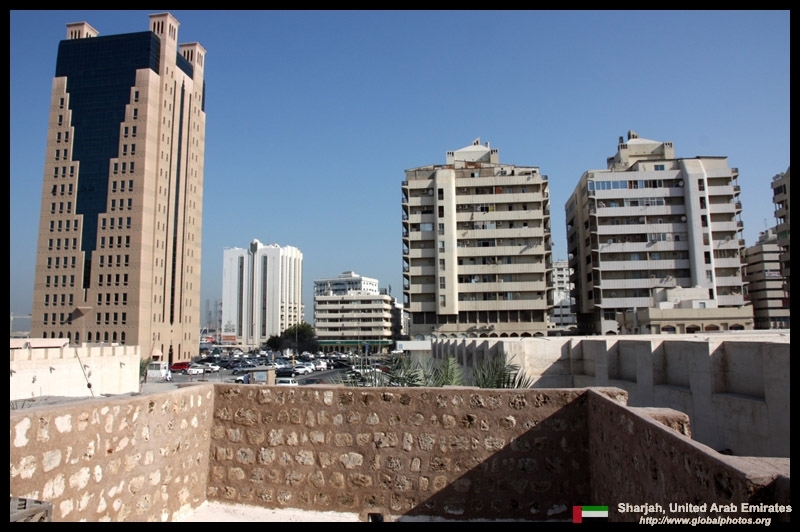 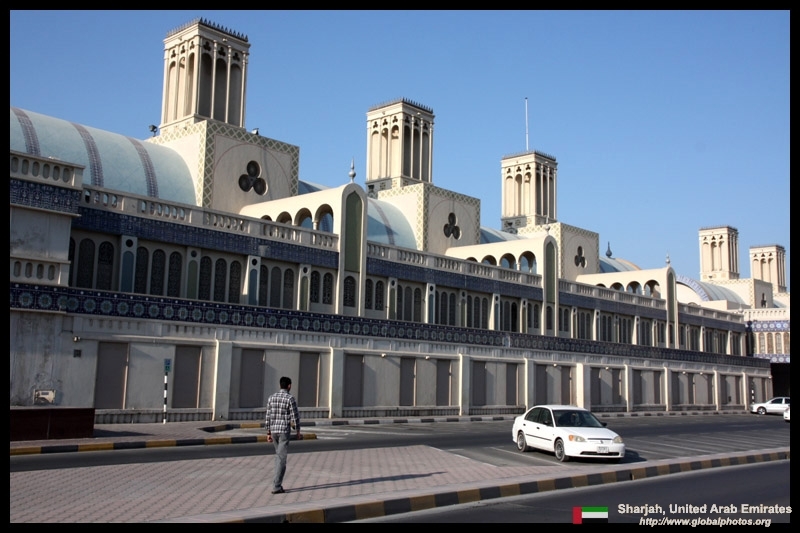 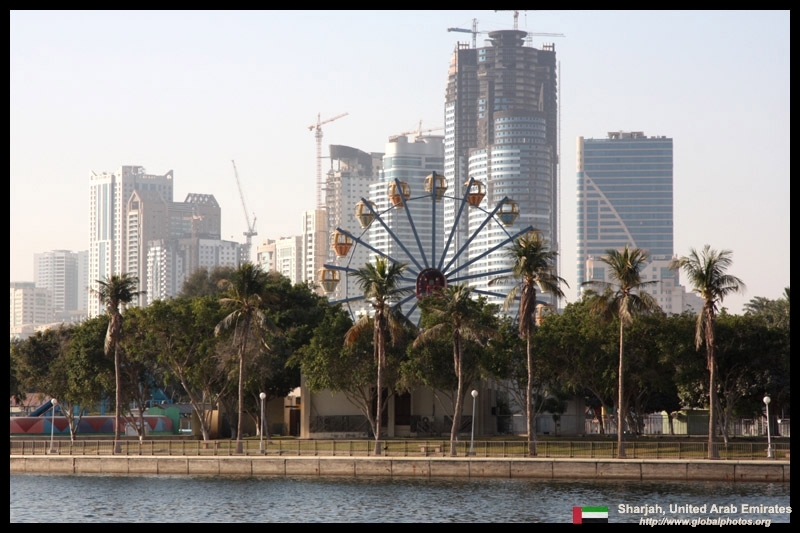 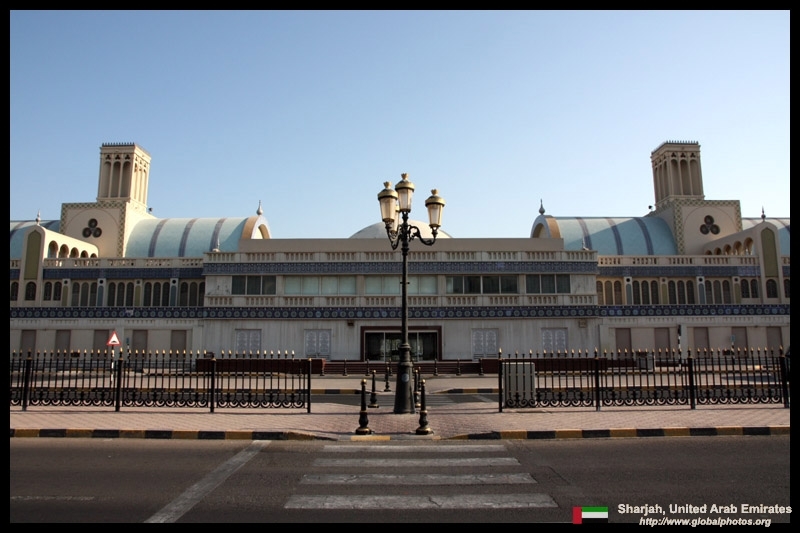 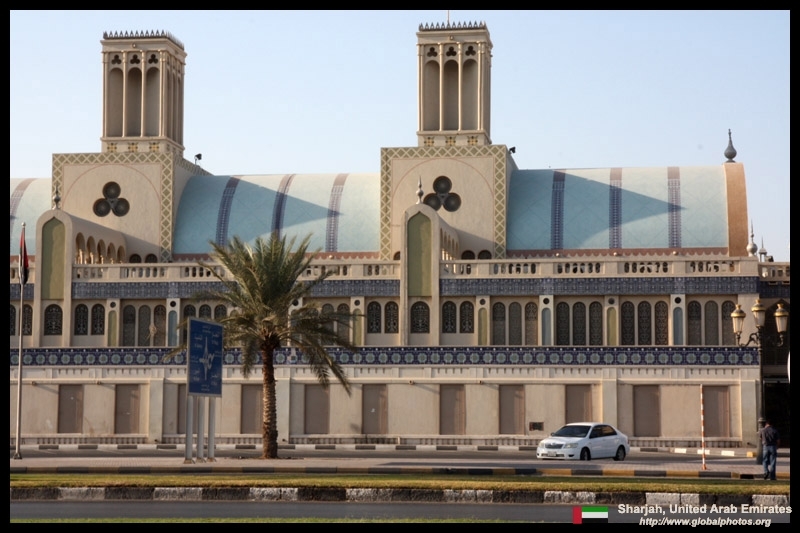 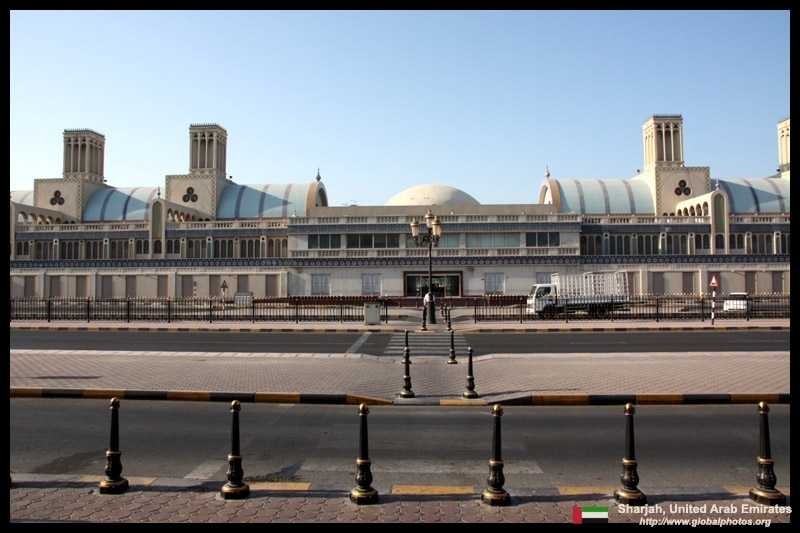 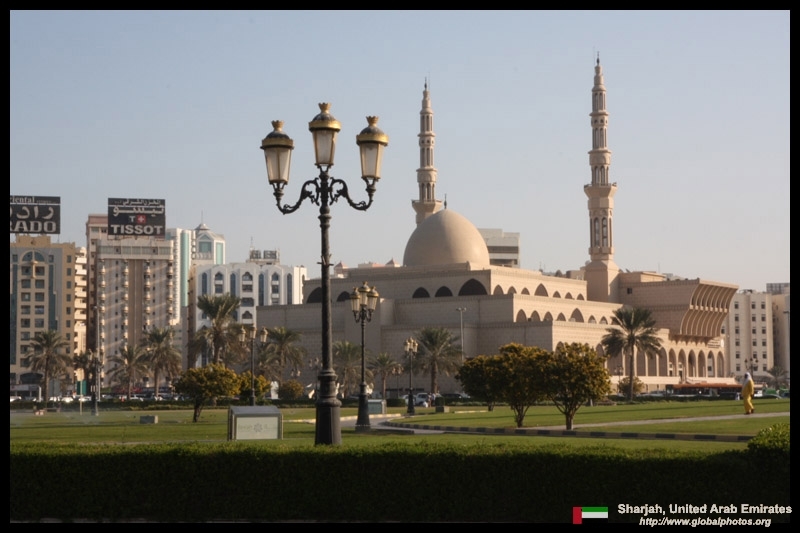 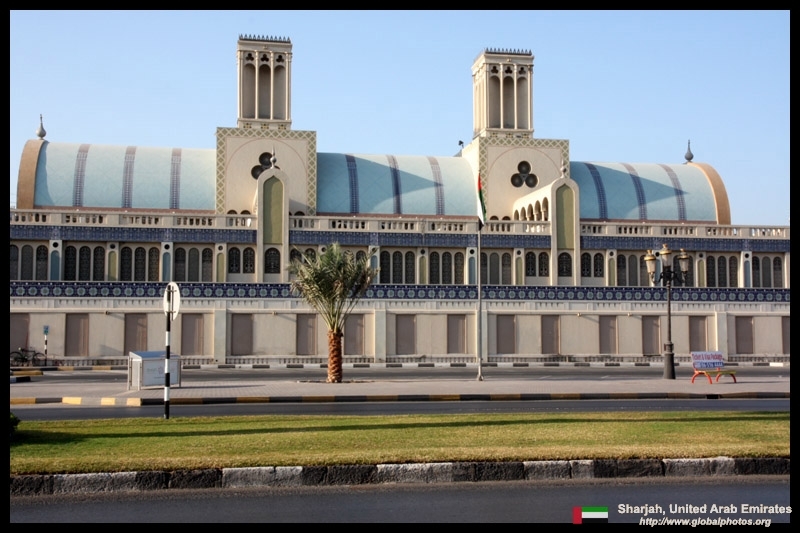 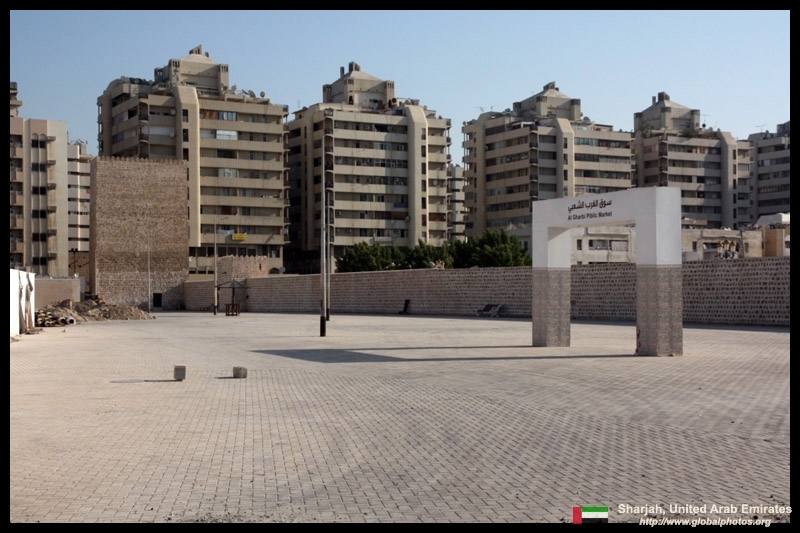 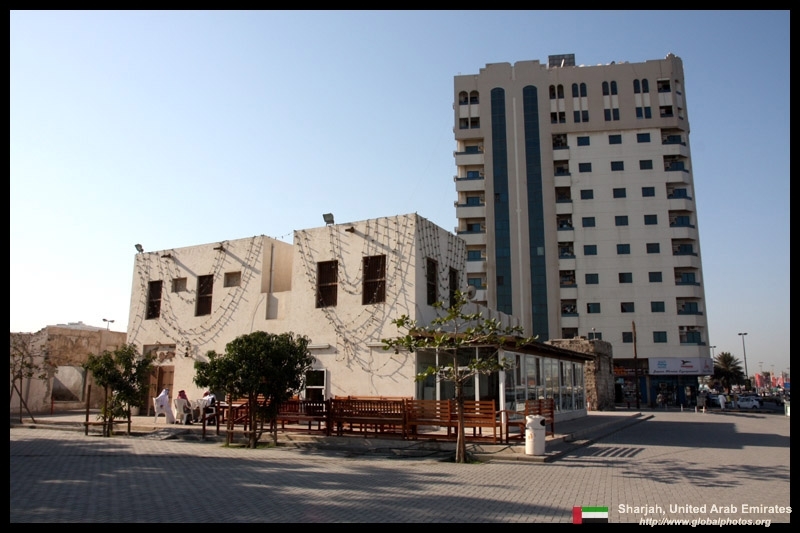 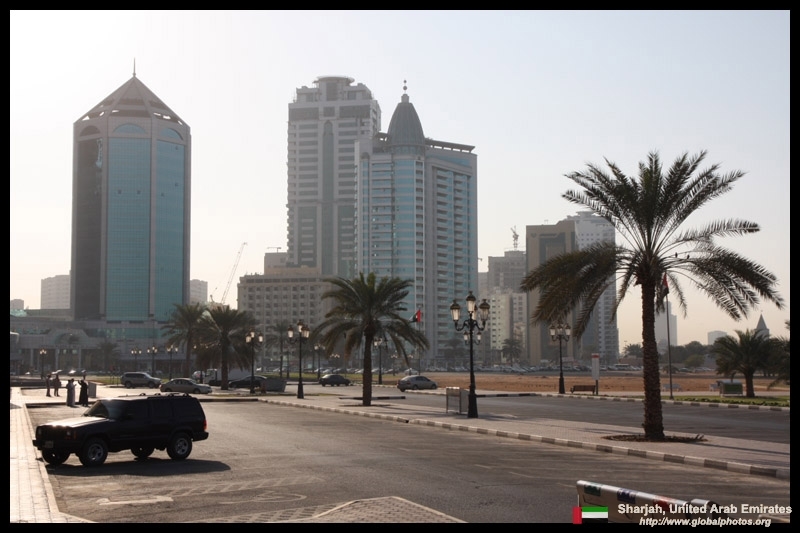 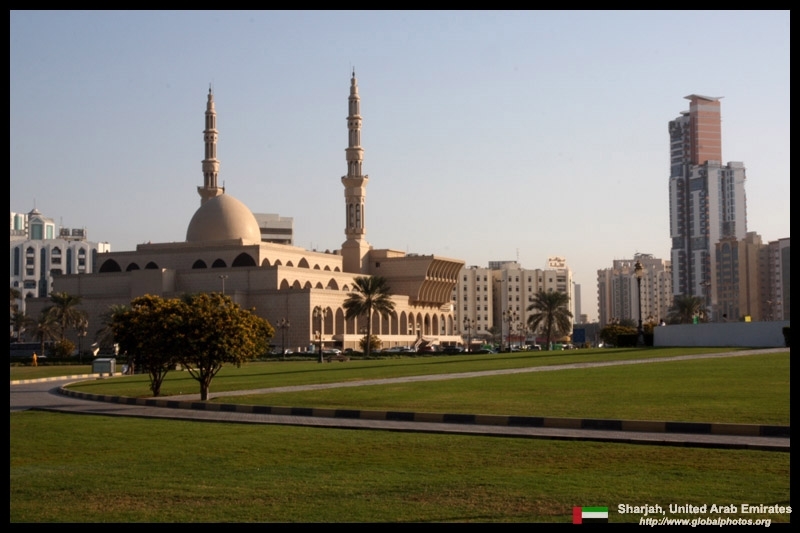 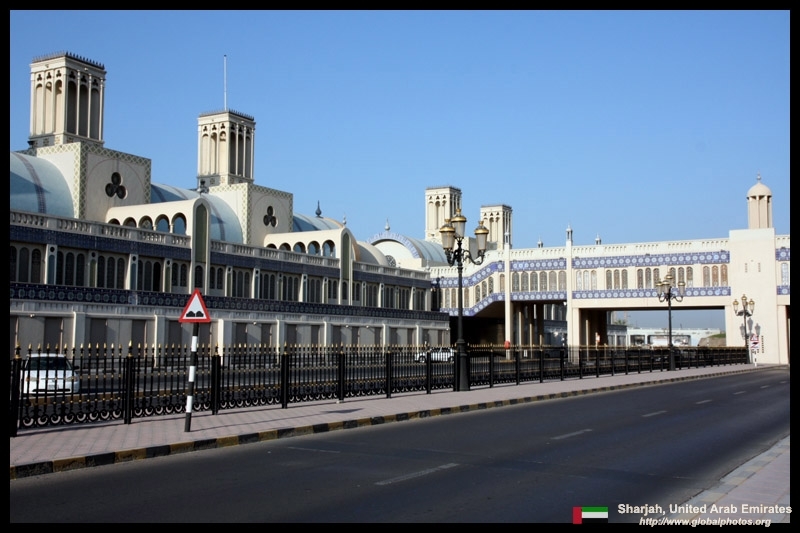 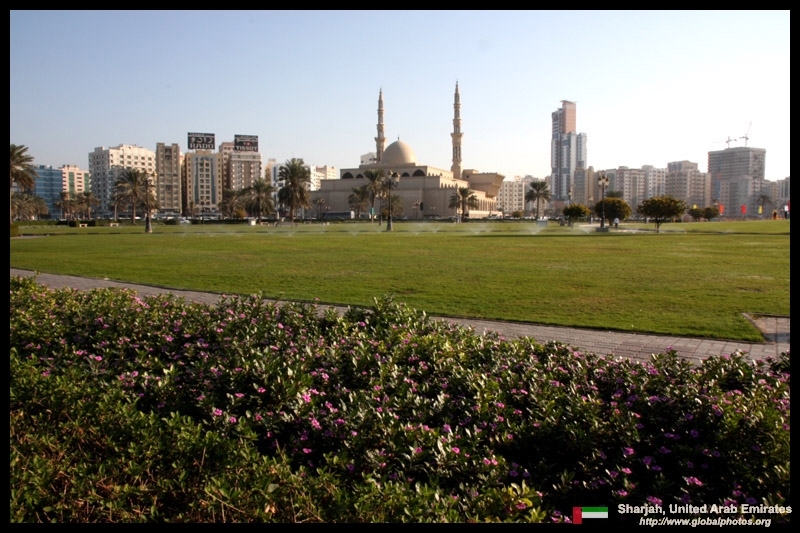 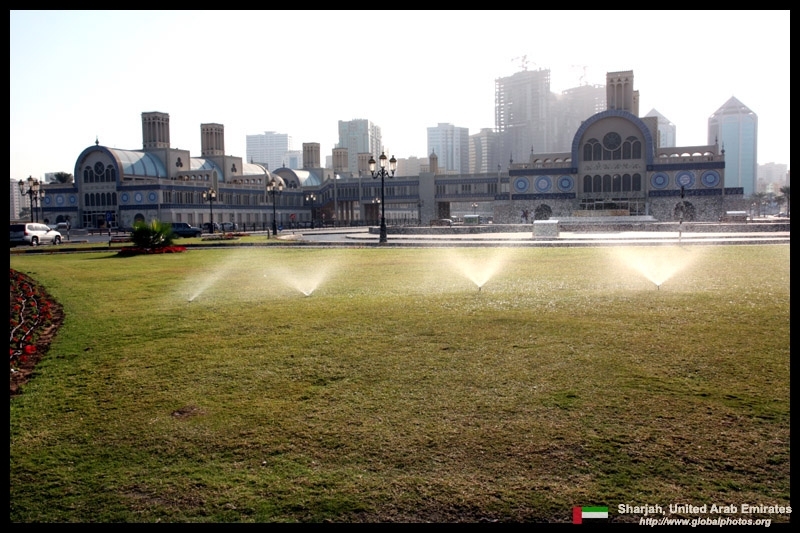 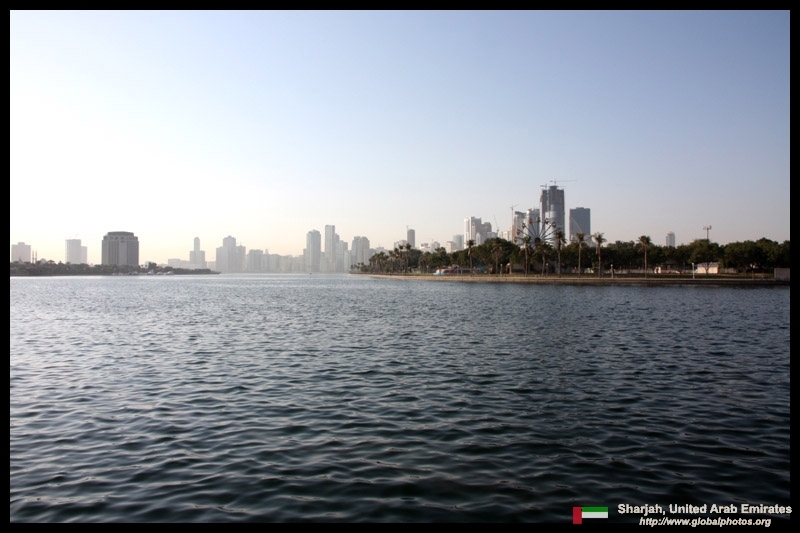 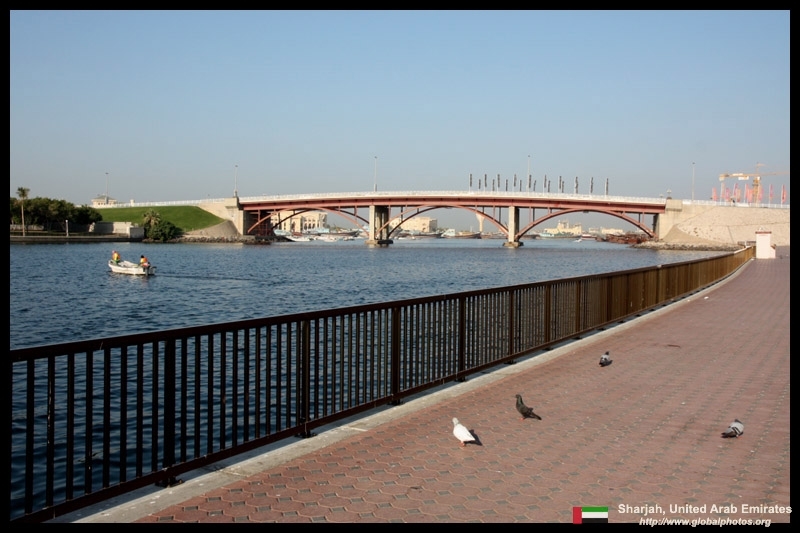 The guidebooks had a lot of hype about Sharjah, but where are all the tourists? 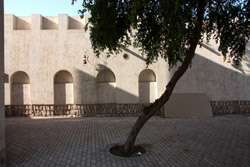 This building just outside the city wall doesn't seem to be a tourist destination at all, but I snuck in without anyone working there caring much. 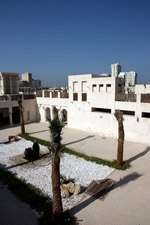 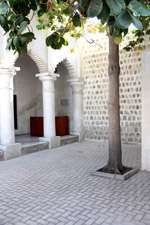 The courtyard was nicely-decorated and there was access to the roof to photograph the surroundings. Back on the double-decker bus, I finished my tour with time to spare. 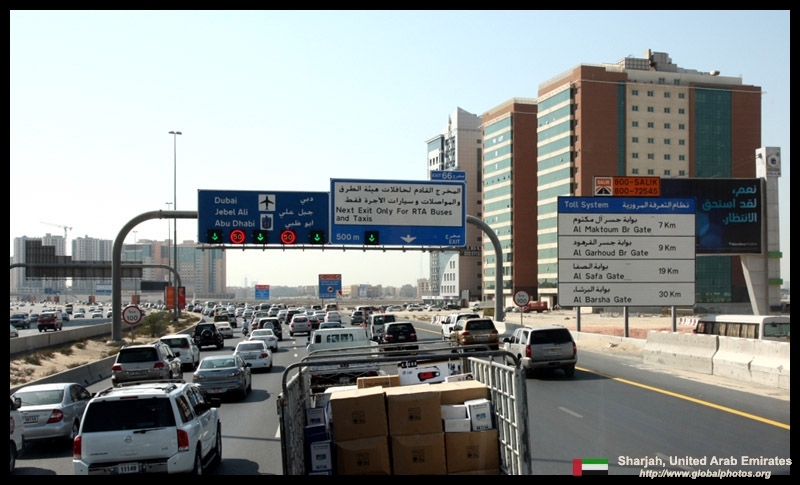 But traffic got in the way during the departure from Dubai. Some guidebooks described scary encounters with traffic, citing hours for the normally short journey.